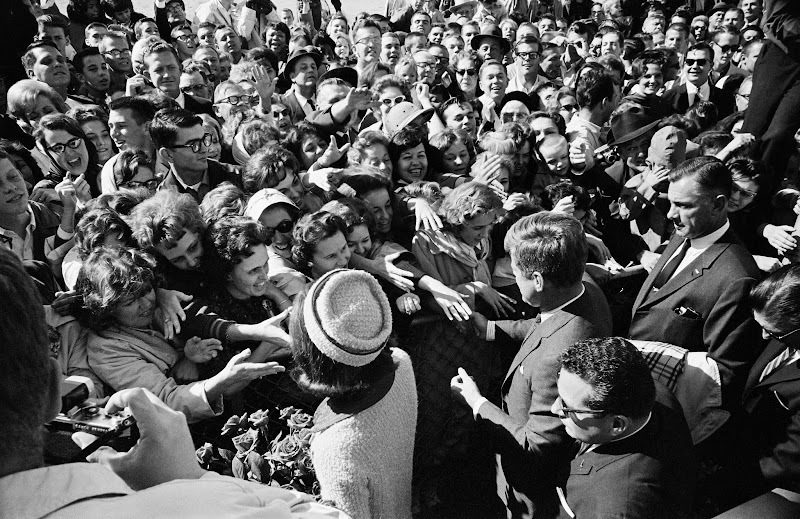 Thanks for visiting my Kennedy photo gallery. 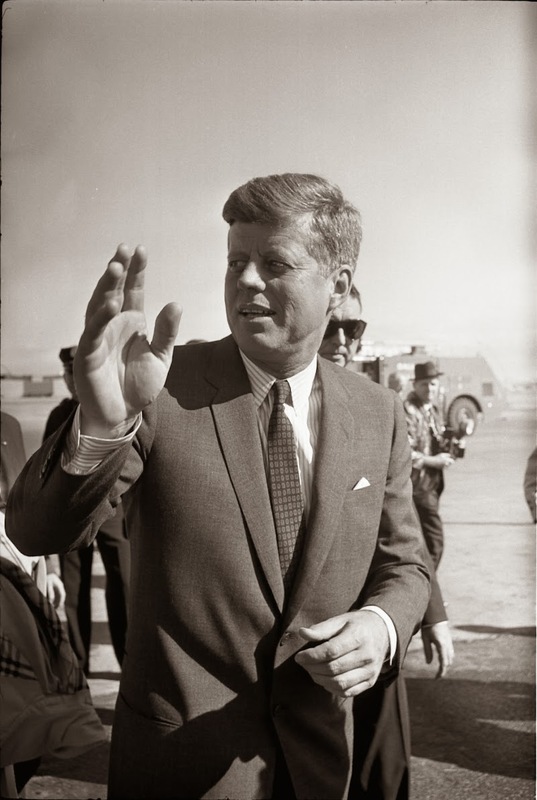 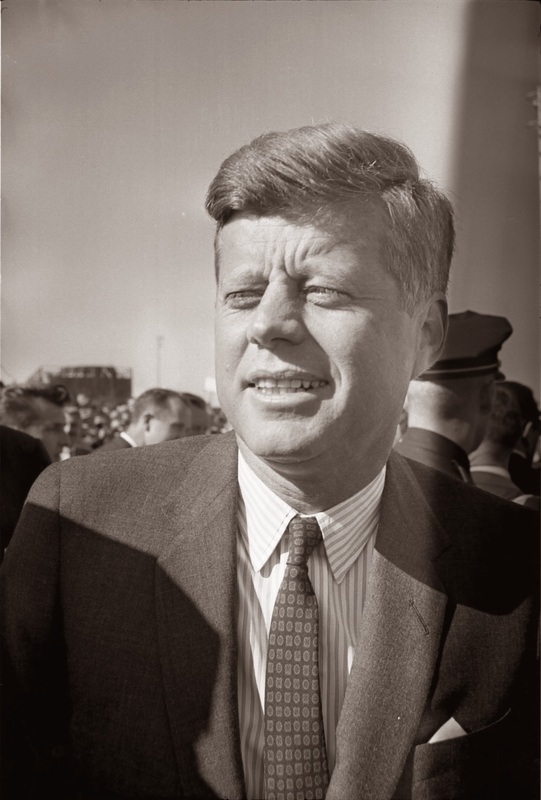 John F. Kennedy, including some seldom-seen photos. 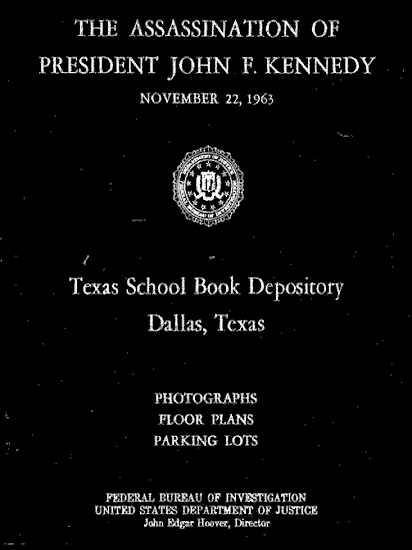 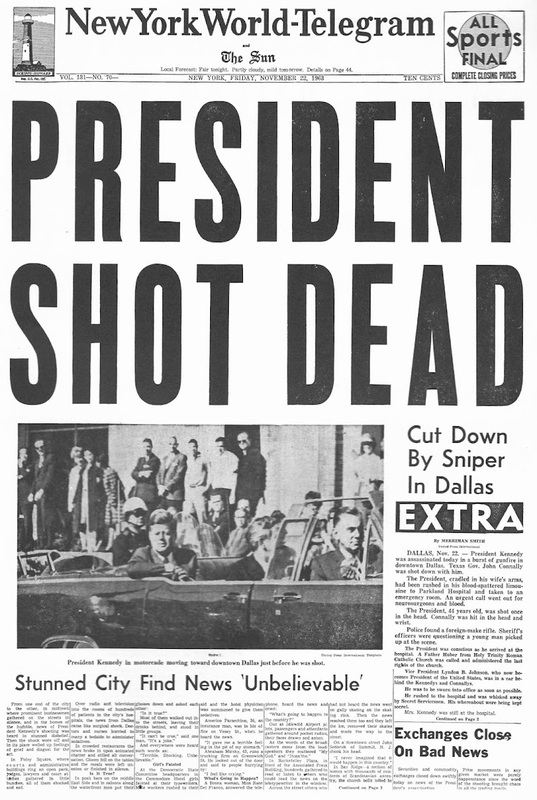 this first page focusing on the assassination of JFK. 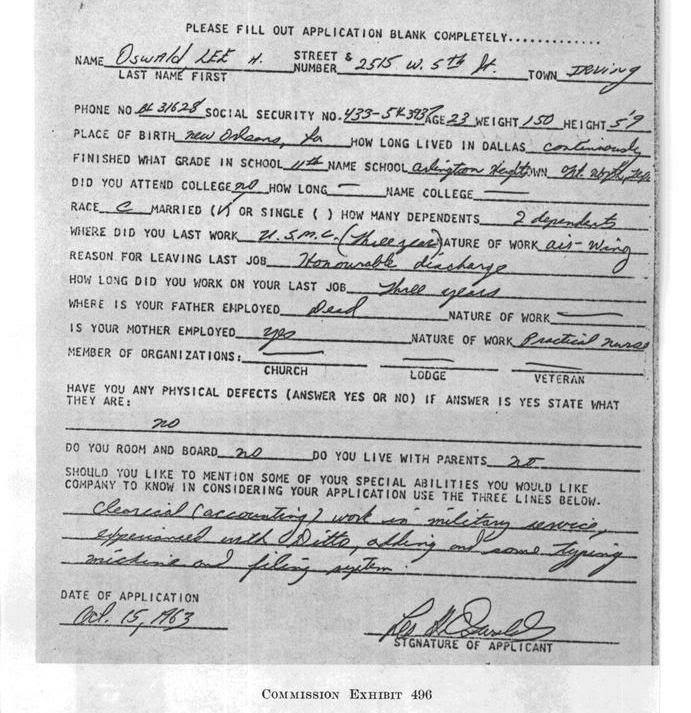 To jump to Page 2, CLICK HERE. 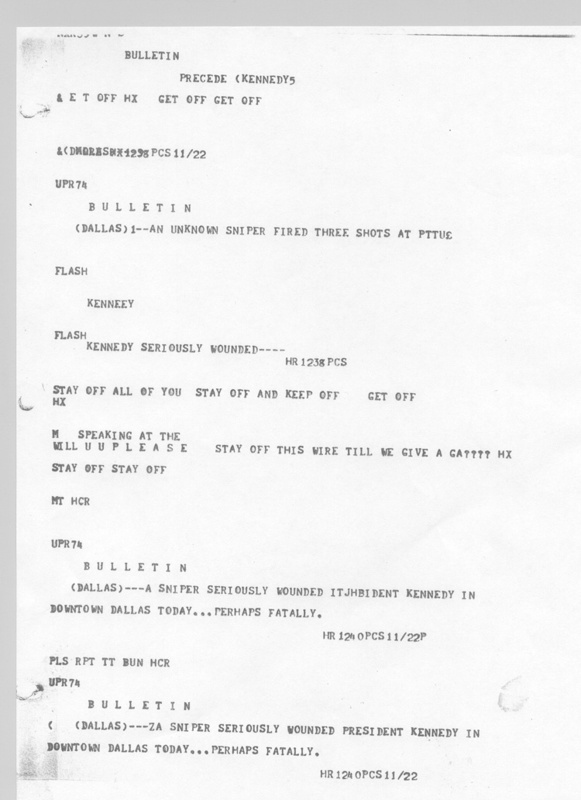 Page 3 is HERE. 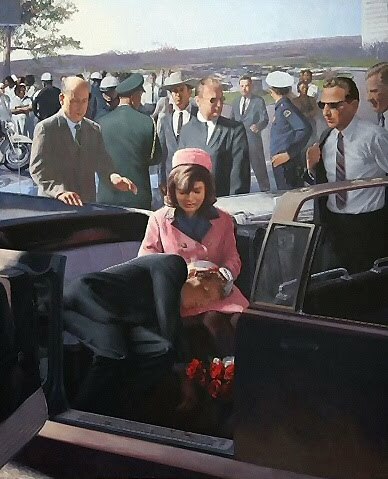 pictures in this gallery, GO HERE. 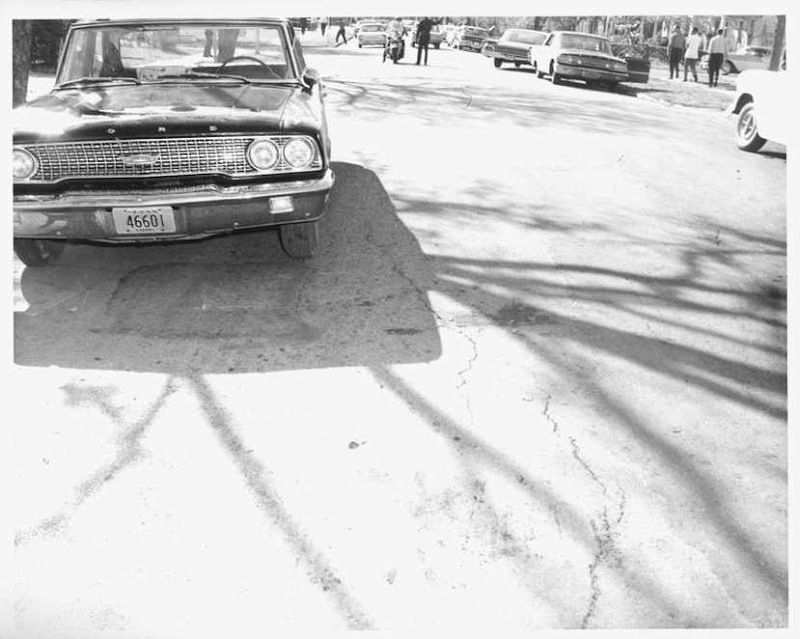 background audio while looking through these images. 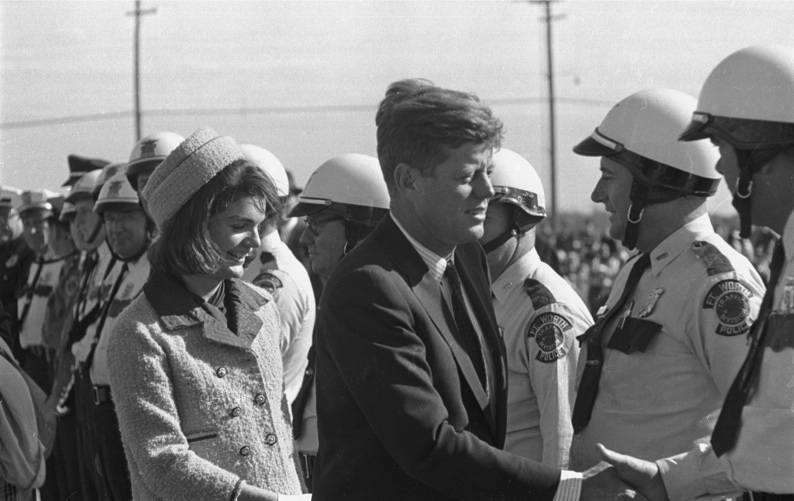 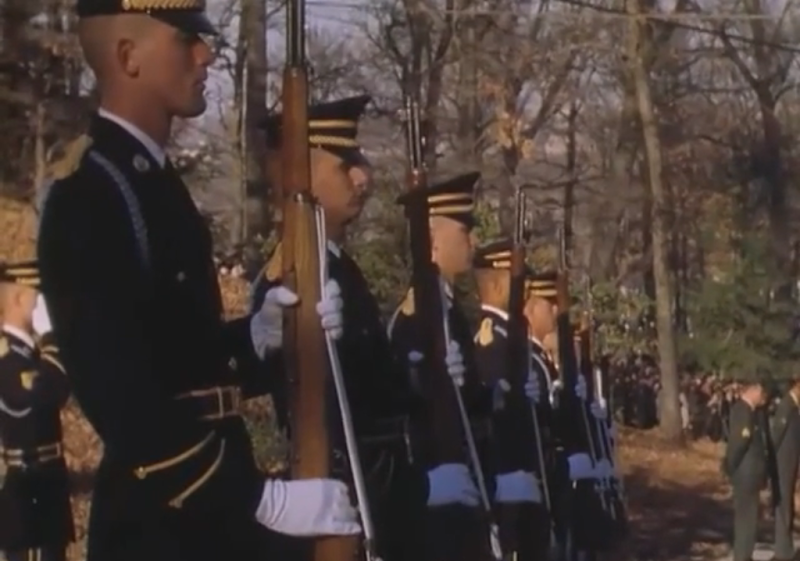 assigned to protect Mrs. Kennedy, leads the way. 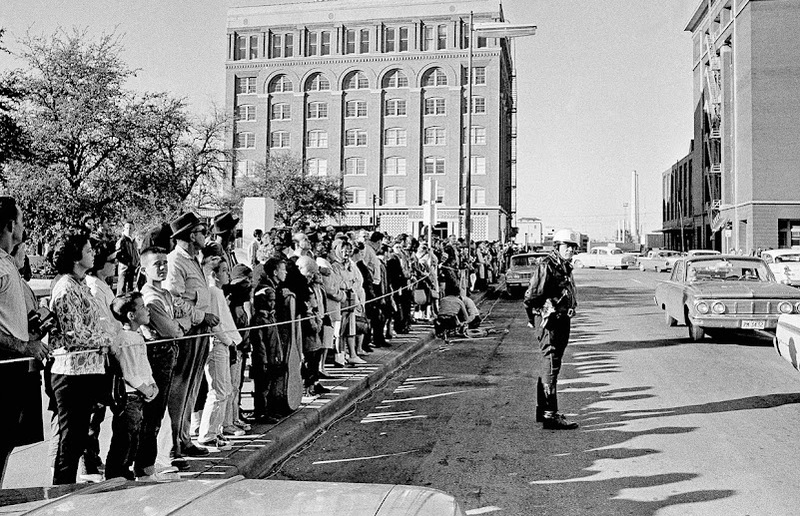 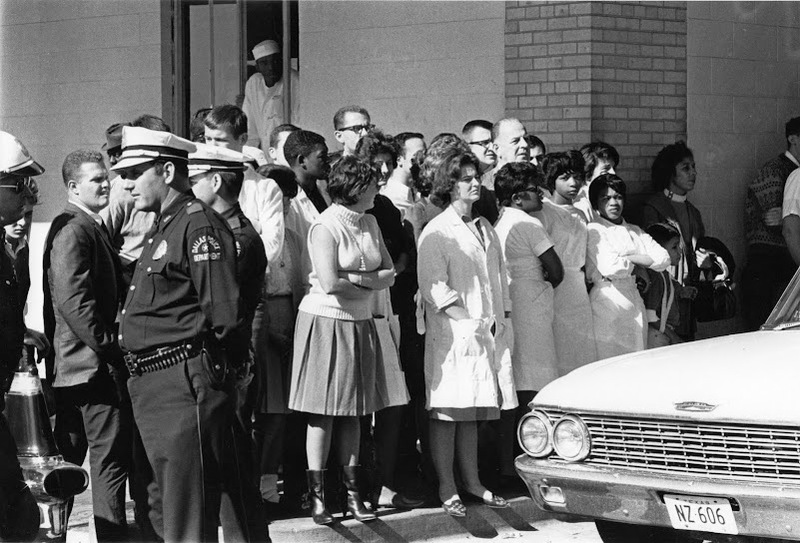 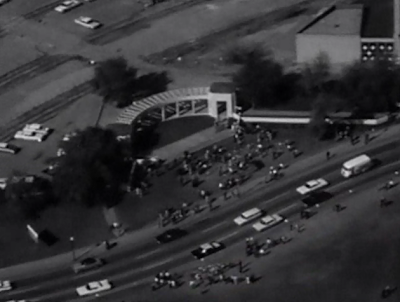 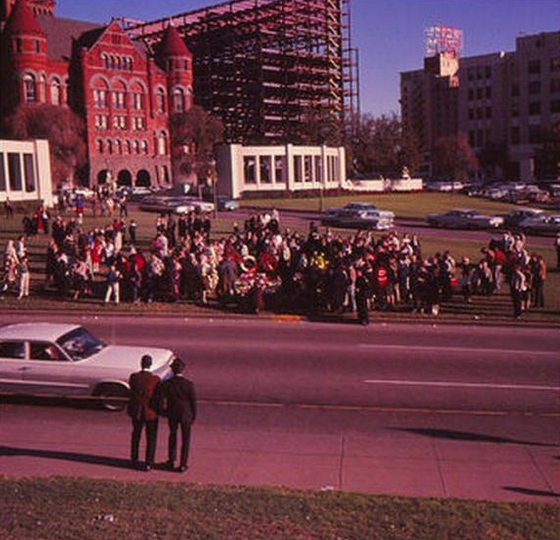 the breakfast gathering in Fort Worth on the morning of 11/22/63. 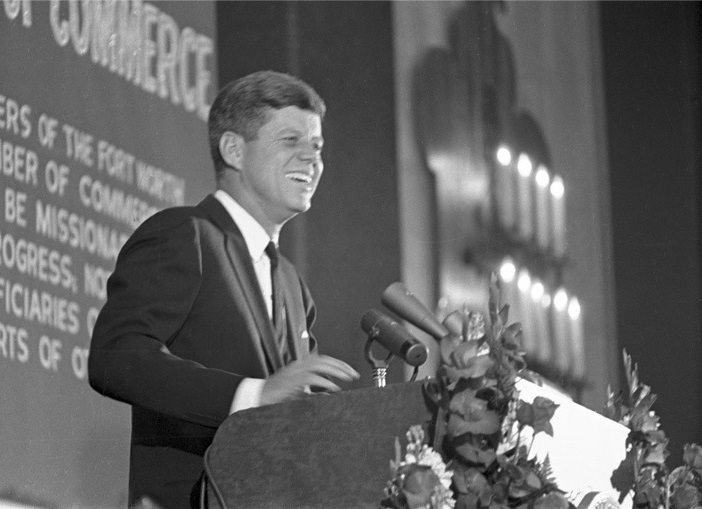 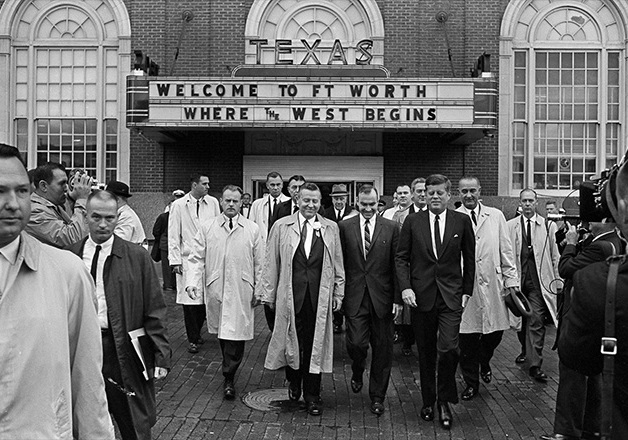 President Kennedy to Fort Worth. 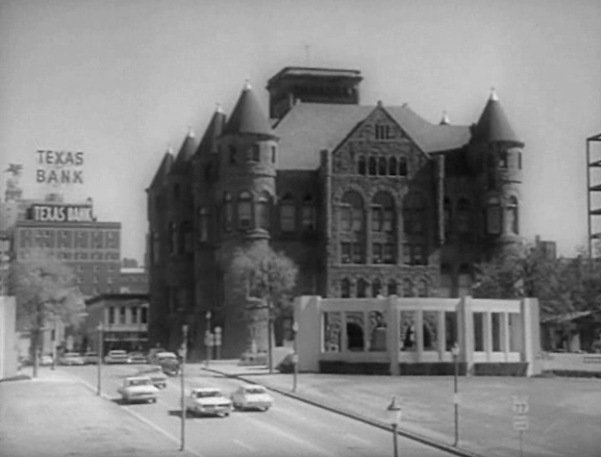 the Hotel Texas. 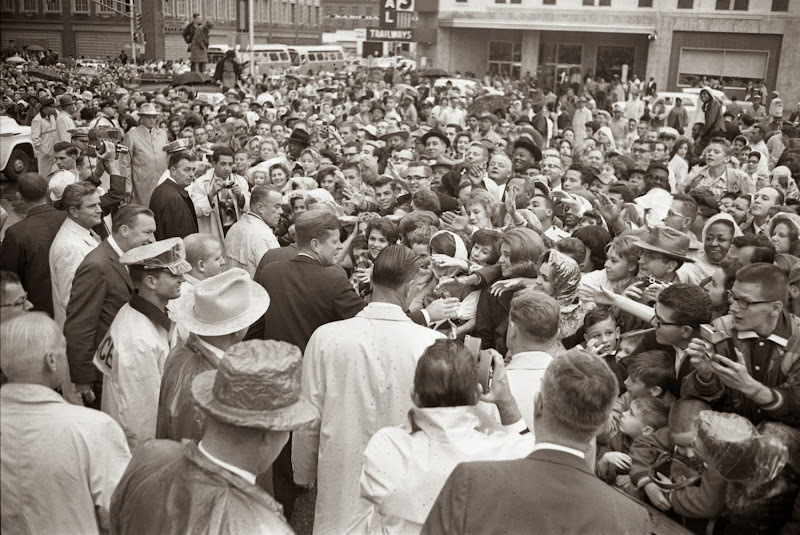 Thousands came out in the rain to see him. 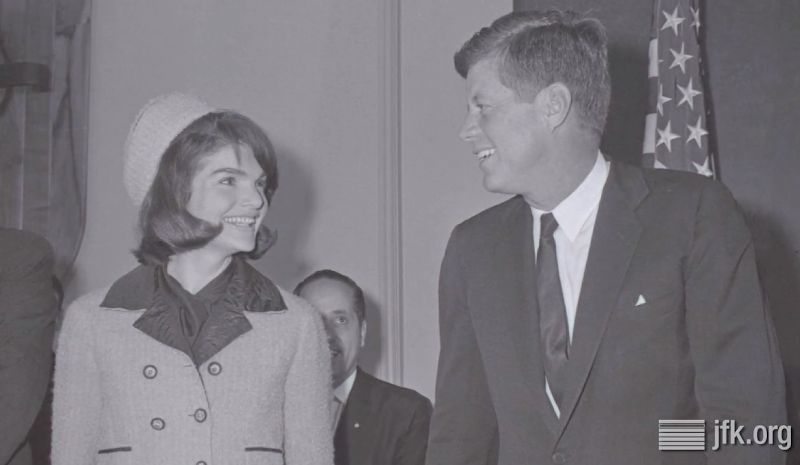 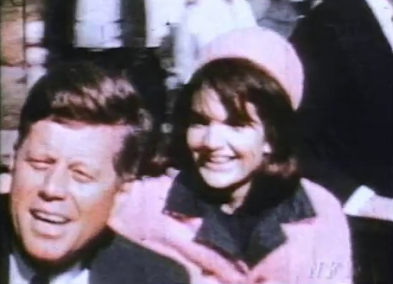 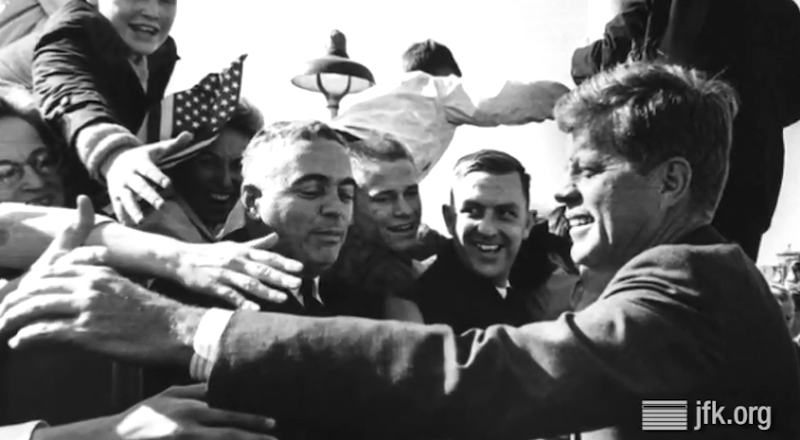 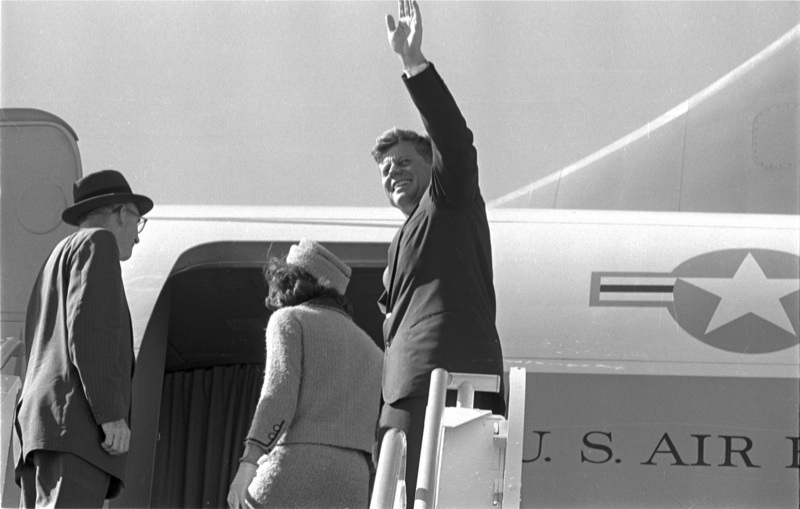 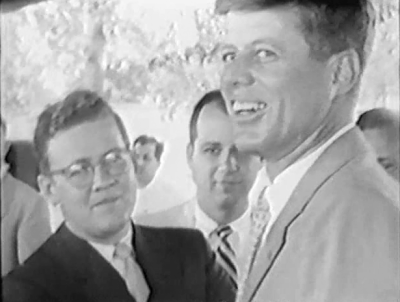 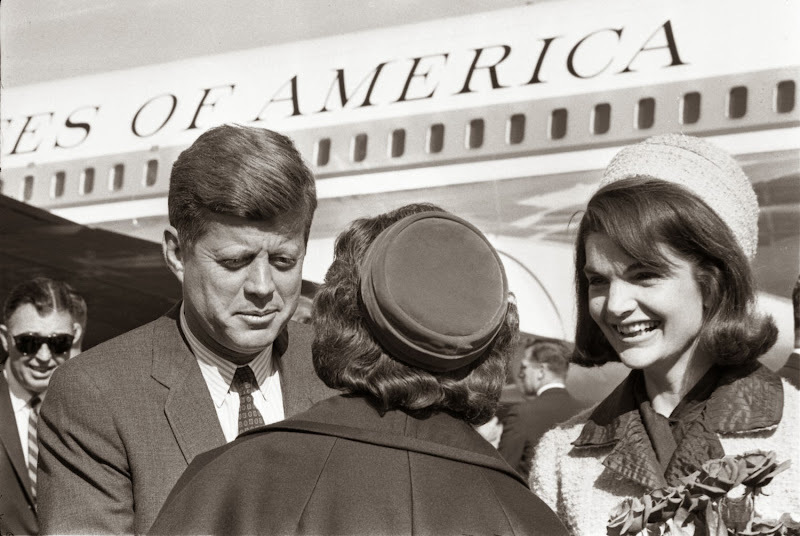 JFK and Jackie are all smiles as they prepare to leave Fort Worth for Dallas. 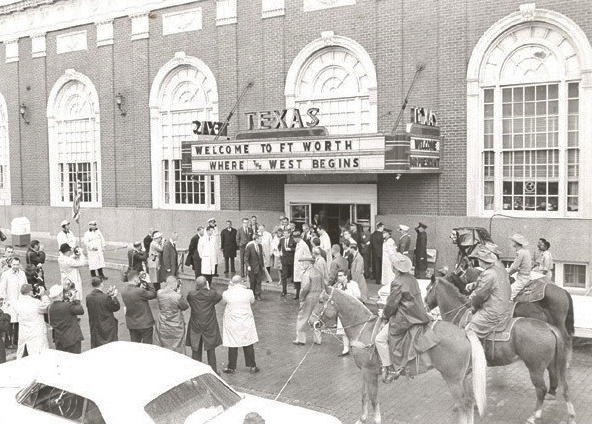 just before departing Fort Worth on November 22nd. 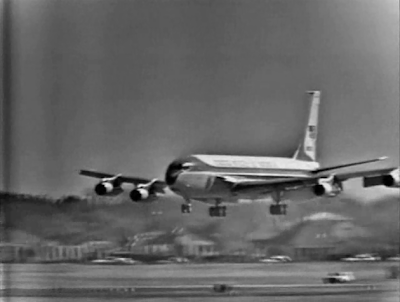 of the Boeing 707 in the rarely-published third picture shown below. 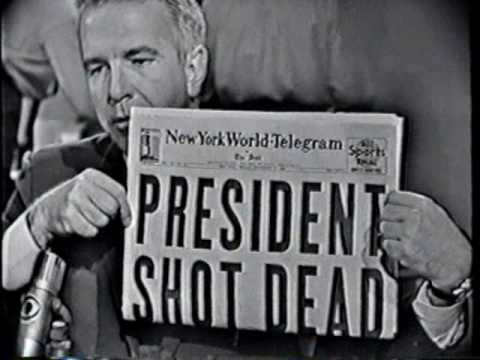 assassinated since William McKinley 62 years earlier. 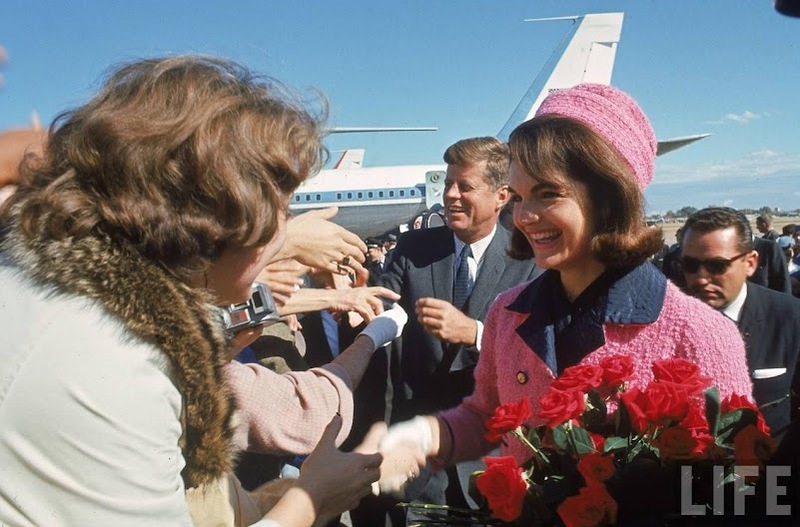 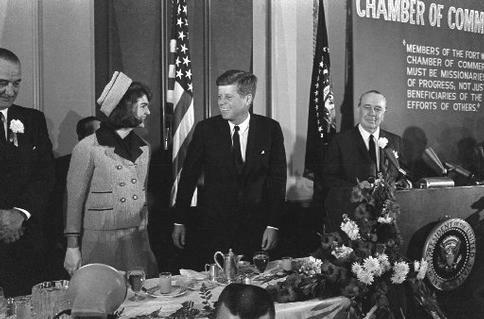 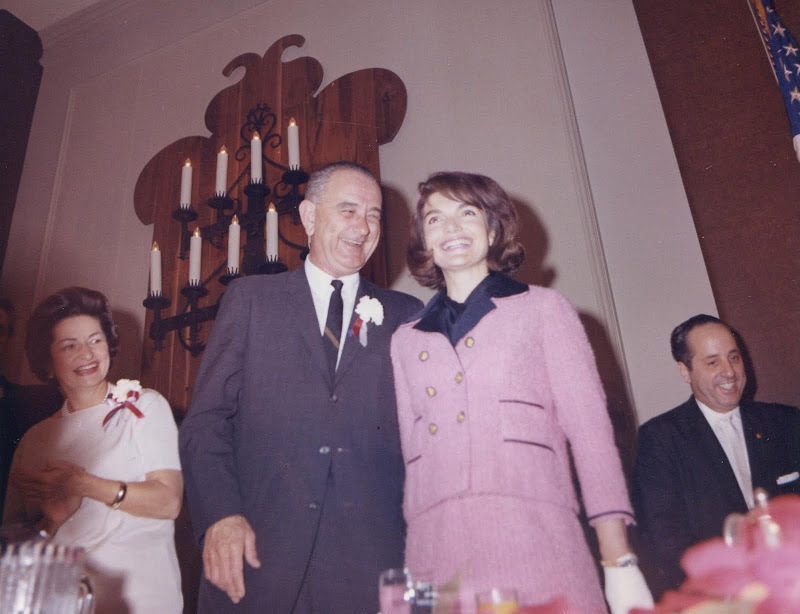 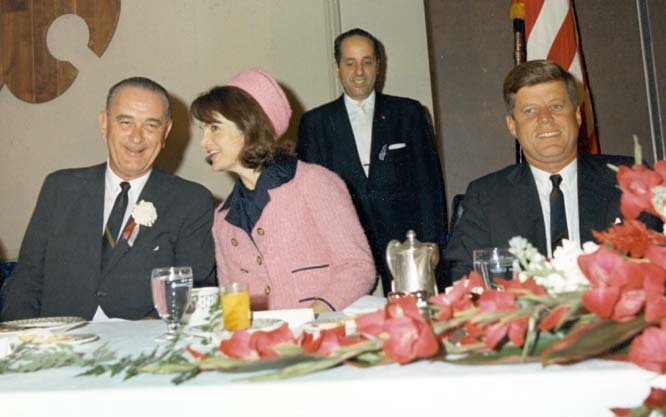 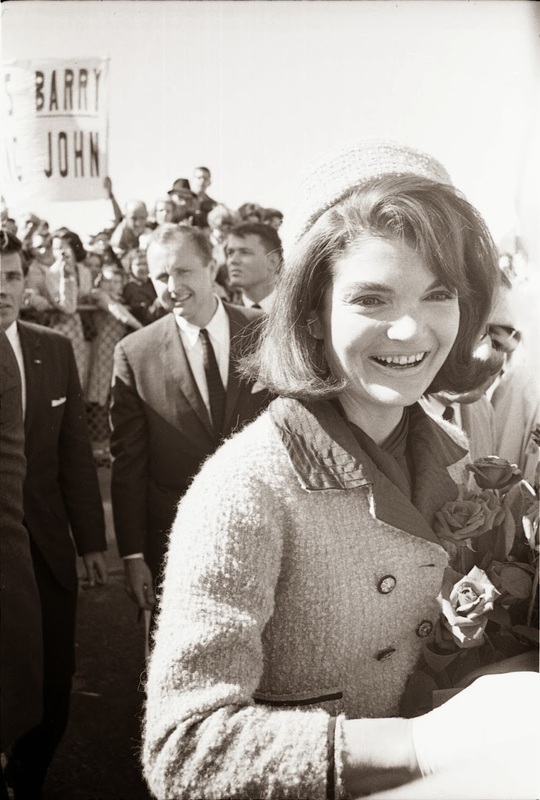 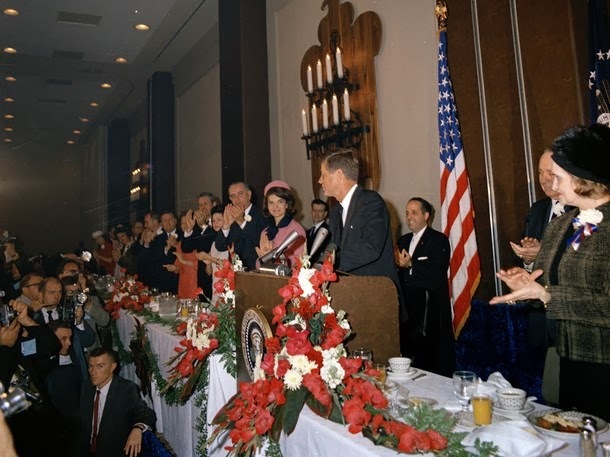 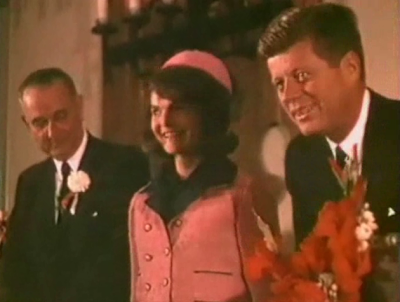 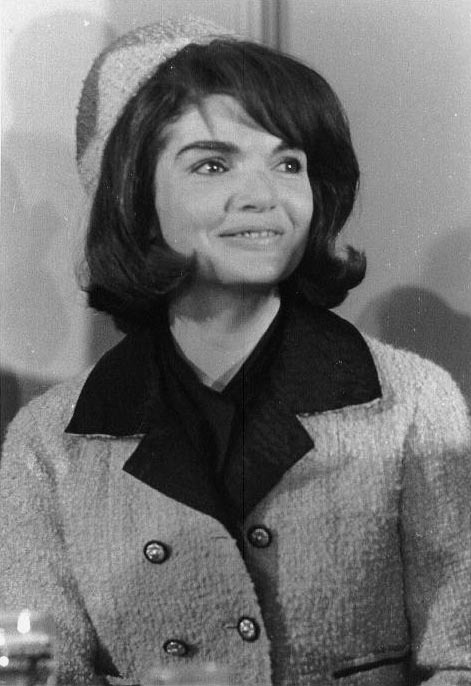 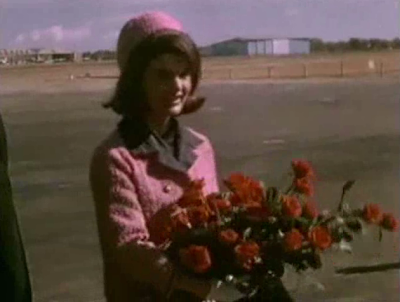 The above photograph was taken just seconds before Jackie Kennedy was handed a bouquet of red roses by Mrs. Earle Cabell (the wife of the Dallas mayor). 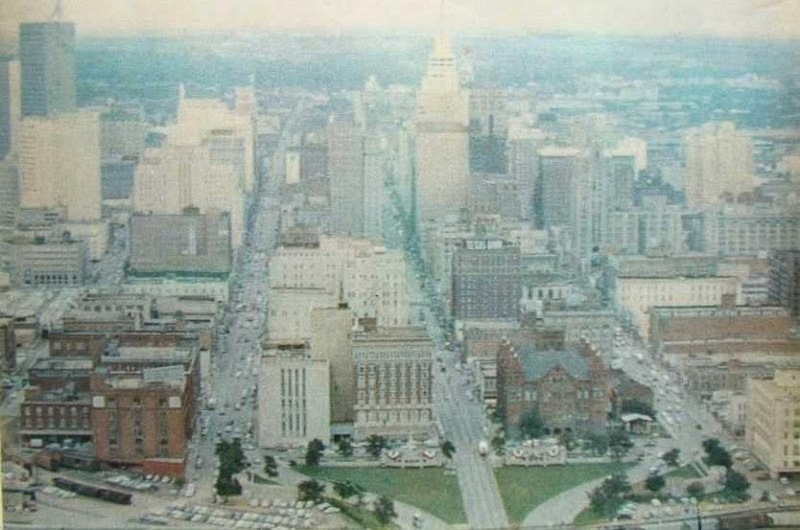 This beautiful picture isn't seen very often. 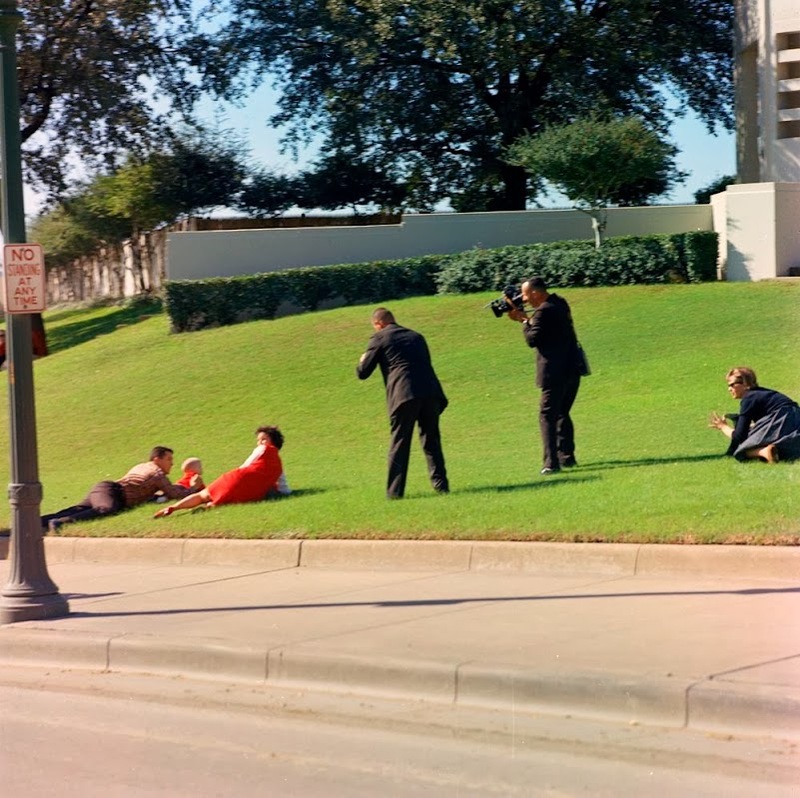 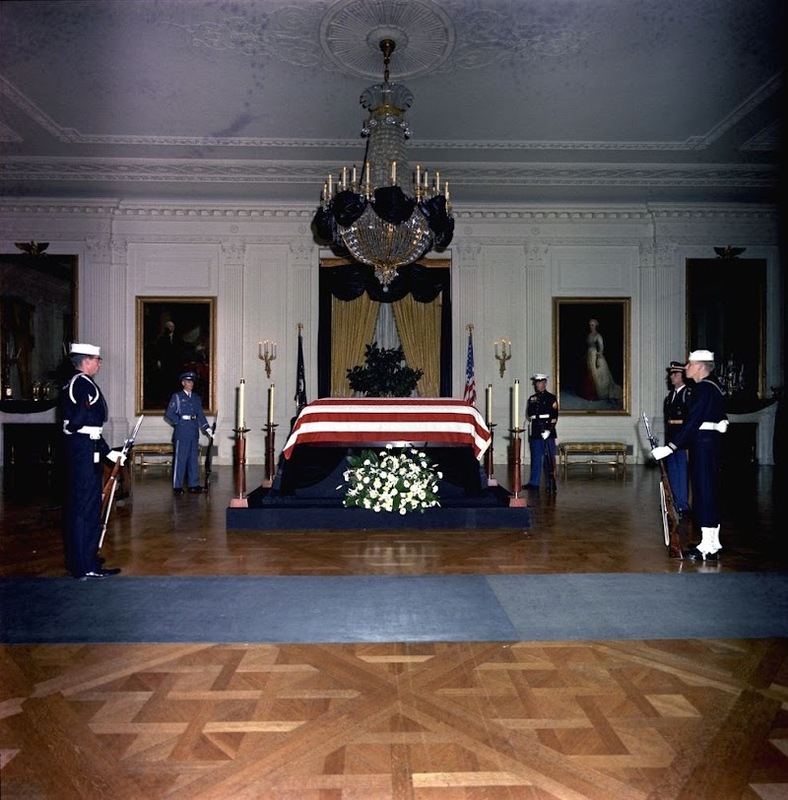 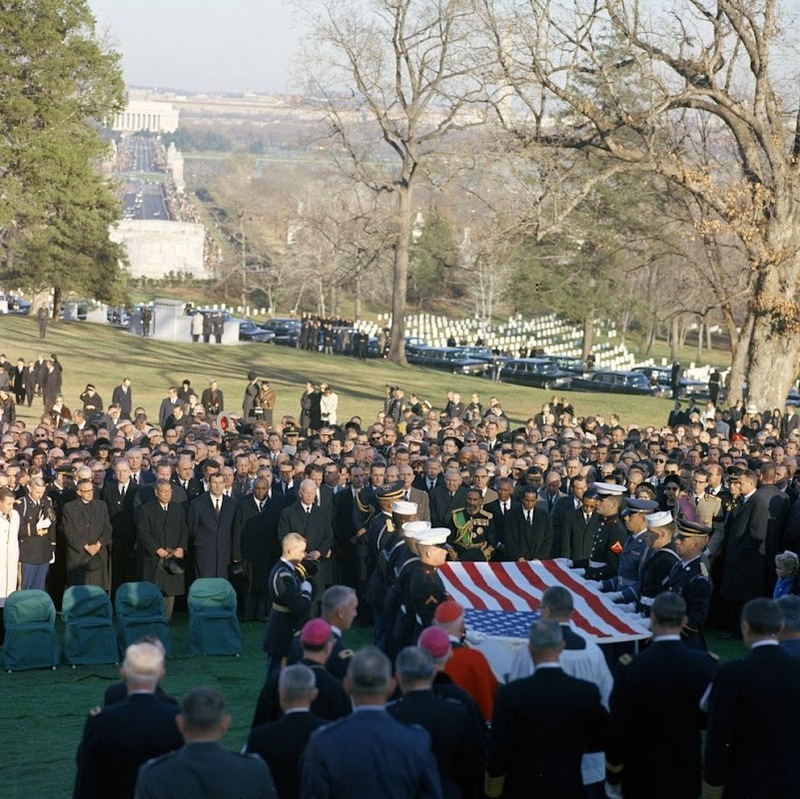 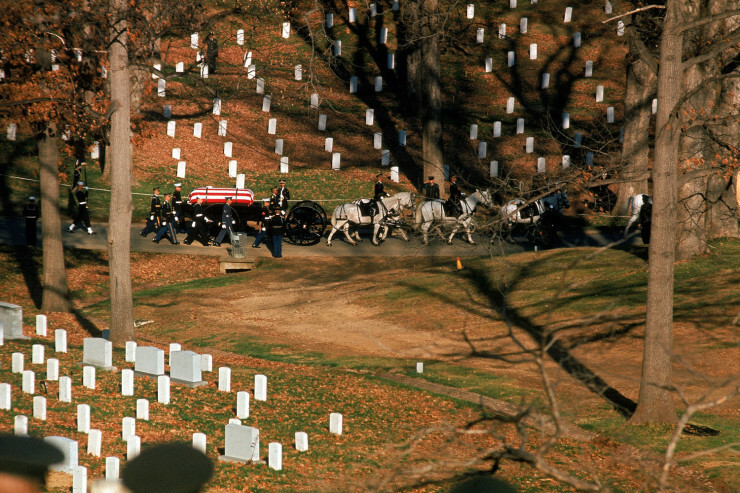 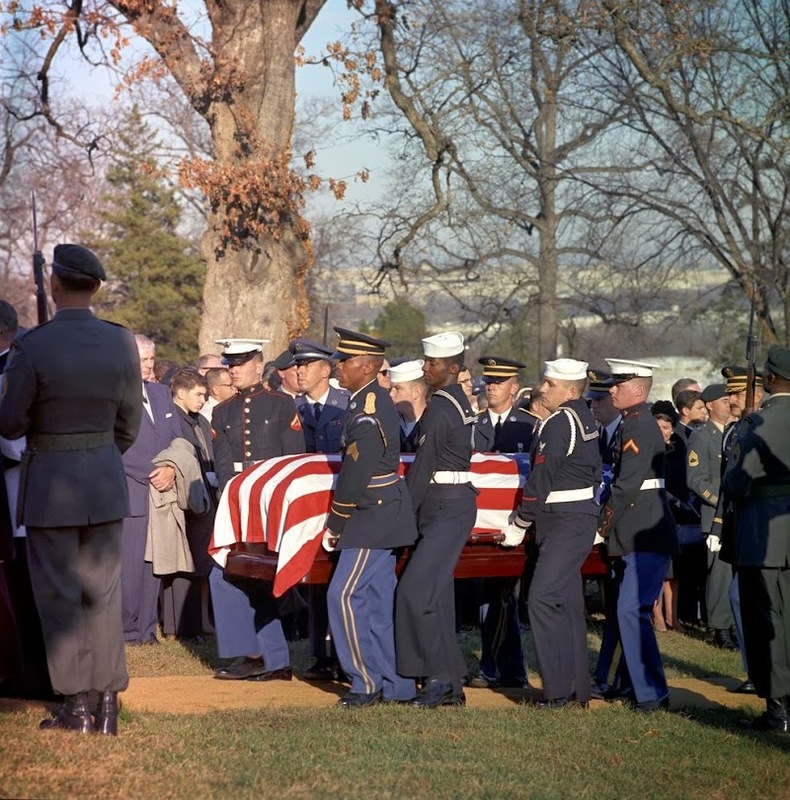 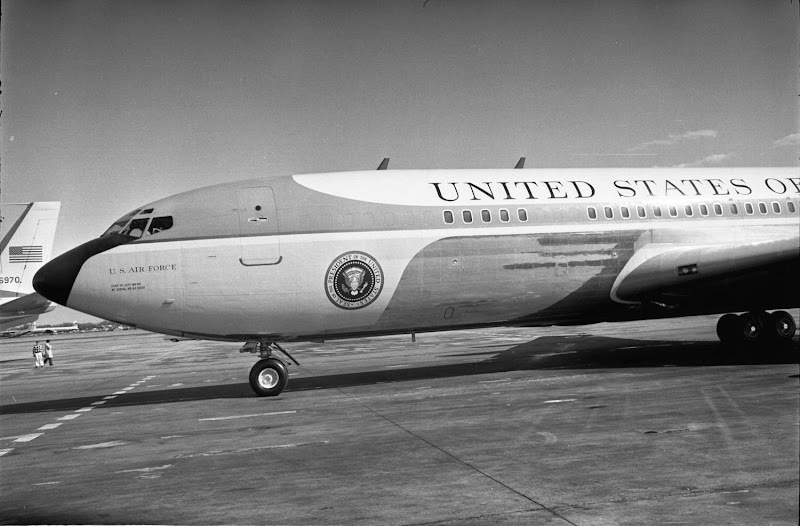 It exhibits outstanding color and is one of a series of Love Field photos snapped by White House photographer Cecil Stoughton on that tragic Friday in November 1963 when the nation lost a President. 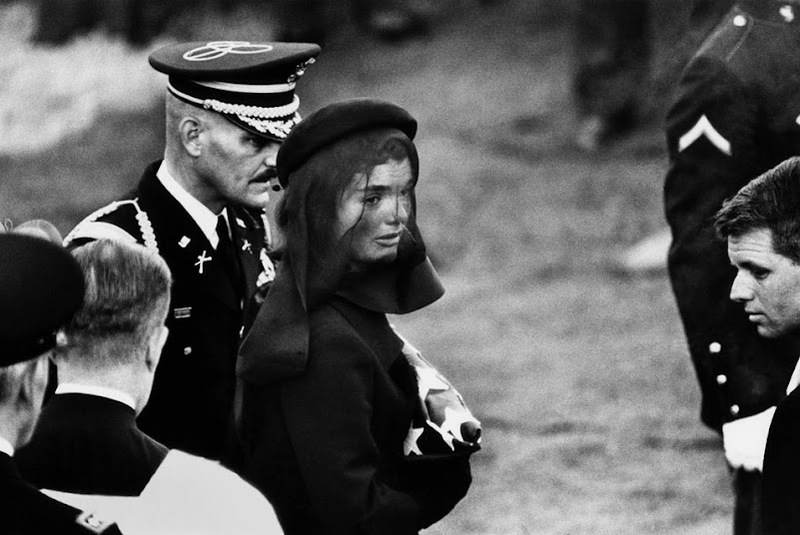 the background serves as tragic irony. 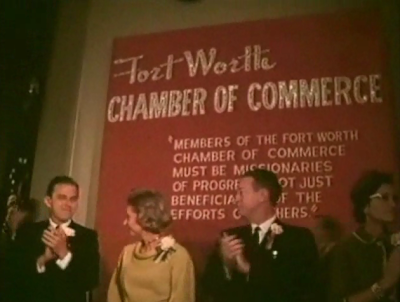 at Love Field exhibits excellent quality. 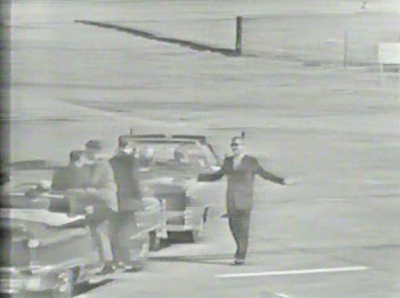 Cecil Stoughton at Love Field on 11/22/63. 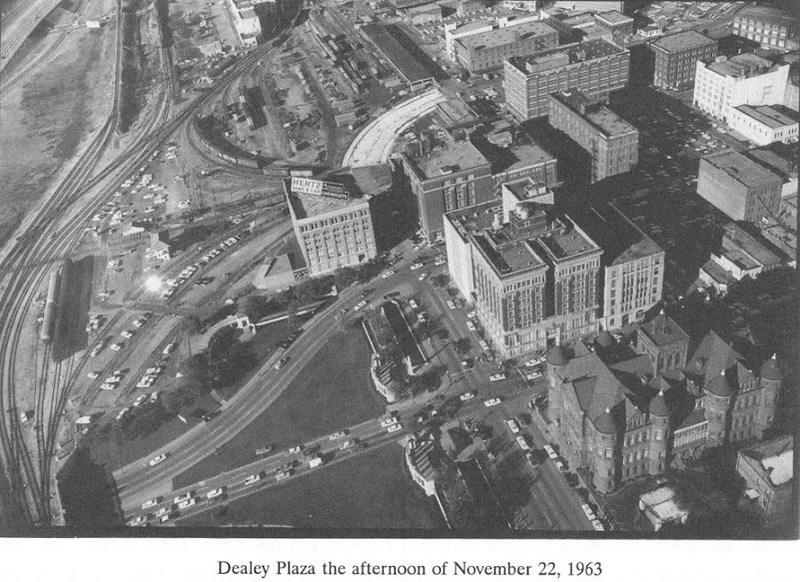 CLICK HERE for more details about this photograph. 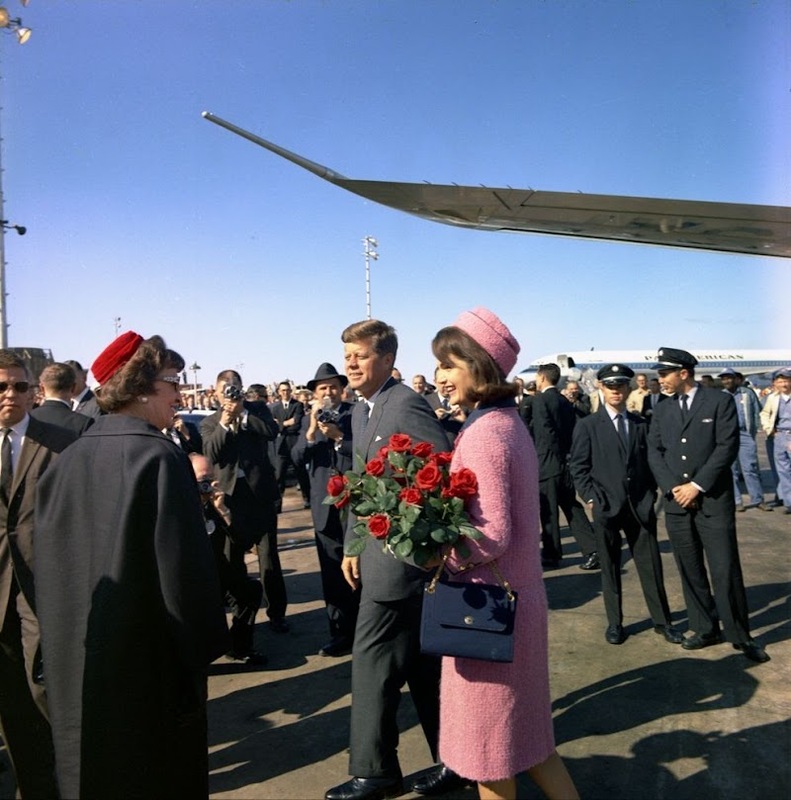 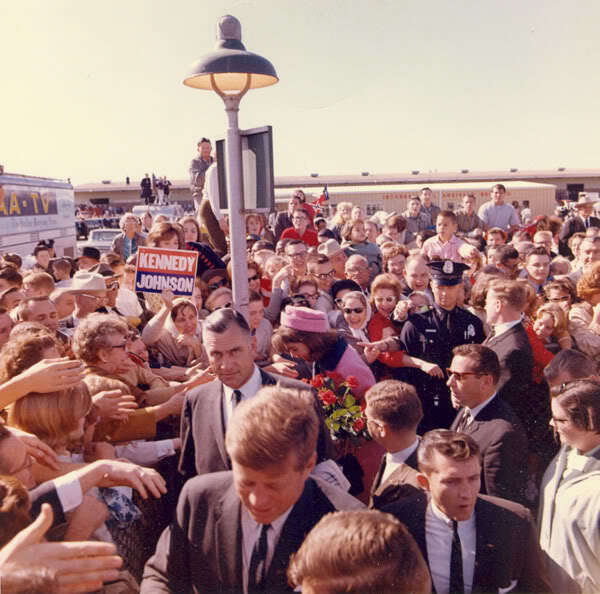 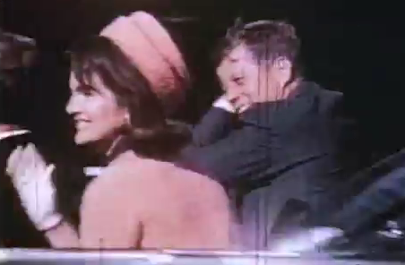 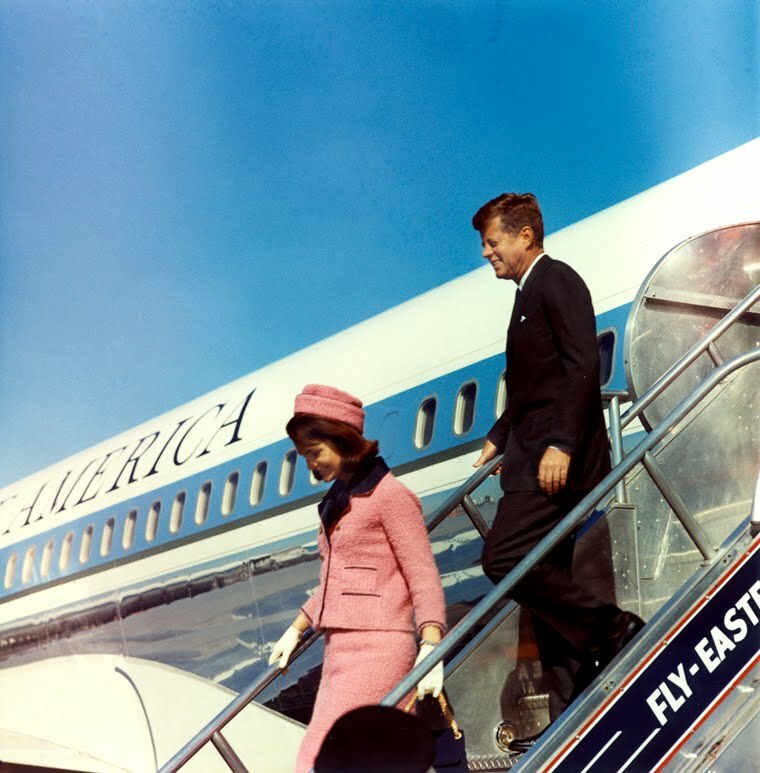 Four more fabulous pictures of President and Mrs. Kennedy at Love Field. 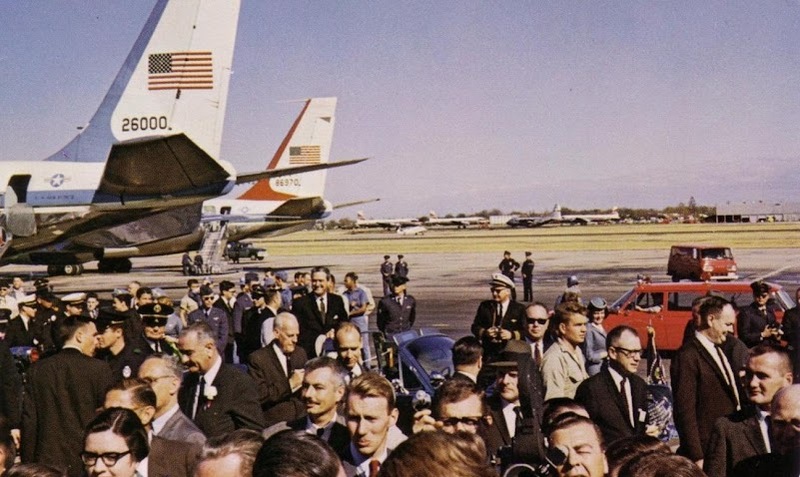 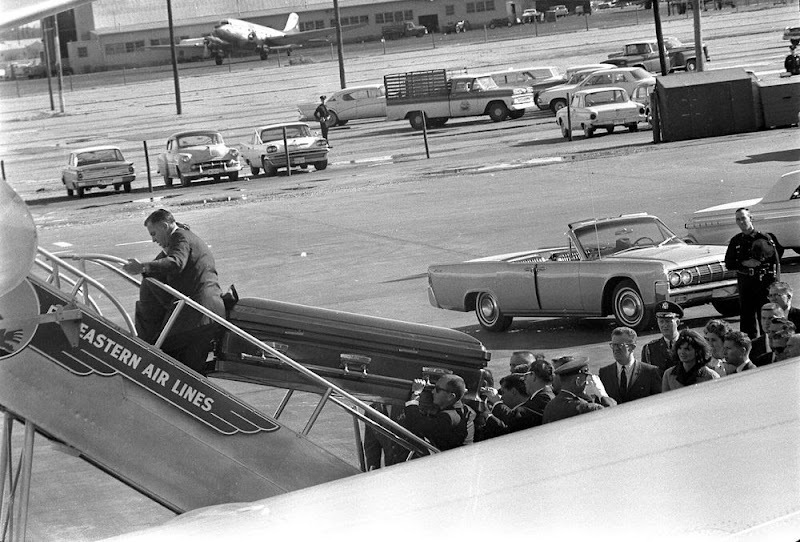 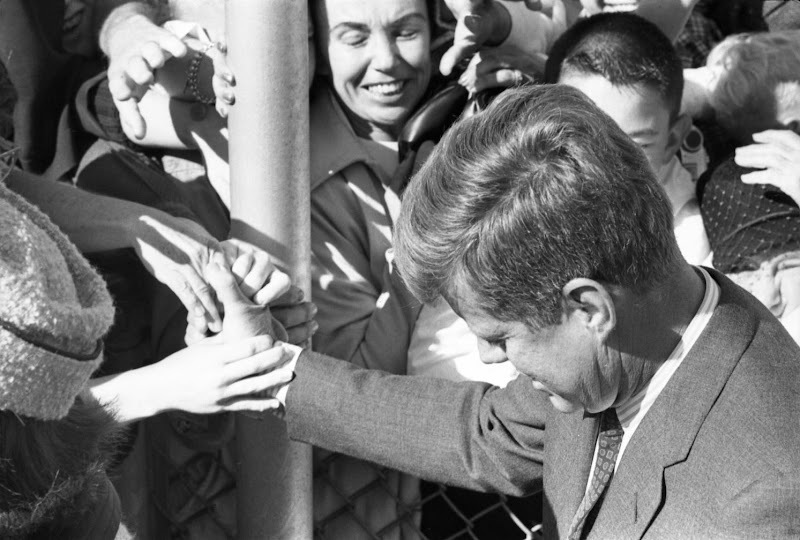 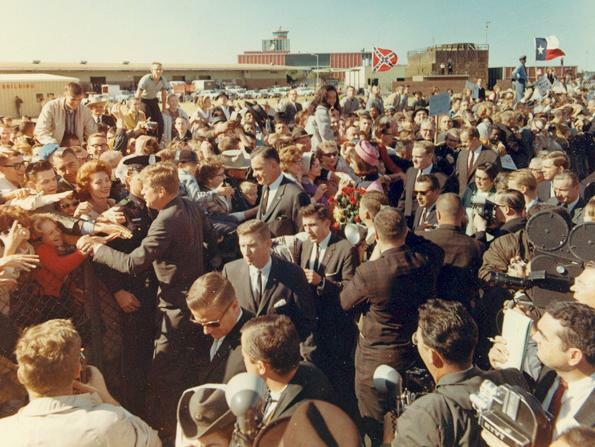 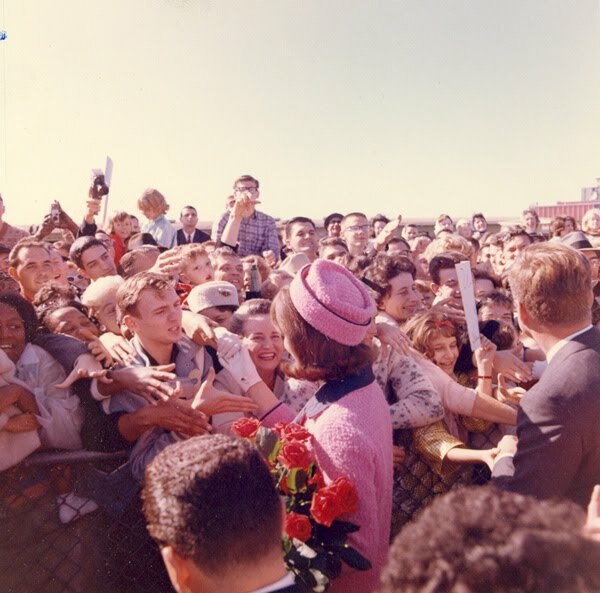 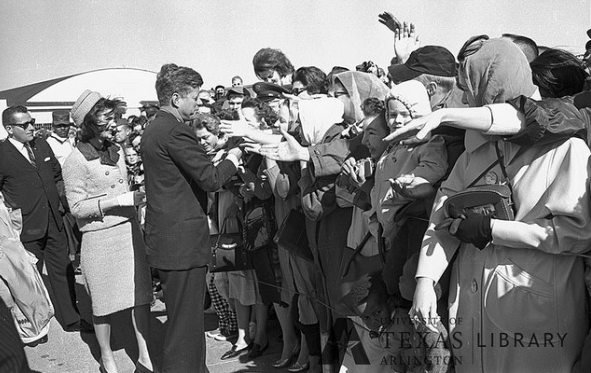 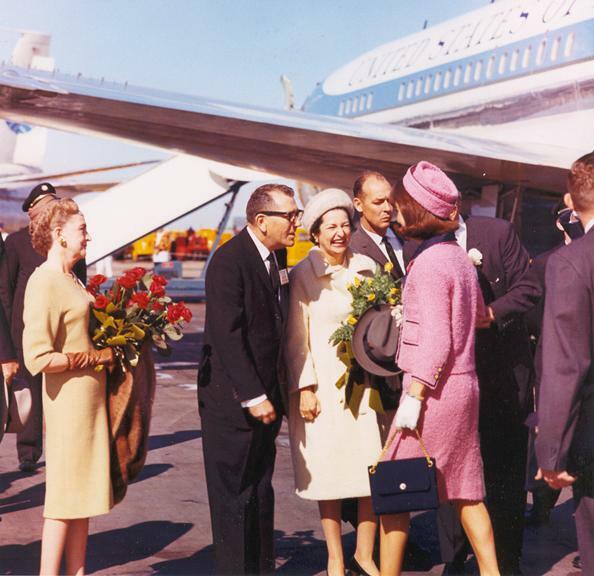 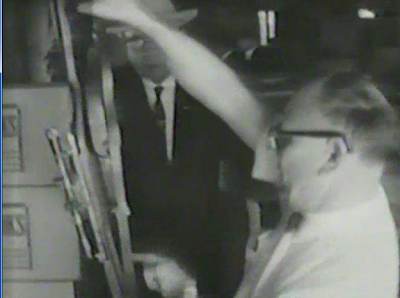 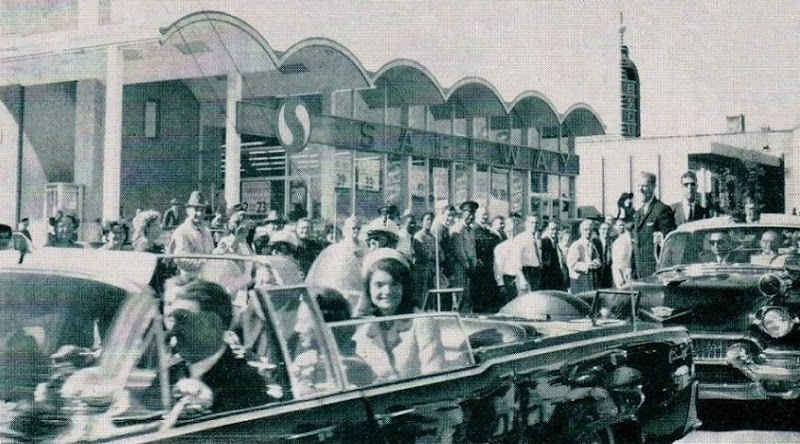 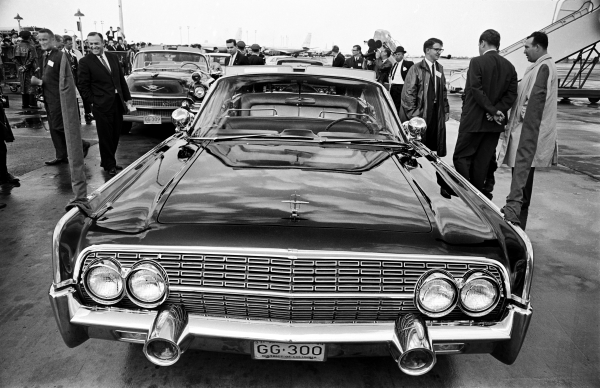 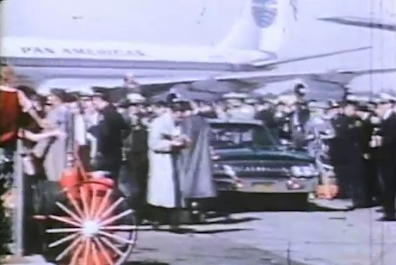 Presidential aide Dave Powers at sunny Love Field on 11/22/63. 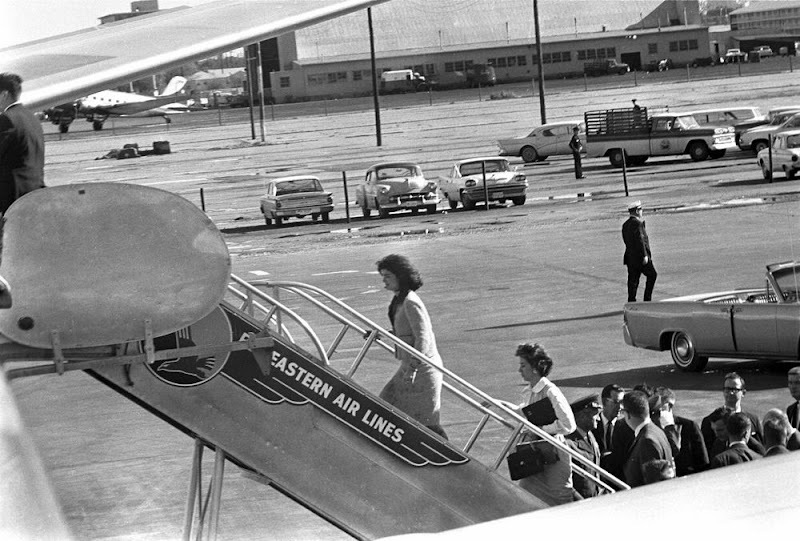 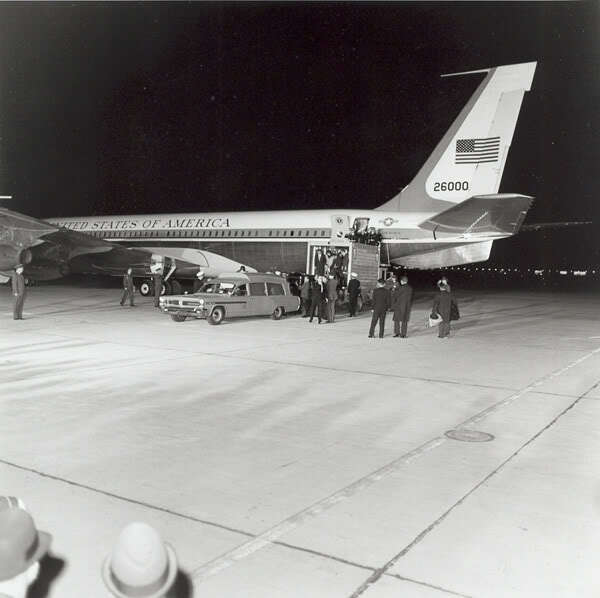 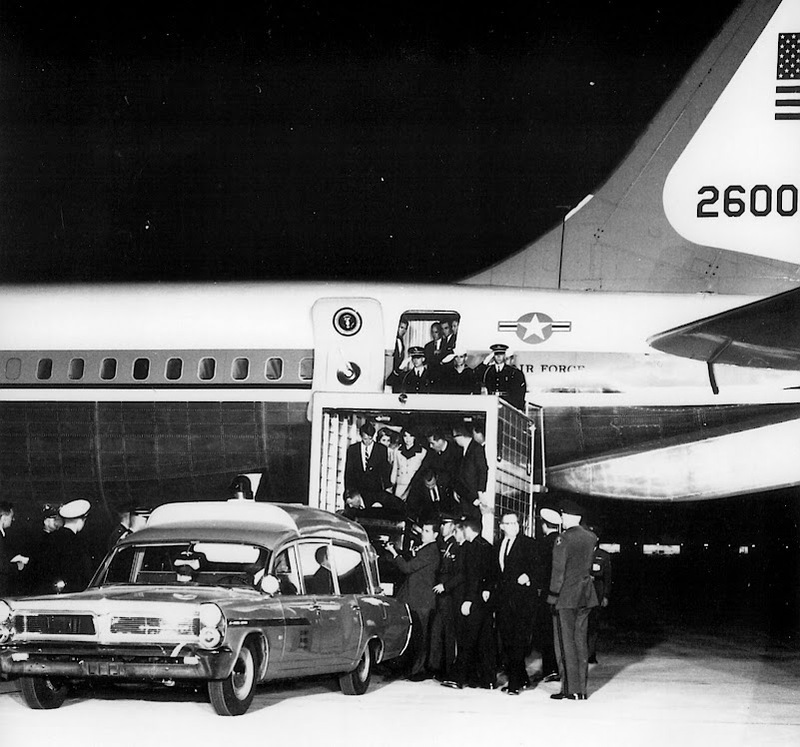 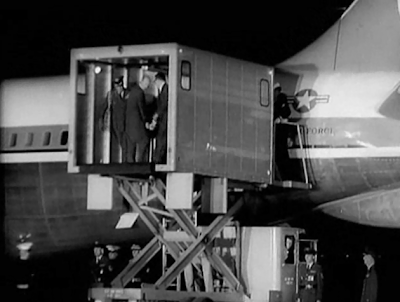 up, awaits its famous passengers at Love Field on 11/22/63. 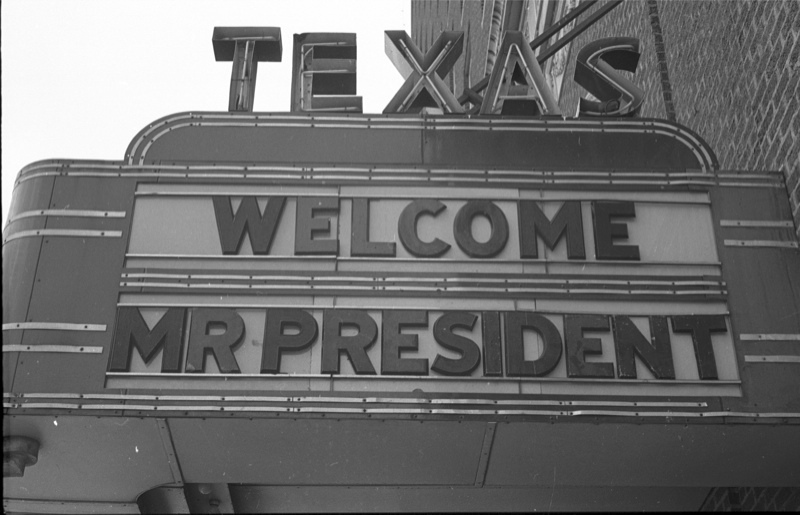 to the President's arrival in Dallas. 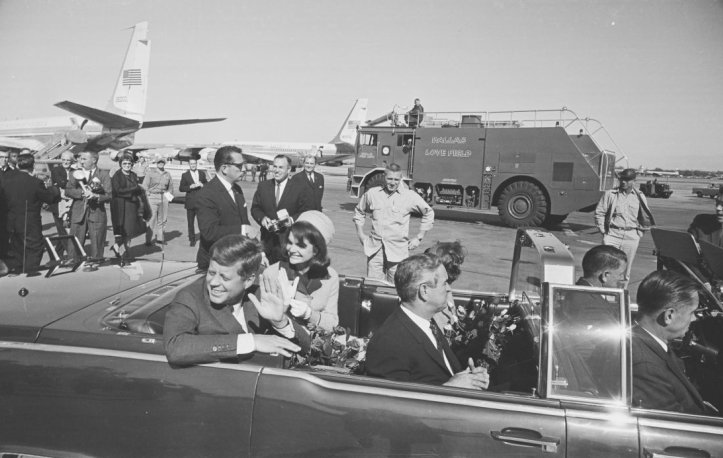 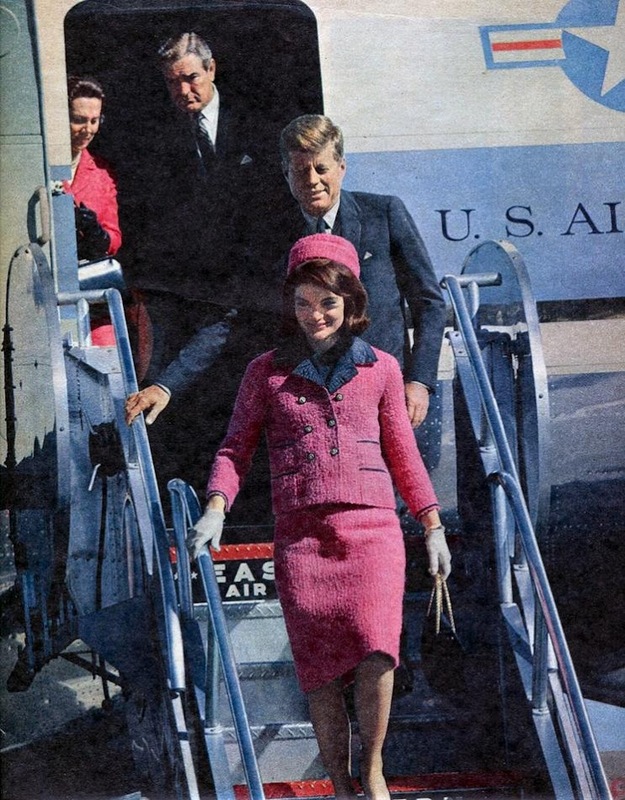 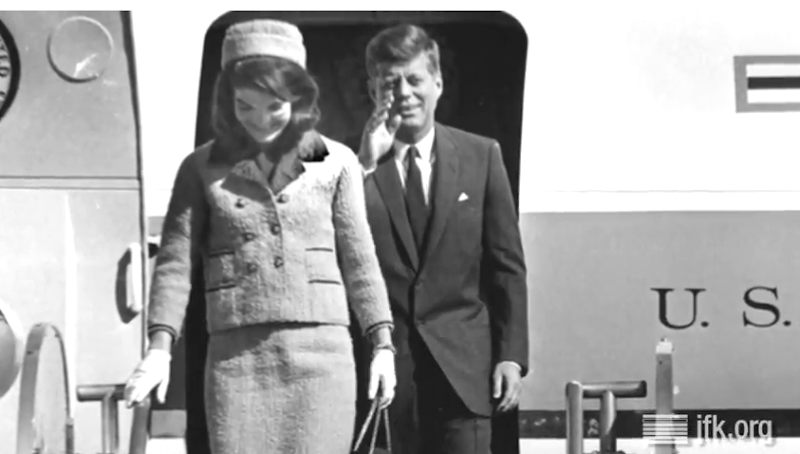 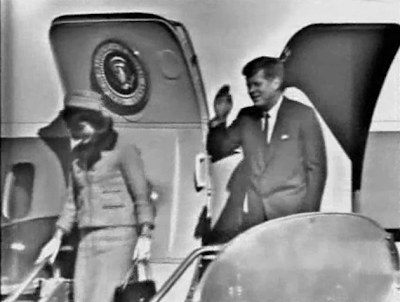 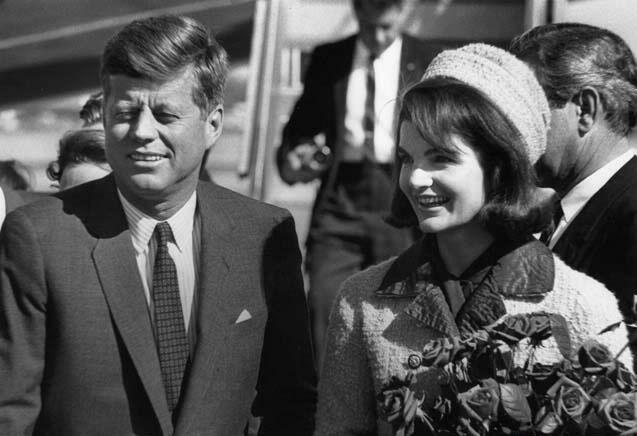 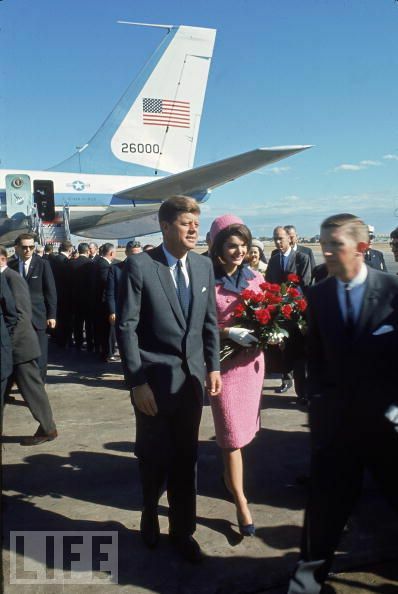 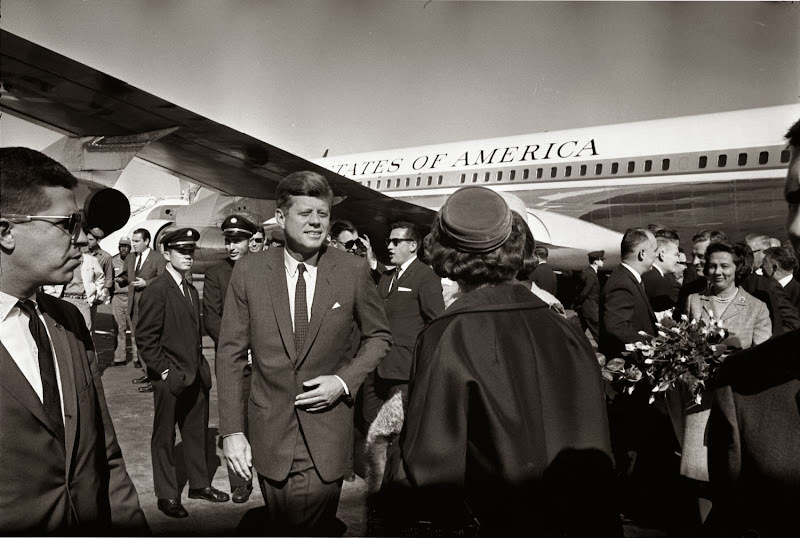 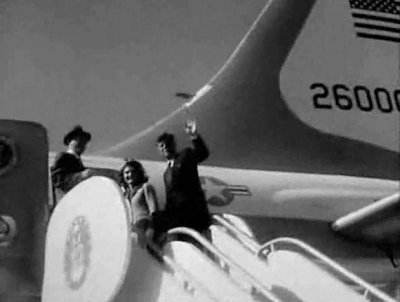 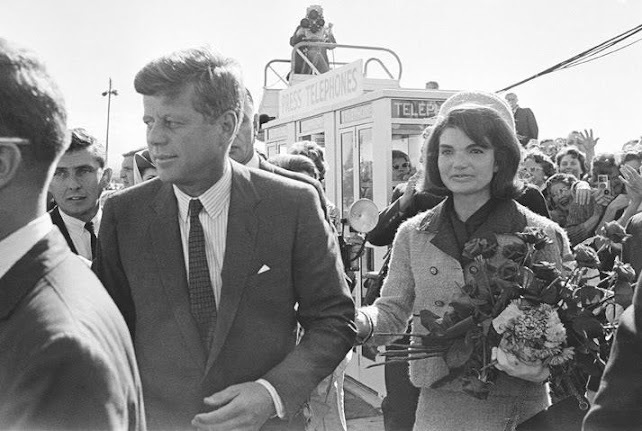 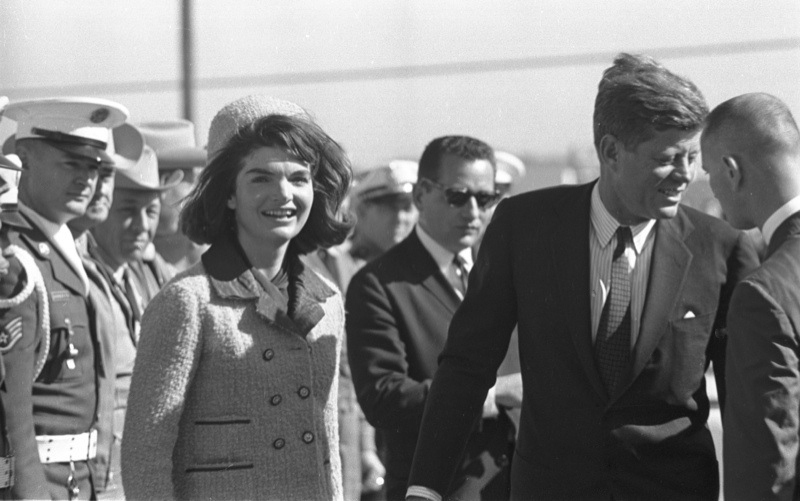 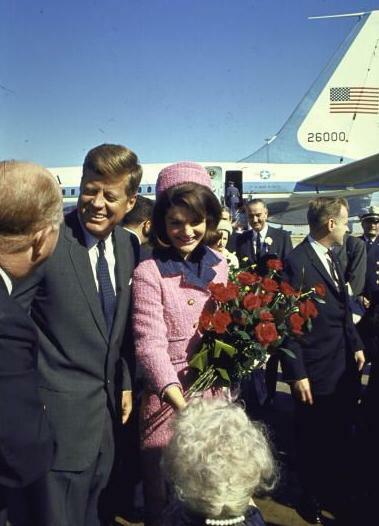 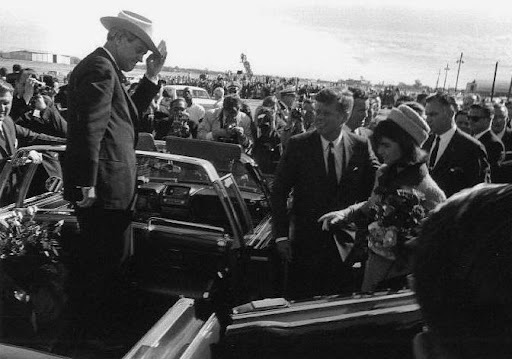 image of JFK and Jackie at the Dallas airport. 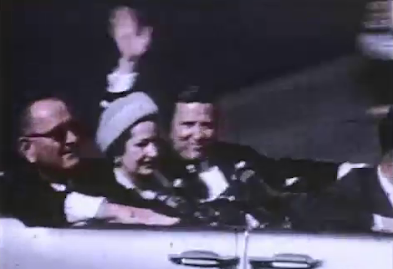 The First Couple is just about to enter the Presidential limousine in Dallas. 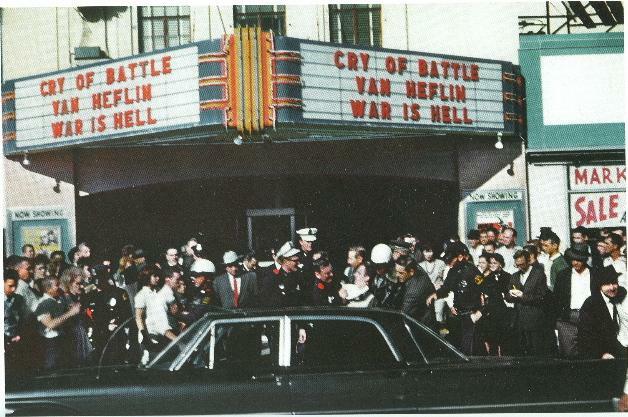 picture was snapped, due to the heavy crowds on that side of the street). 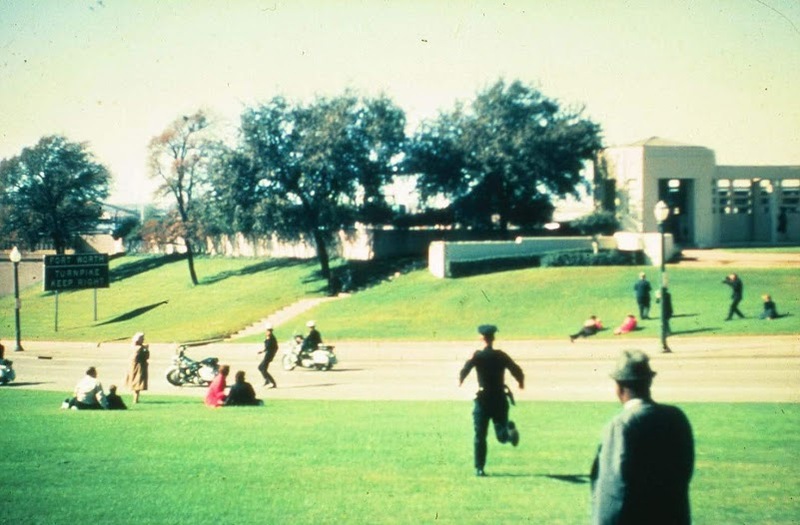 which occurred approximately four times during the Dallas motorcade. 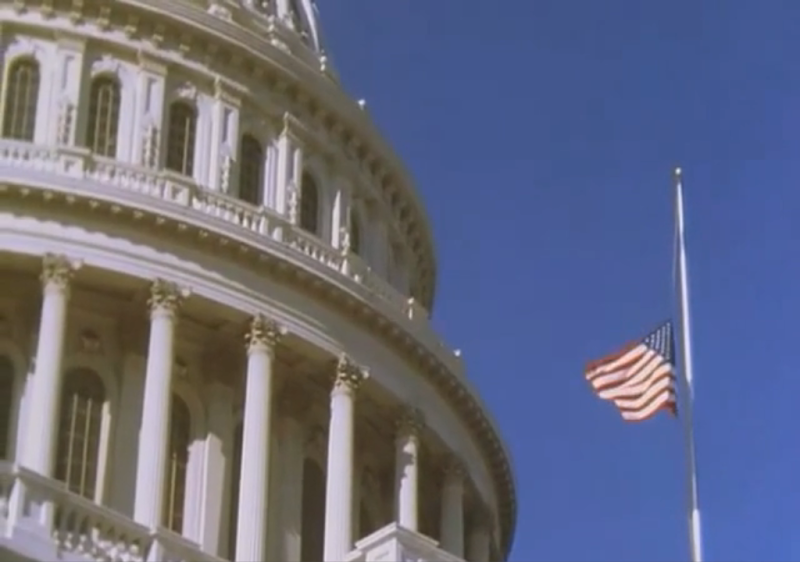 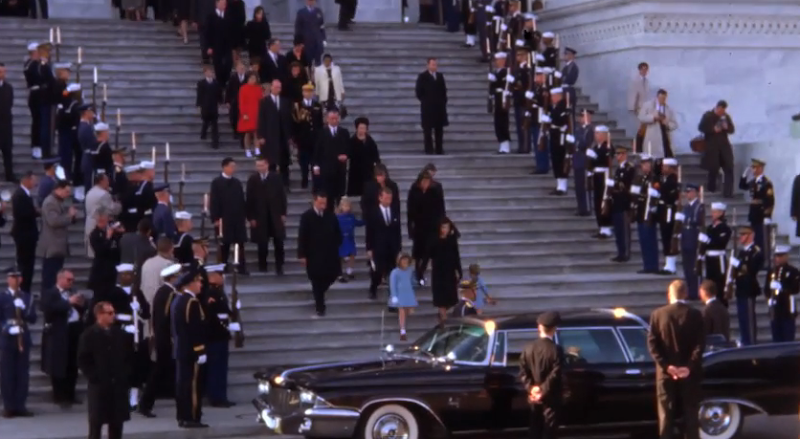 A great look at the Presidential limousine in Dallas. 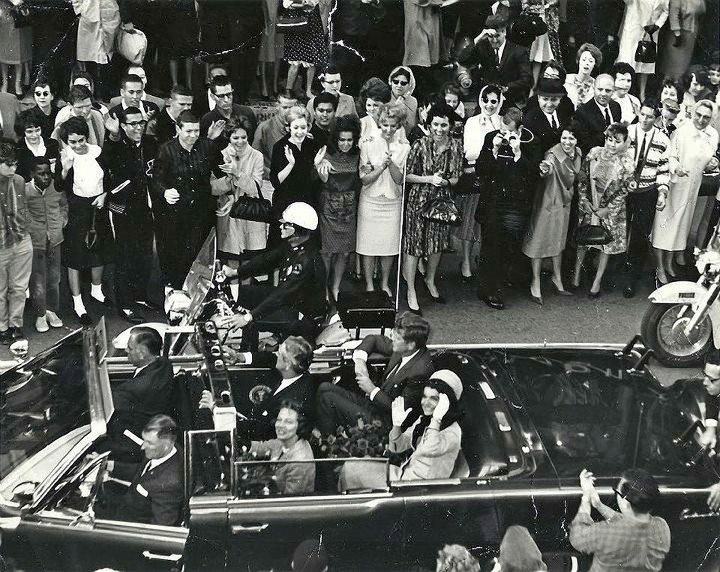 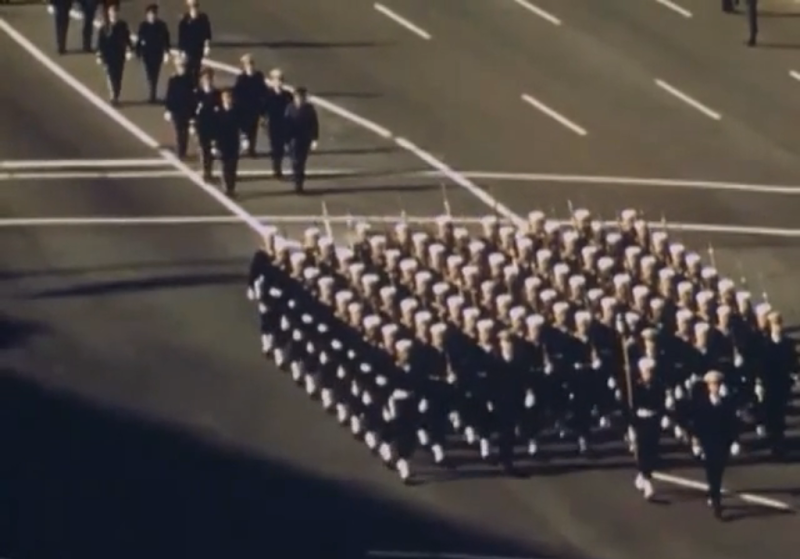 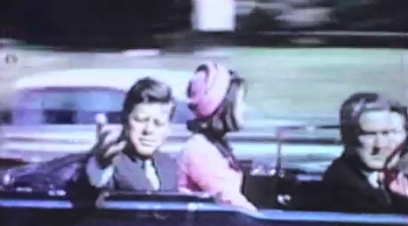 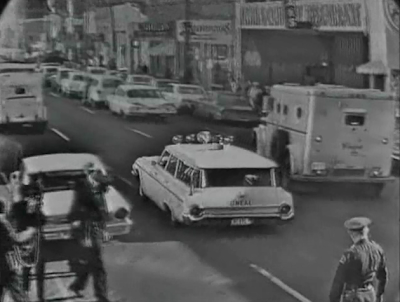 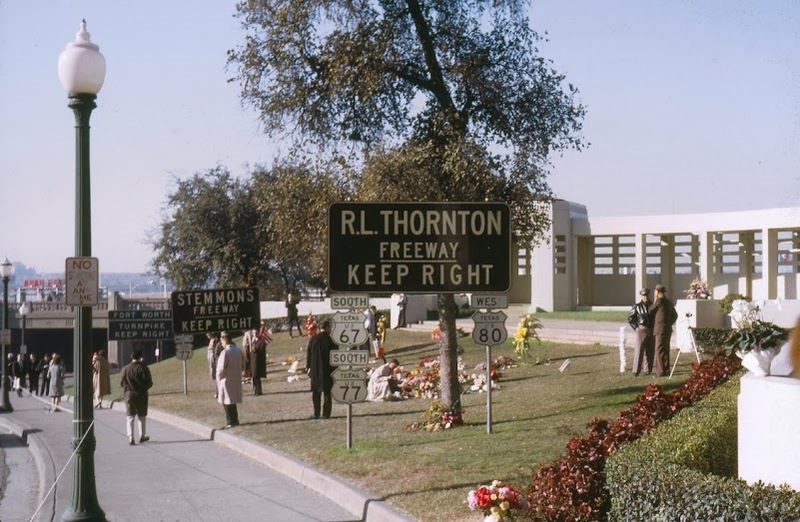 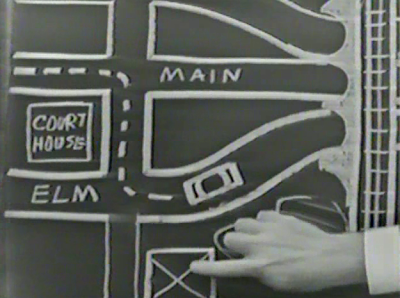 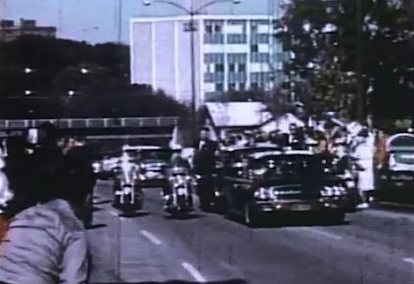 through the streets of Dallas, Texas, on 11/22/63. 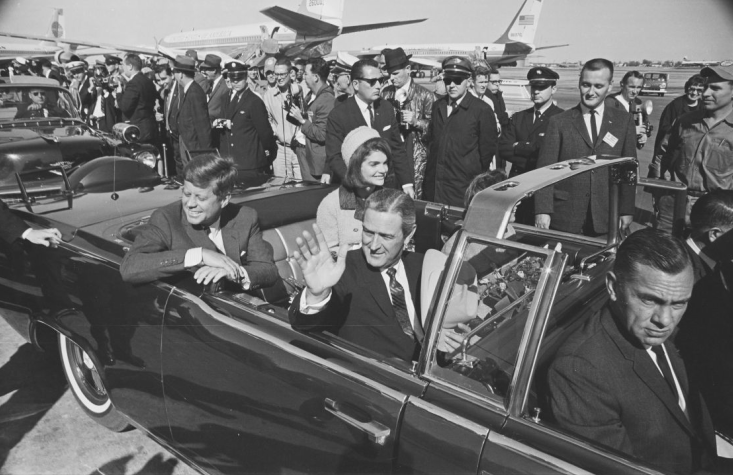 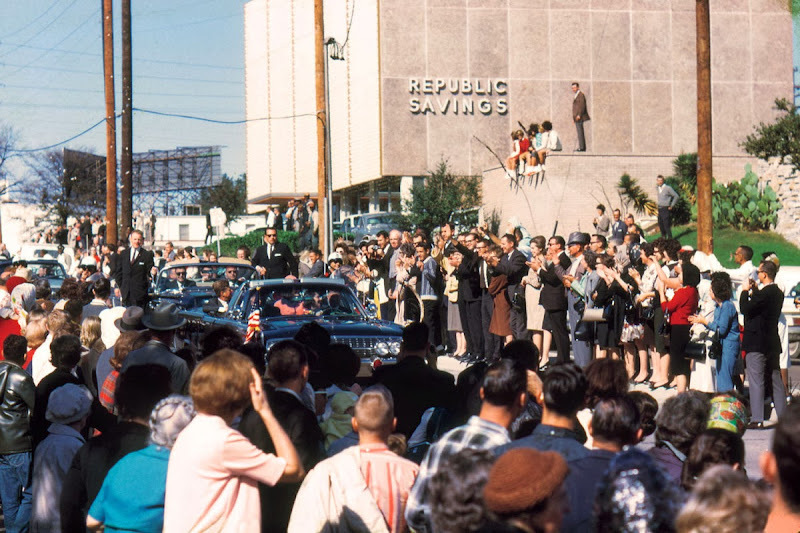 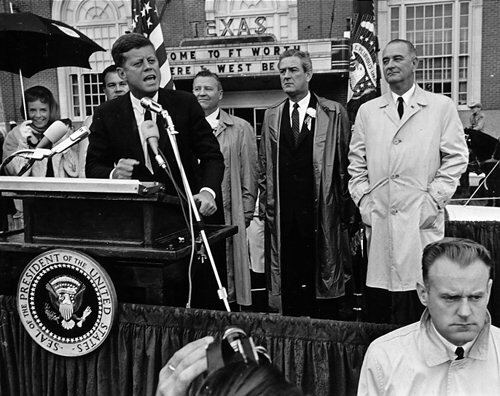 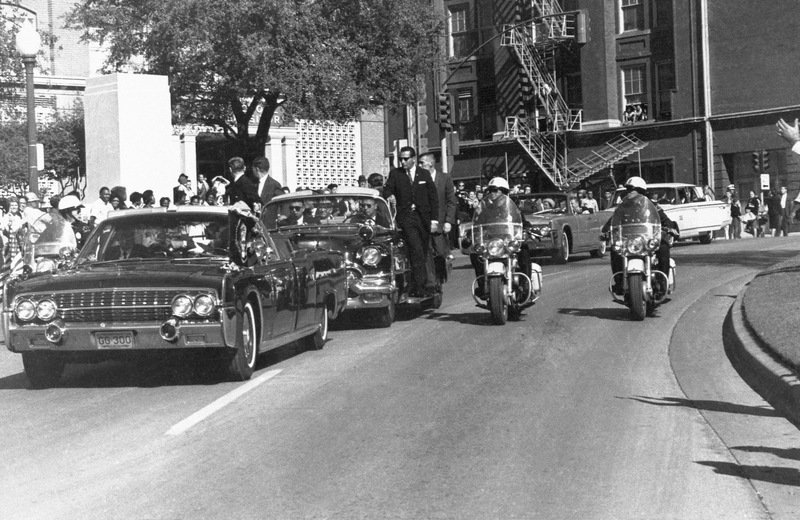 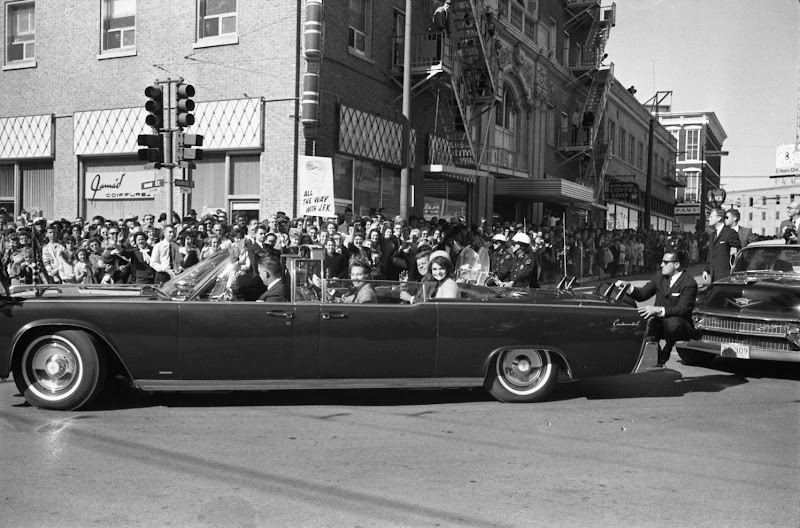 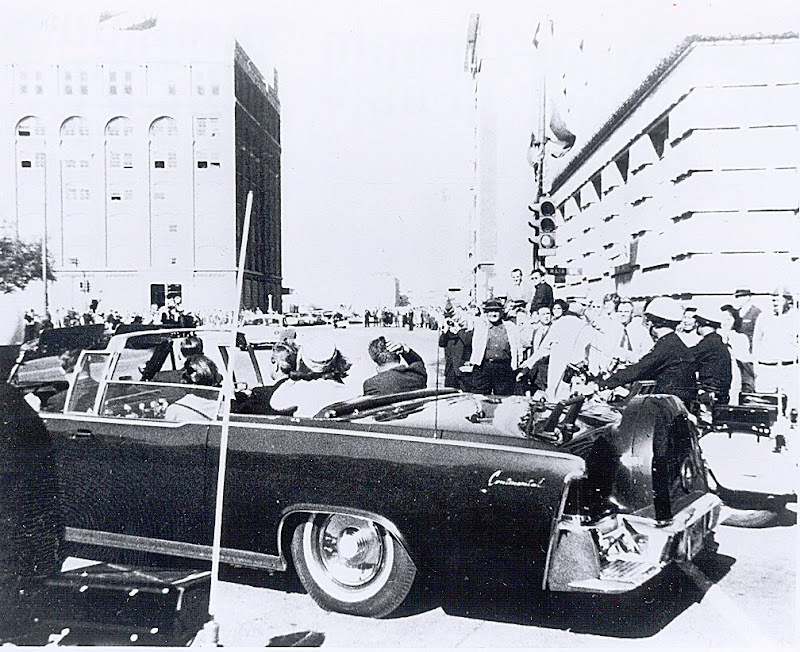 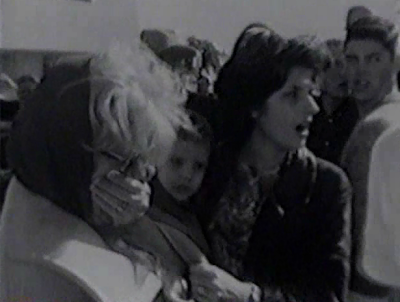 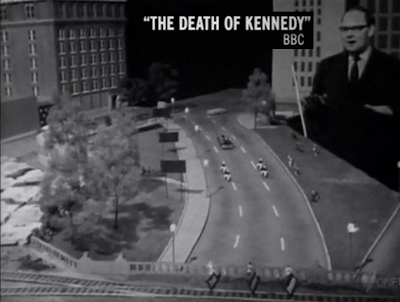 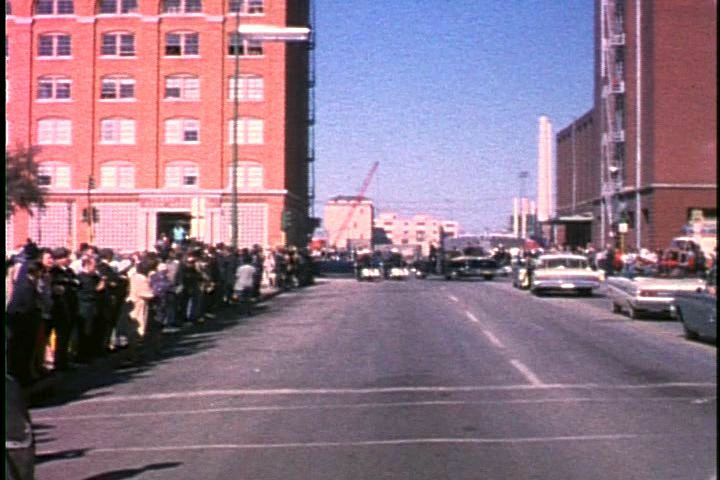 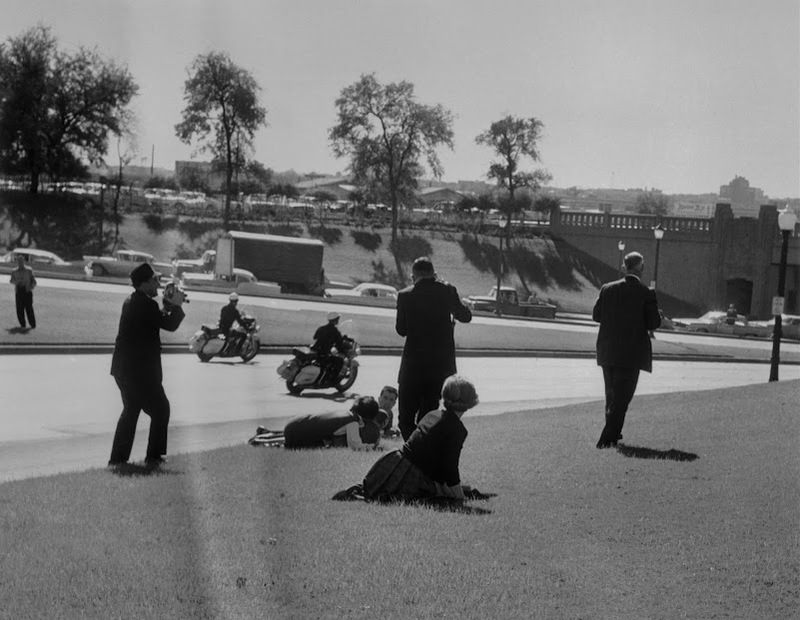 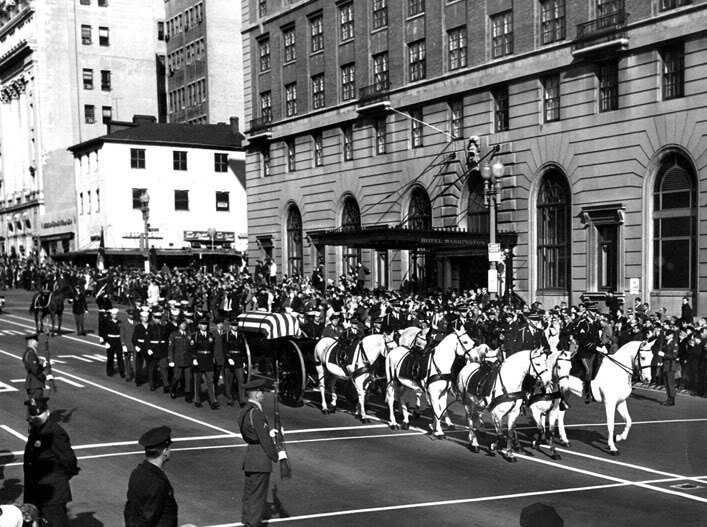 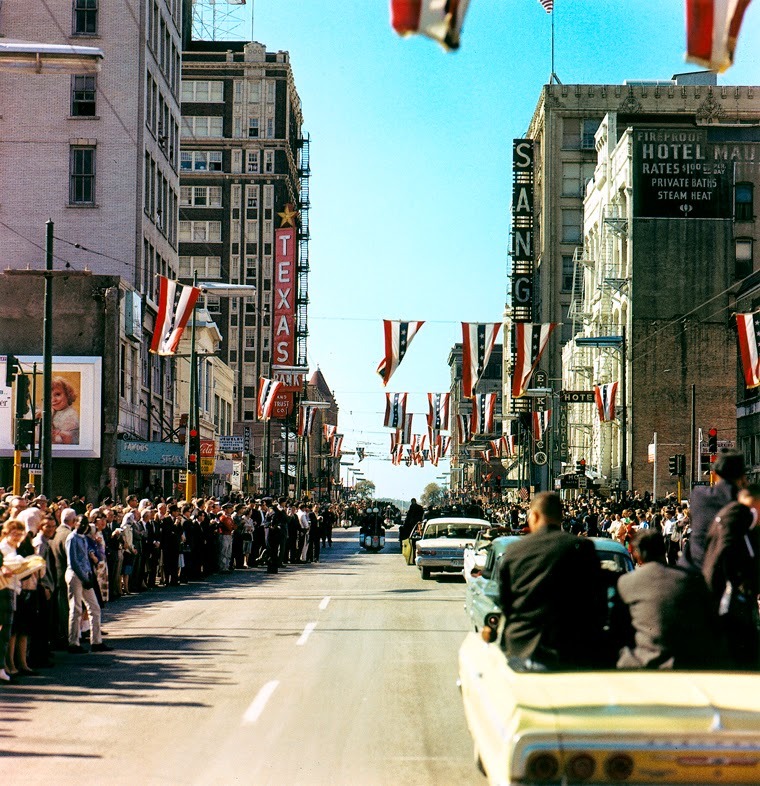 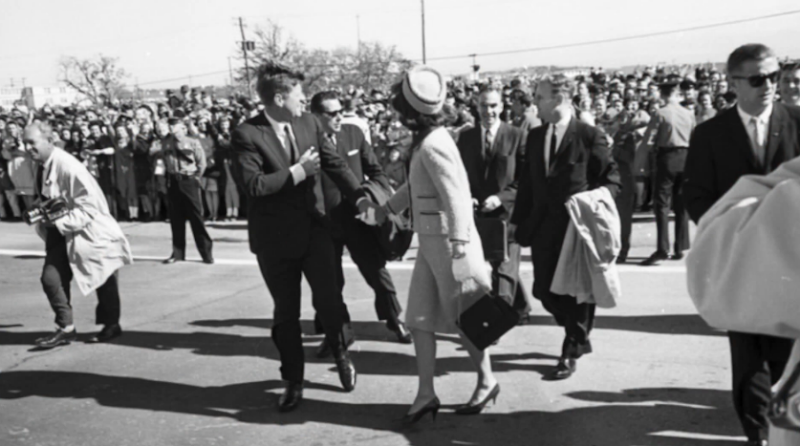 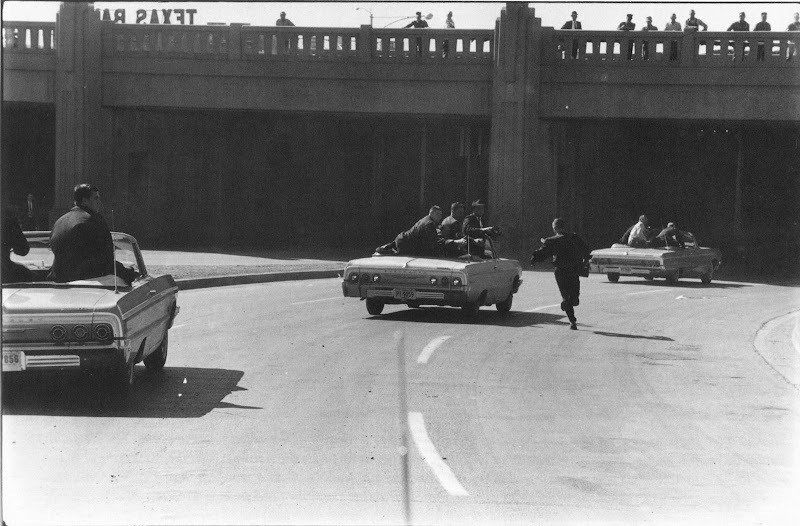 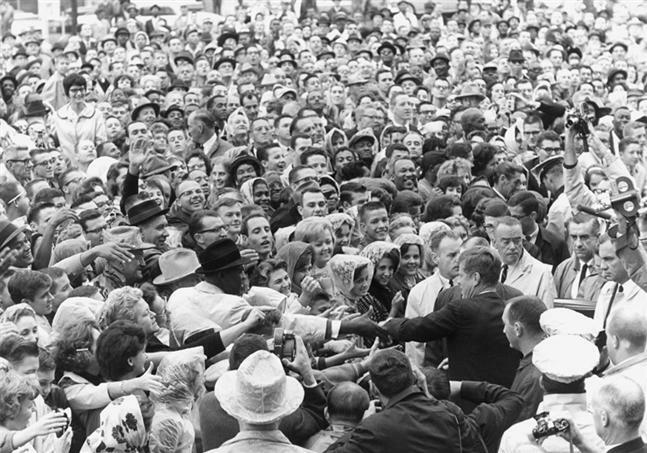 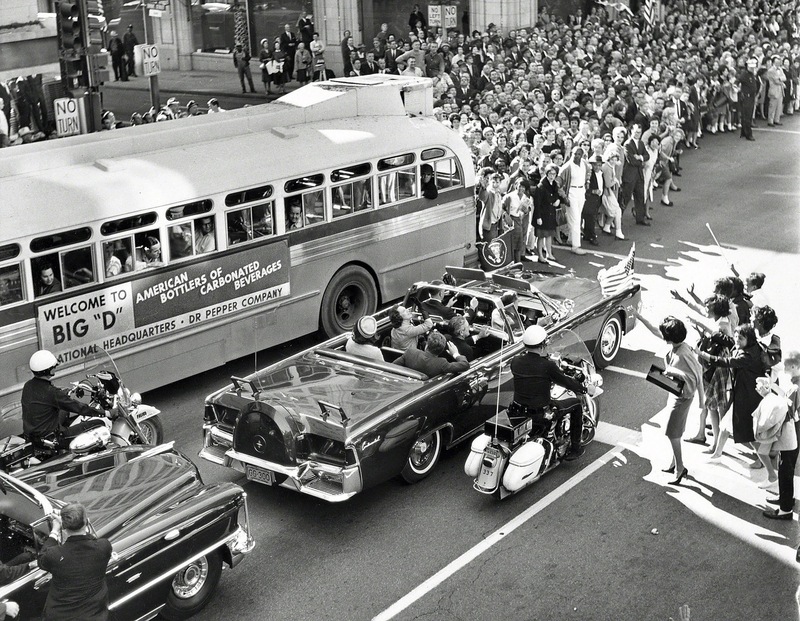 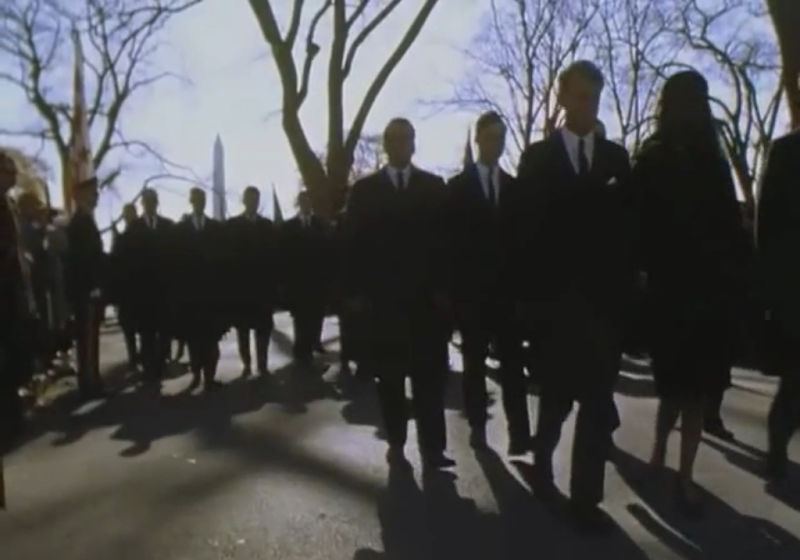 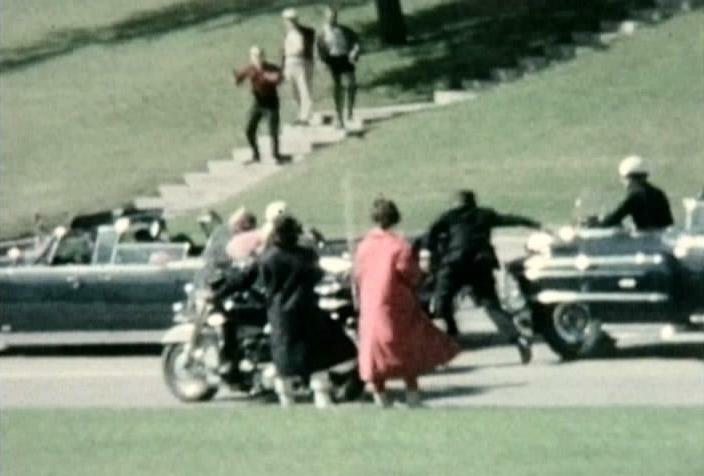 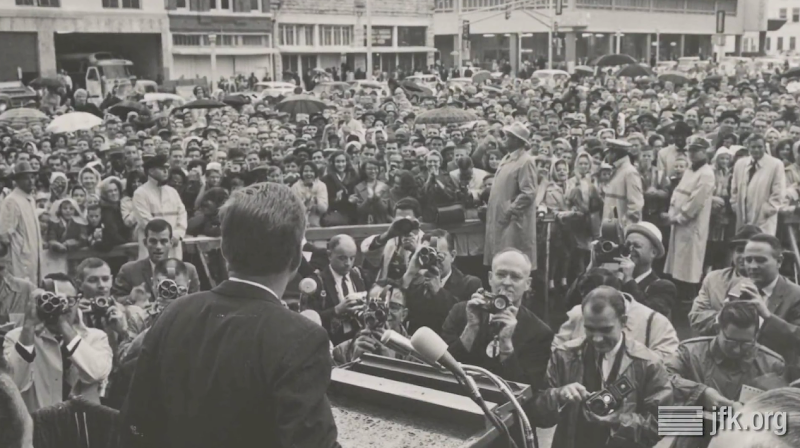 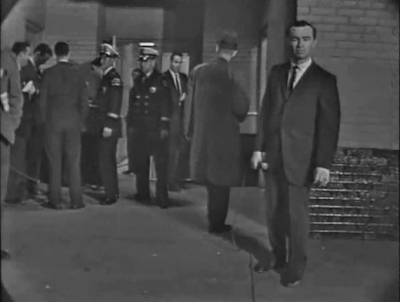 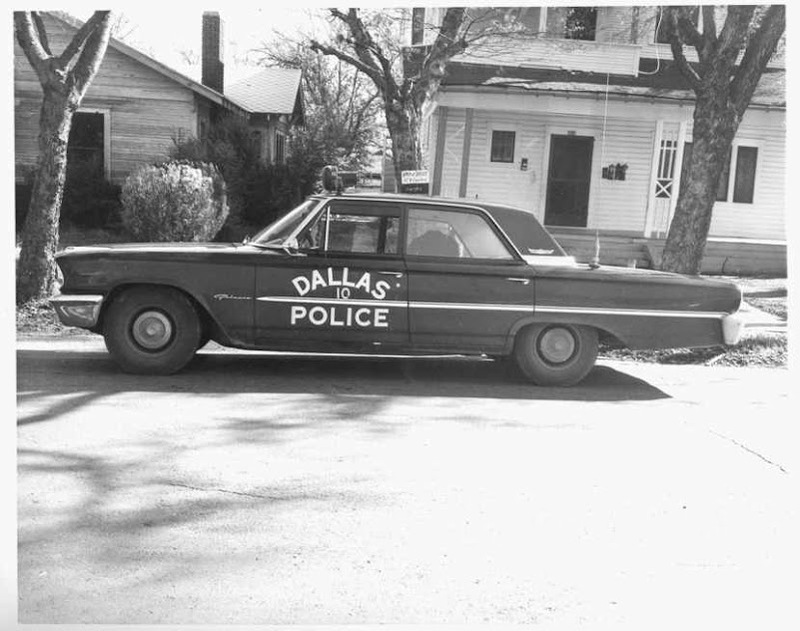 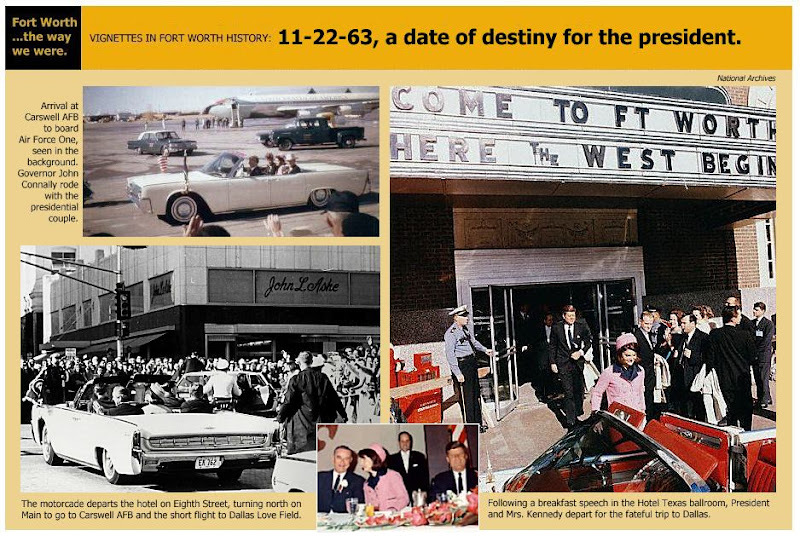 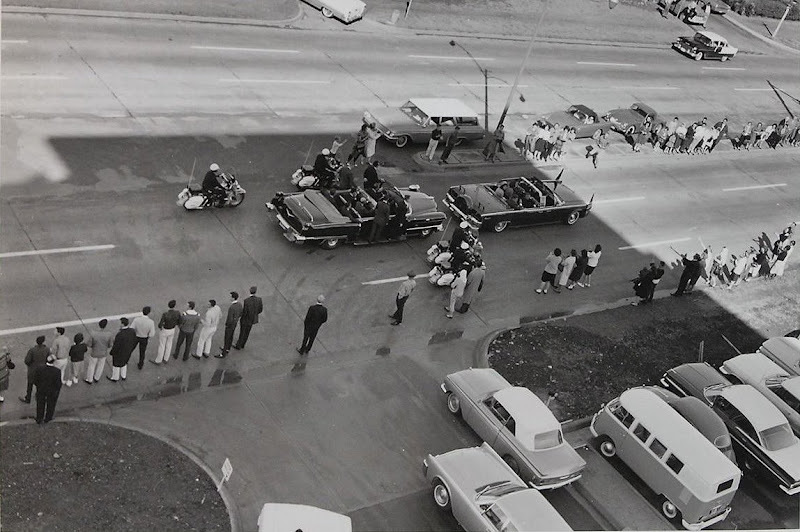 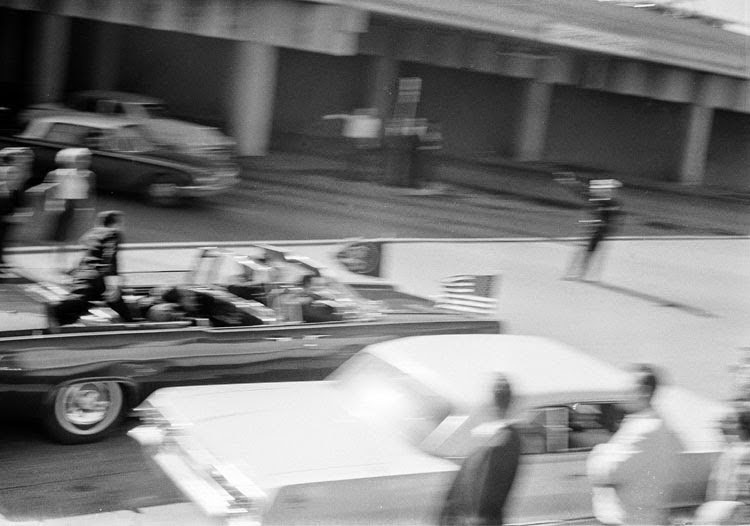 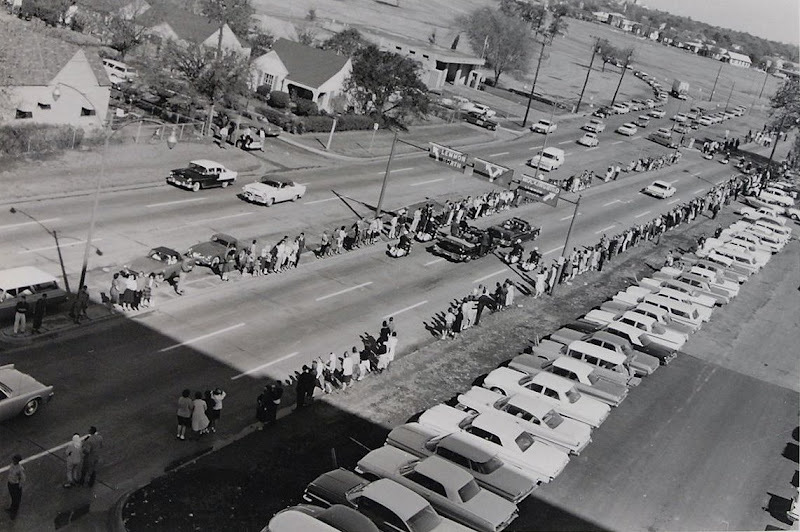 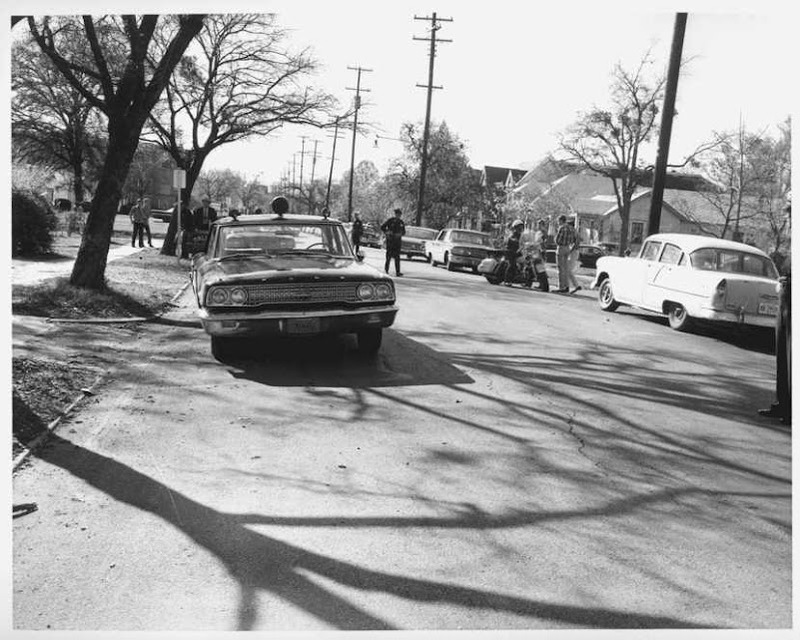 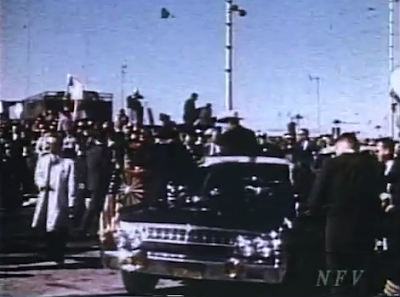 Dallas on 11/22/63, approximately 3 minutes prior to the assassination. 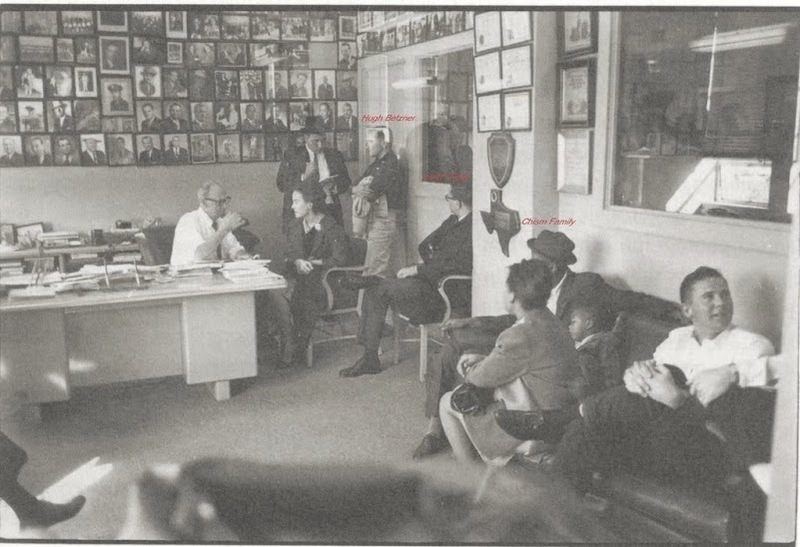 This is another picture that's not seen too often. 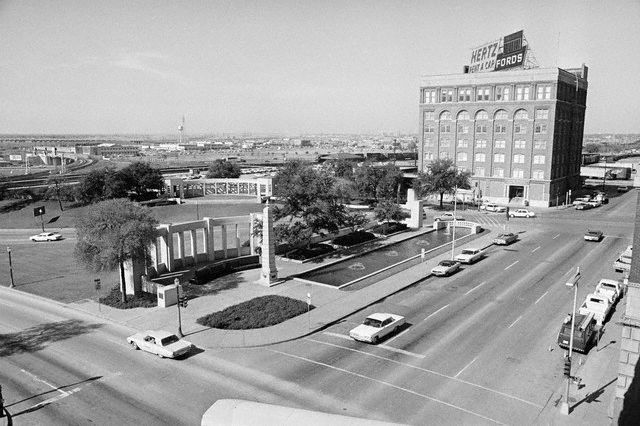 the Main & Akard Street intersection. 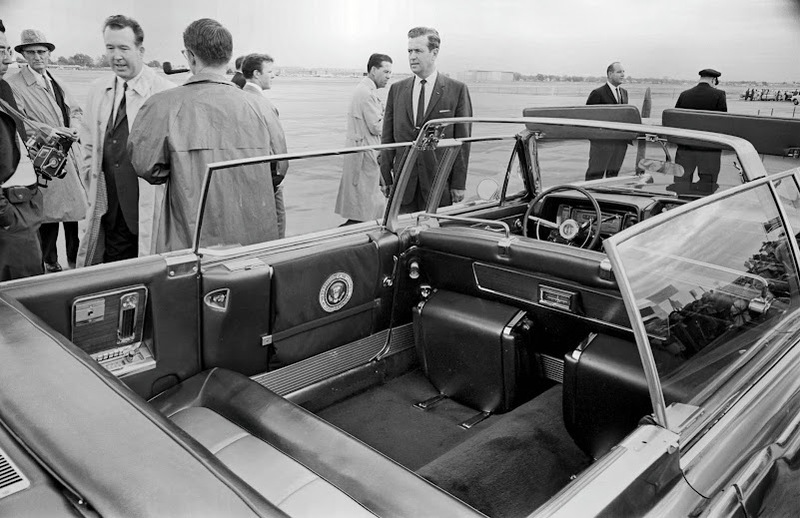 Four more pictures of the President's car in Dallas. 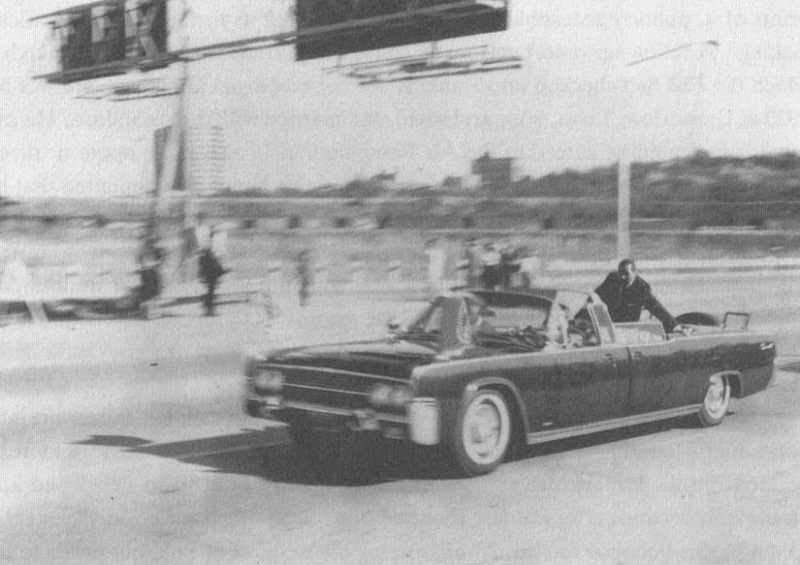 before the assassination. 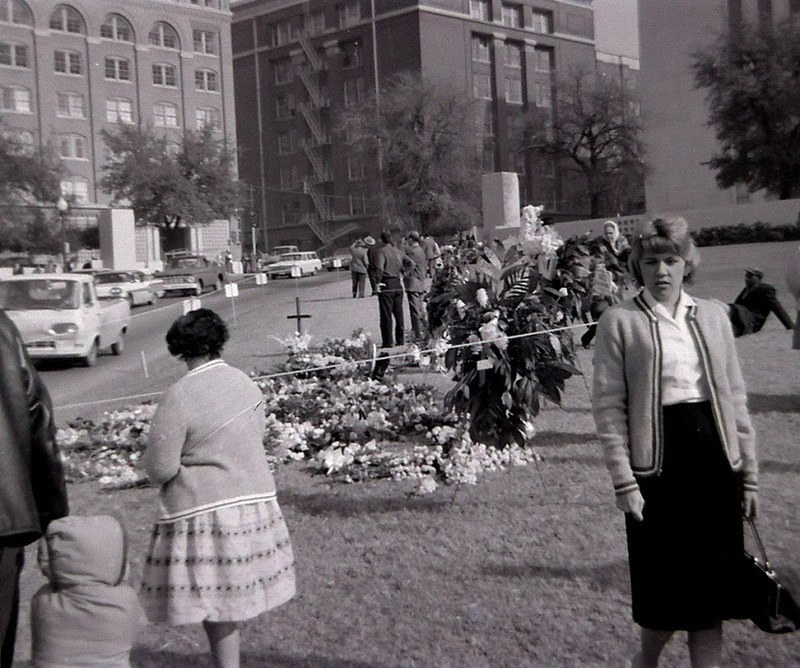 Dealey Plaza looms in the far background. 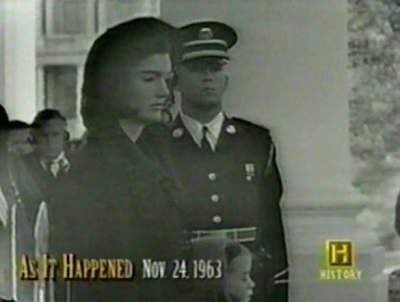 encountered on November 22, 1963. 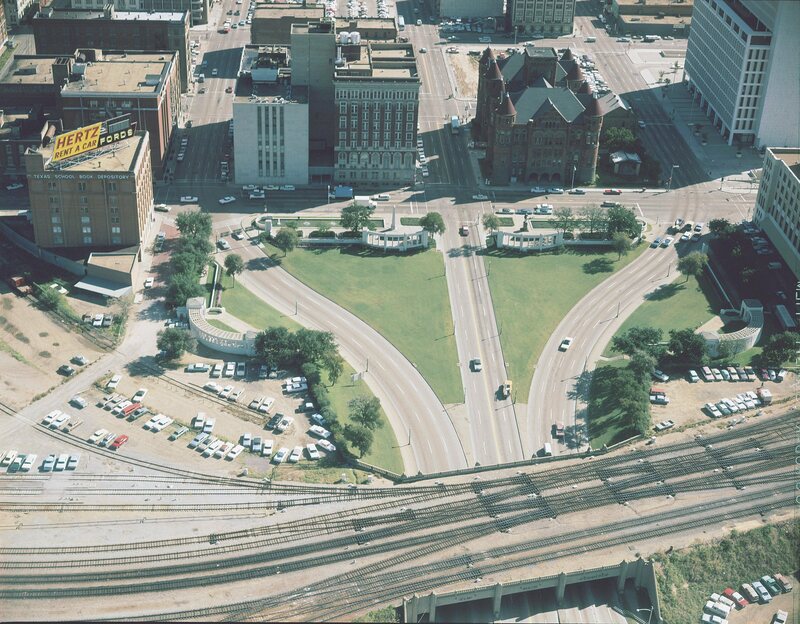 HERE is a bigger view. 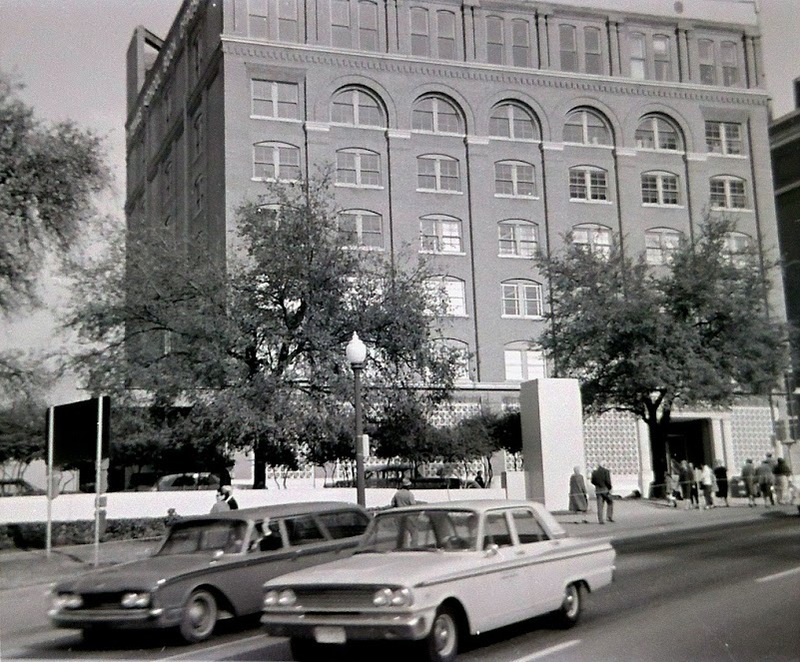 just a few blocks east of Dealey Plaza. 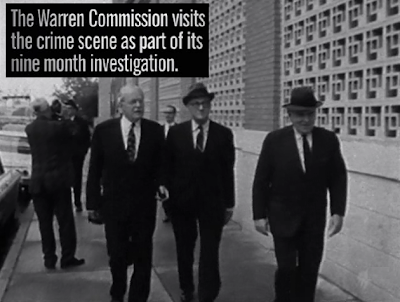 Watch the Jefferies Film HERE. 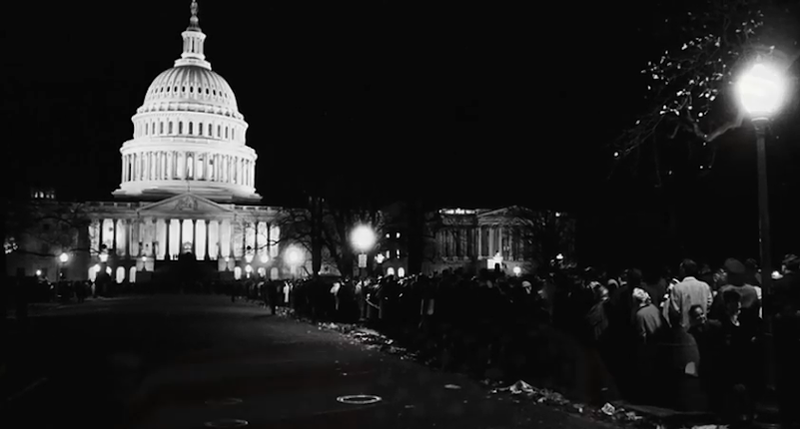 motorcade, which was discovered for the first time in early November 2013. 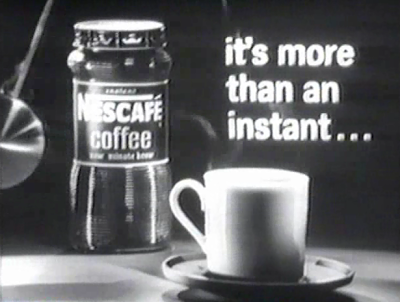 Watch Mr. Leche's film HERE. 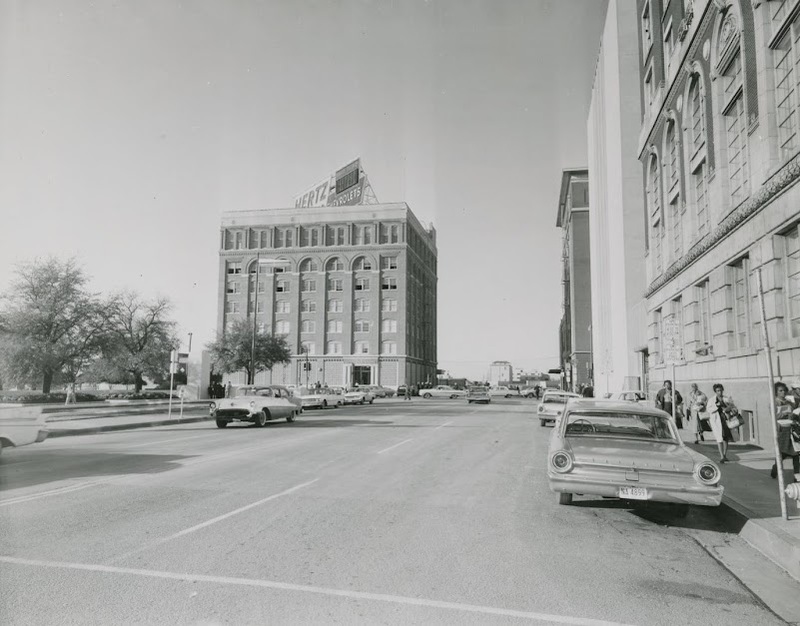 of the building on the left. 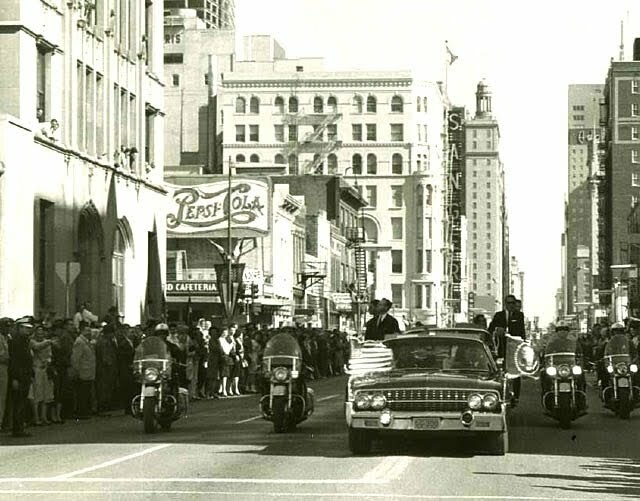 limousine rounds the corner from Main St. to Houston St. 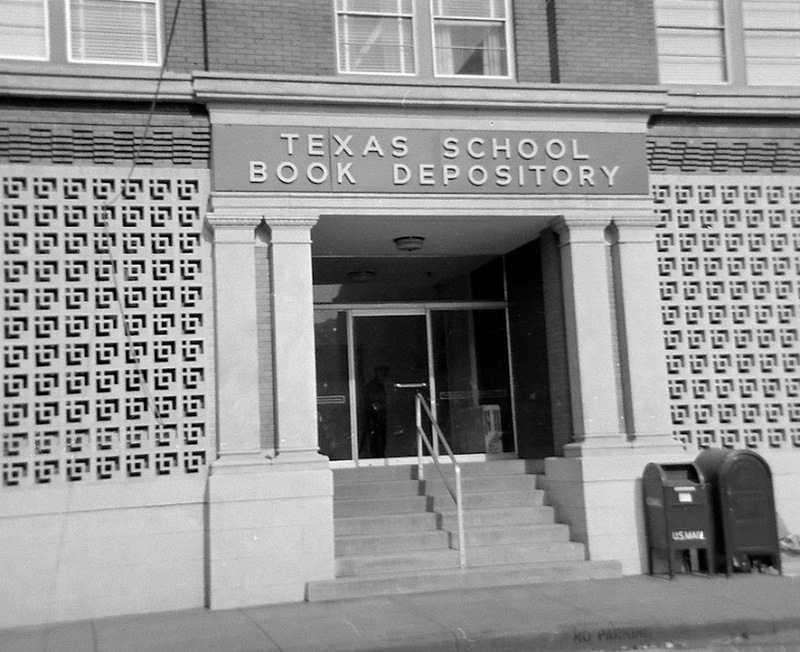 Depository is just barely visible in this rather bleached-out photograph. 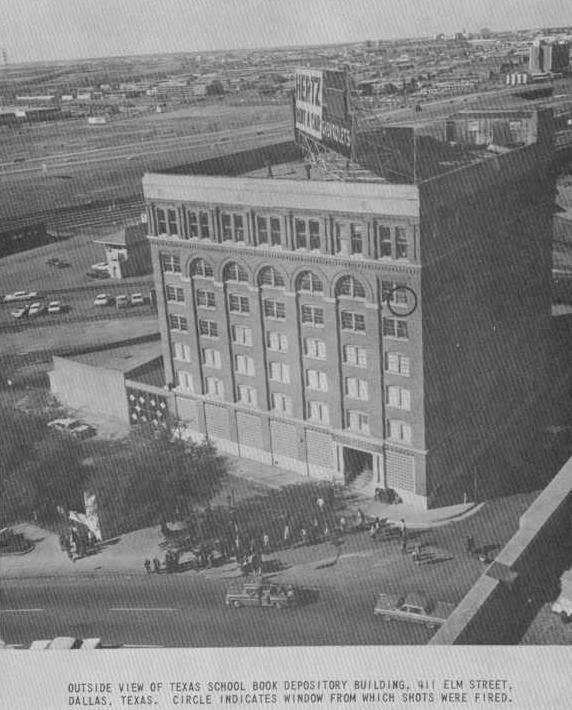 is at the very top of the picture, on the far right-hand side of the building. 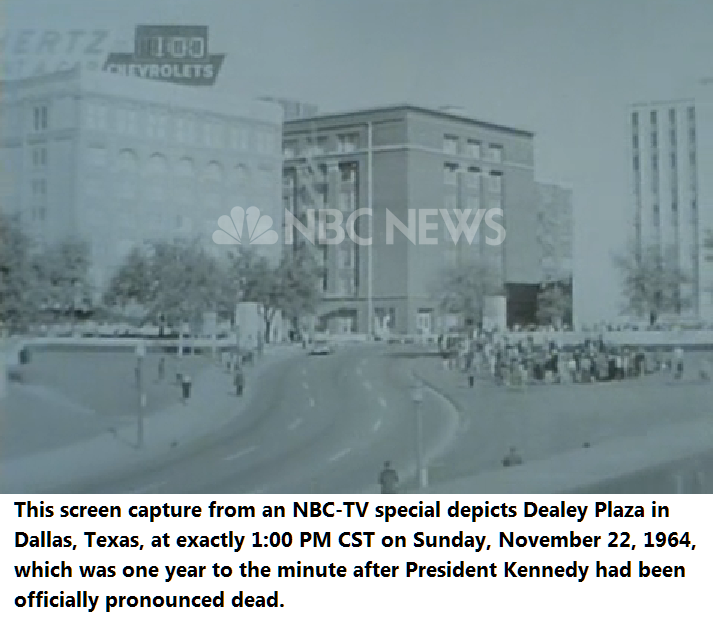 presented in 1978 as virtual proof of a conspiracy in JFK's murder). 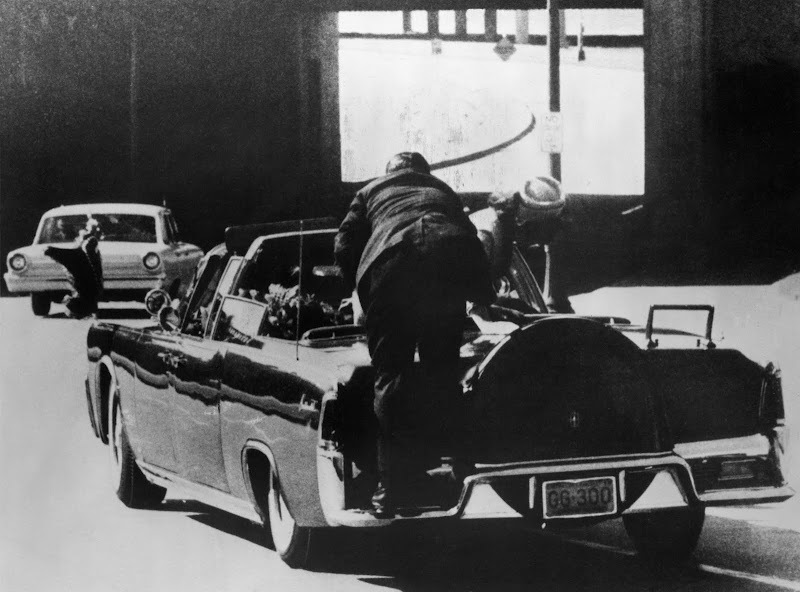 More on the importance of this Hughes image can be found HERE. 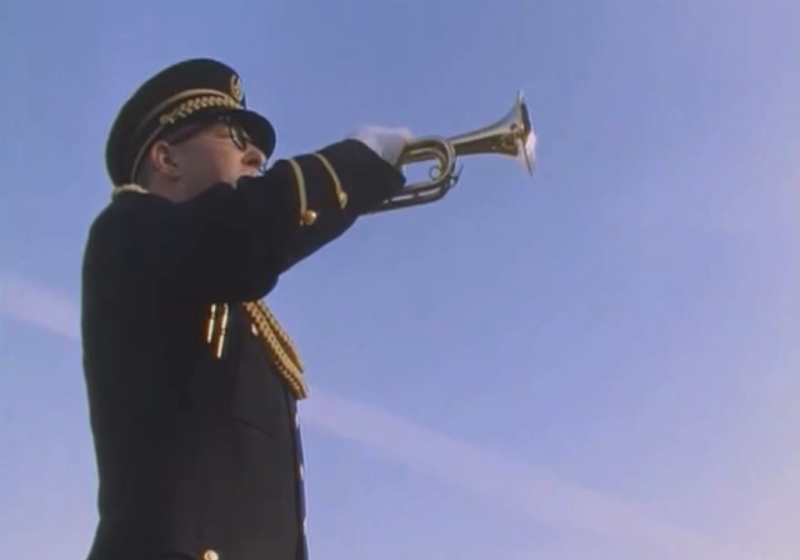 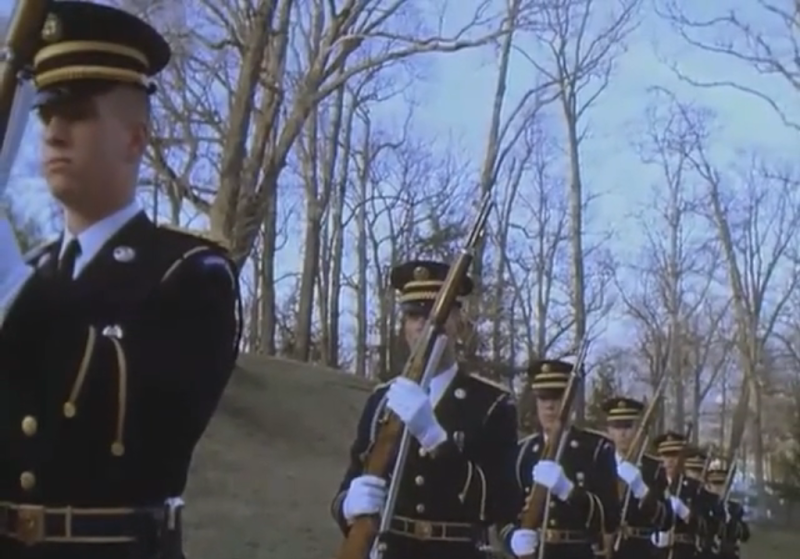 To see the entire Hughes Film, go HERE. 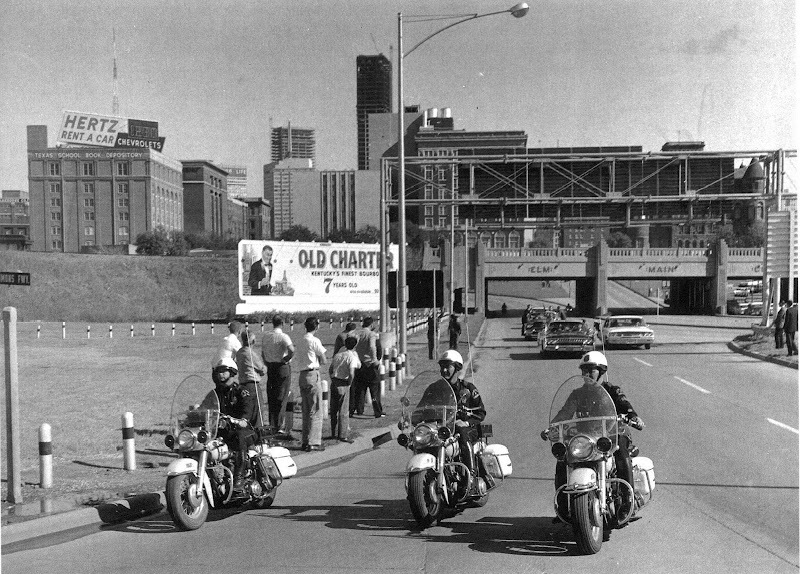 To see an even larger version of the Croft photo, CLICK HERE. 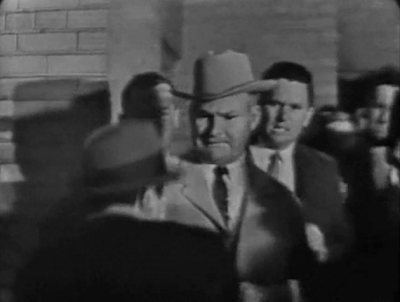 CLICK HERE for a bigger version of the Bronson picture. 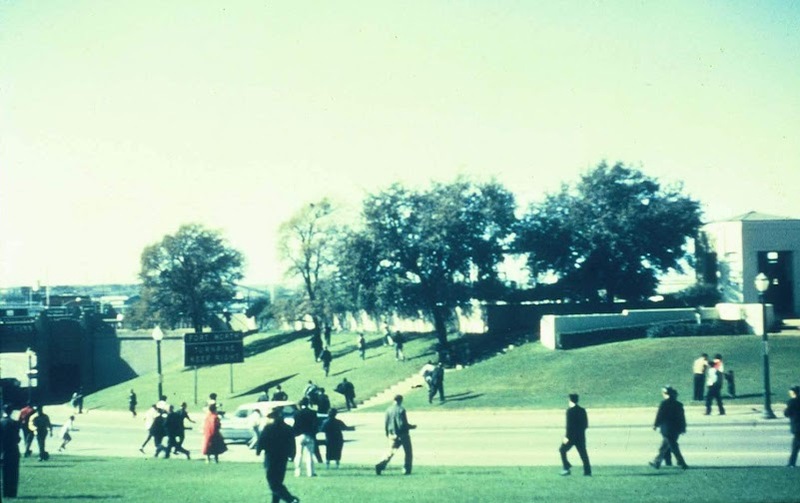 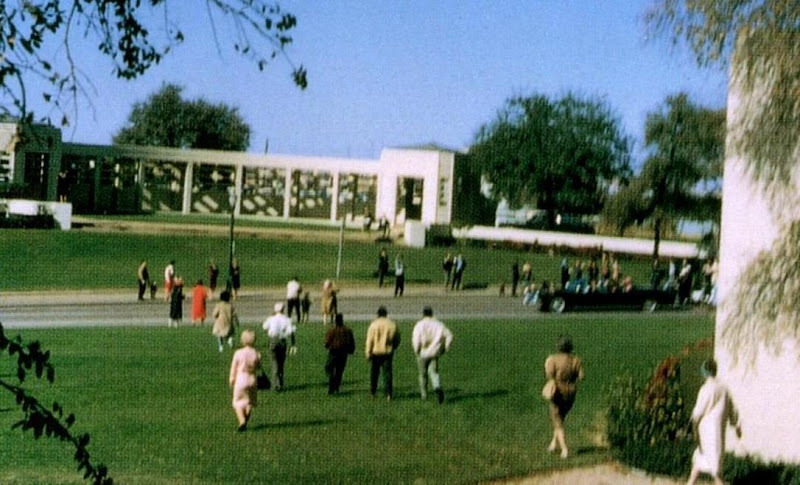 taken on 11/22/63, the Polaroid snapshot captured by Mary Moorman. 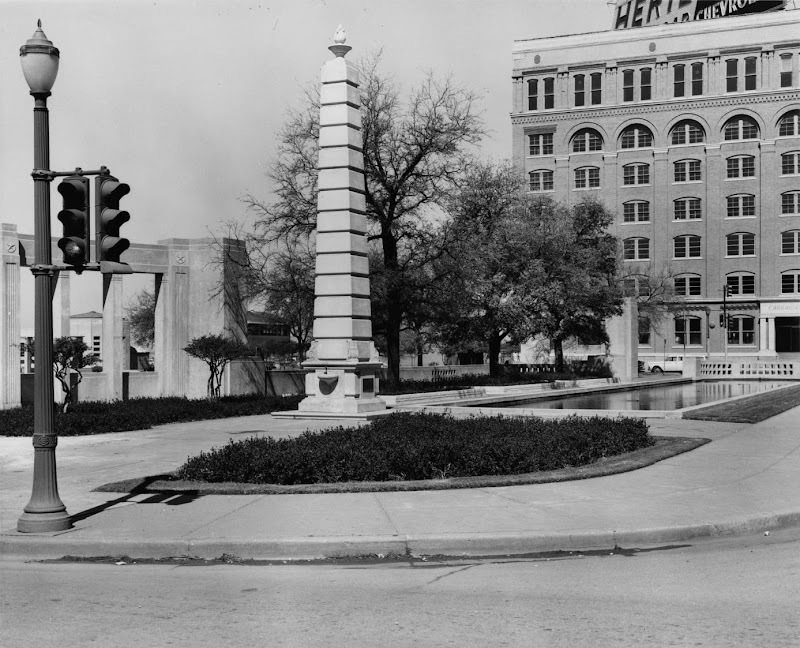 atop the concrete pedestal on the right-hand side of the photo. 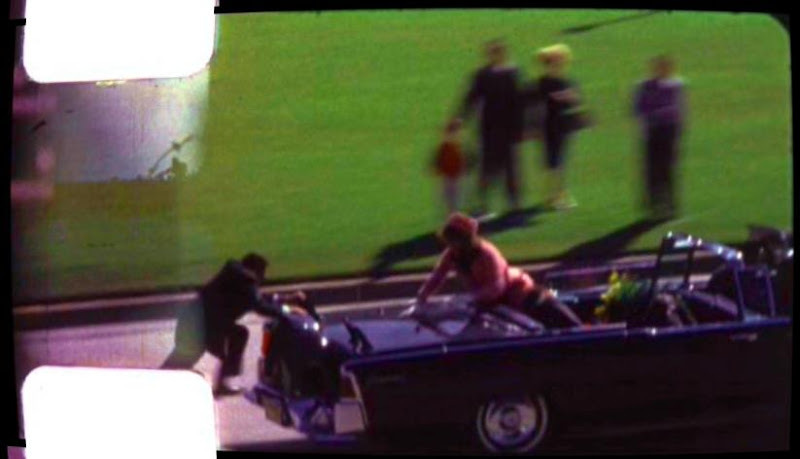 who handled it after Moorman gave the picture to the FBI. 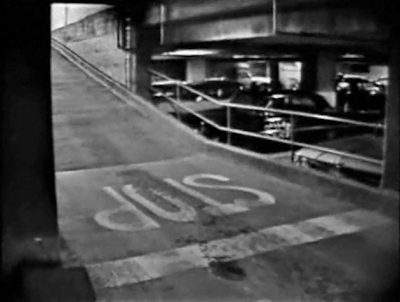 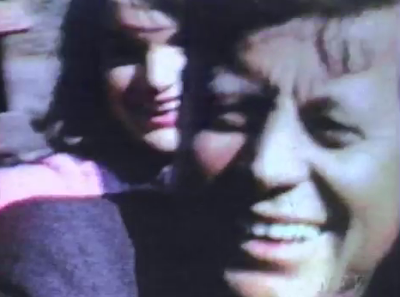 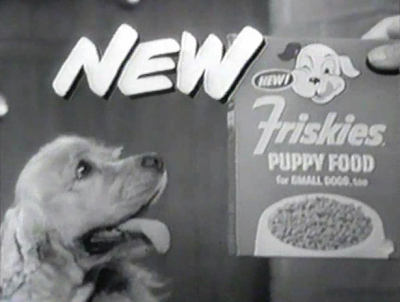 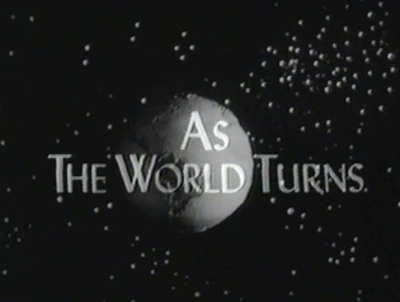 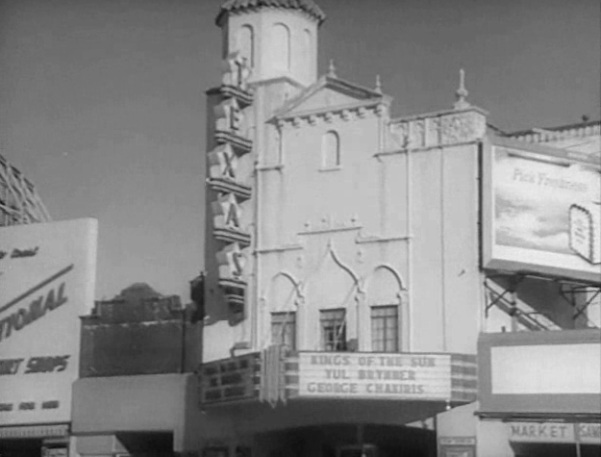 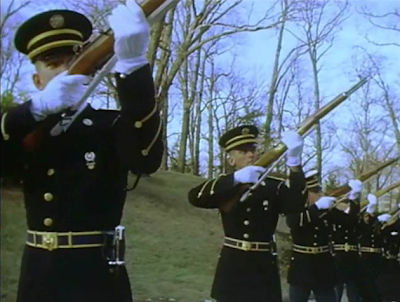 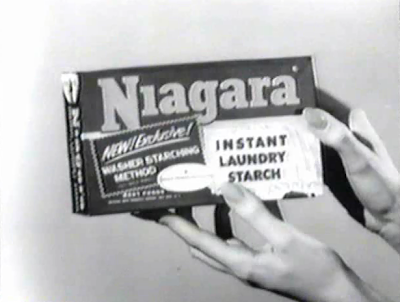 Frame from Marie Muchmore's film. 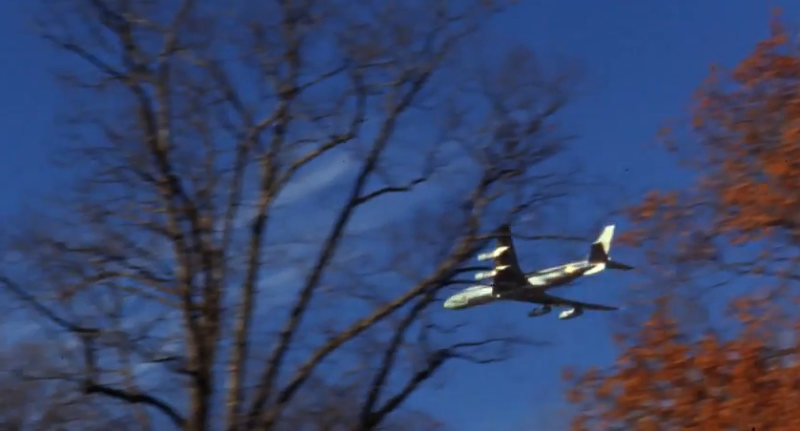 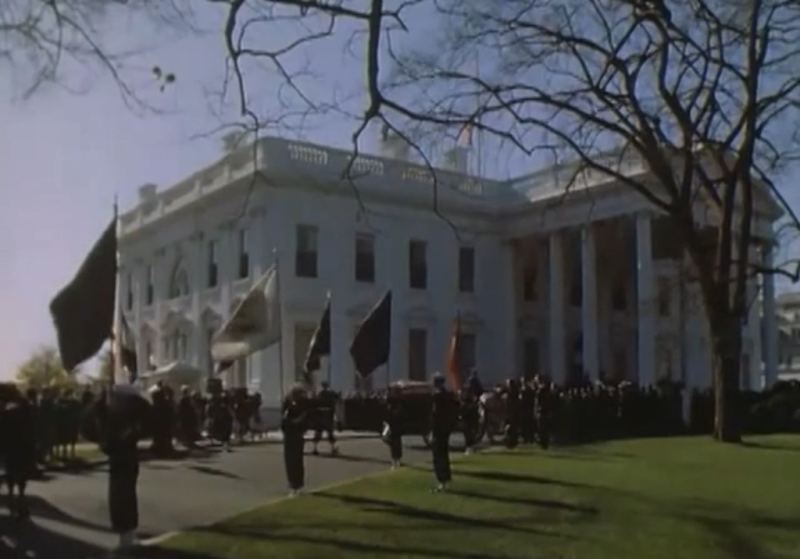 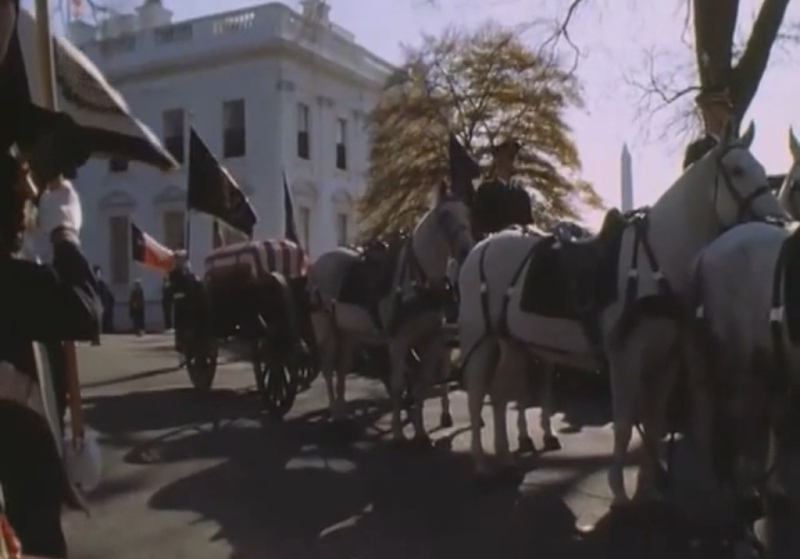 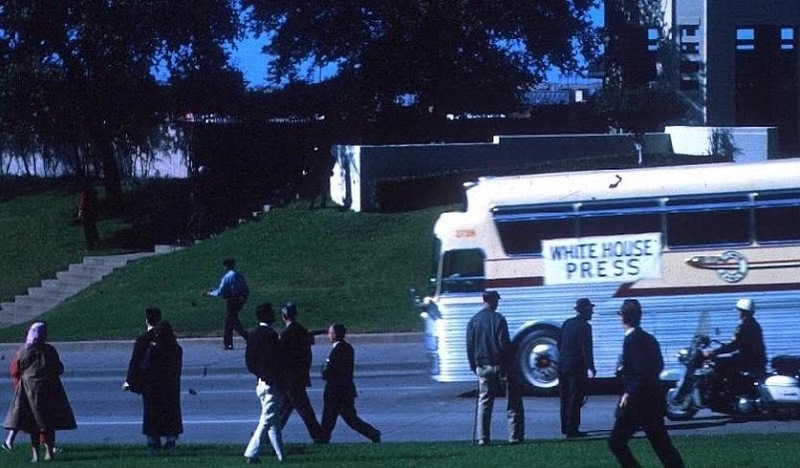 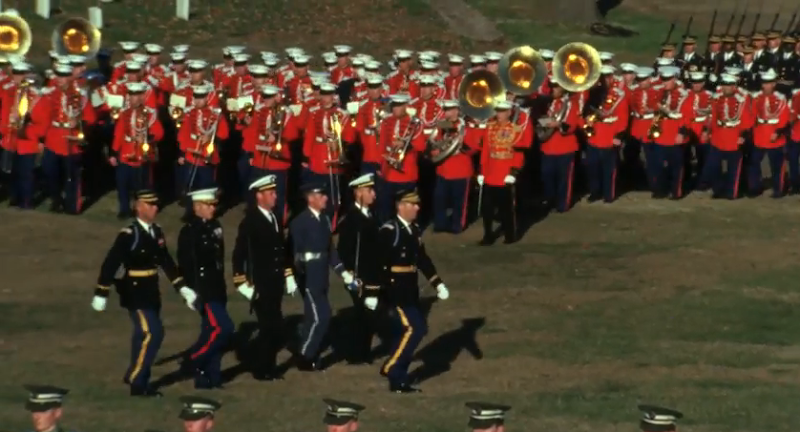 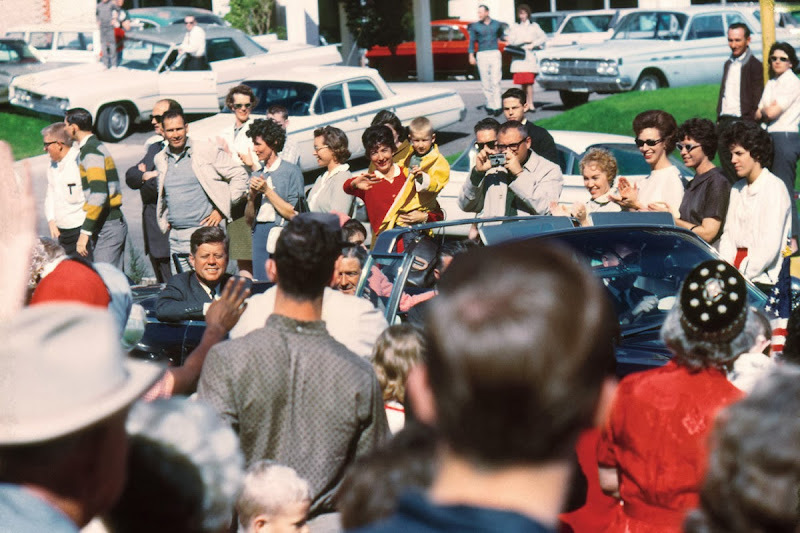 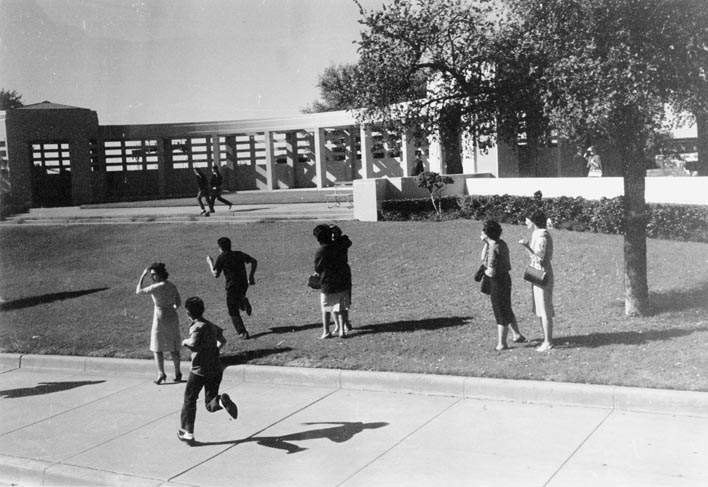 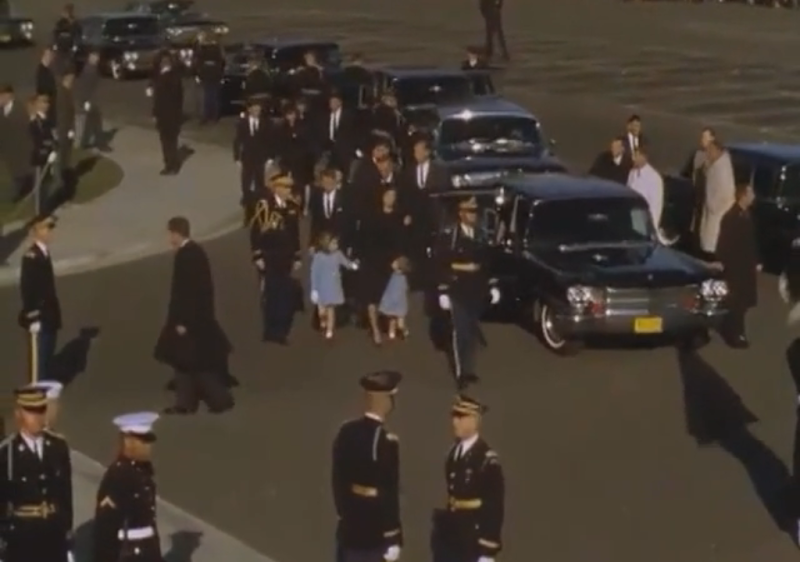 Clint Hill runs toward the President's car. 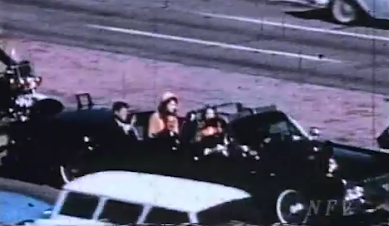 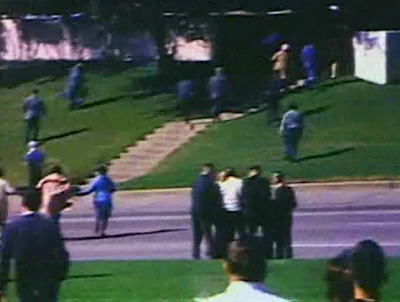 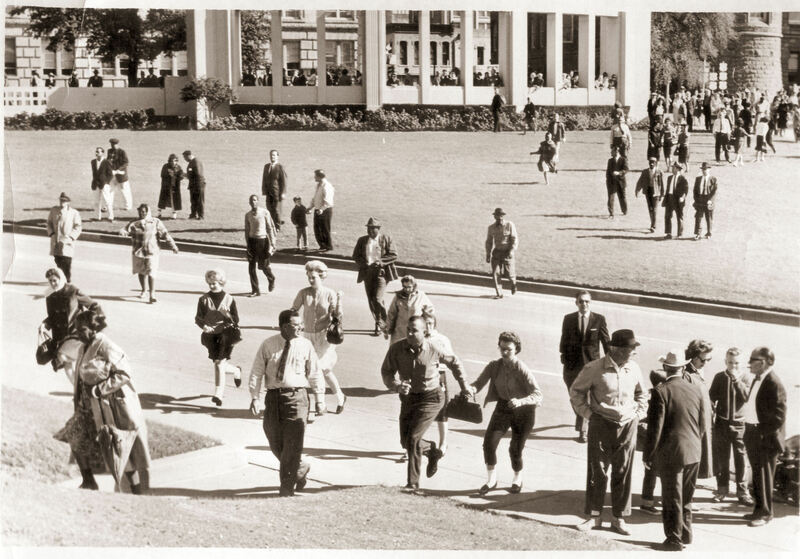 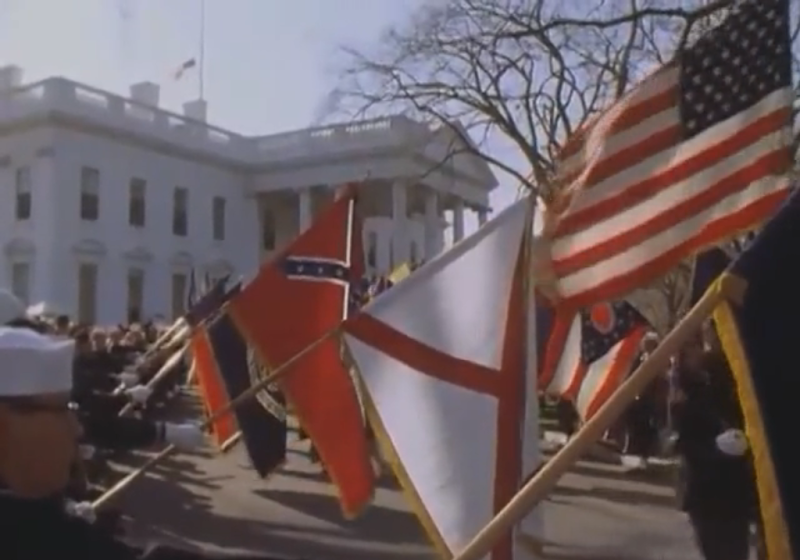 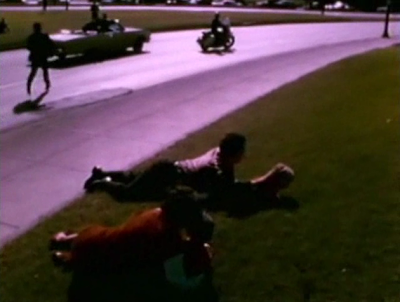 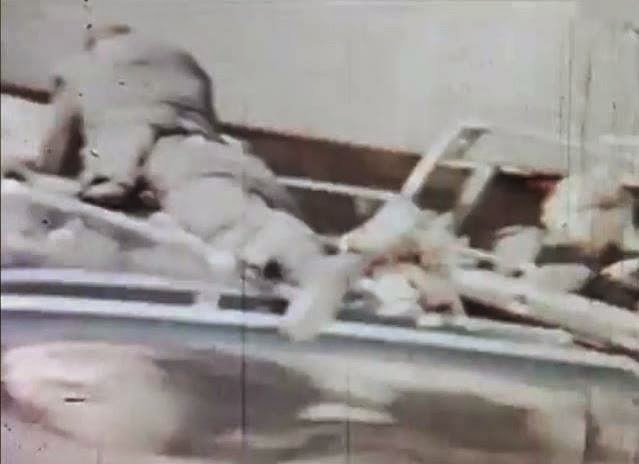 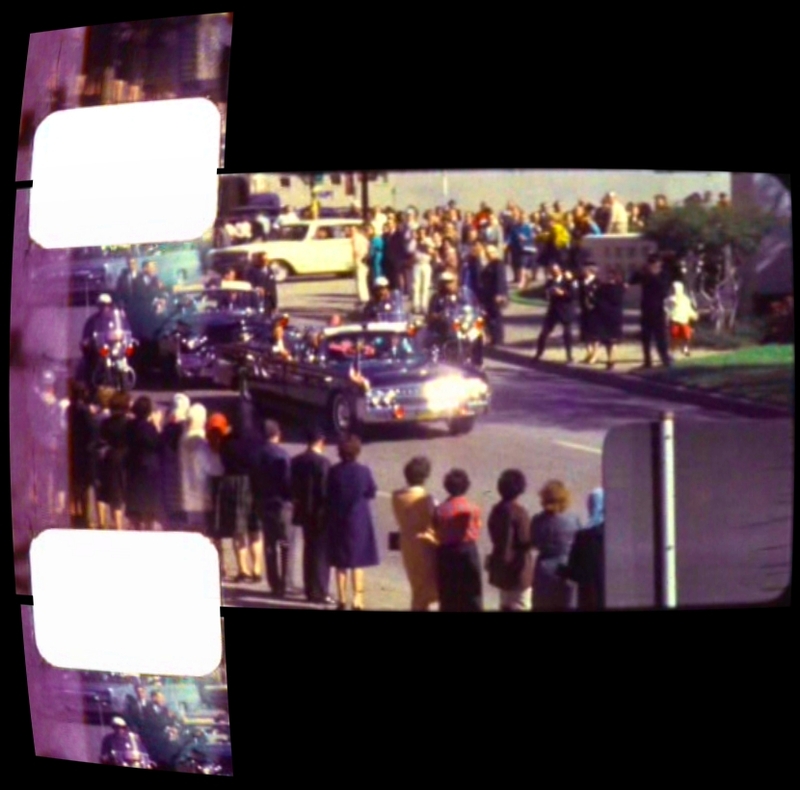 Frame 366 of the Zapruder Film. 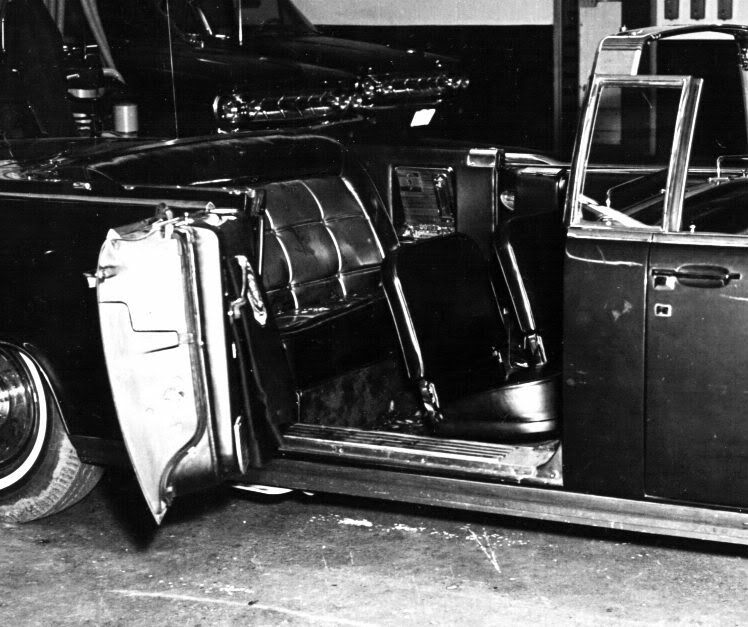 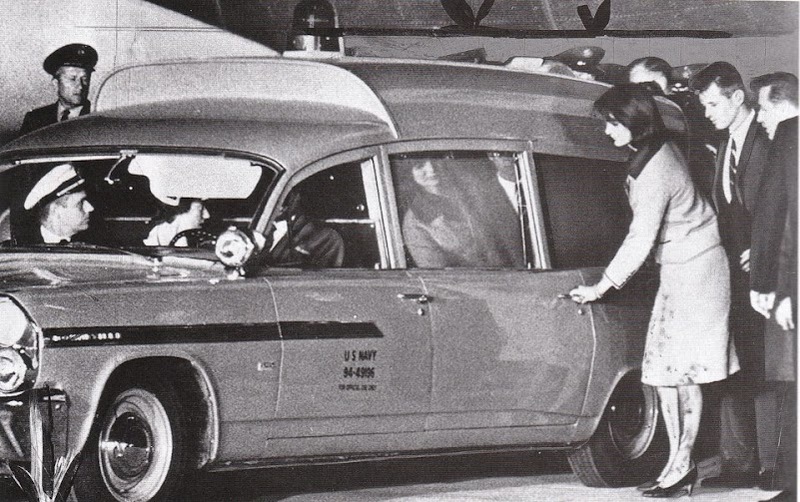 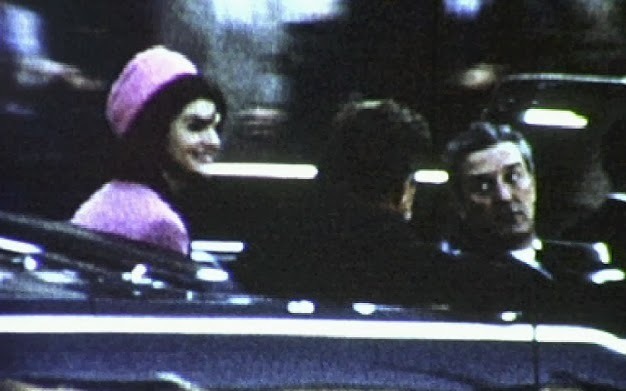 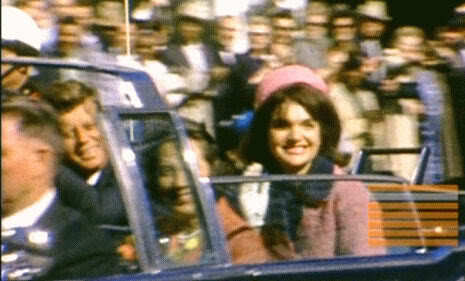 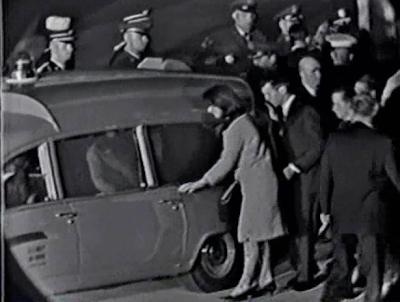 onto the back bumper of the limousine to aid Jacqueline Kennedy. 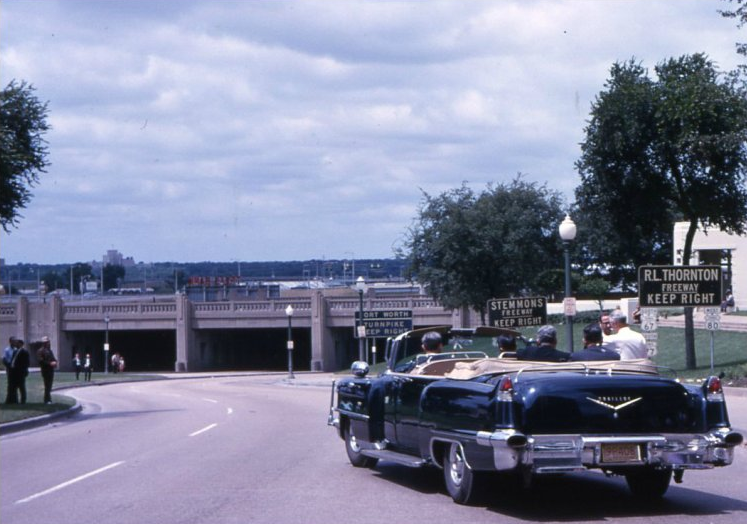 can be seen just ahead of the limo on Elm Street, brakes applied. 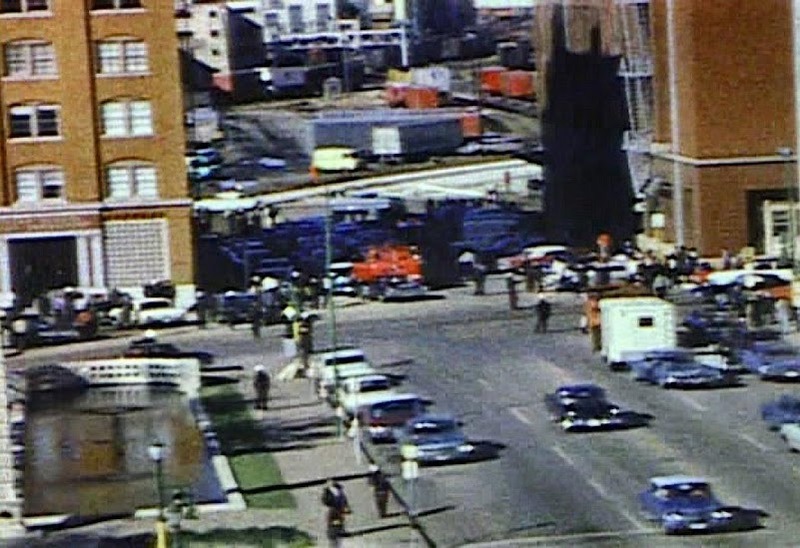 The chaotic scene on Elm Street immediately after JFK was shot. 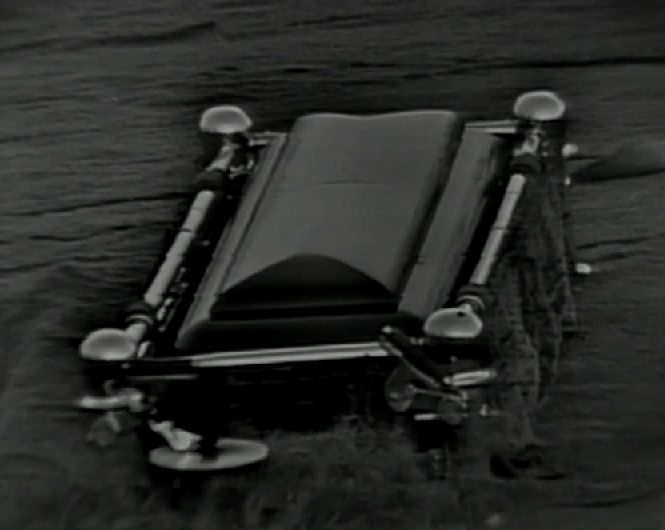 car, as the driver hits the brakes to allow him to catch up. 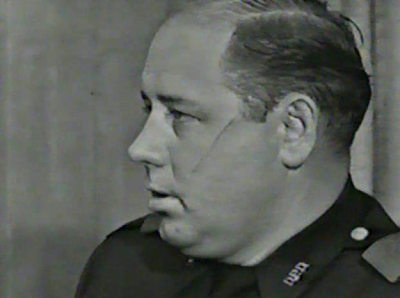 slightly injured on the cheek during the shooting. 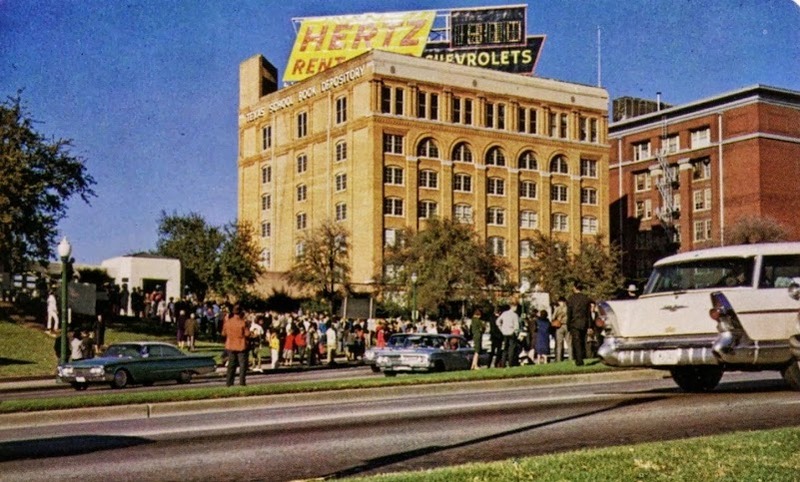 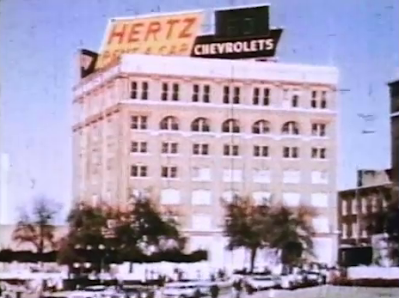 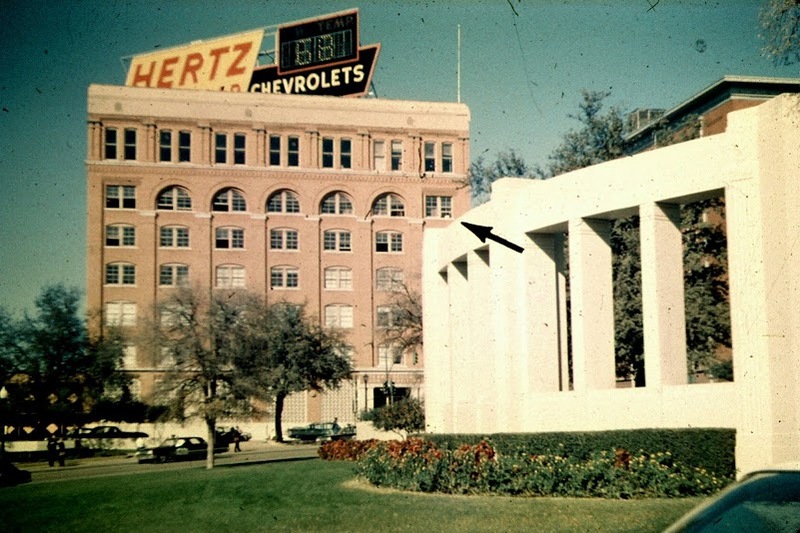 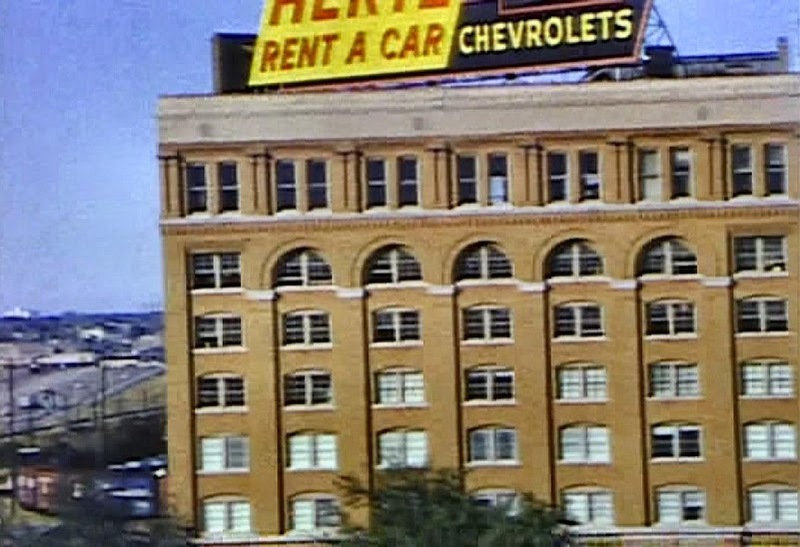 displayed on the large "Hertz" sign atop the Depository. 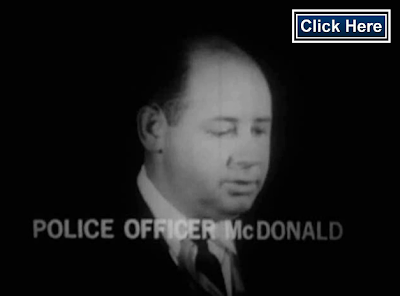 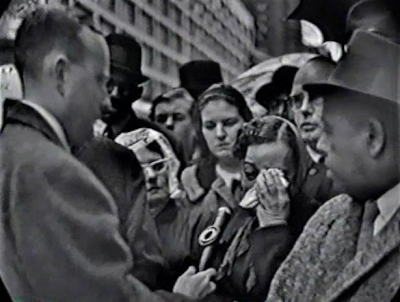 eyewitnesses Charles Brehm and Mary Moorman. 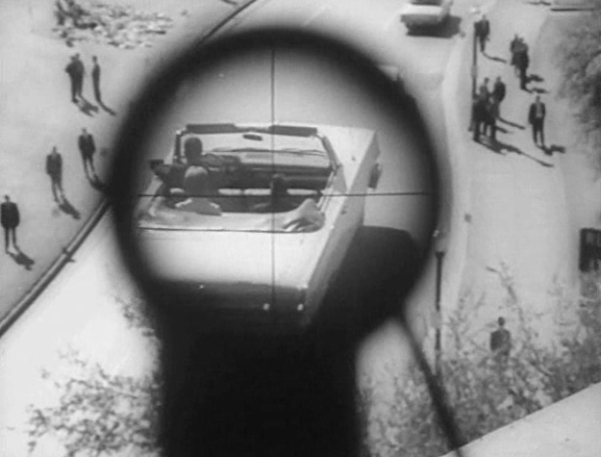 had seen the President shot and killed just a few feet in front of them. 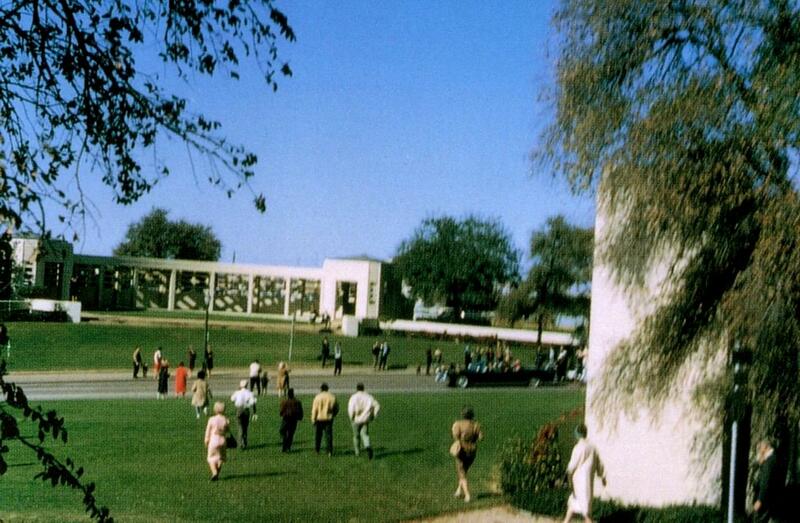 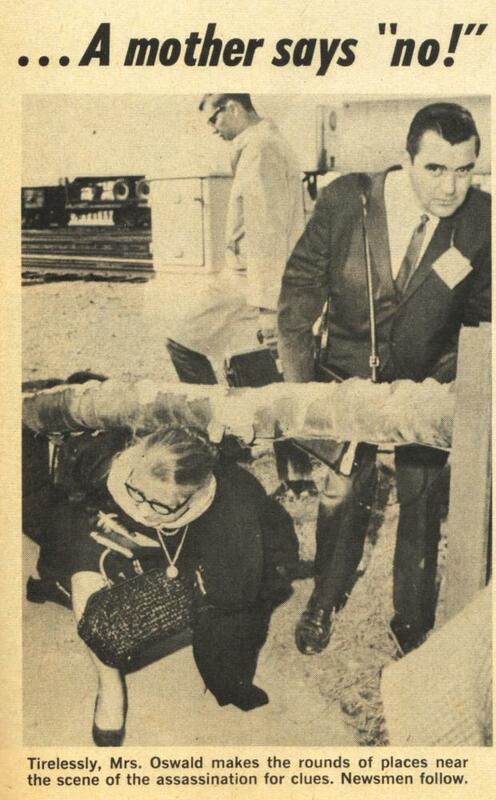 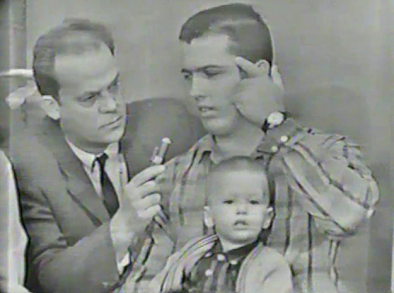 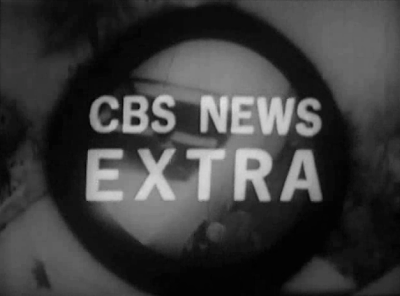 To see 130 more CBS photos from November 1963, GO HERE. 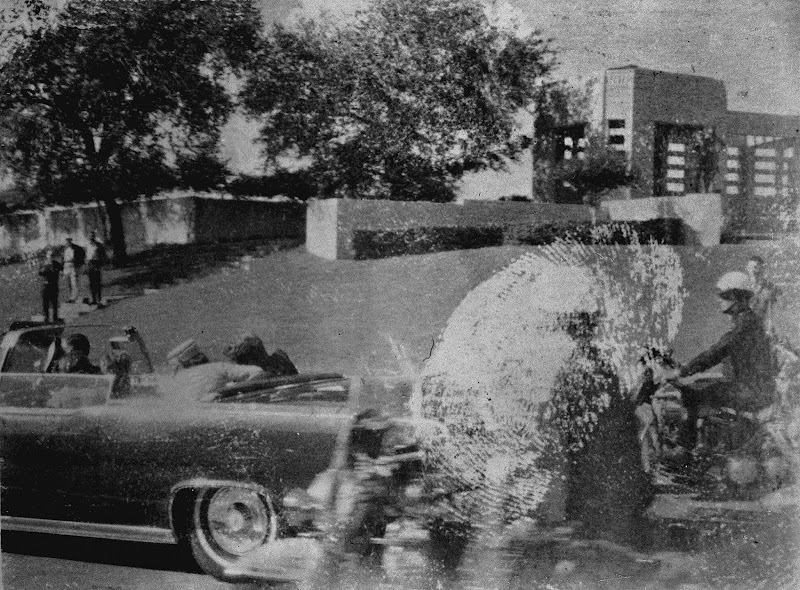 just seconds after the assassination. 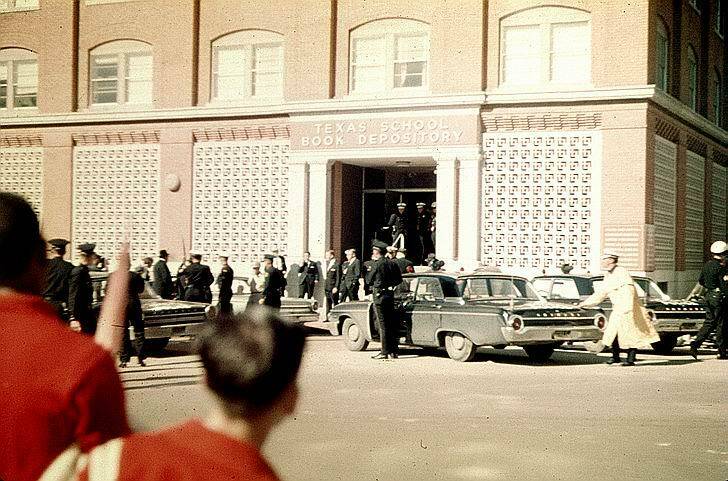 Here's a cropped color version of James Powell's picture of the Depository. 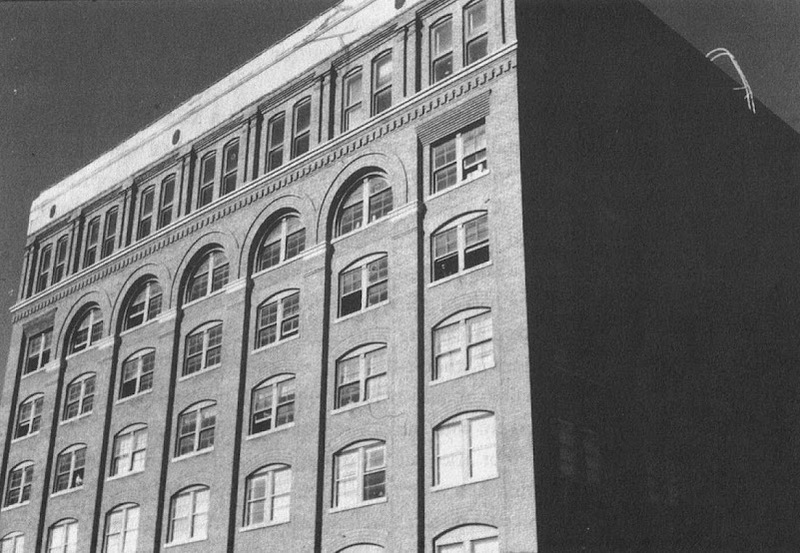 sixth floor can be seen as well. 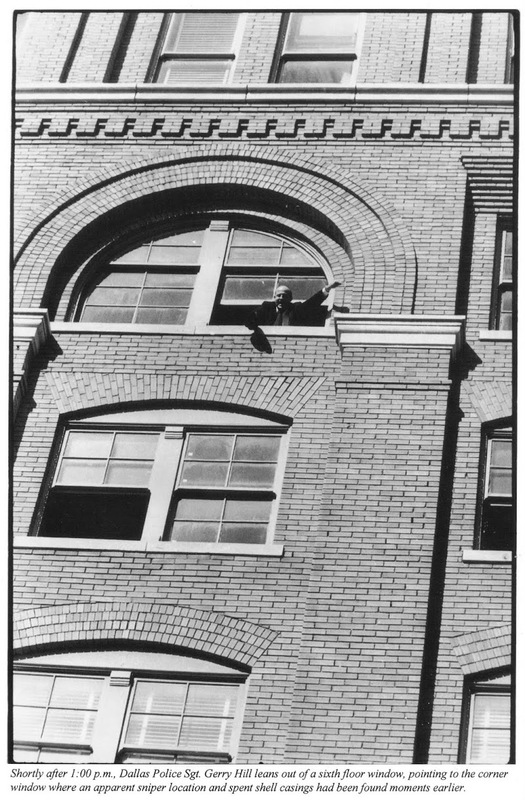 (which is the top window in this photo). 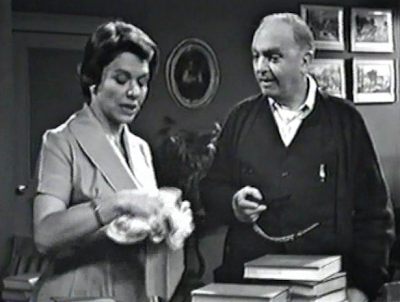 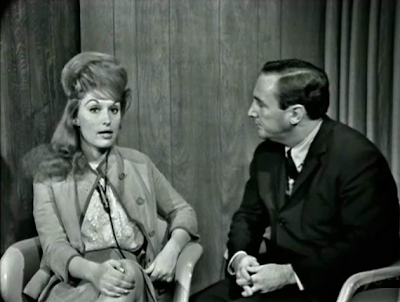 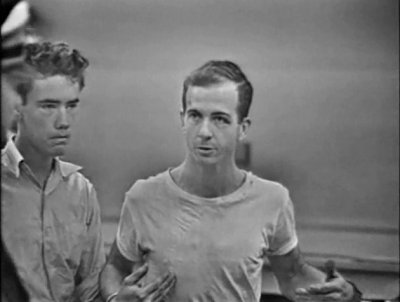 Bonnie Ray Williams (left) and Harold Norman (right). 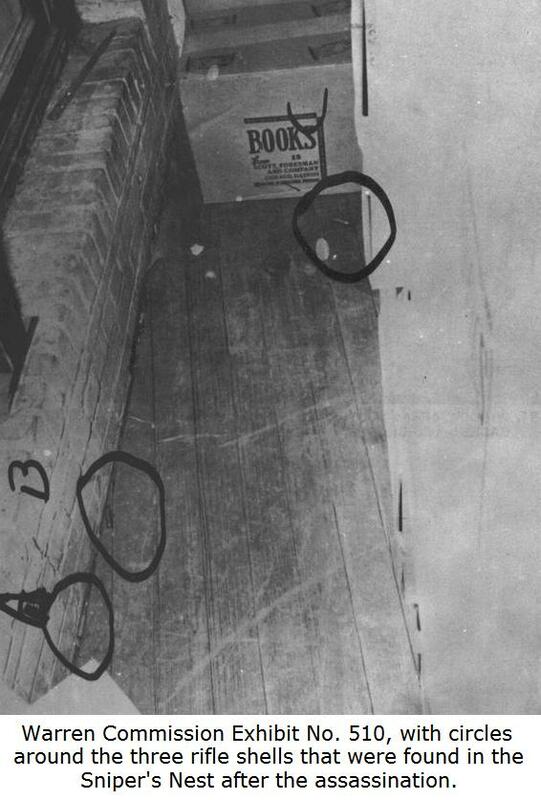 empty cartridge casings hitting the plywood floor above him. 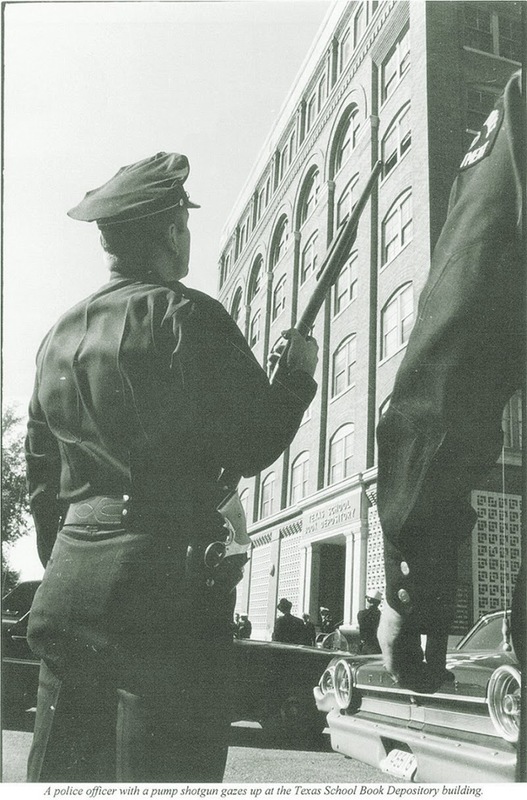 he would have captured the only image of Oswald's rifle in the window. 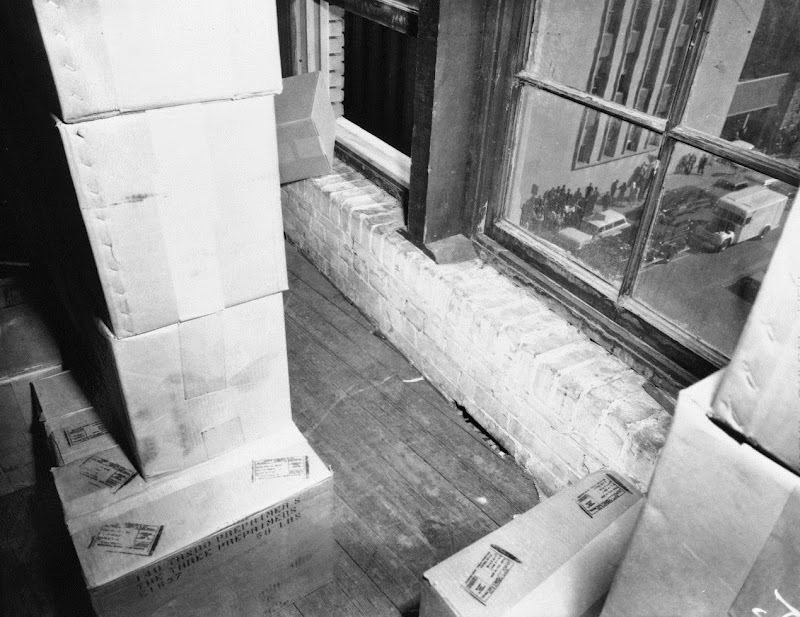 at an angle on the sixth-floor window ledge. 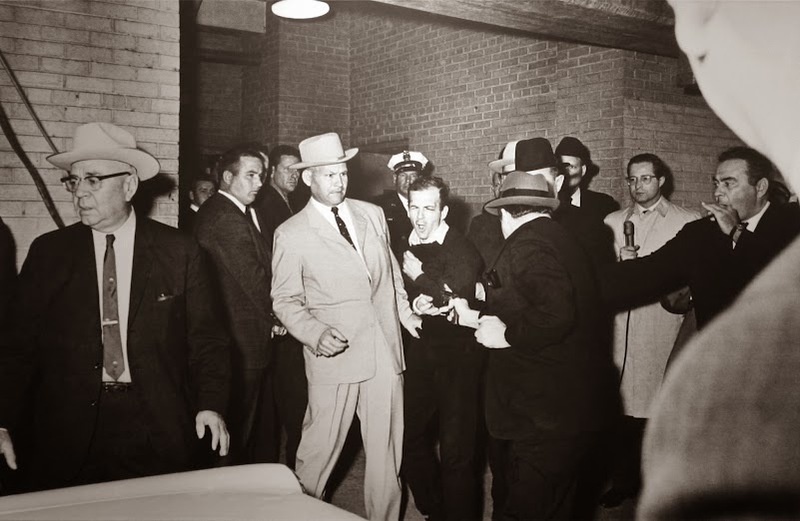 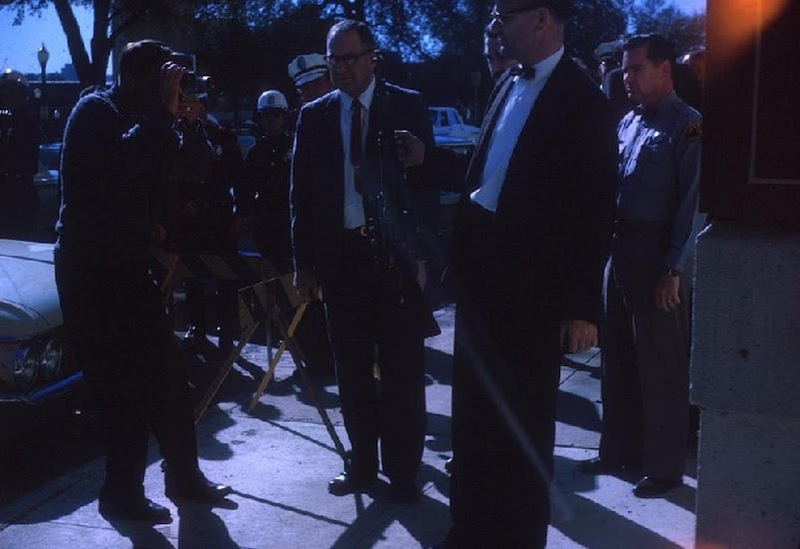 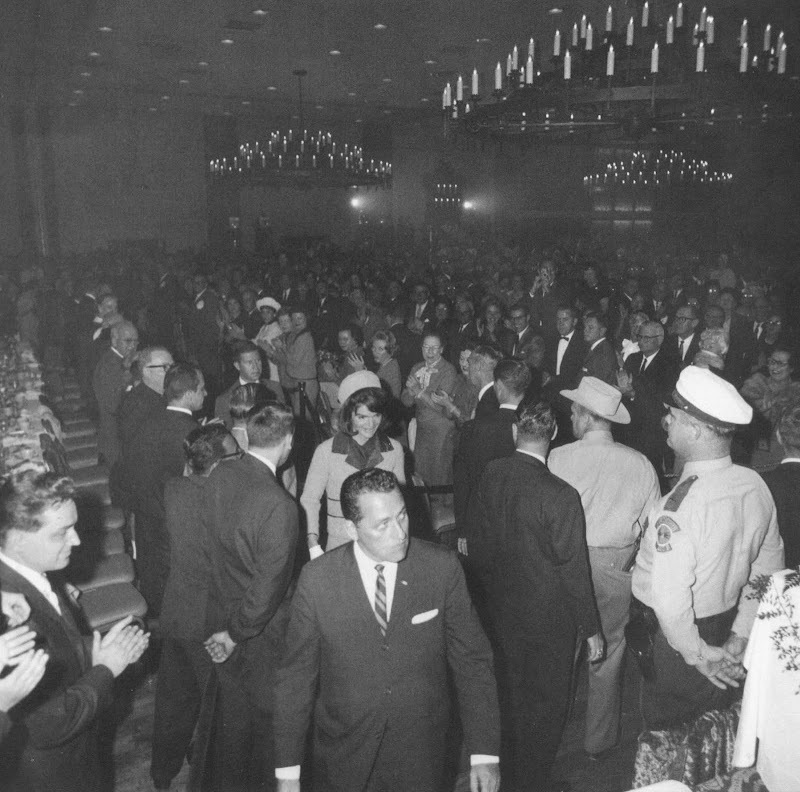 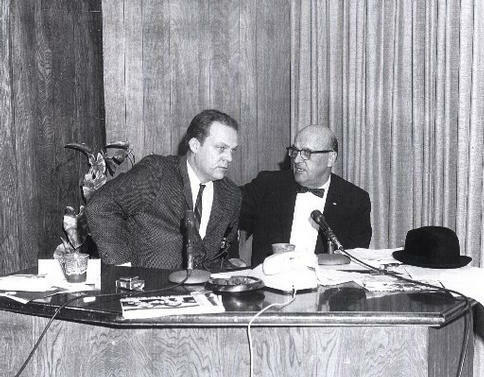 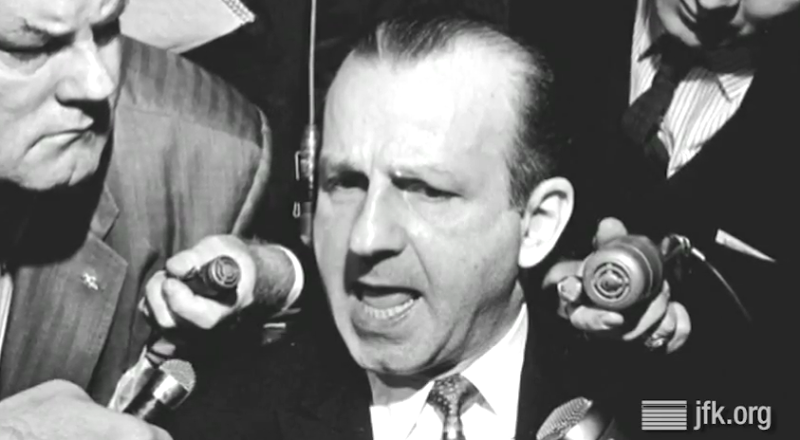 the dark glasses at the far right in the above picture is Jack Ruby. 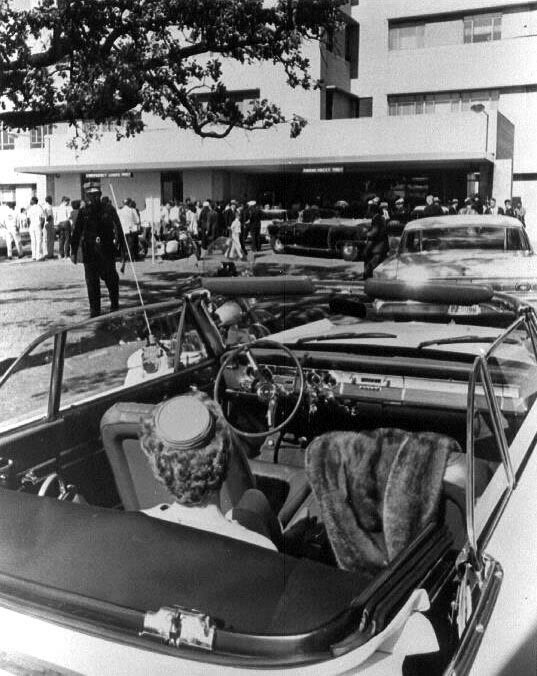 in the car in the foreground. 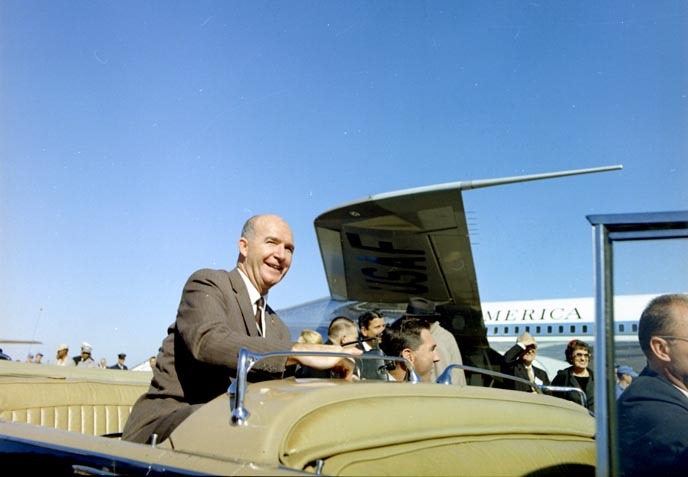 with the "bubbletop" only halfway installed. 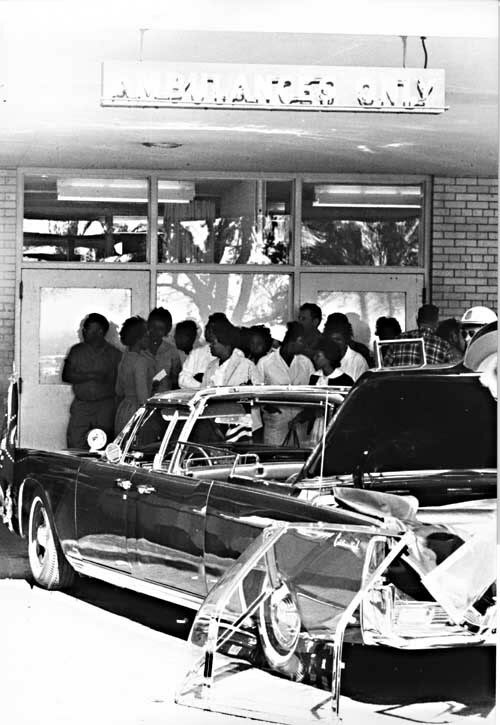 Another picture of SS-100-X at the Parkland emergency entrance. 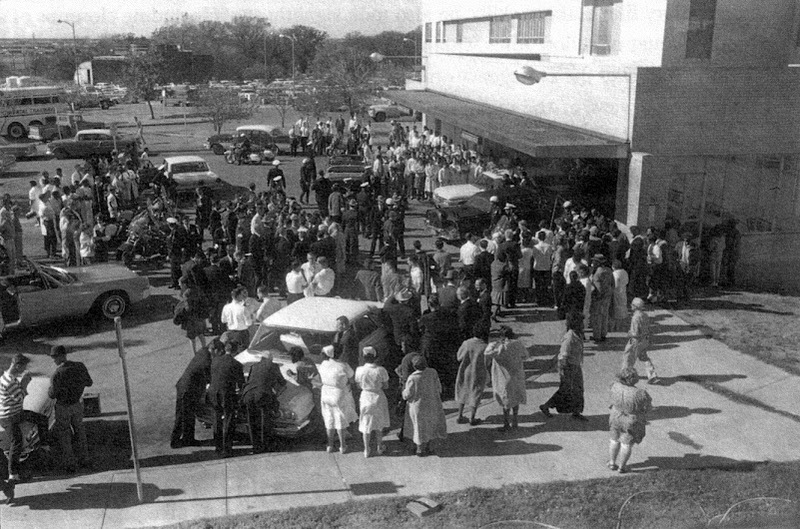 The crowd at Parkland's emergency entrance. 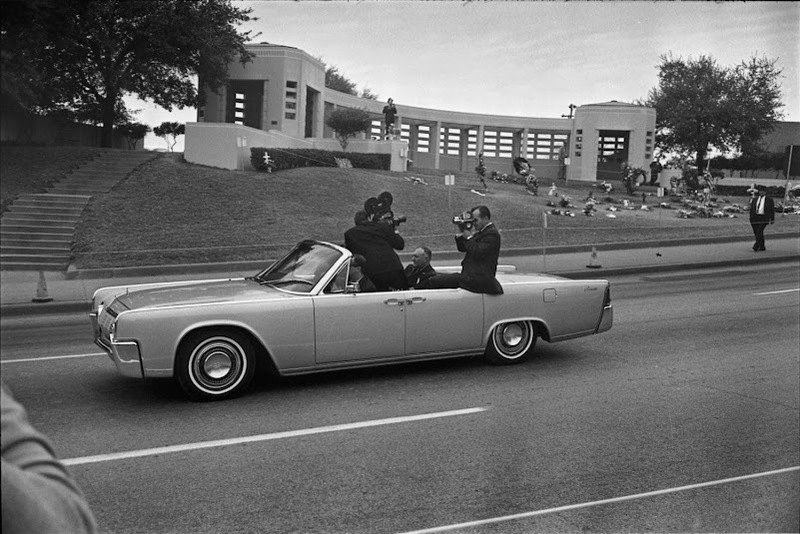 slain President in the limousine at Parkland Hospital. 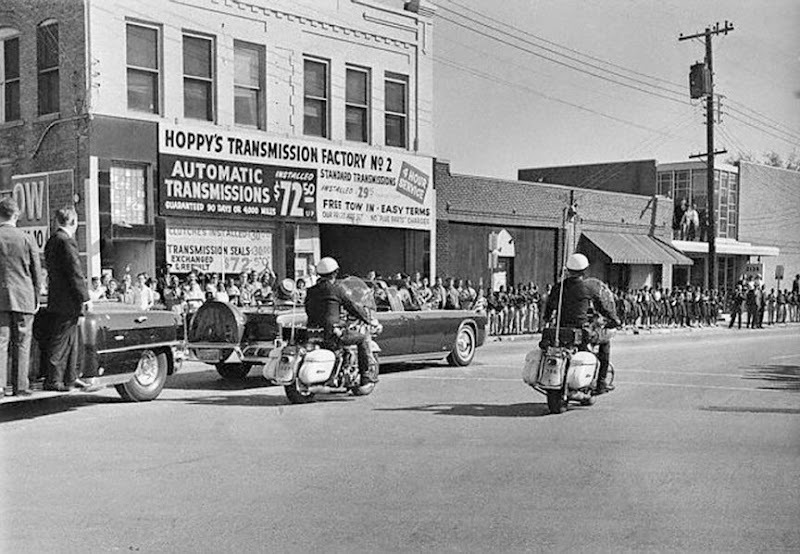 rode in during the motorcade is in the foreground. 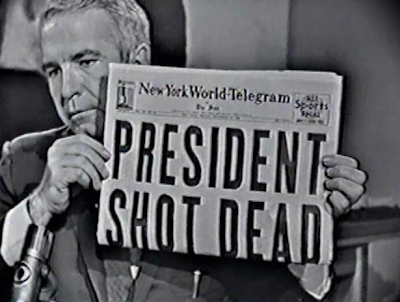 wait outside Parkland for news on the President's condition. 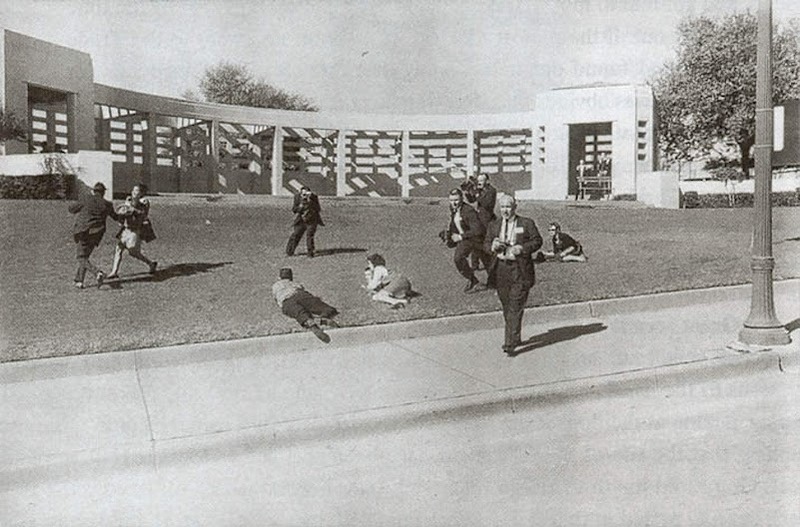 of Kilduff's statement, given in a nurse's classroom at Parkland Hospital. 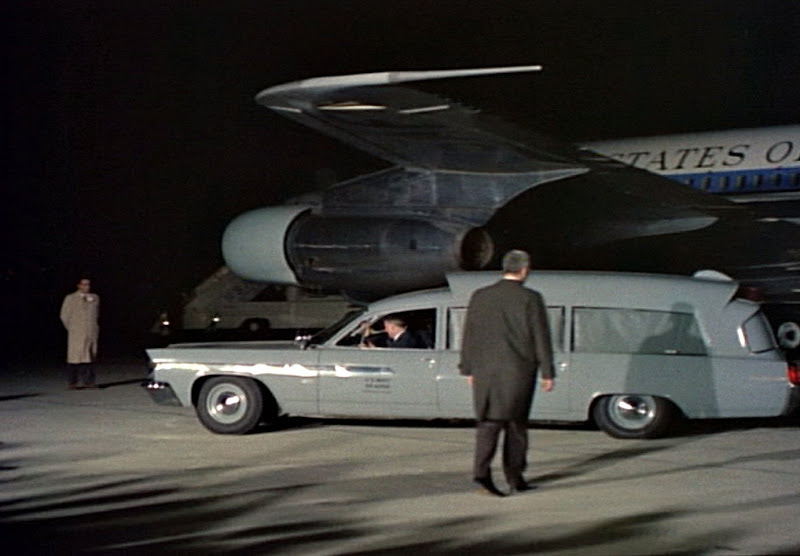 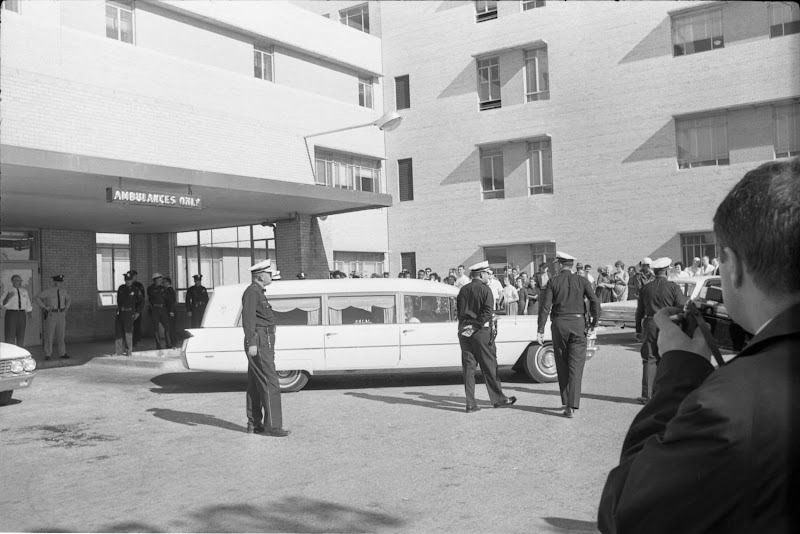 A hearse arrives at Parkland. 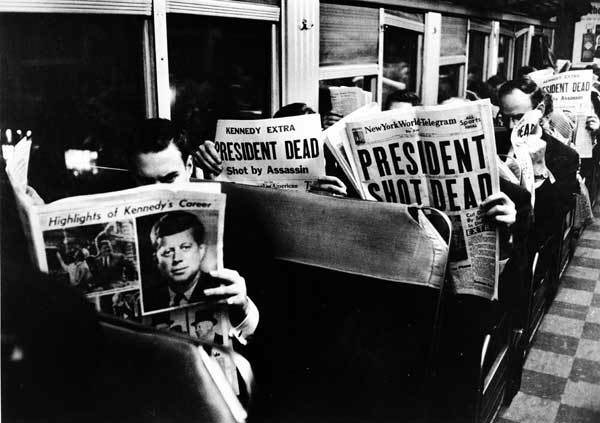 The tragedy was now in print. 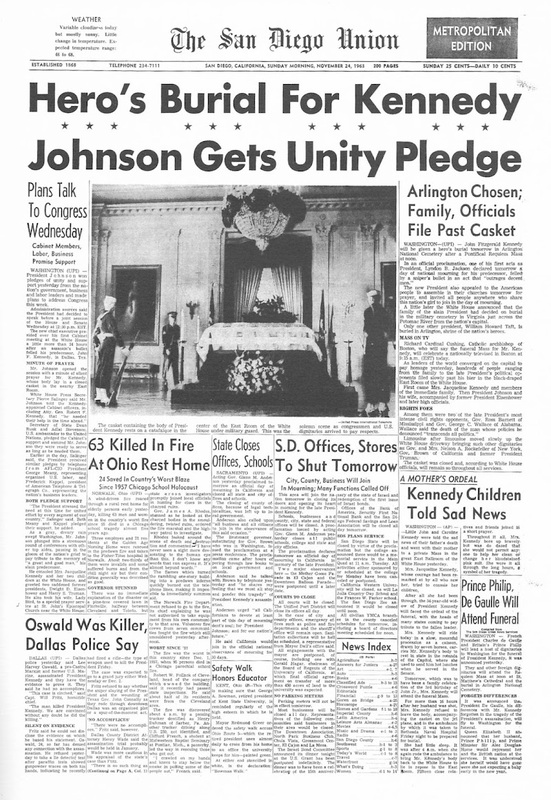 To see more newspaper front pages, GO HERE. 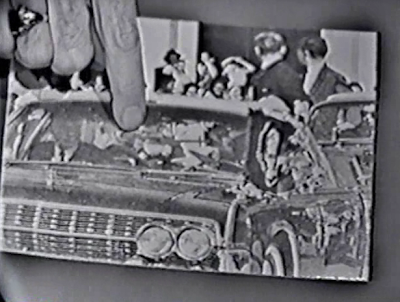 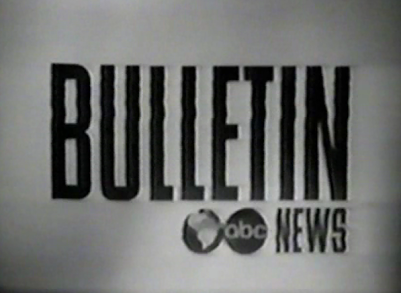 Some of the original 11/22/63 bulletins torn from the UPI wire service. 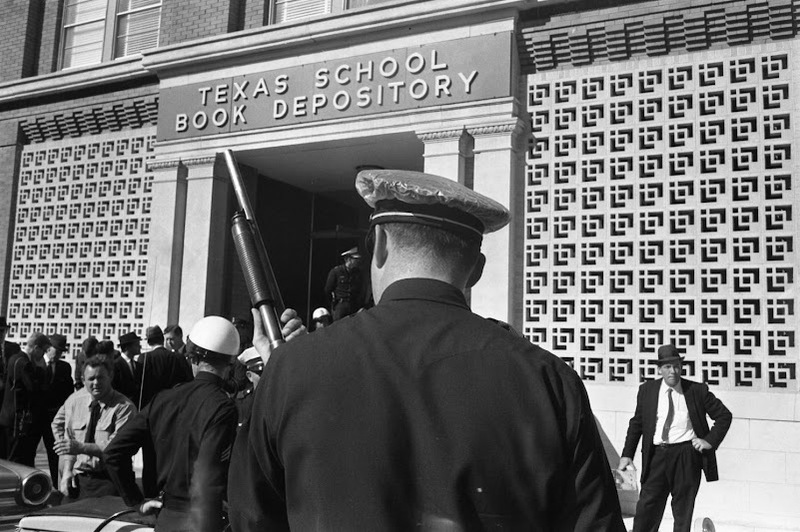 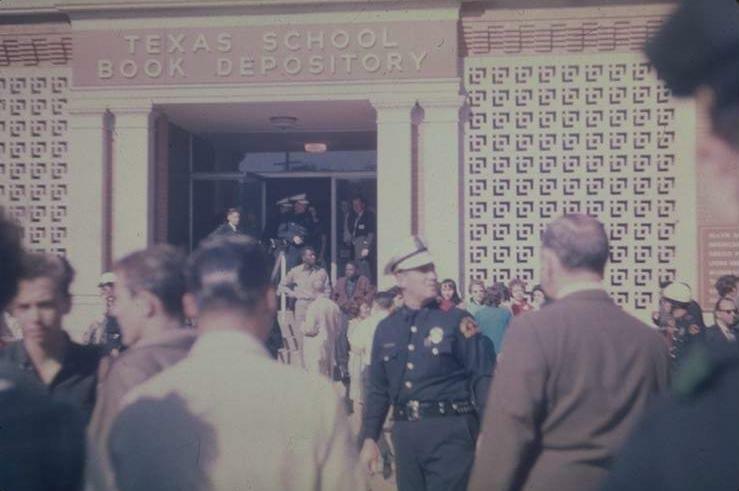 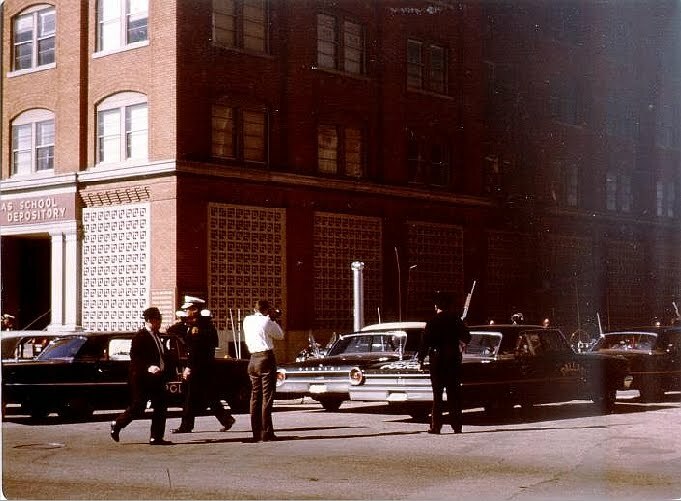 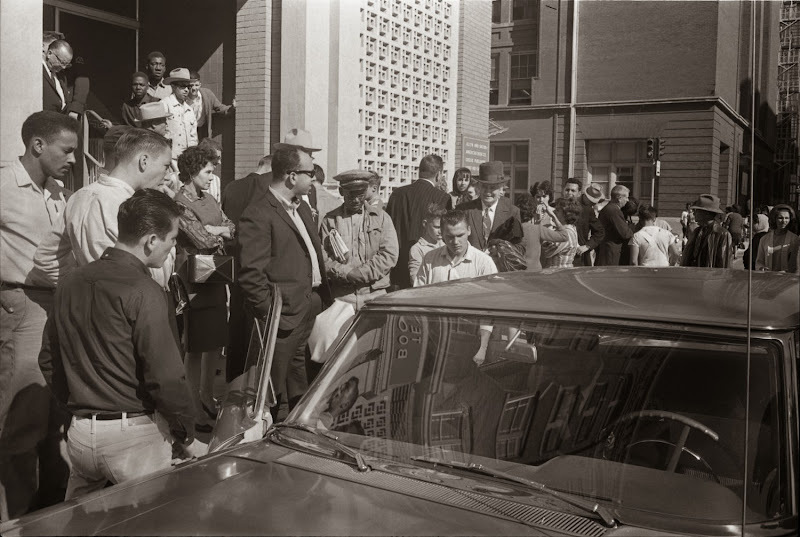 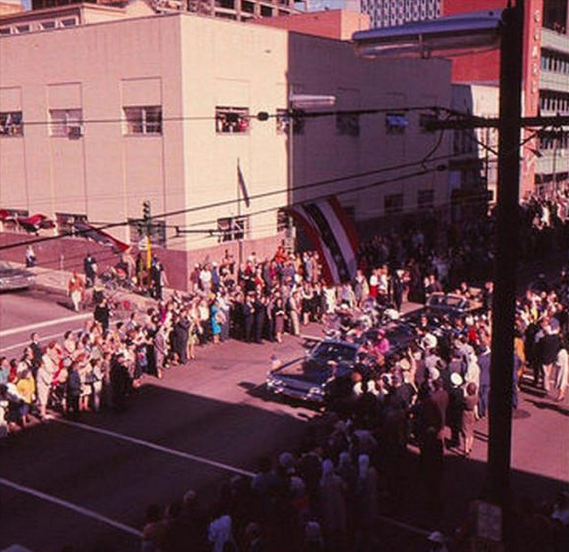 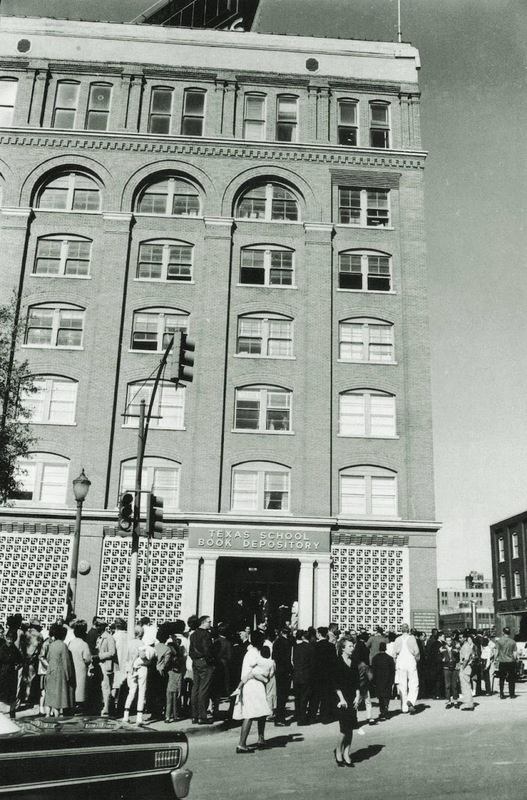 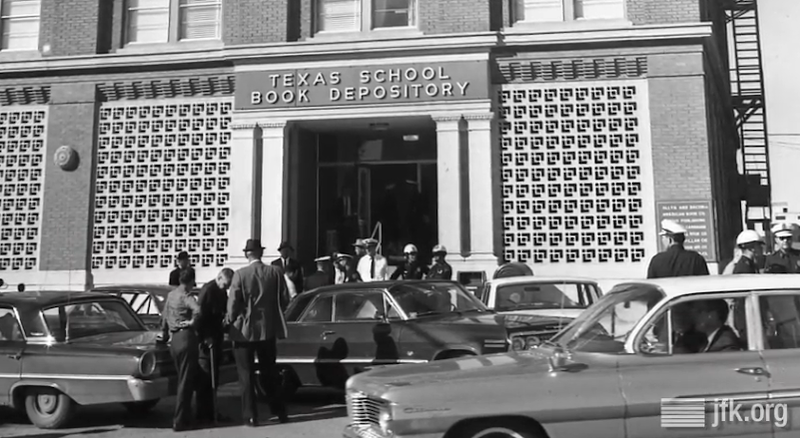 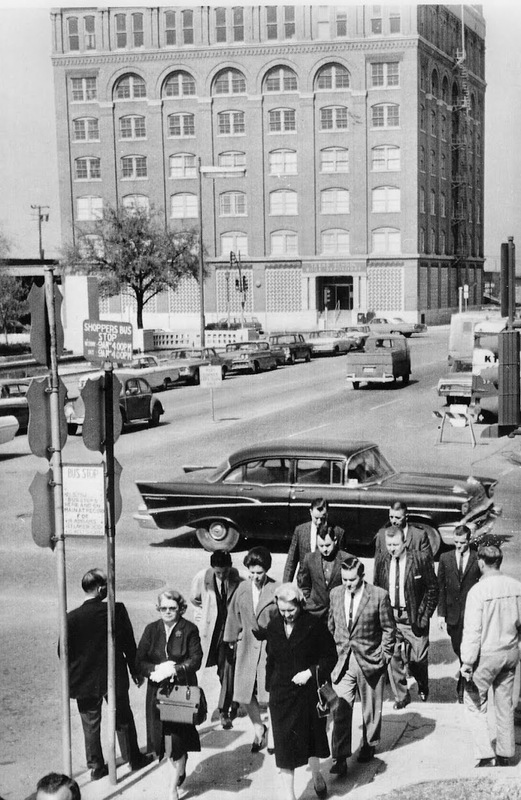 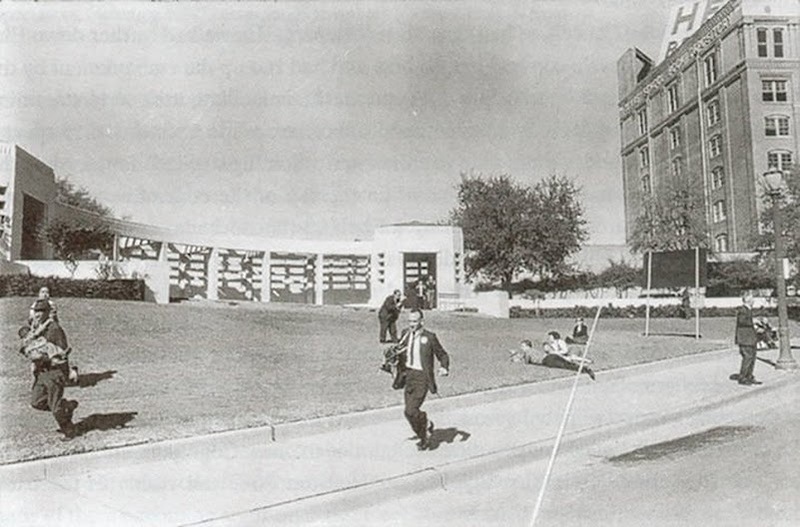 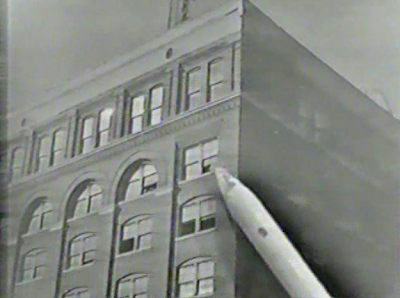 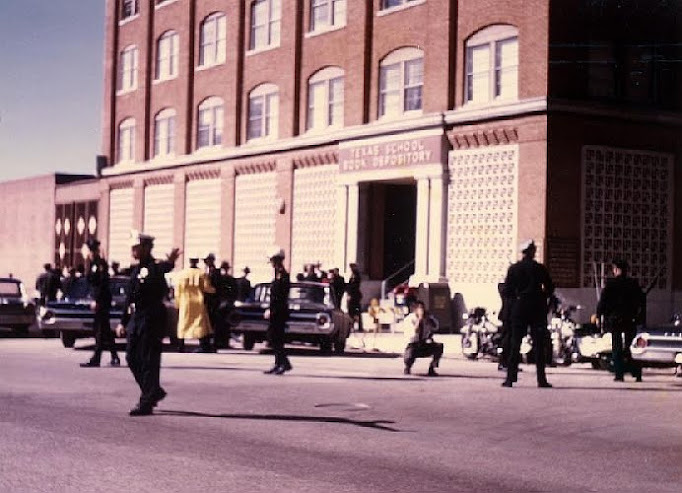 of the Texas School Book Depository shortly after the assassination. 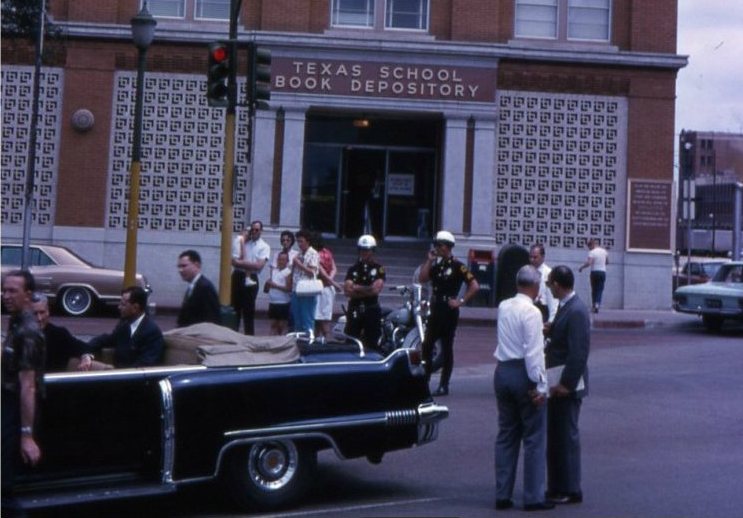 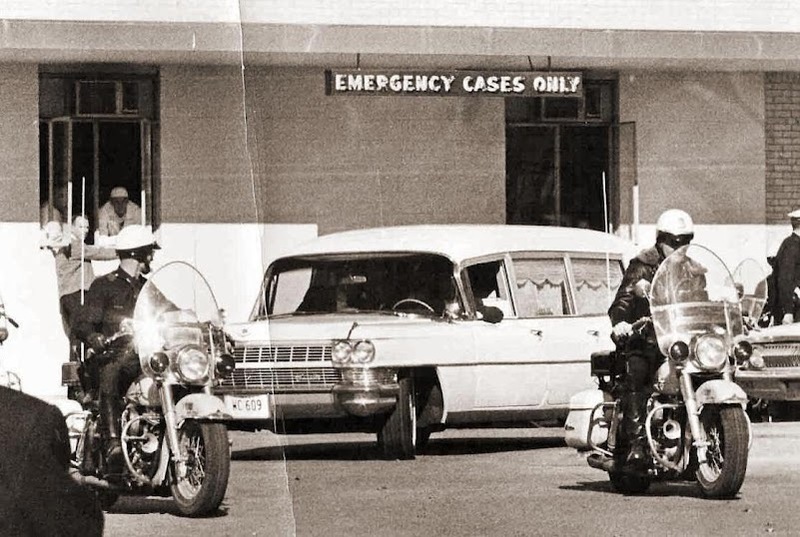 police to the County Jail, with the Book Depository in the background. 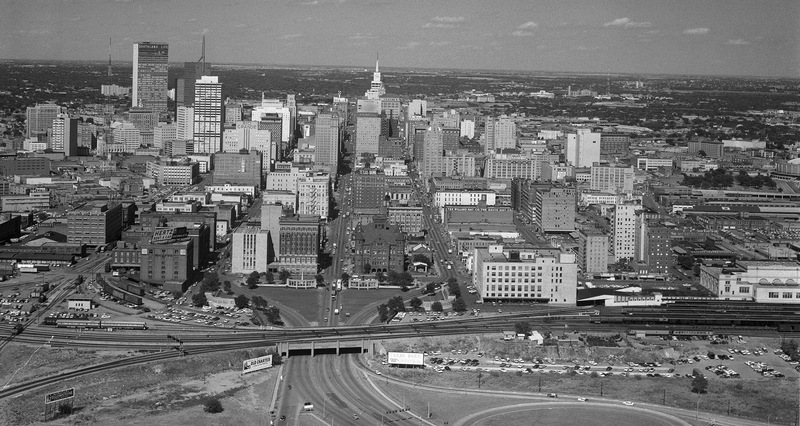 More than 100 additional WFAA/ABC images can be found HERE. 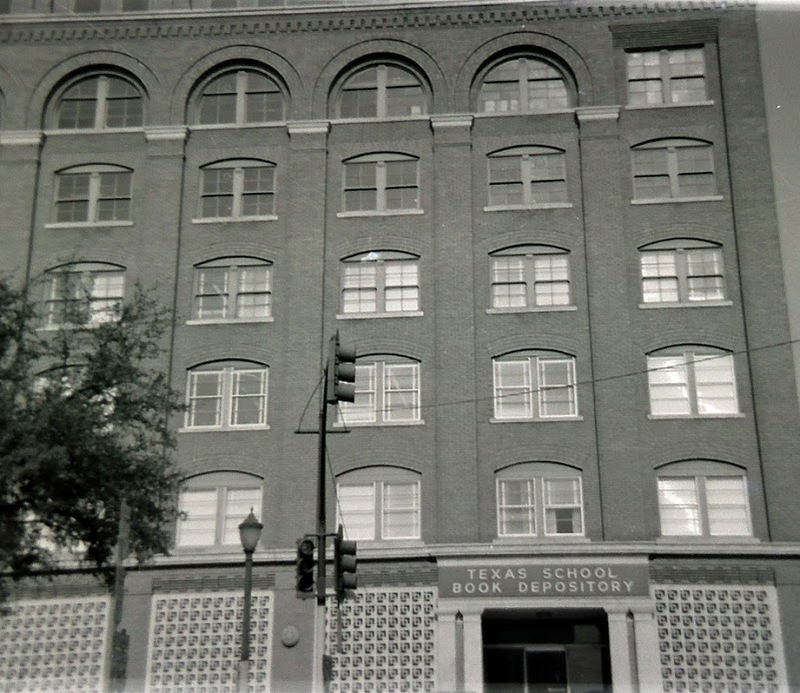 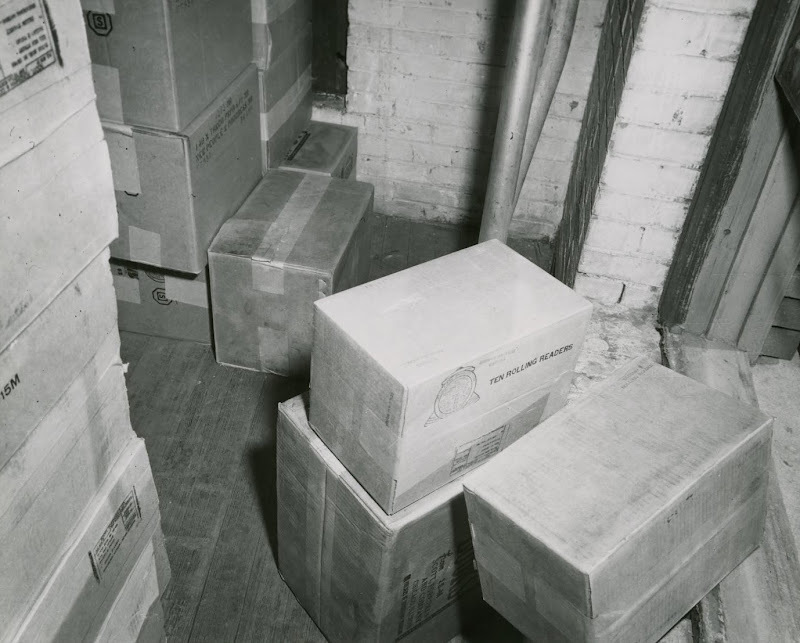 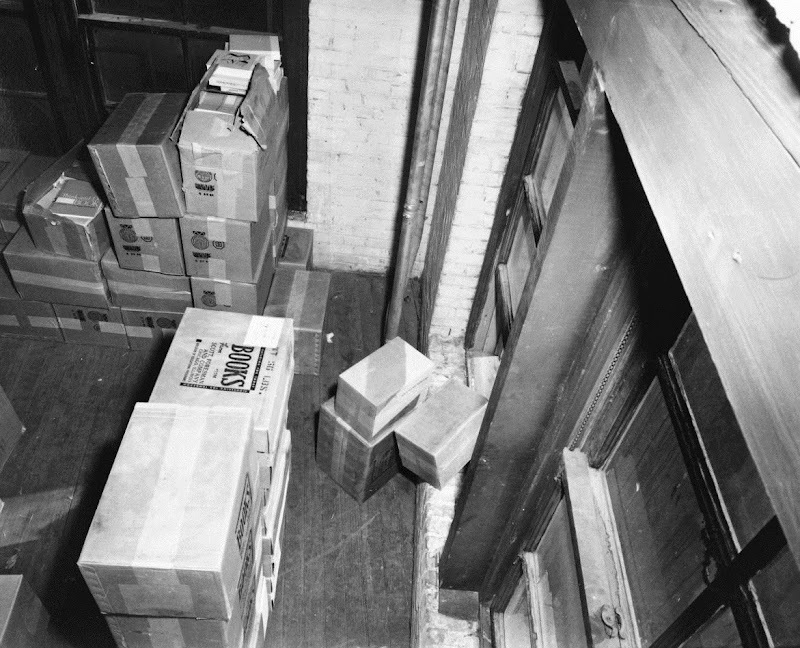 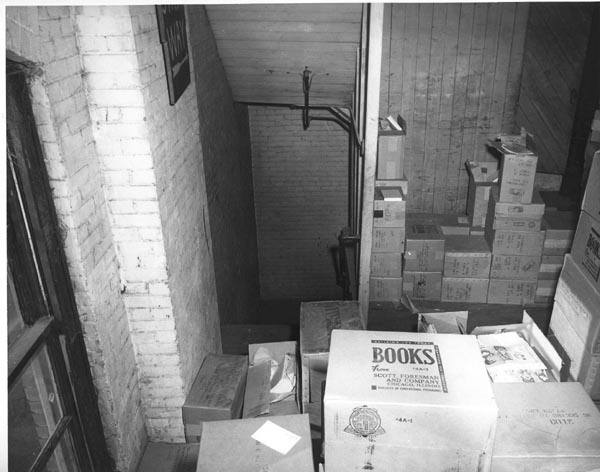 The sixth floor of the Book Depository. 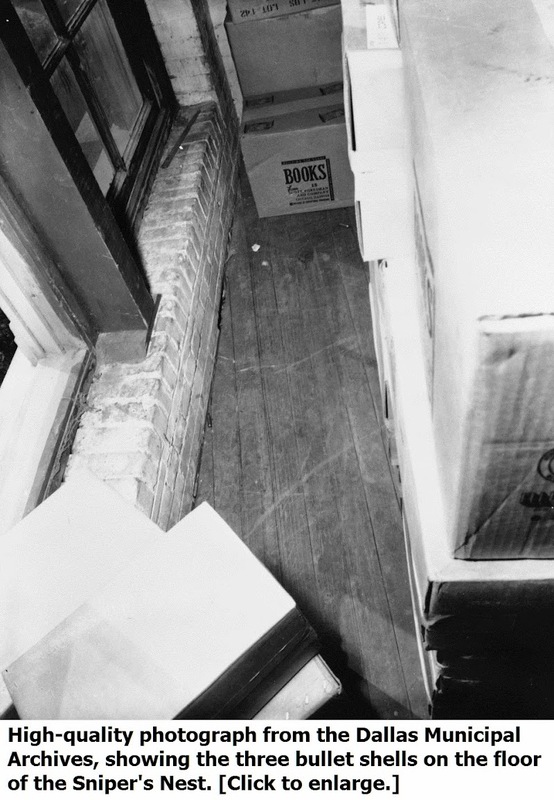 can be seen on the floor. 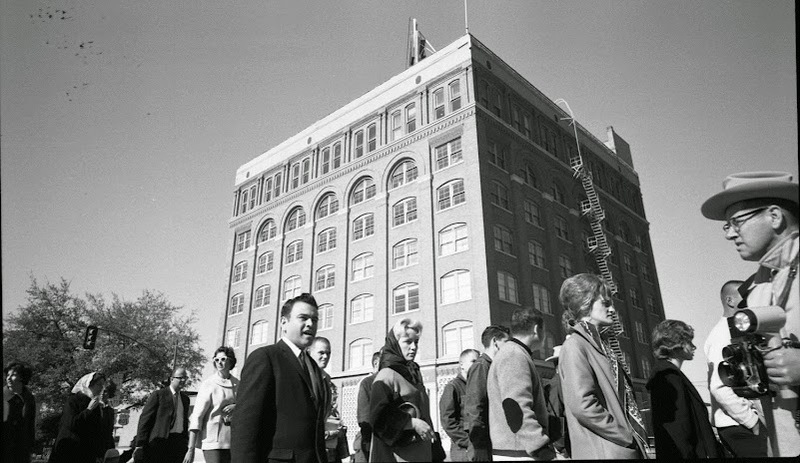 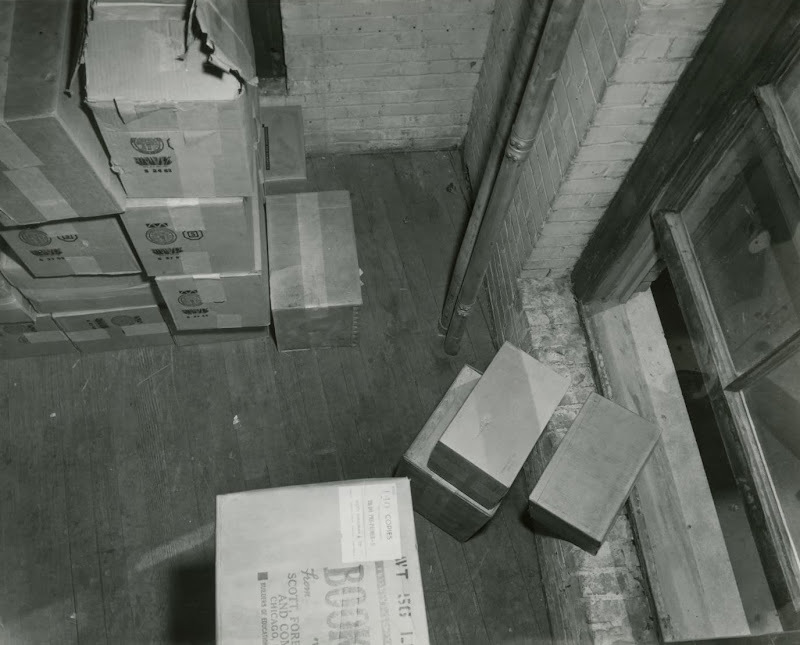 sixth floor at 1:22 PM CST on 11/22/63. 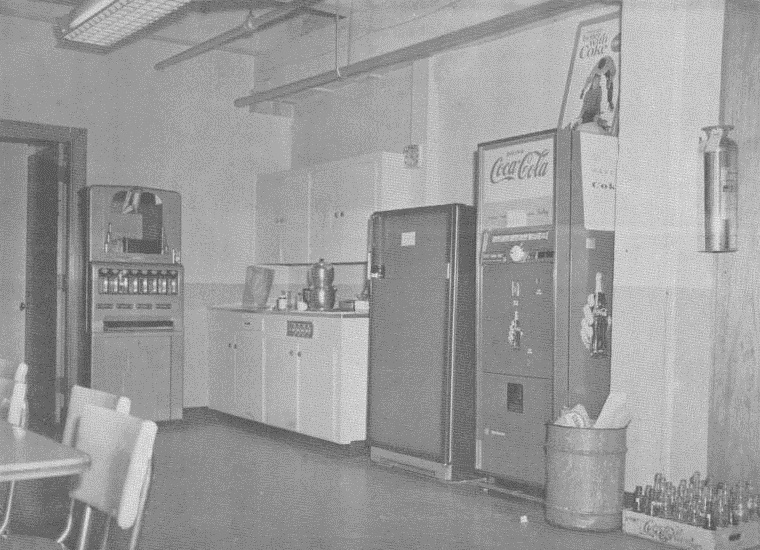 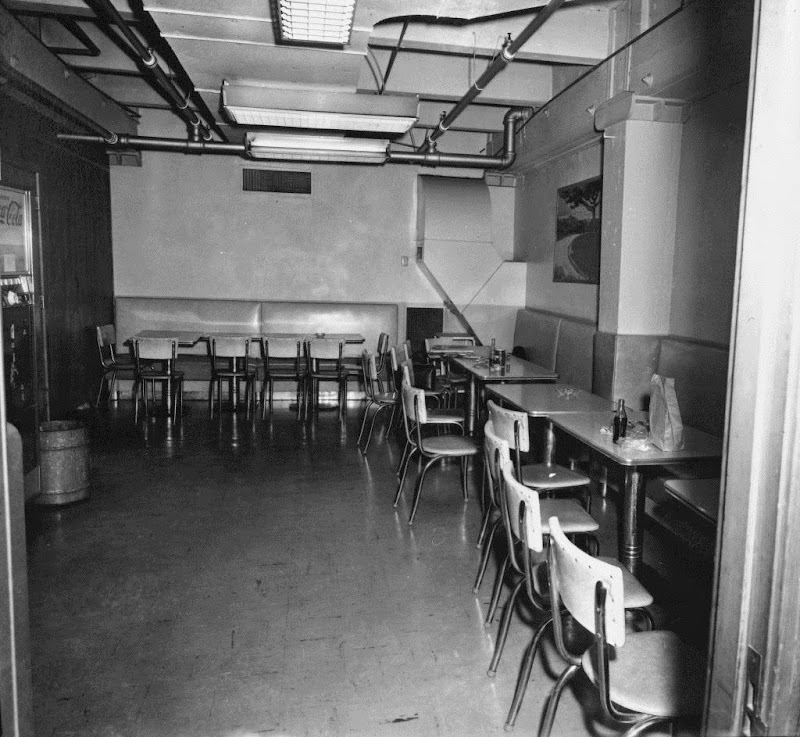 This is the lunchroom on the second floor of the Book Depository. 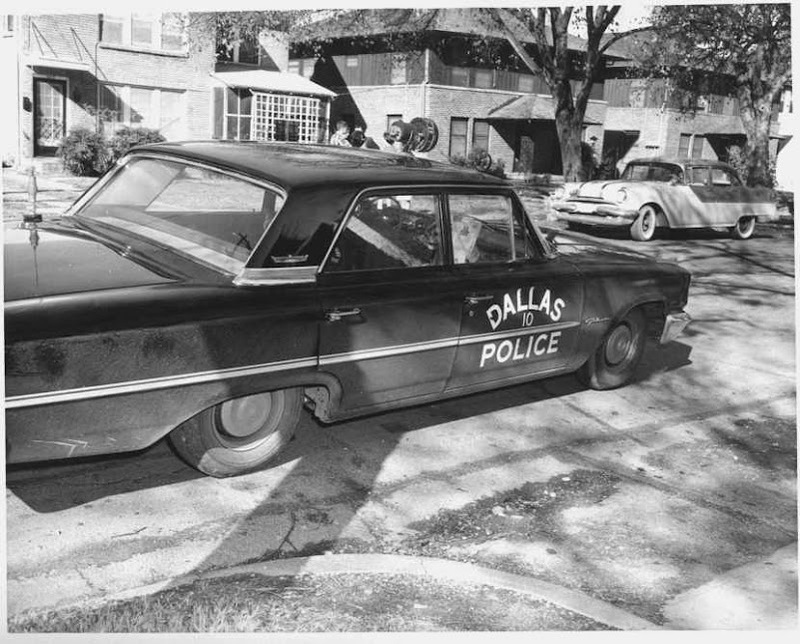 room by Dallas Police Officer Marrion L. Baker. 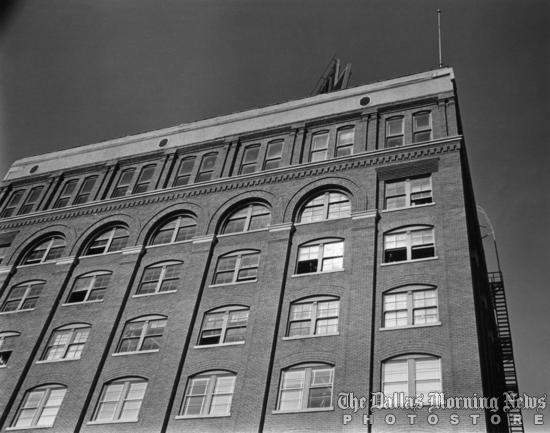 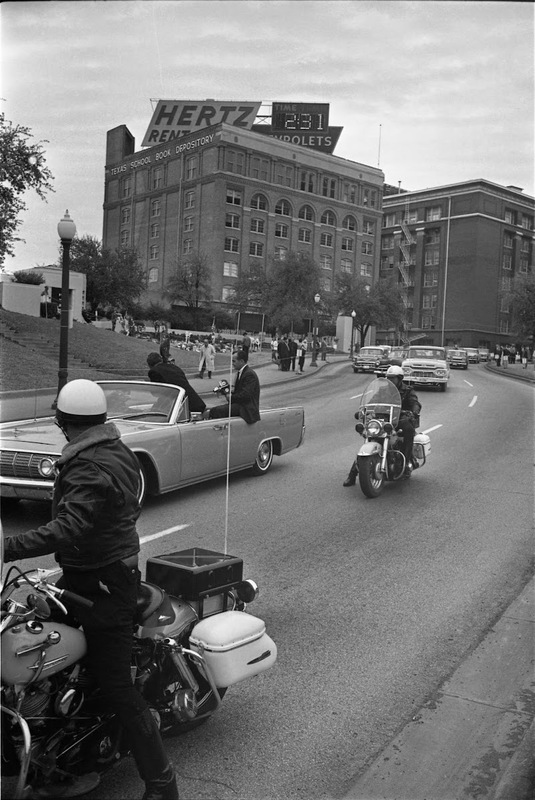 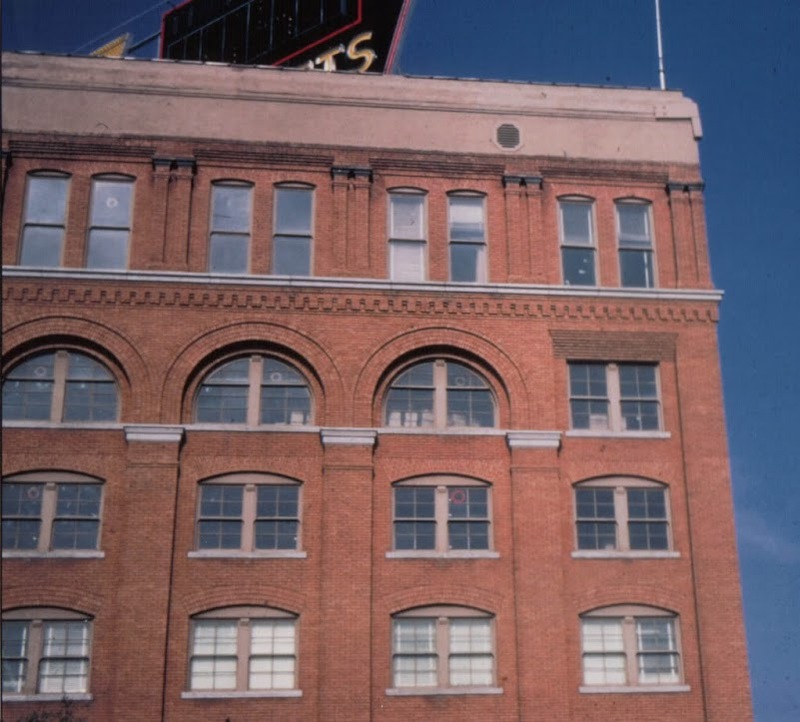 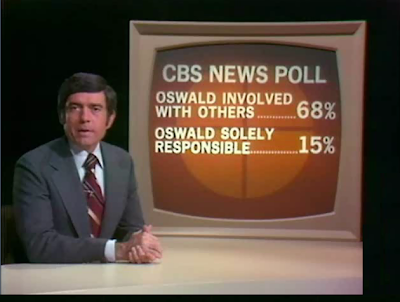 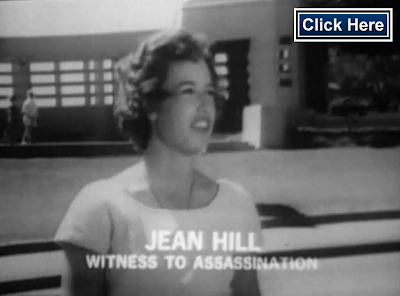 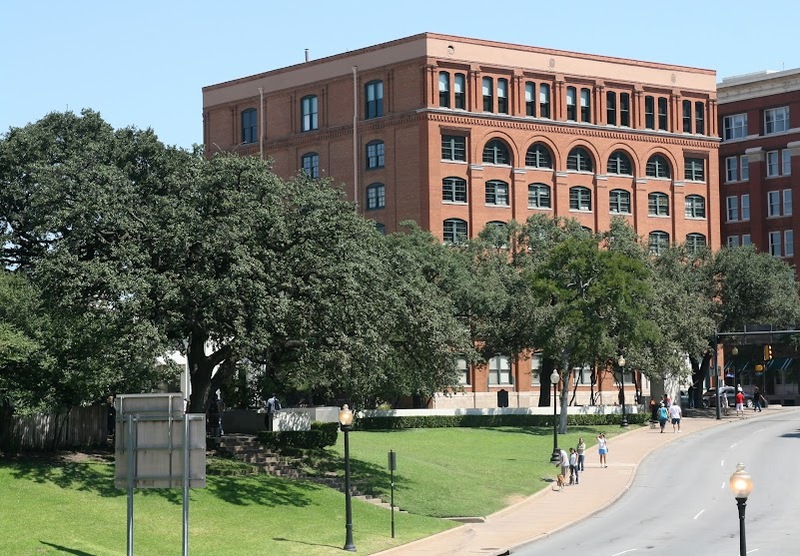 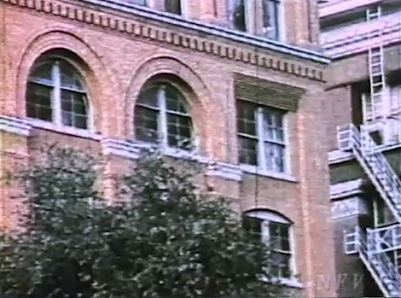 assassination, with Oswald's sixth-floor window still open. 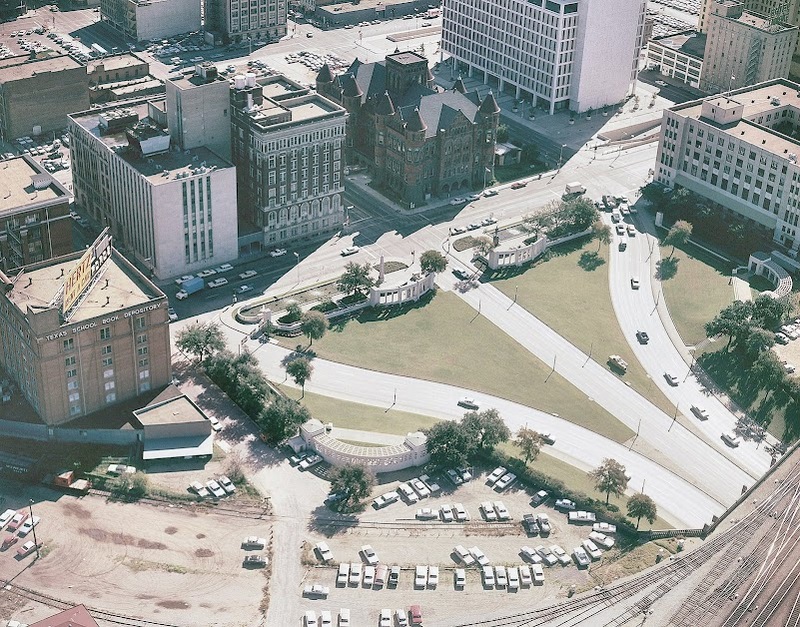 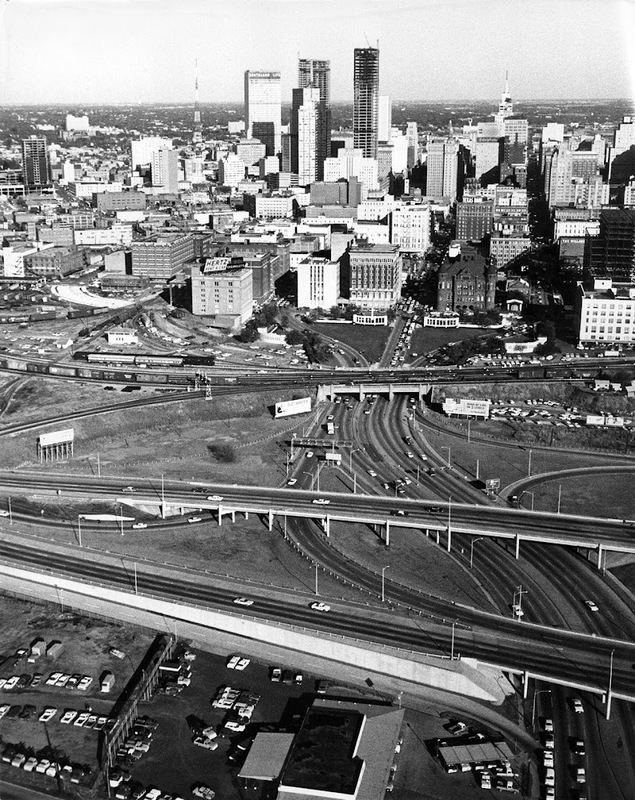 A terrific aerial photo of Dealey Plaza in Dallas, Texas (circa 1967). 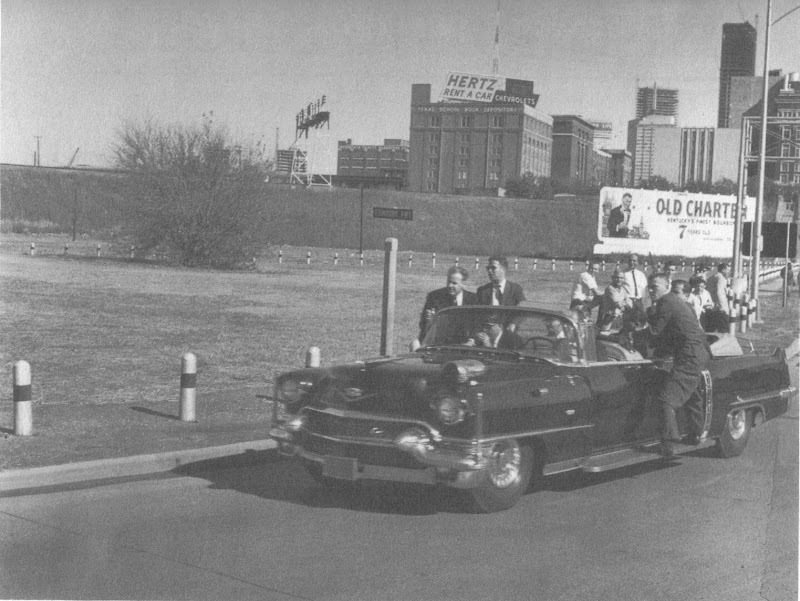 viewing THIS LARGER VERSION of the picture. 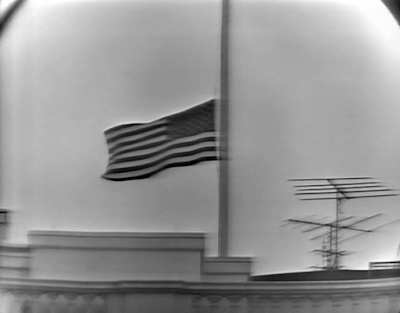 on the same day as the photo above it. 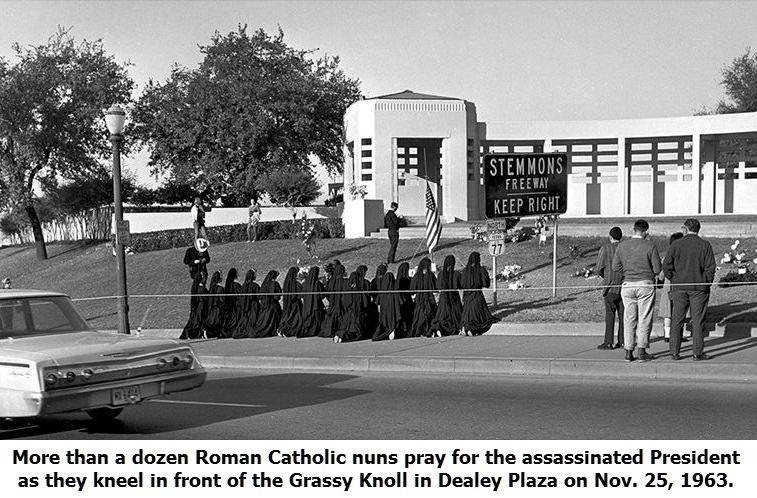 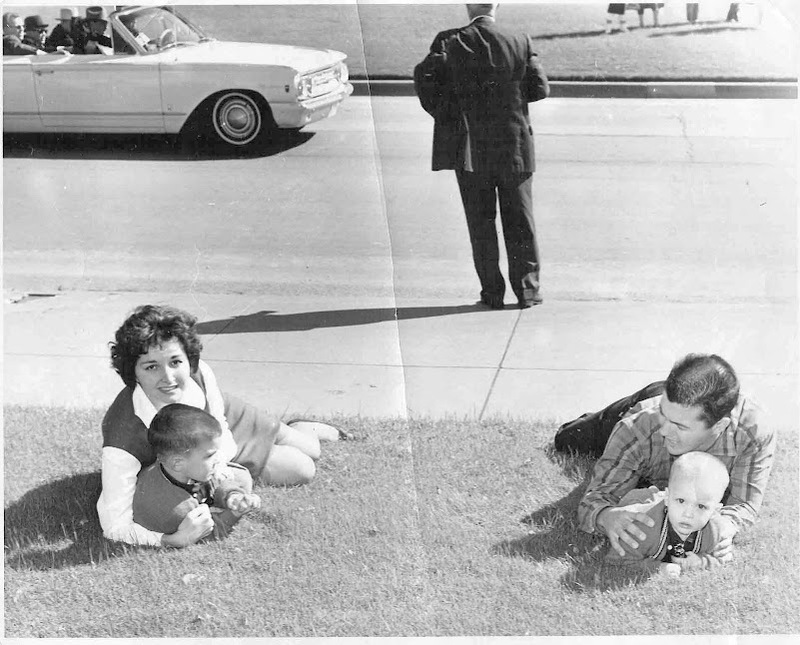 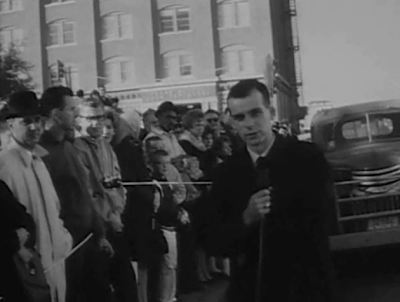 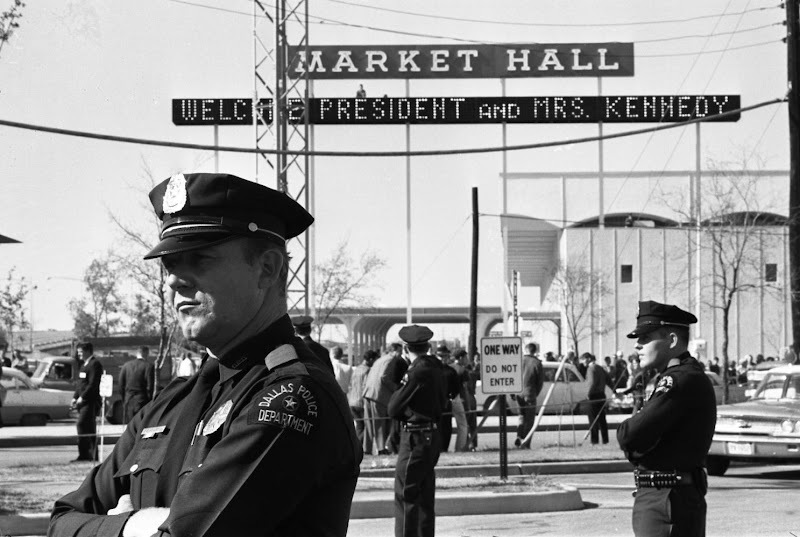 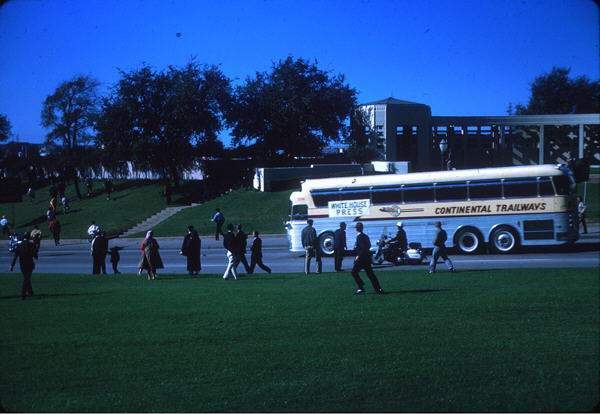 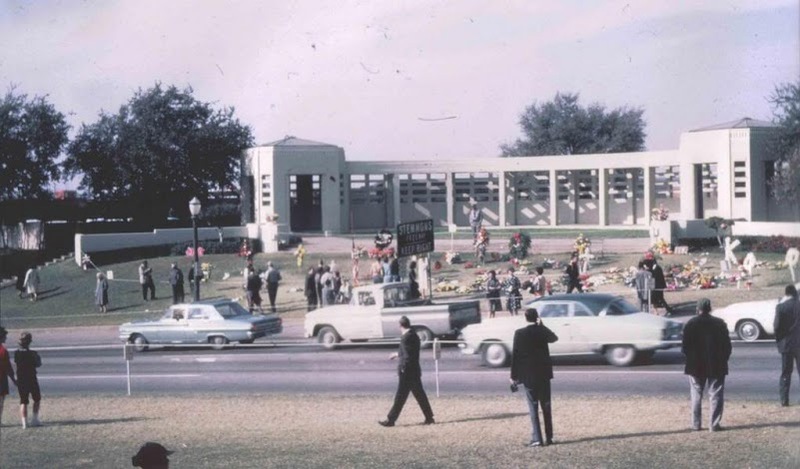 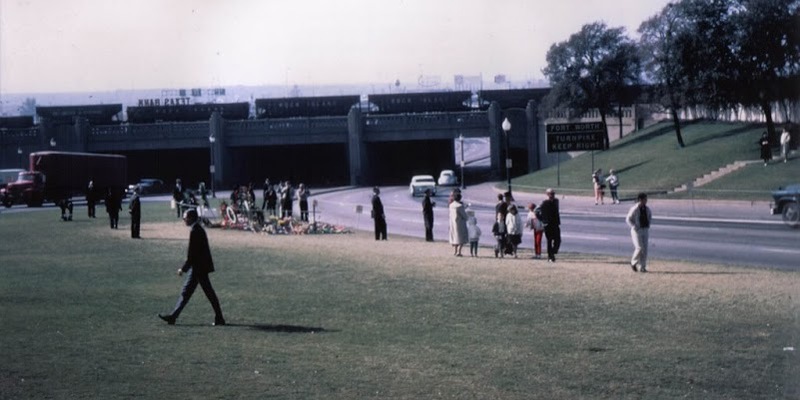 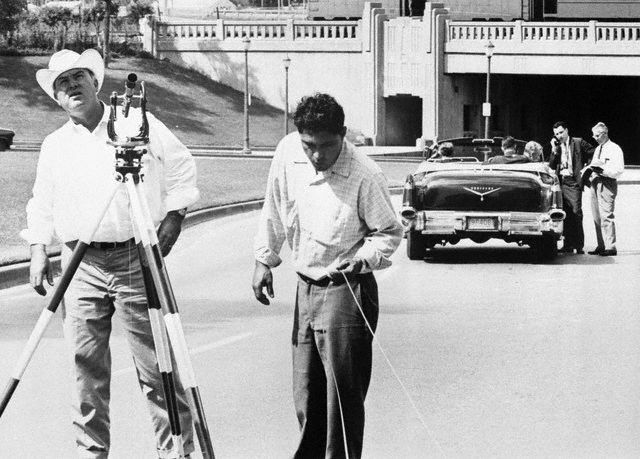 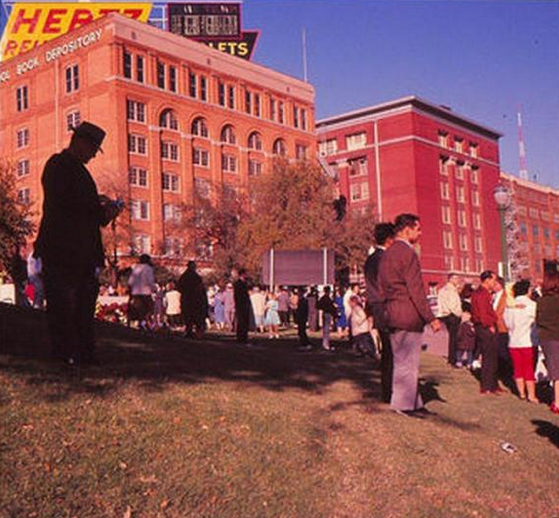 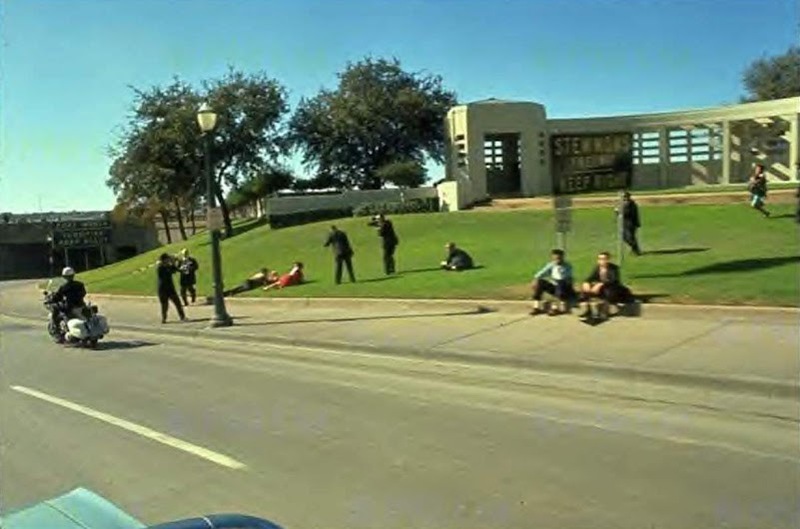 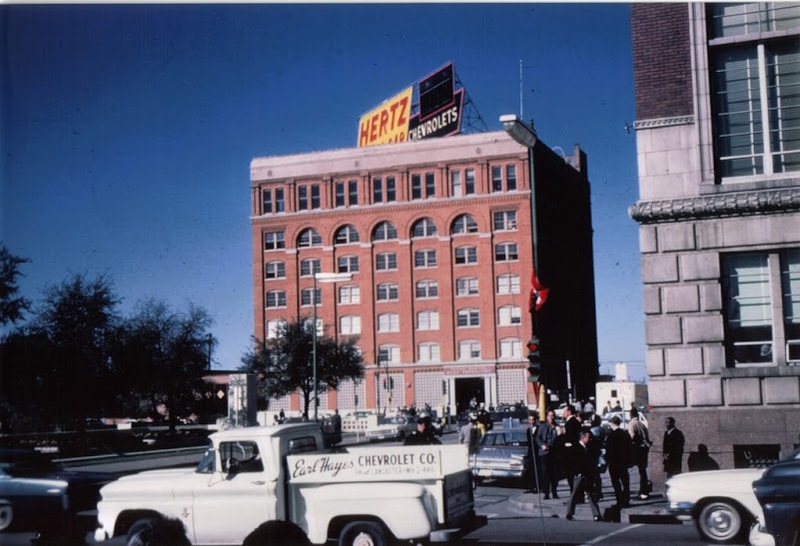 at Dealey Plaza in the year 1967. 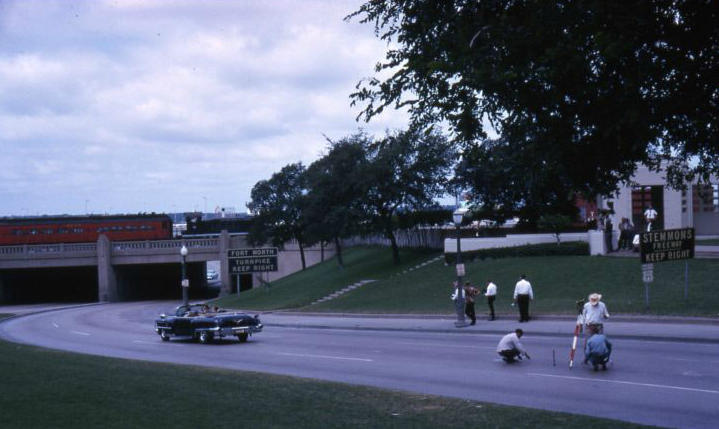 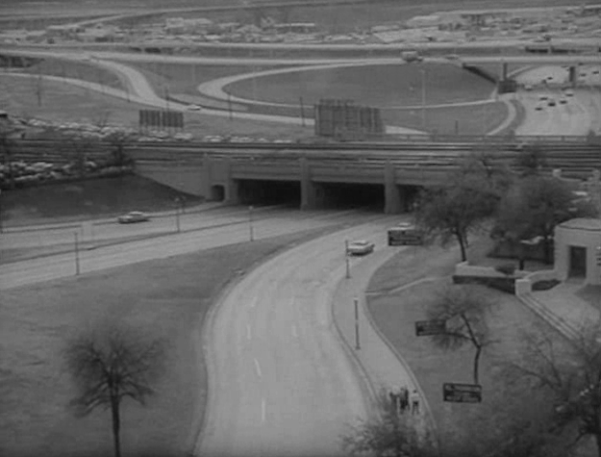 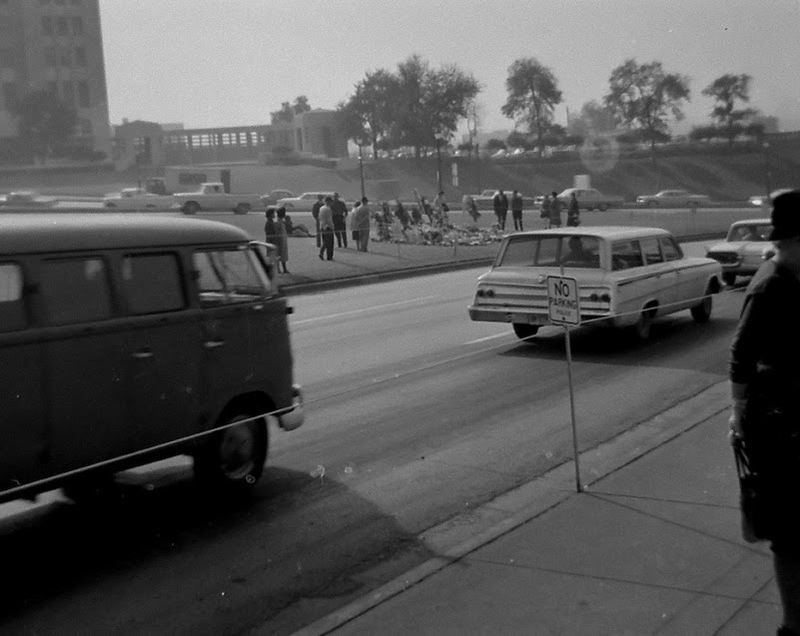 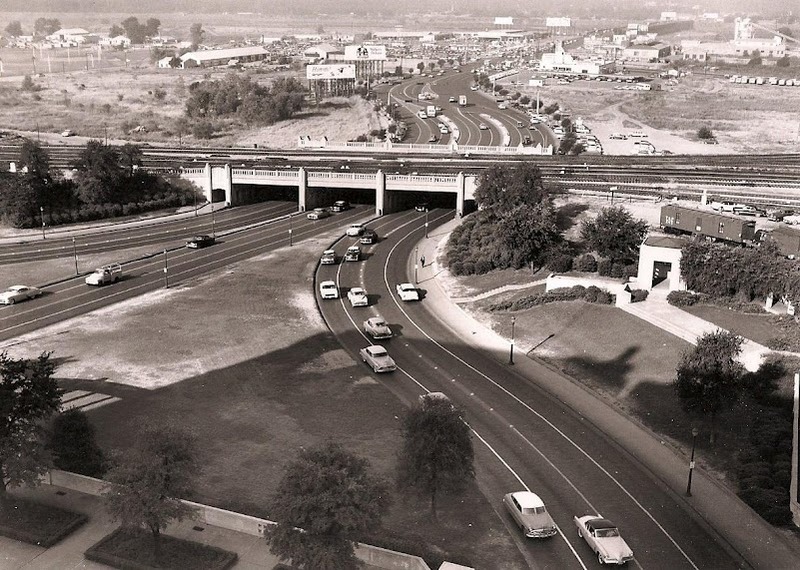 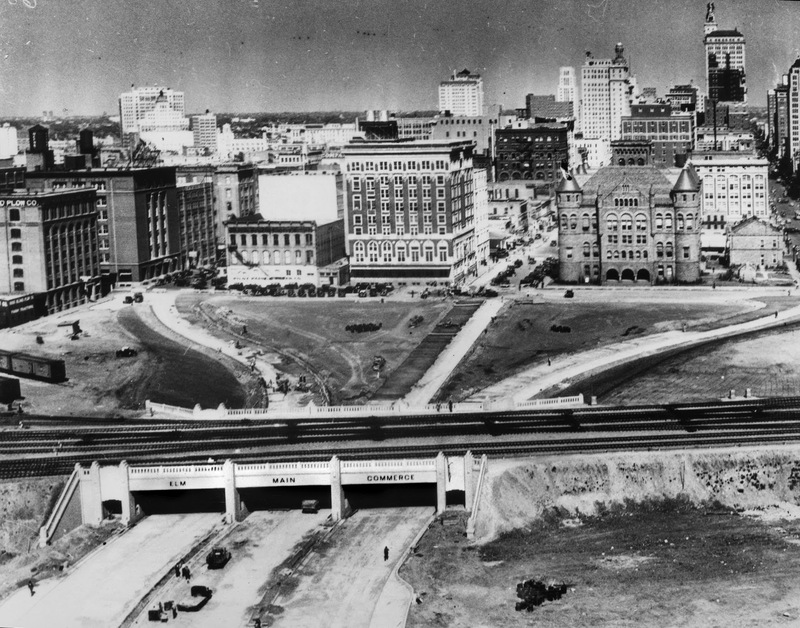 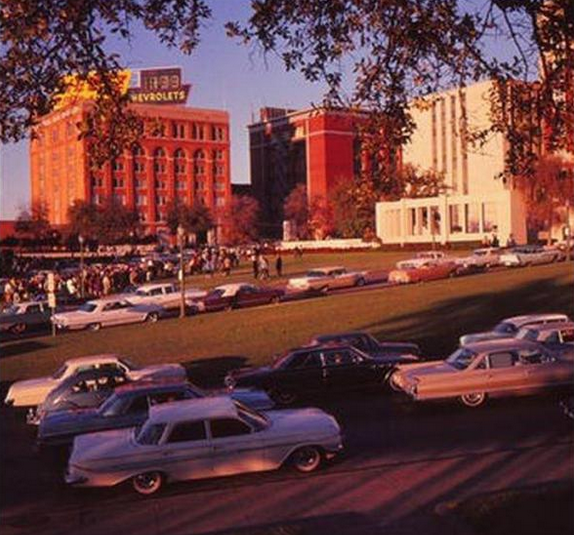 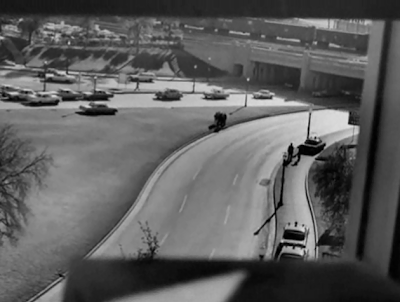 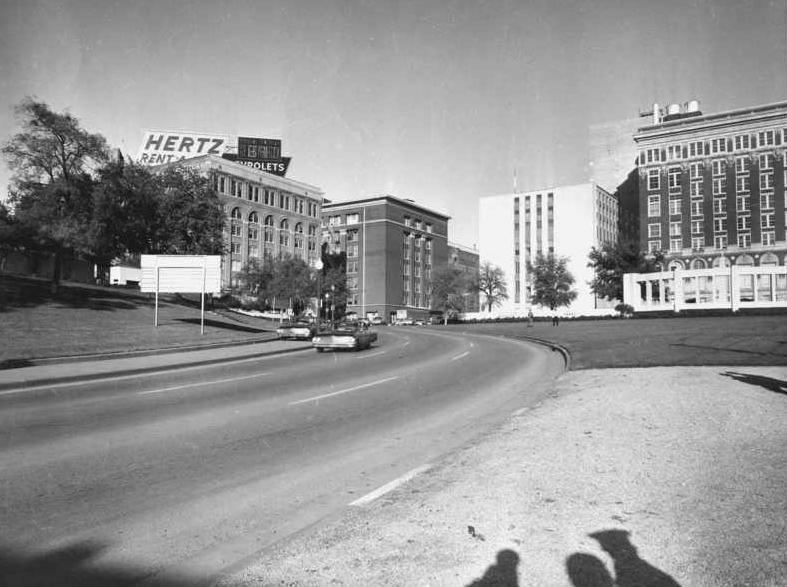 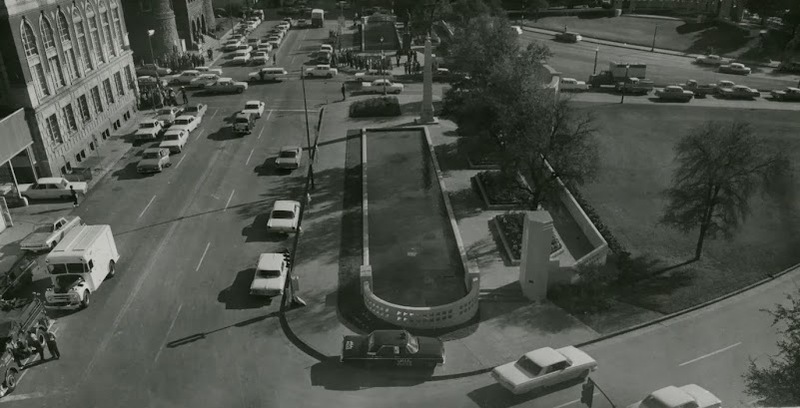 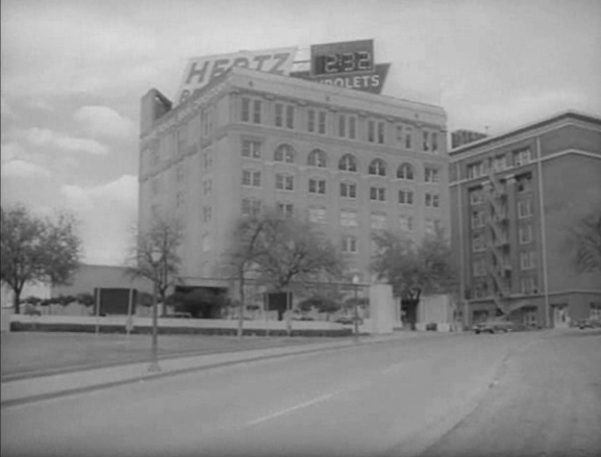 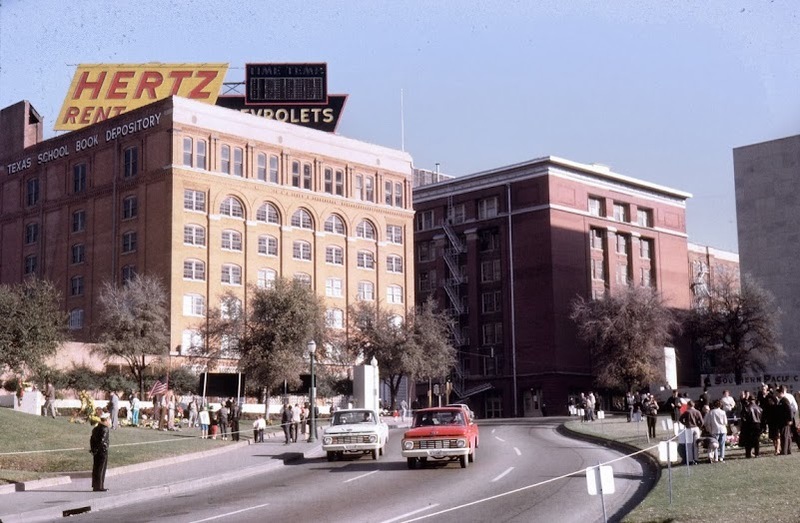 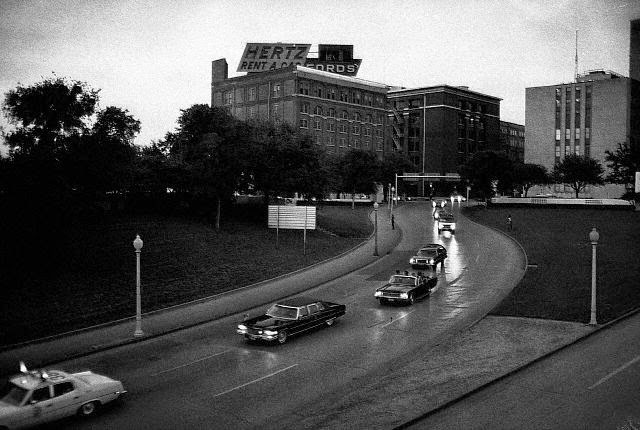 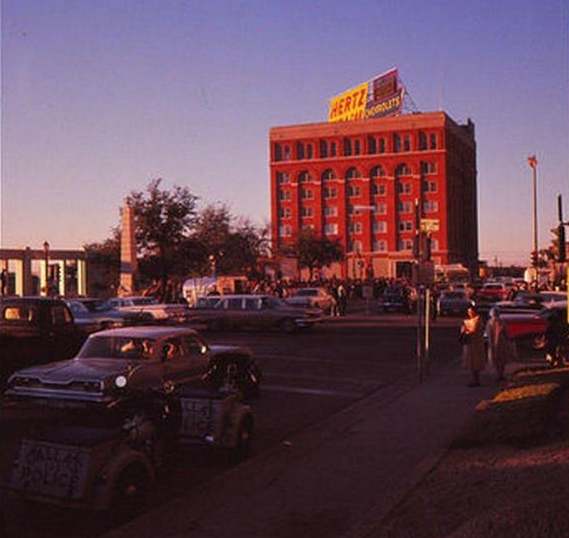 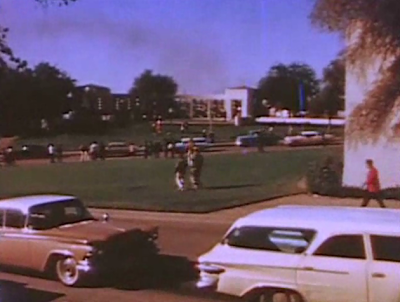 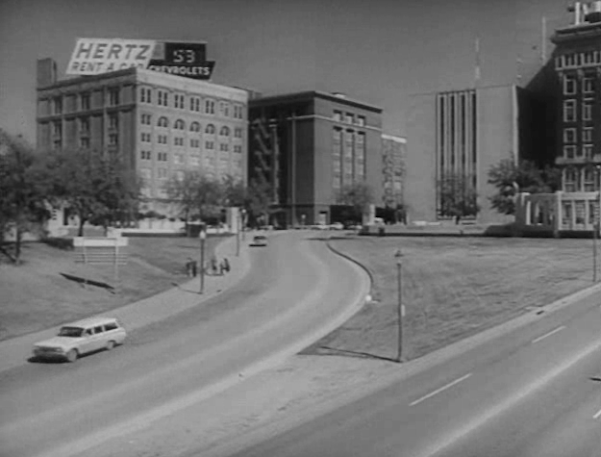 Here's the way Dealey Plaza looked in the year 1959.
strange seeing cars travelling eastbound on Elm. 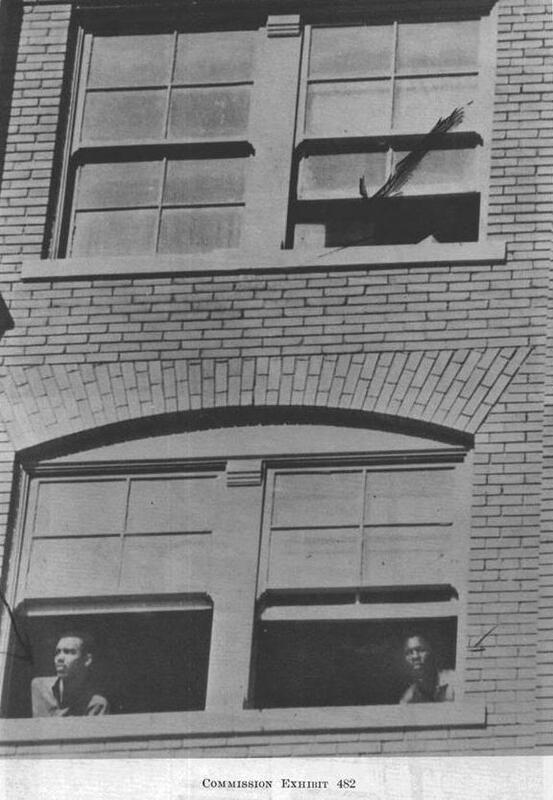 left was then occupied by the "Southern Rock Island Plow Company". 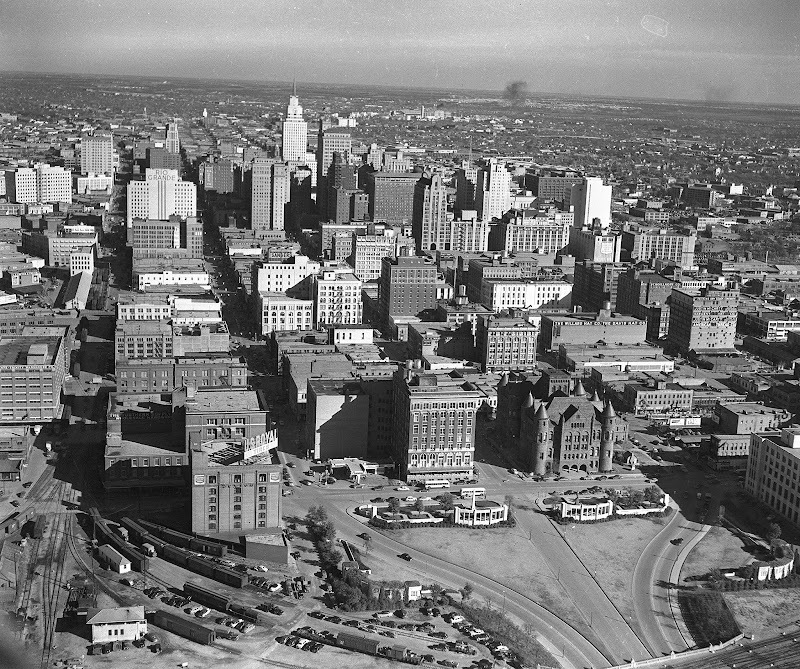 For a bigger view of the above photo, CLICK HERE. 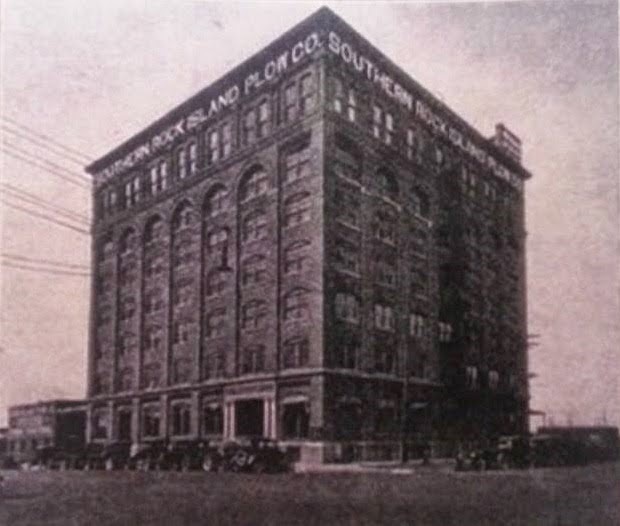 And here's a better look at the "Southern Rock Island Plow Company"
Building. 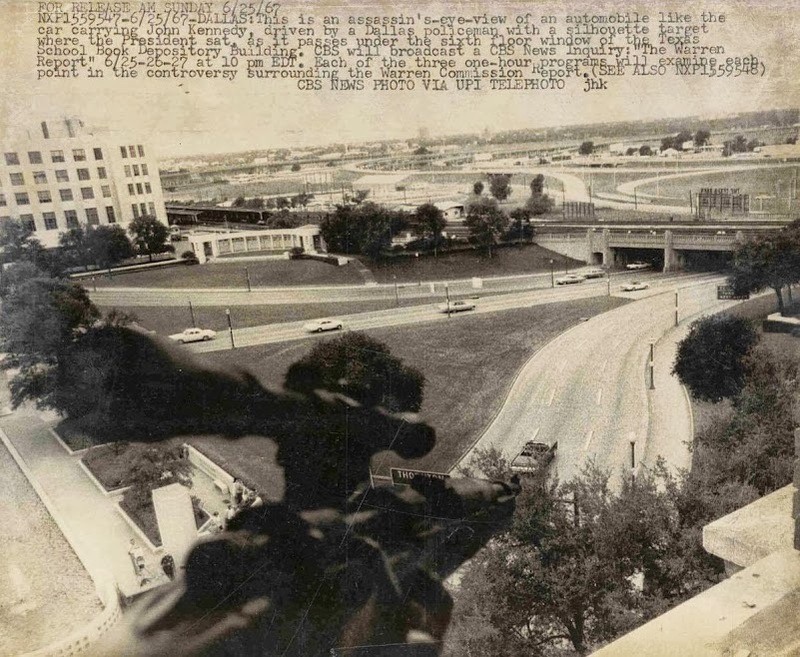 This picture was probably taken sometime in the 1920s. 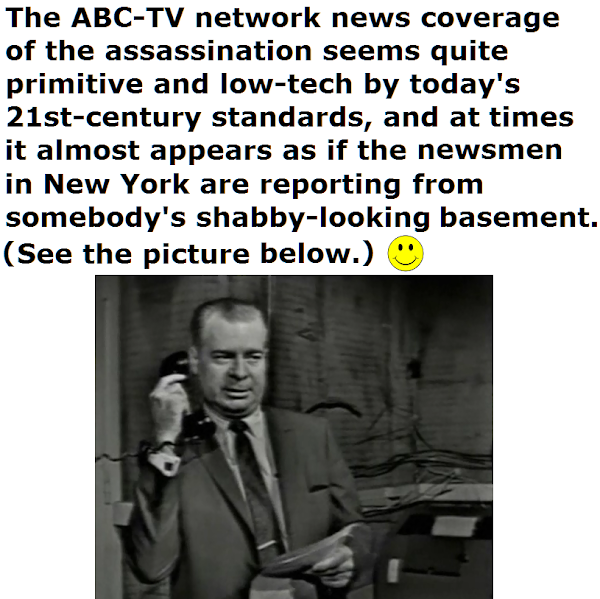 It looks eerily familiar....doesn't it? 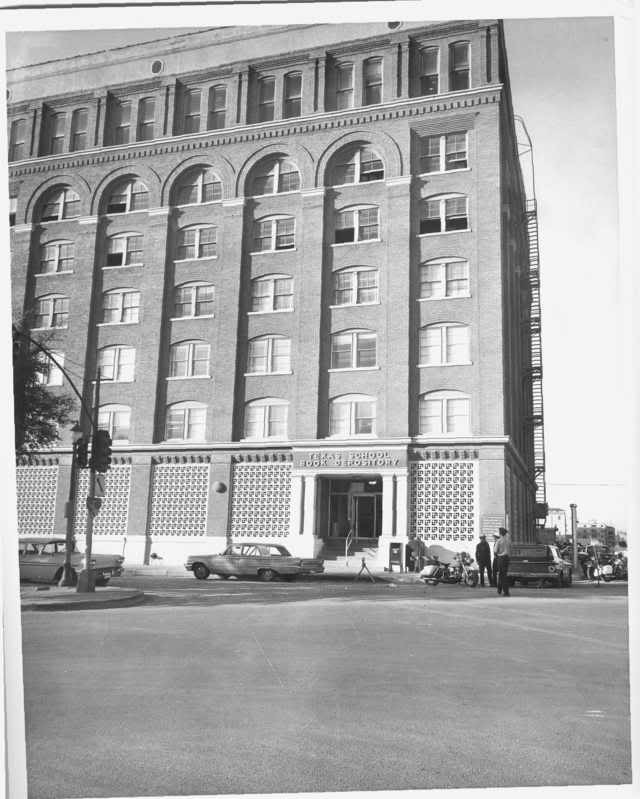 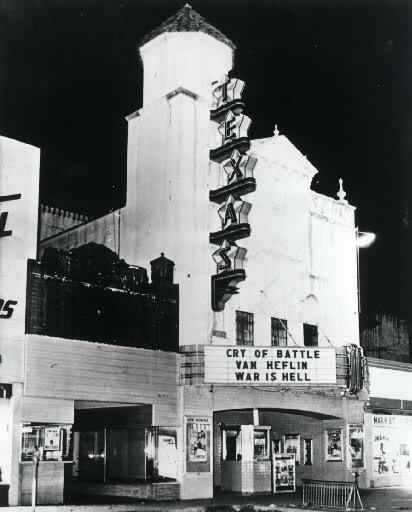 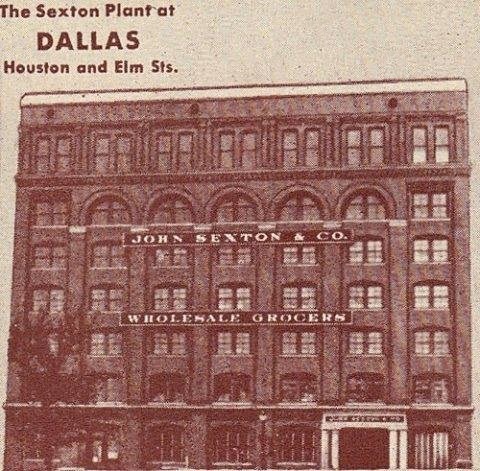 as the "Sexton Building" from 1941 to 1961.
sometime in the early 1960s (precise date unknown). 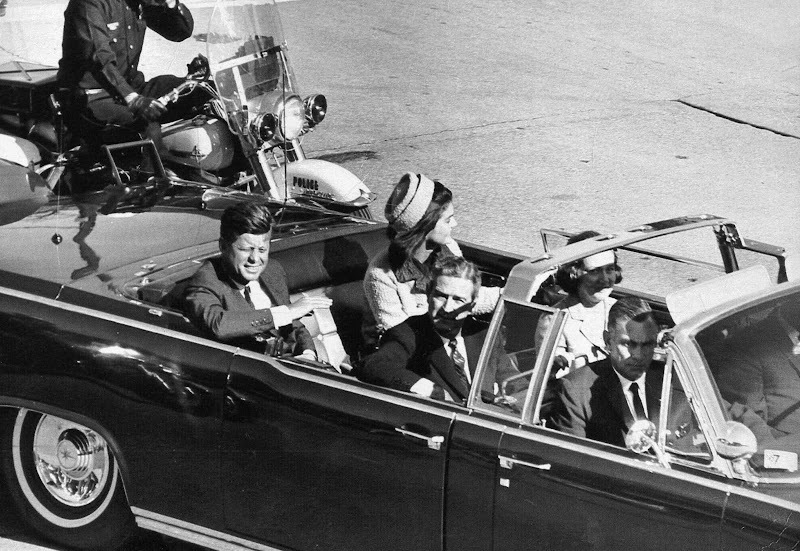 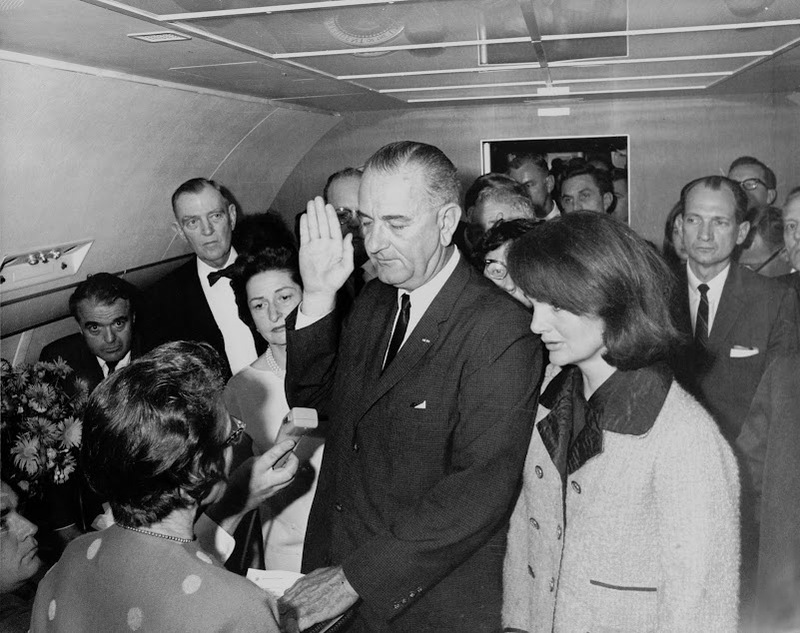 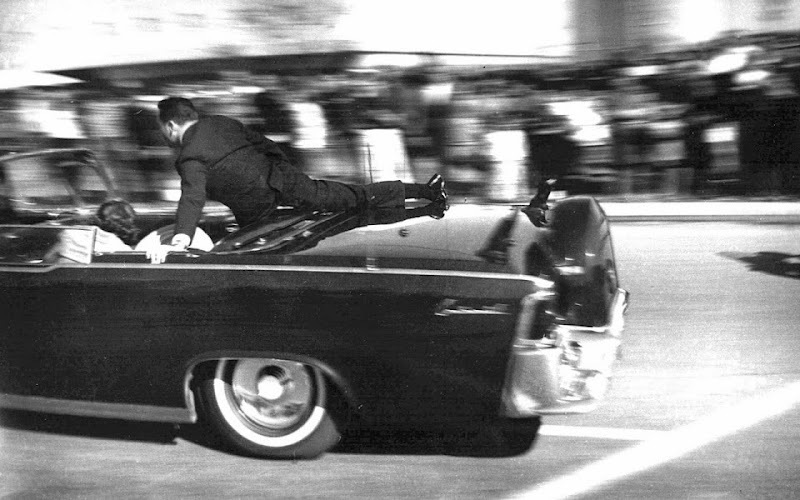 before JFK's assassination (March 16, 1962). 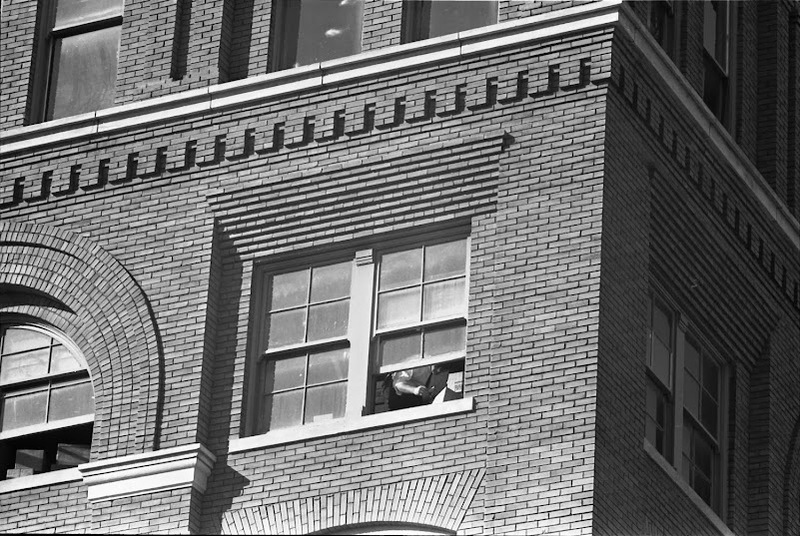 in this series, many of them taken from some rarely-seen vantage points. 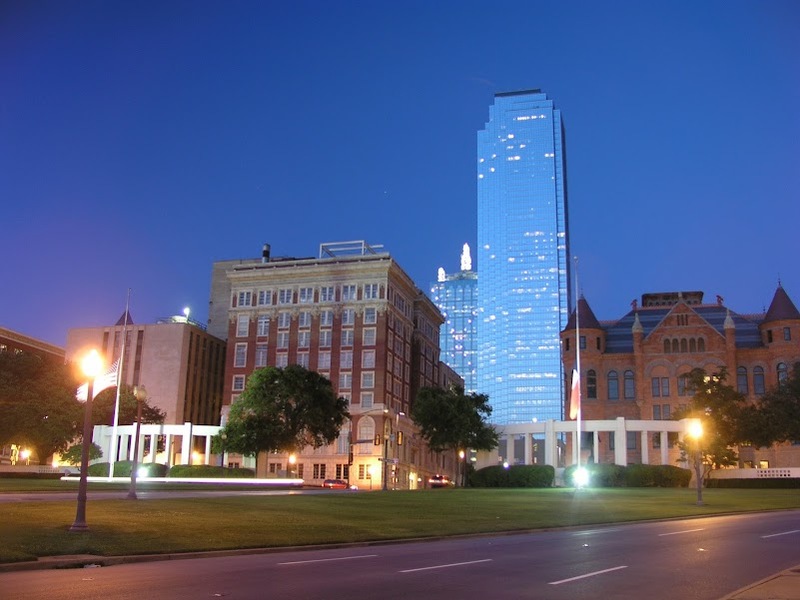 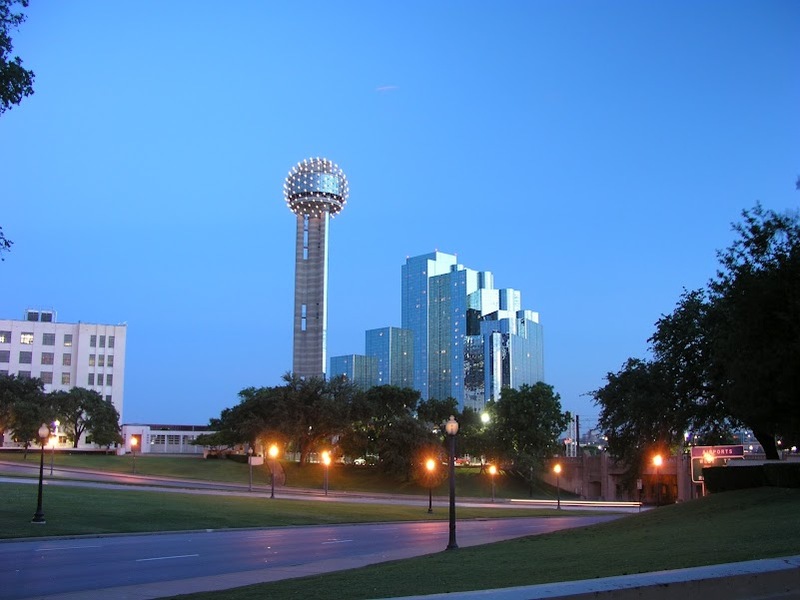 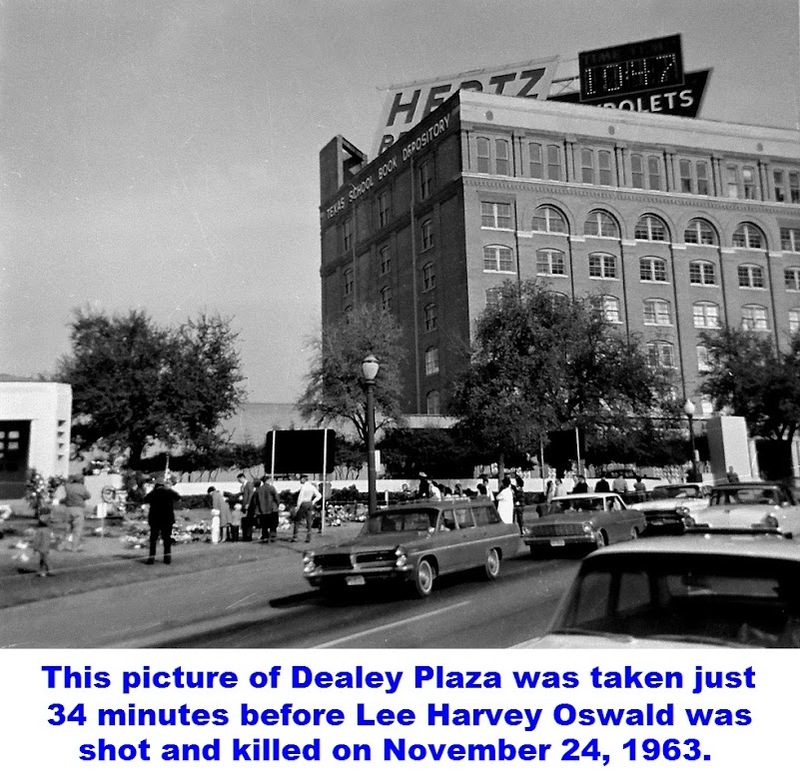 this Dealey Plaza series, GO HERE. 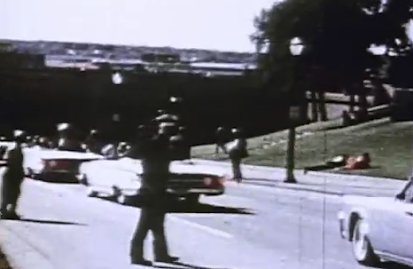 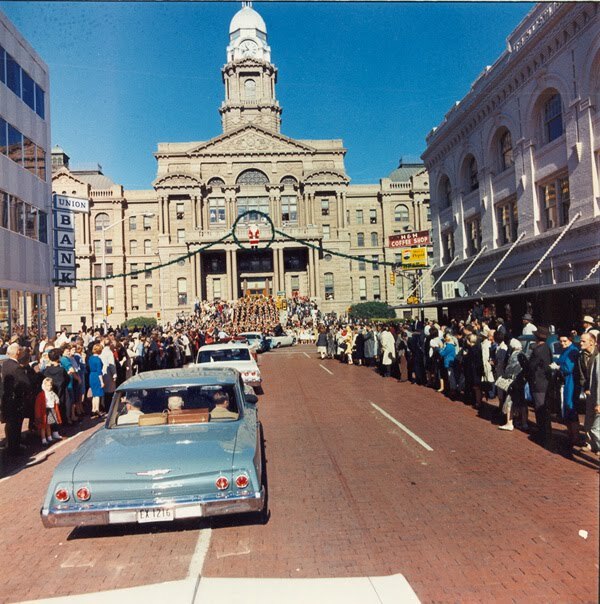 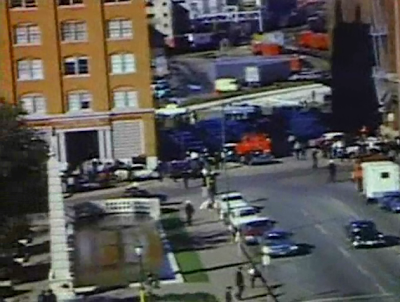 passes through Dealey Plaza in 1976. 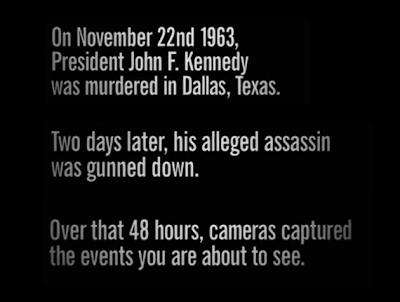 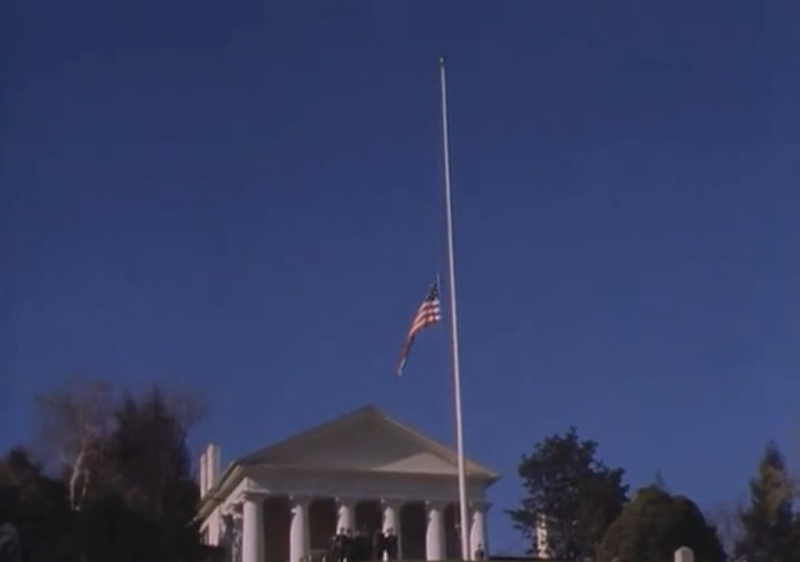 November 22nd to kill President Kennedy. 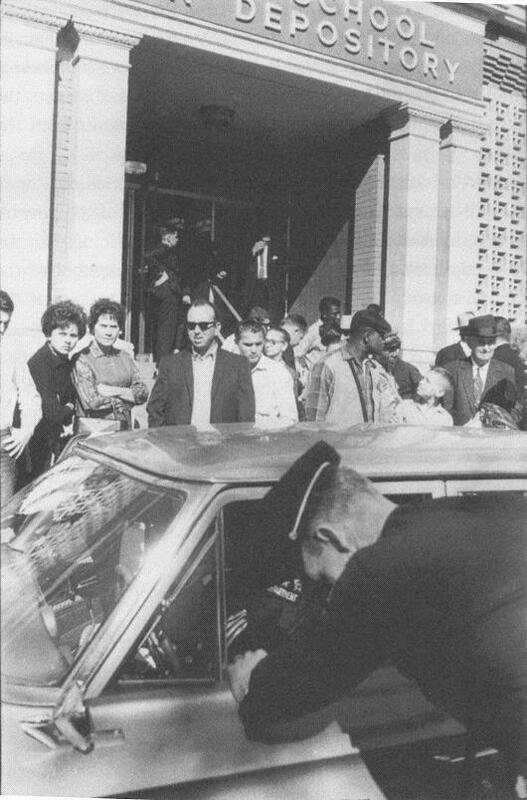 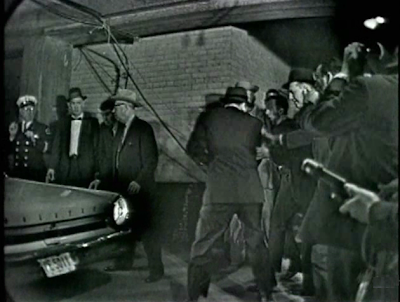 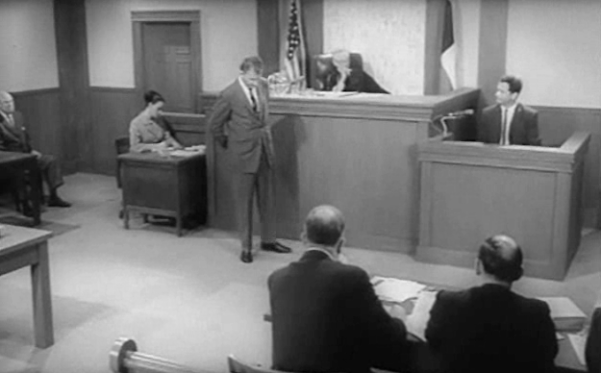 Witnesses are questioned by police after the assassination. 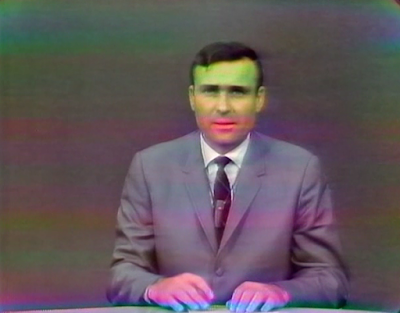 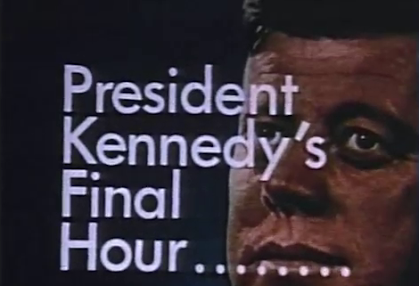 at about 6:15 PM (CST) on November 22, 1963. 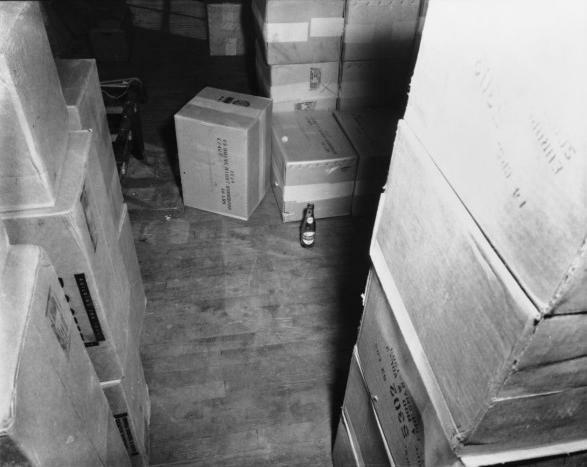 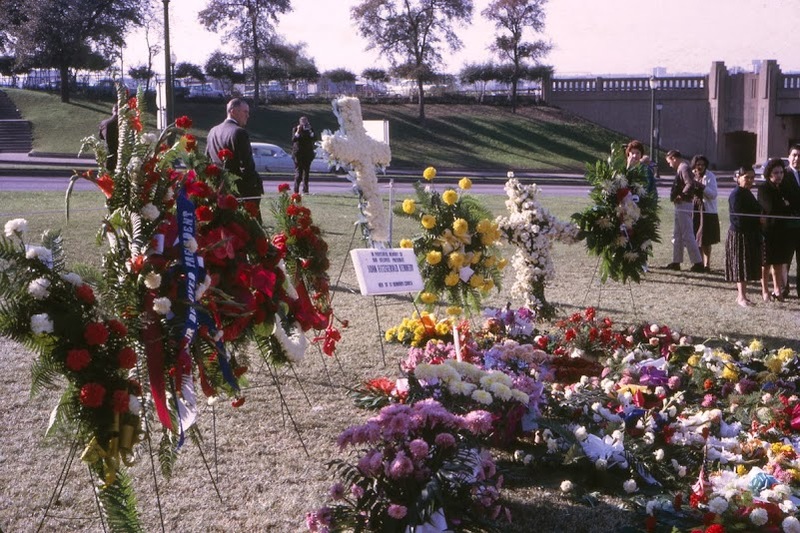 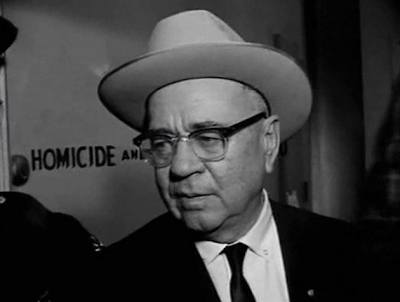 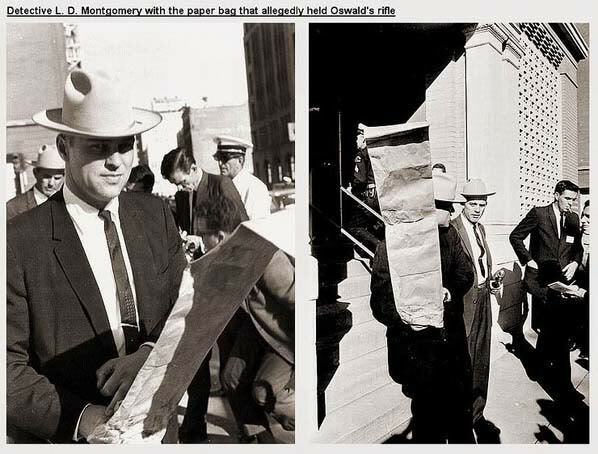 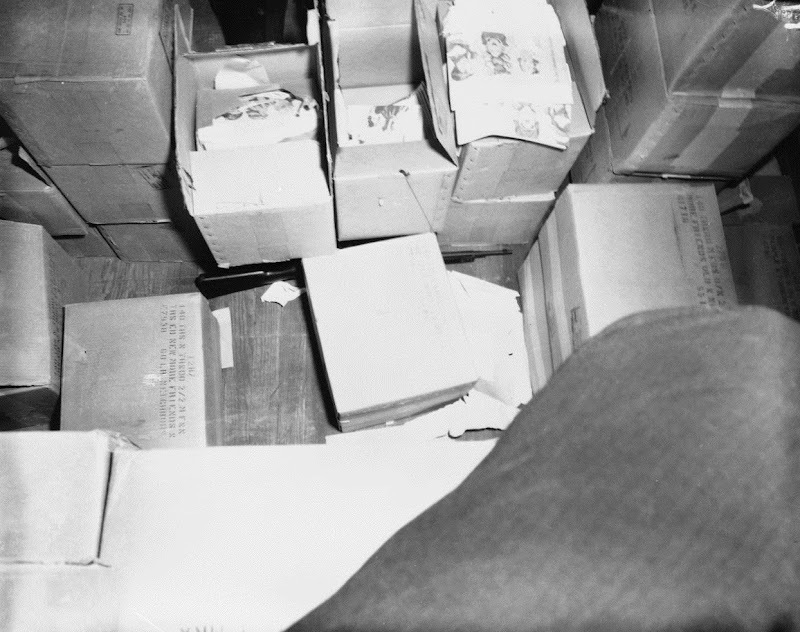 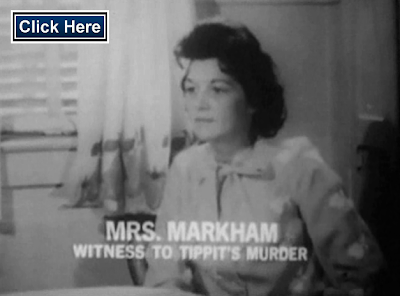 Many more photos of the Tippit crime scene can be found HERE. 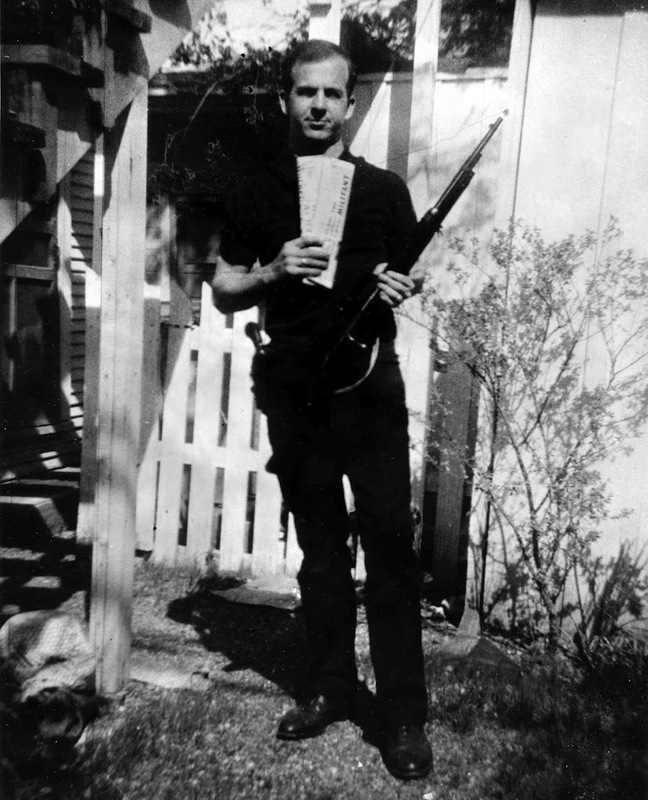 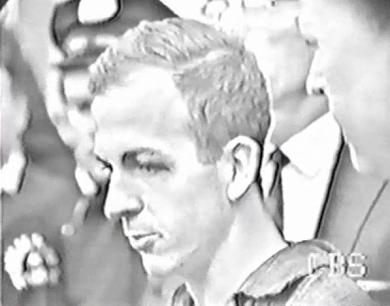 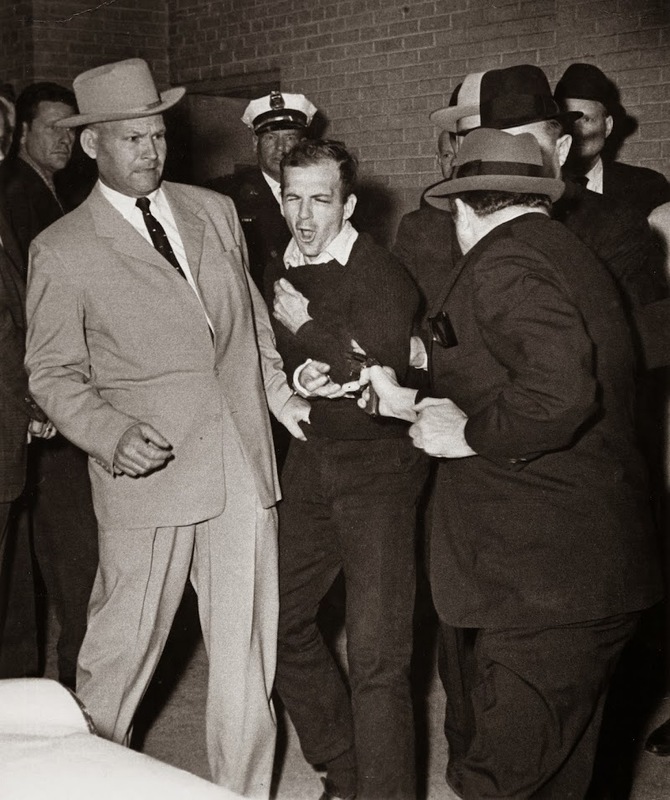 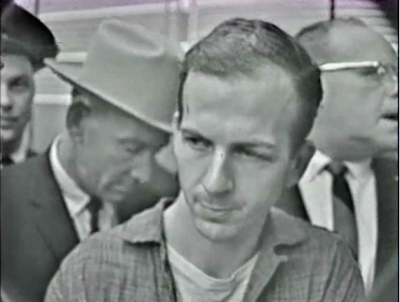 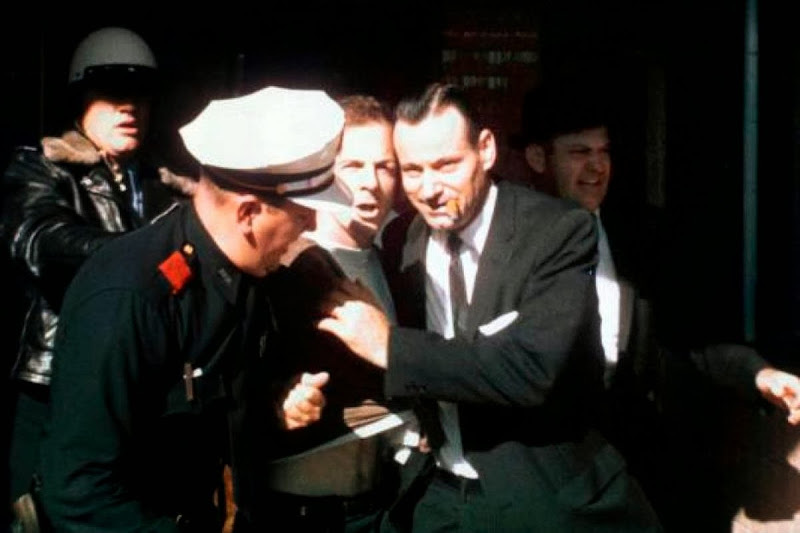 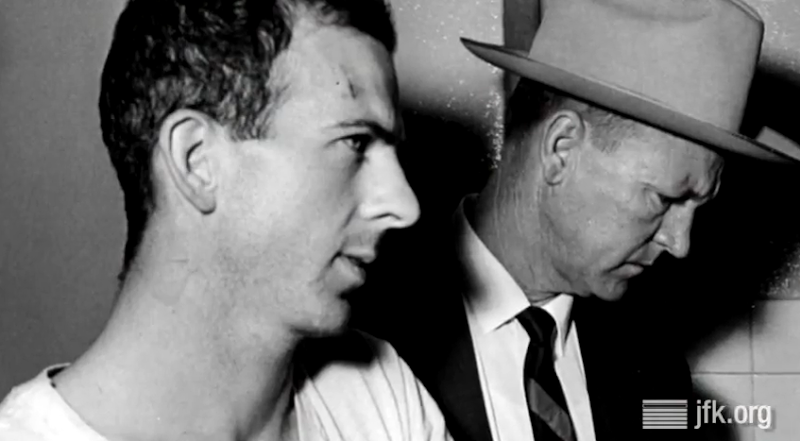 A bruised and handcuffed Lee Harvey Oswald. 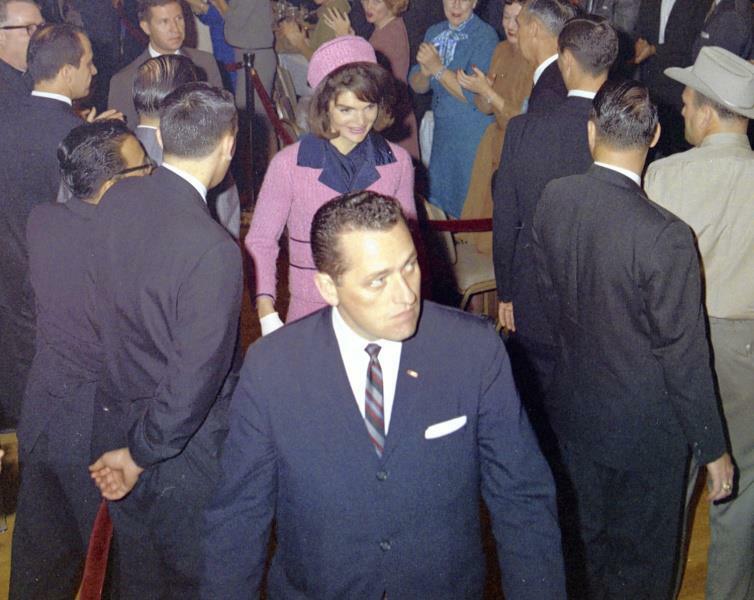 at Love Field, as Jacqueline Kennedy and others look on. 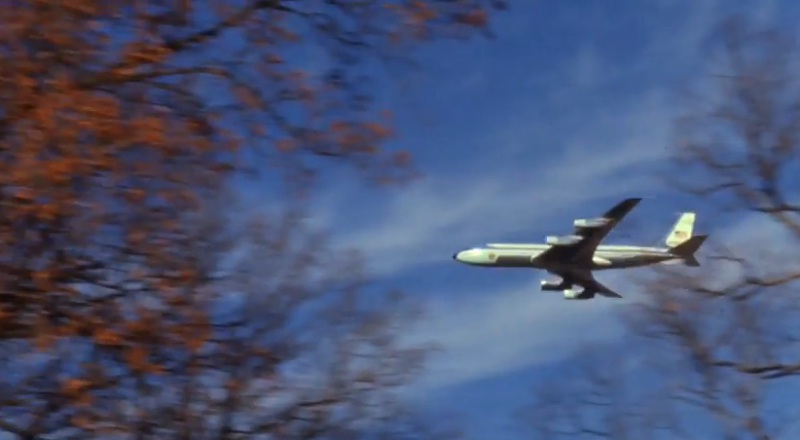 for the trip back to Washington. 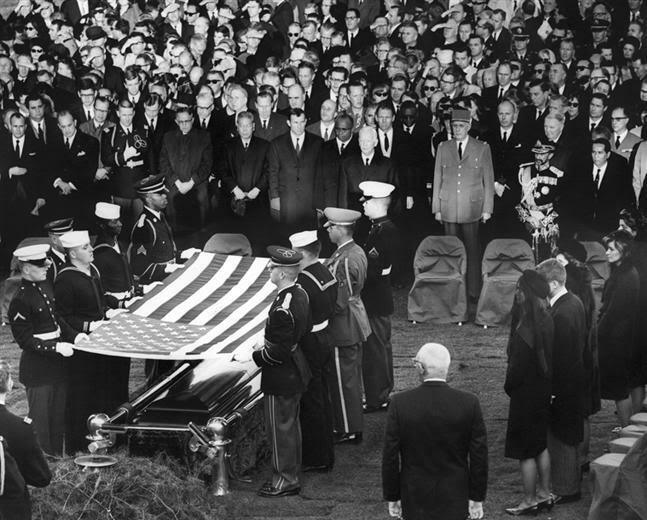 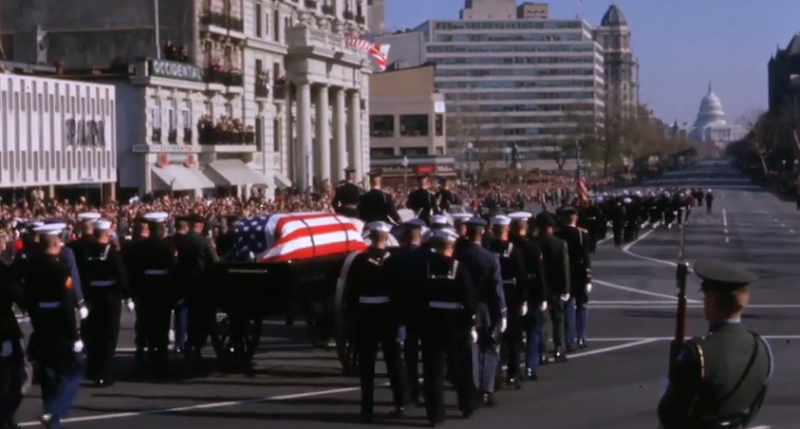 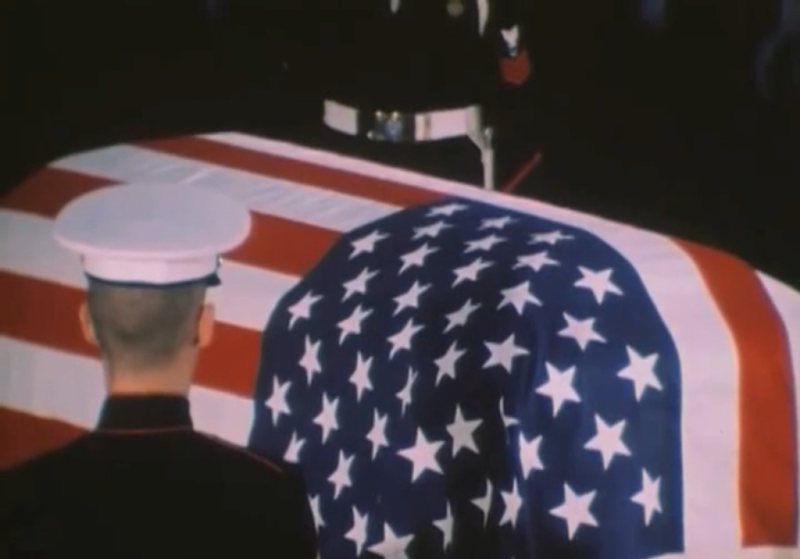 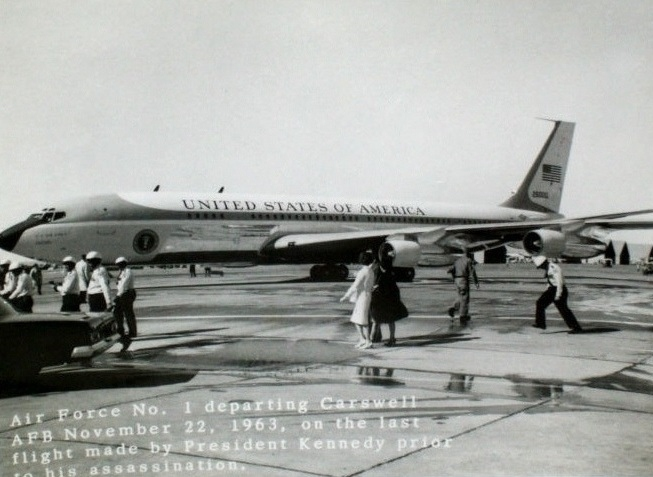 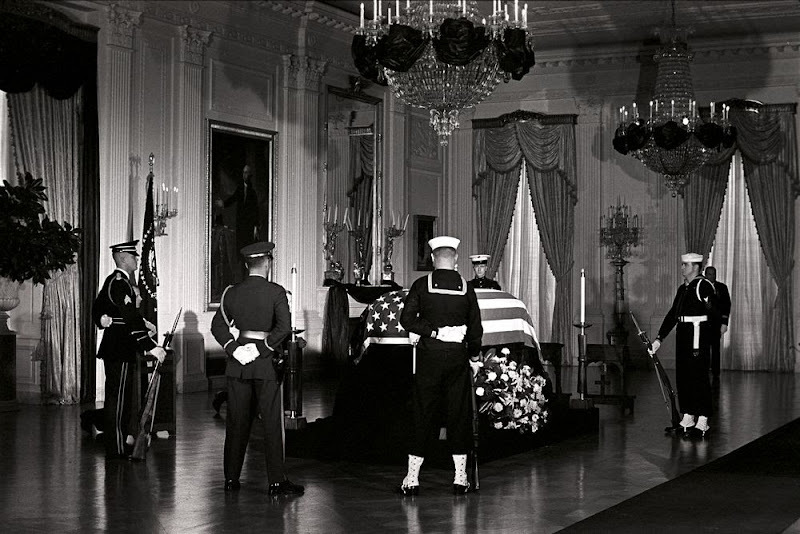 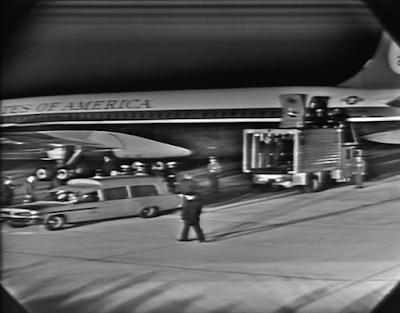 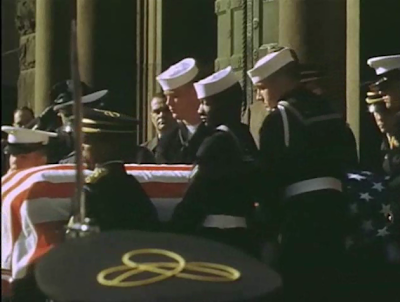 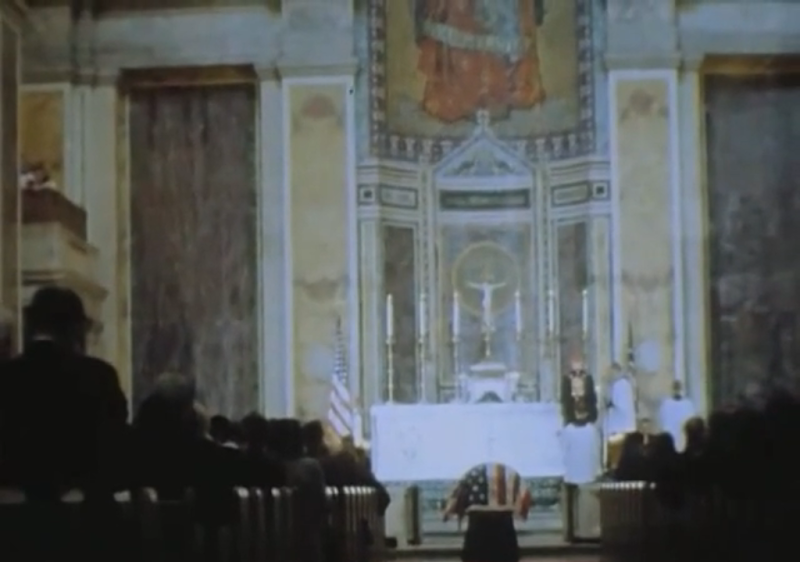 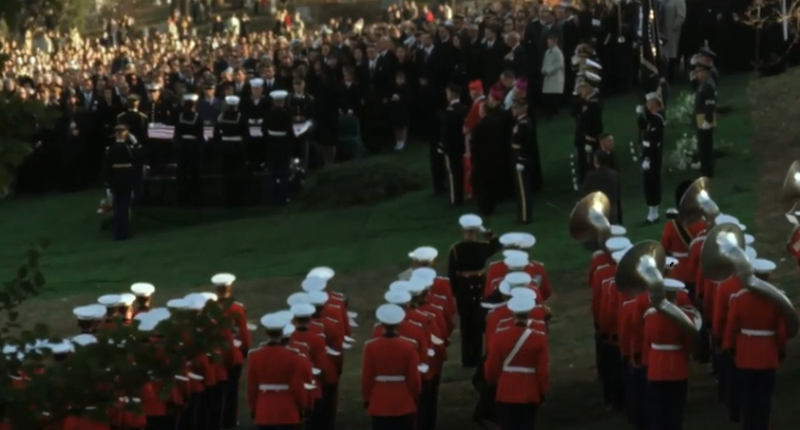 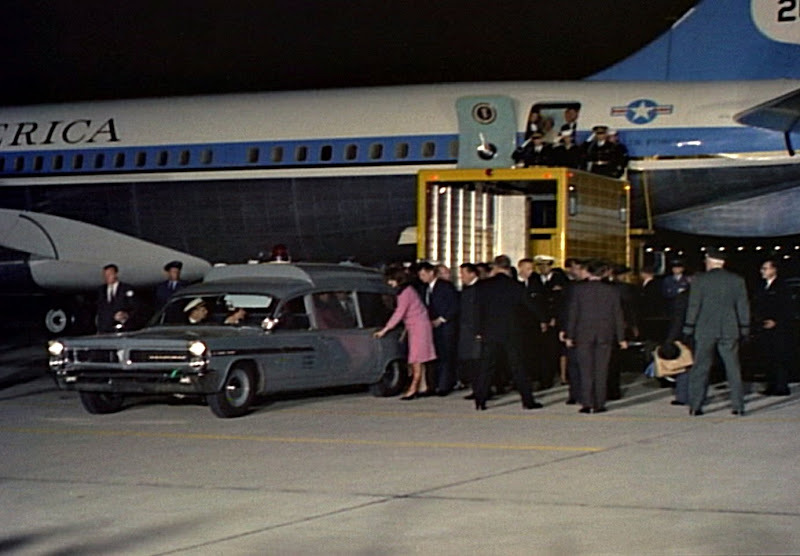 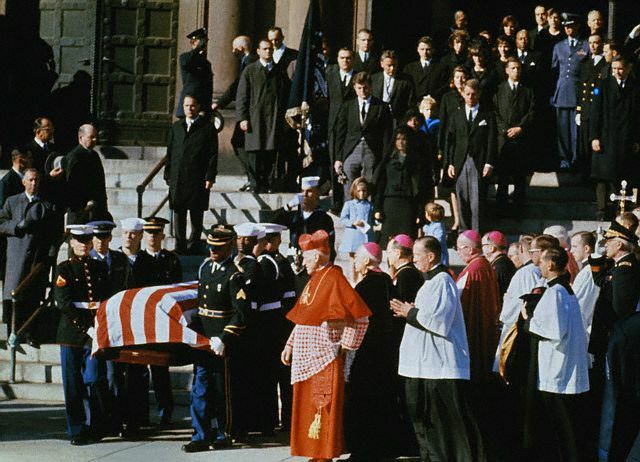 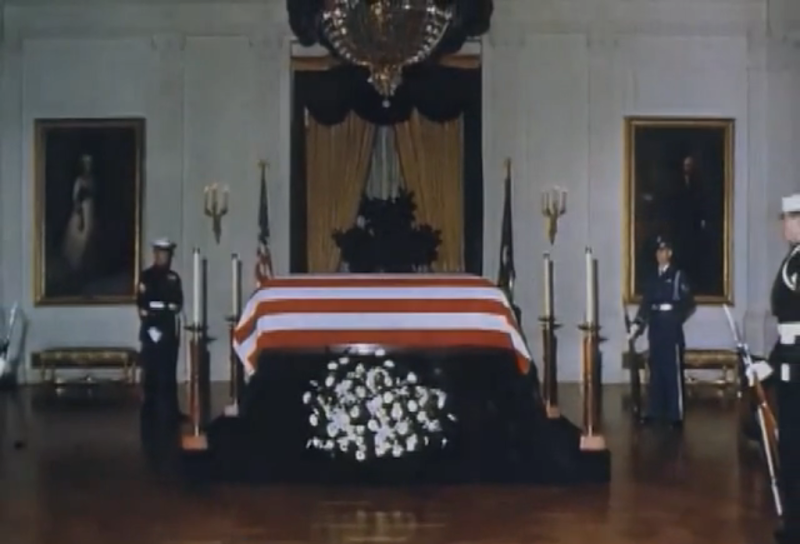 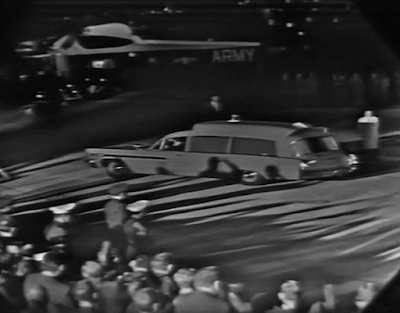 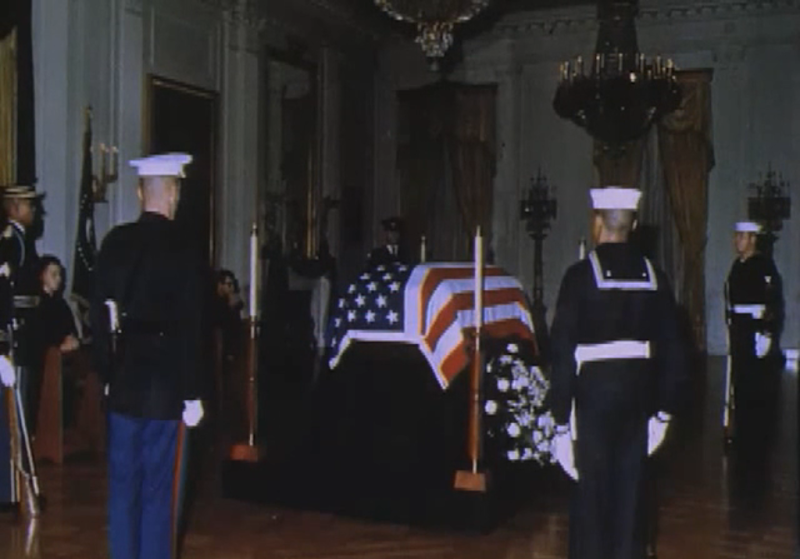 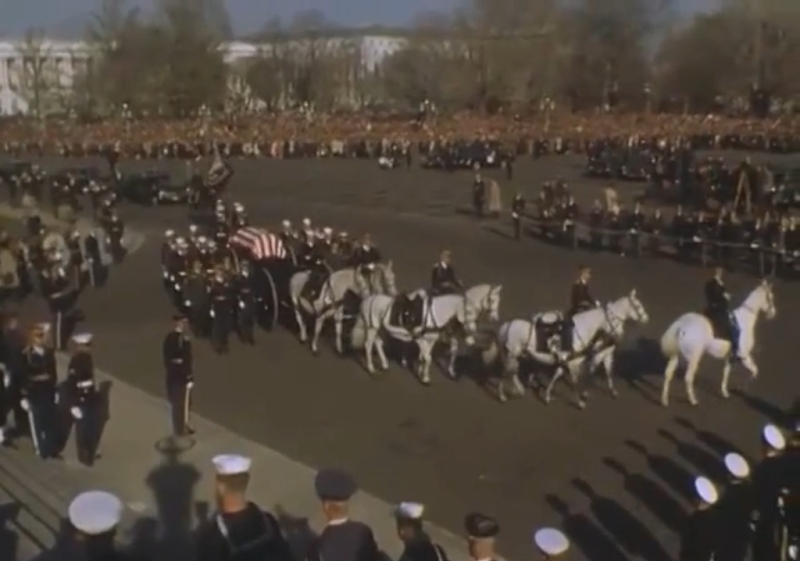 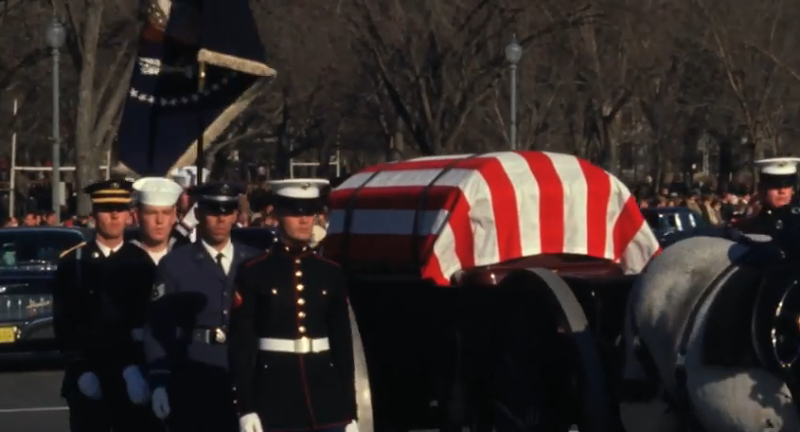 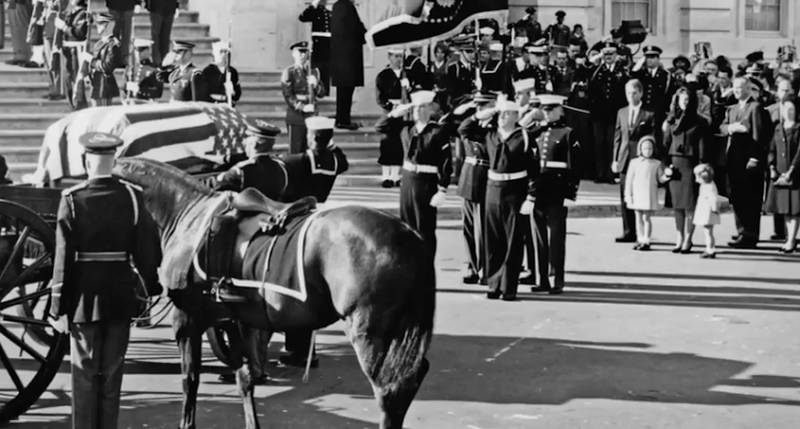 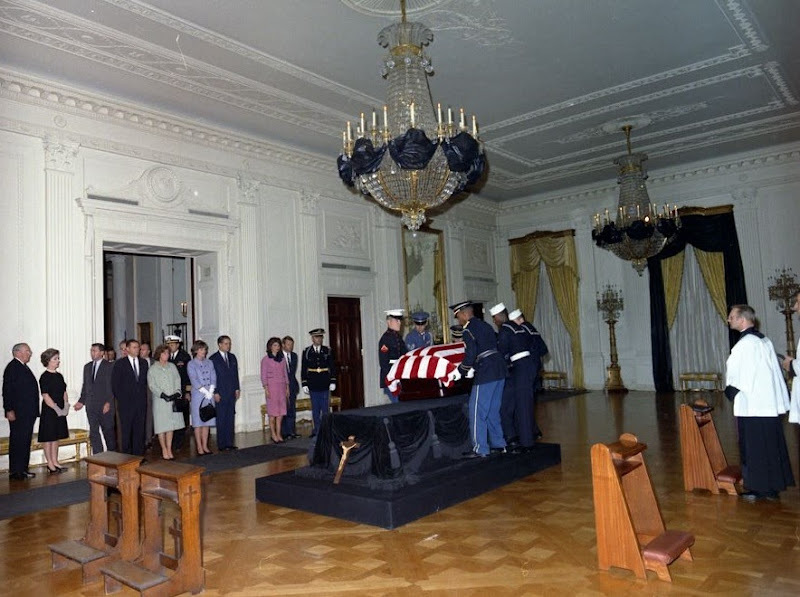 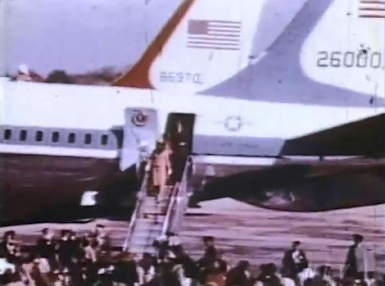 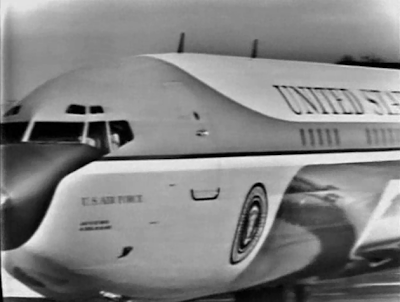 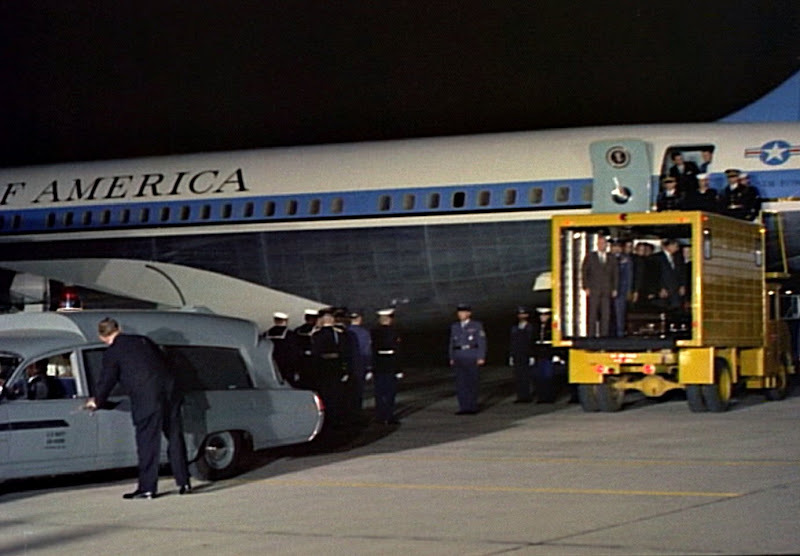 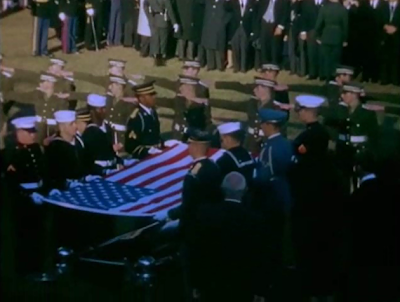 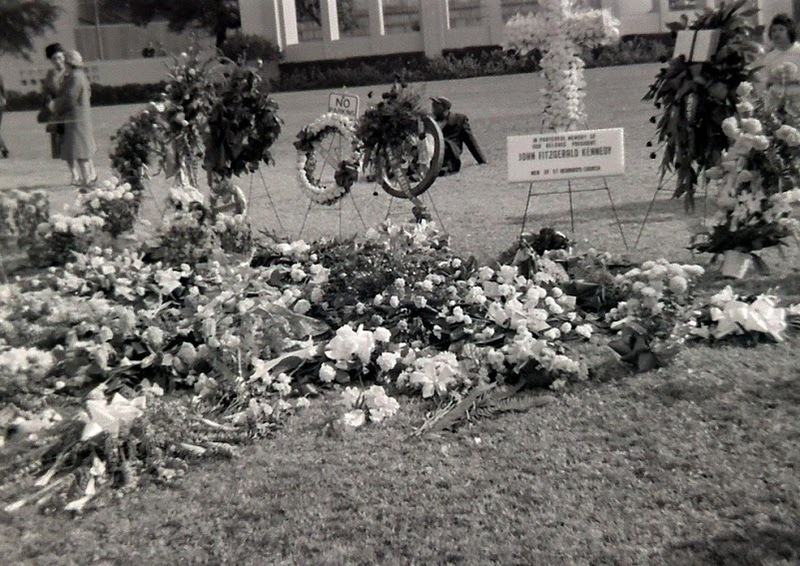 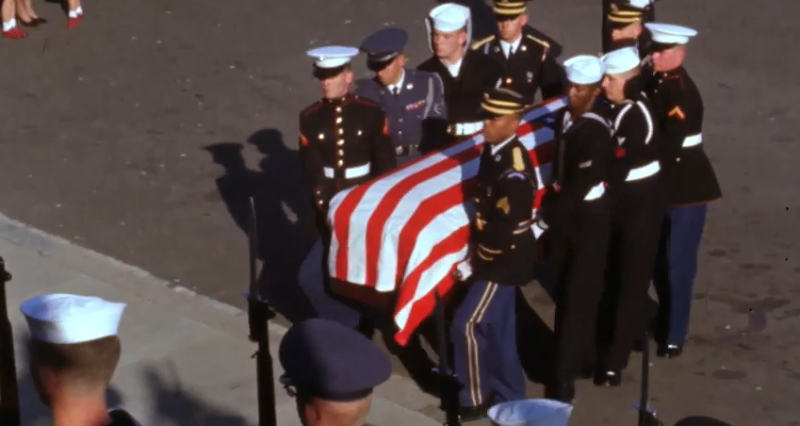 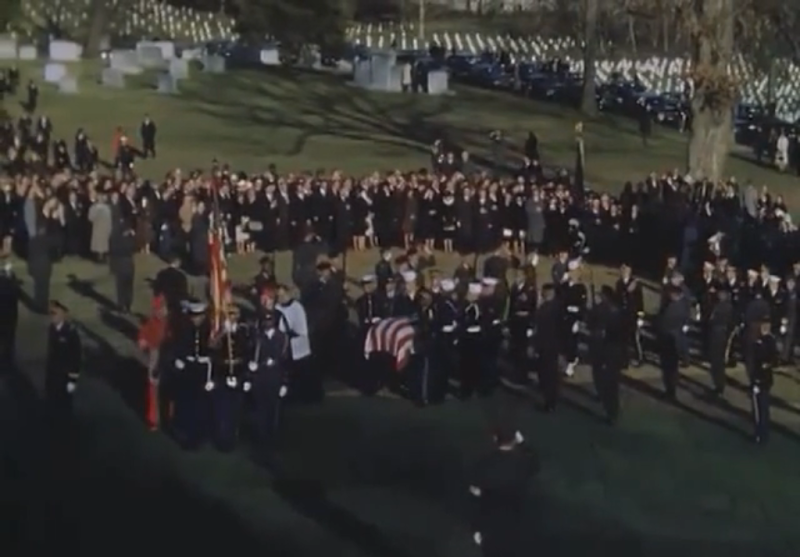 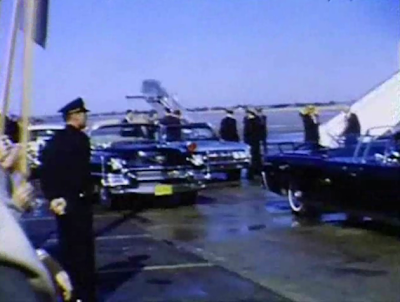 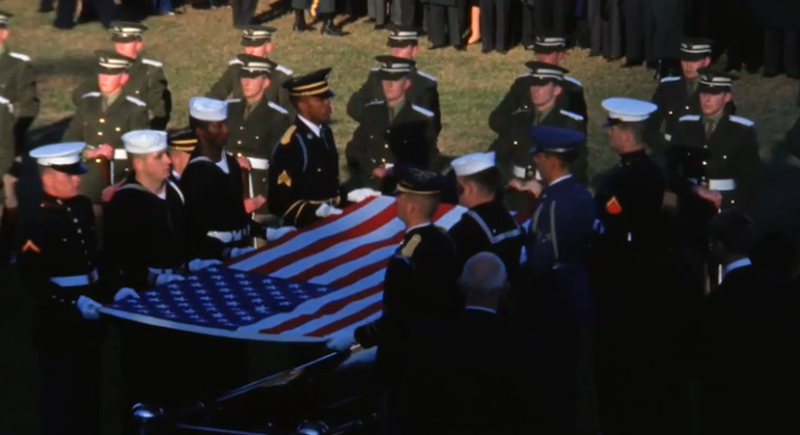 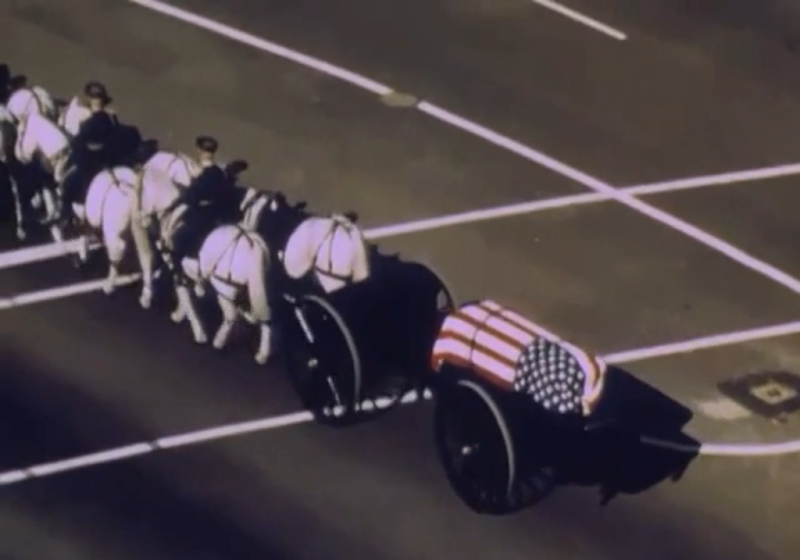 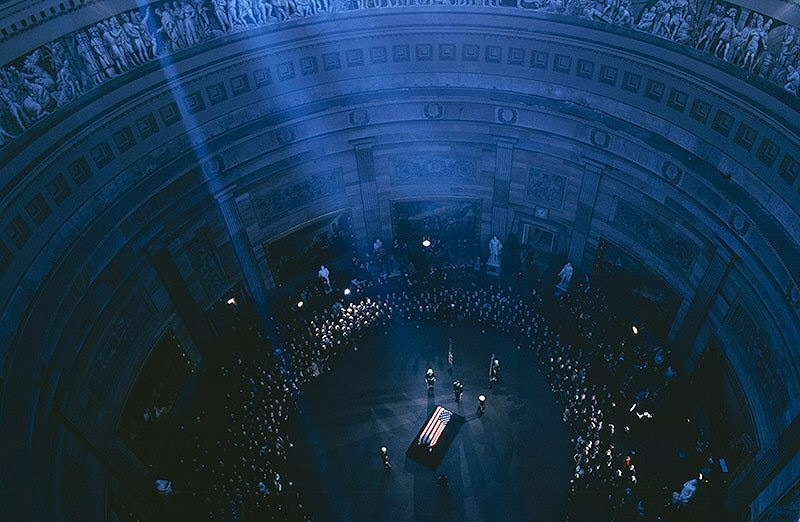 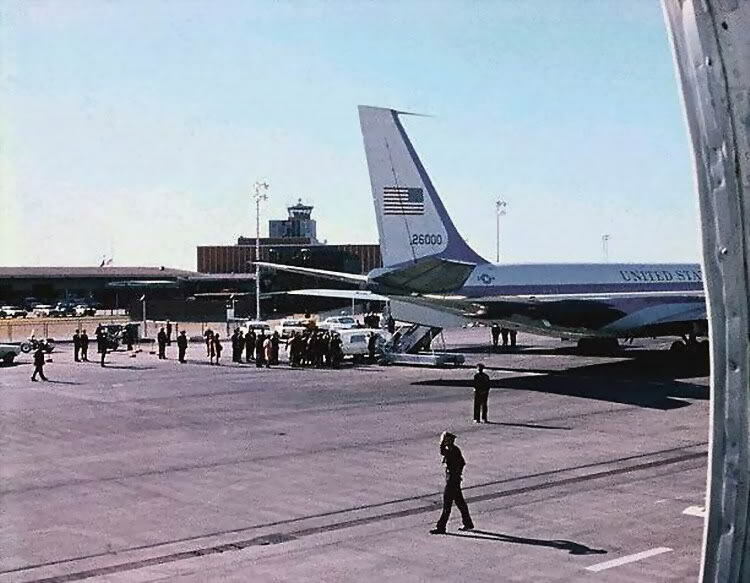 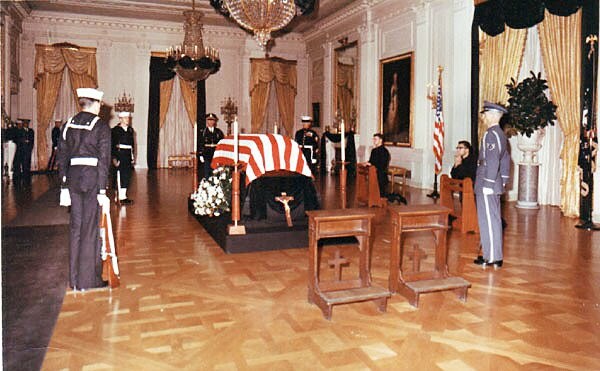 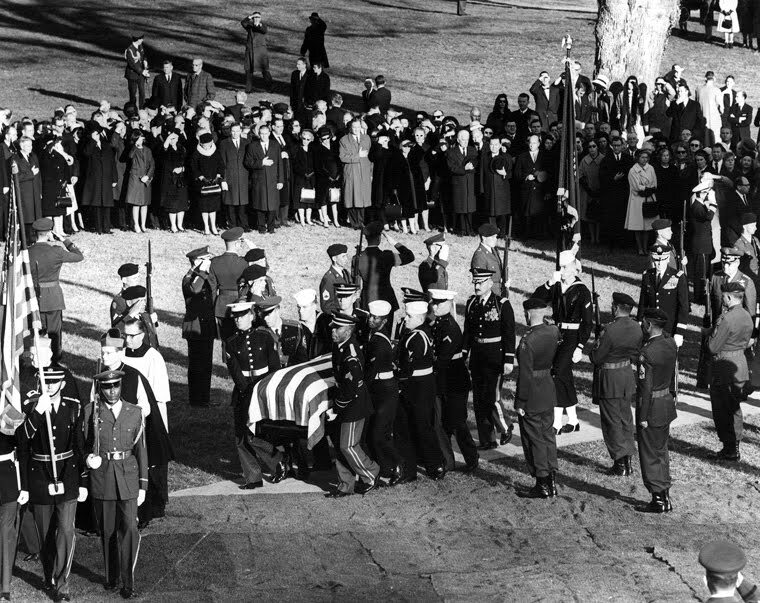 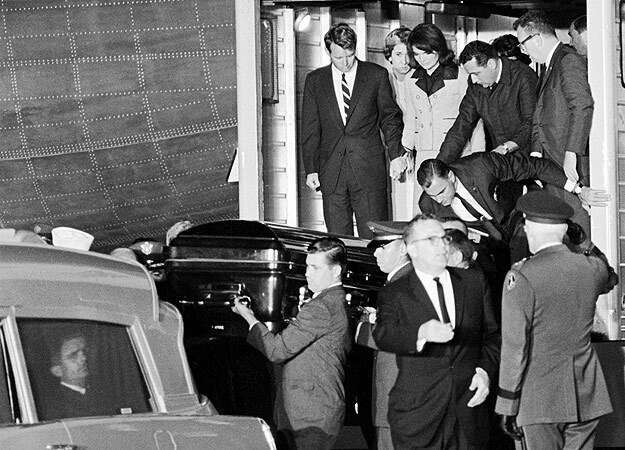 President Kennedy's casket was being put on the plane. 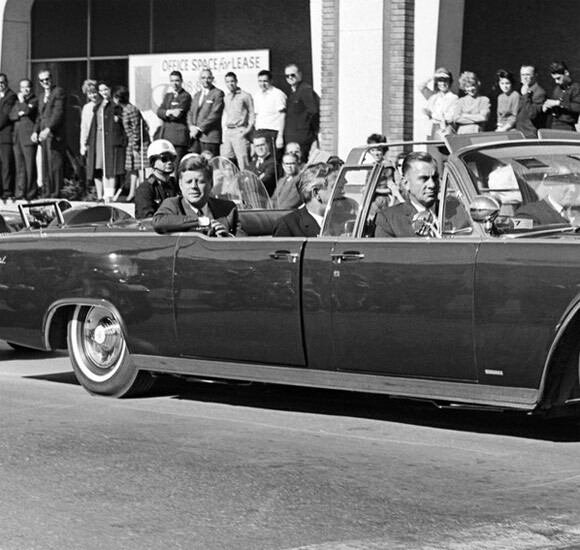 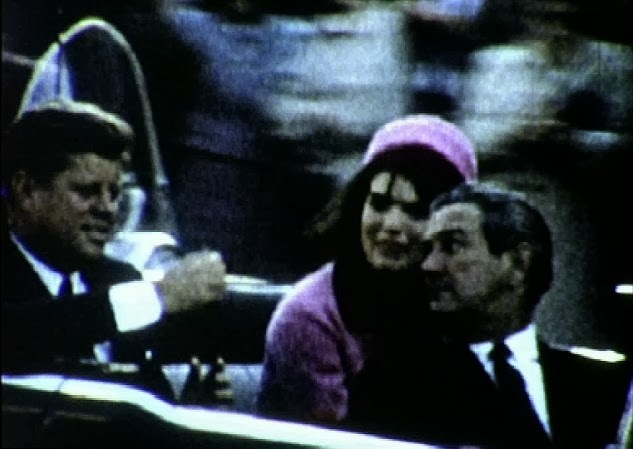 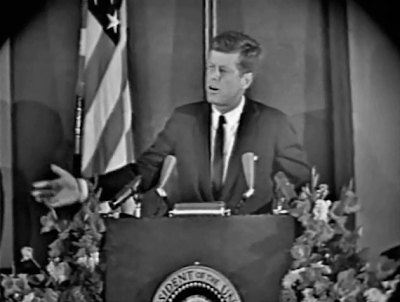 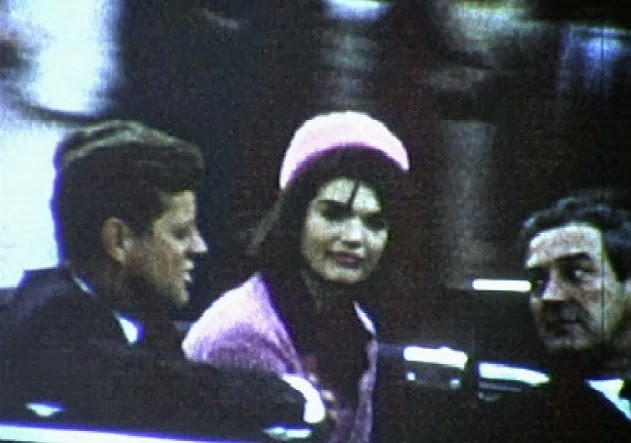 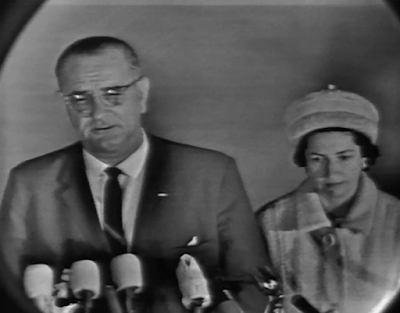 in Dallas at 2:39 PM (CST), November 22, 1963.
approximately 4:30 AM (EST), Saturday, November 23, 1963.
looks on. 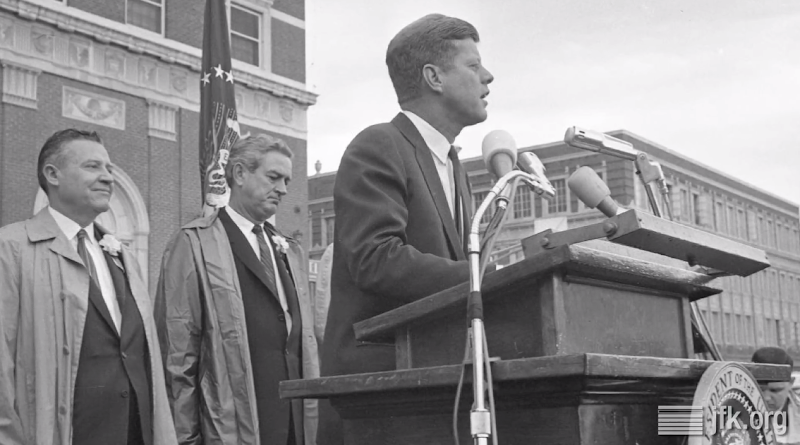 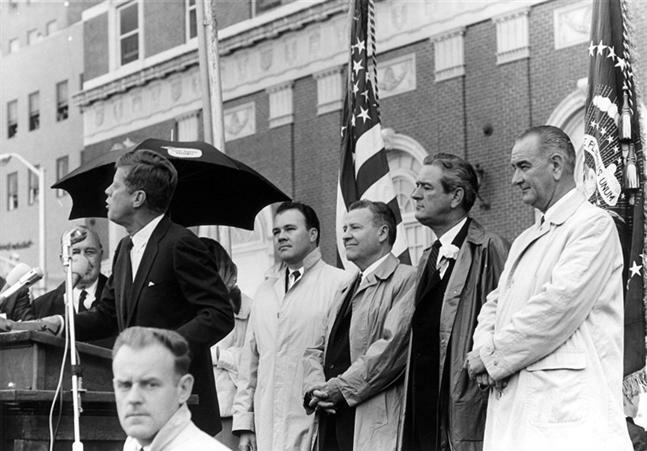 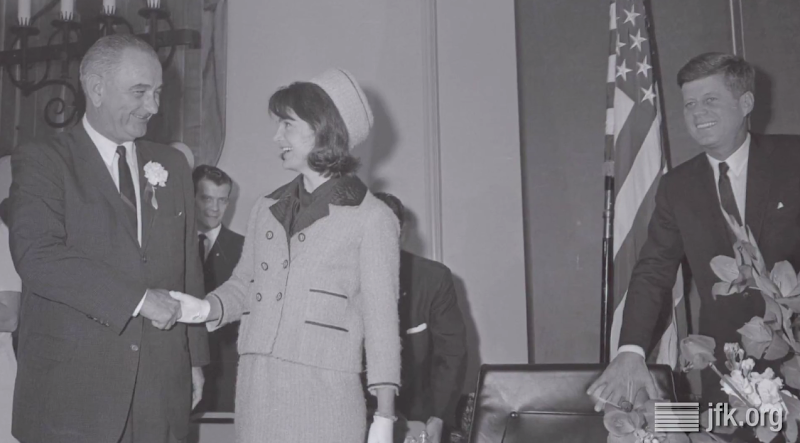 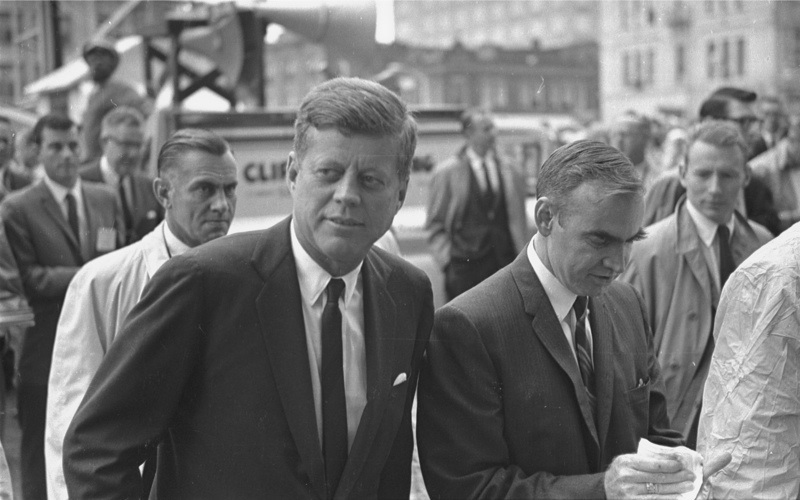 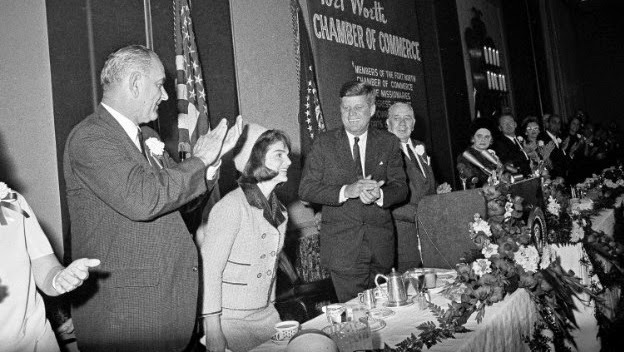 Standing beside Jackie is Attorney General Robert Kennedy. 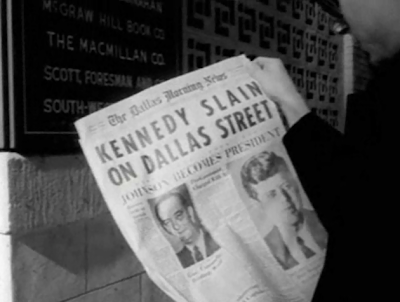 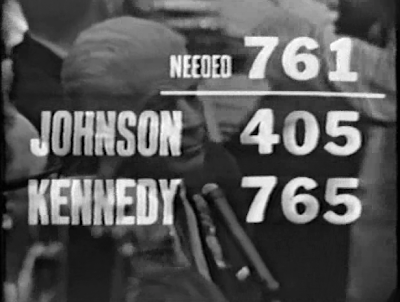 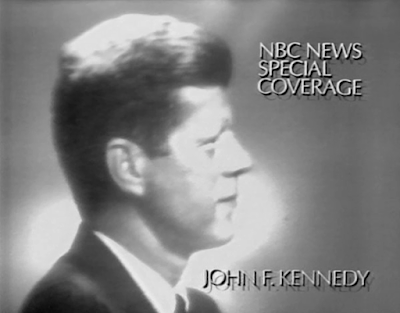 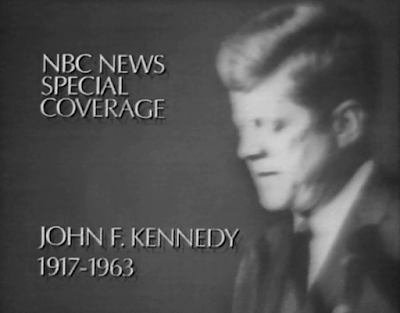 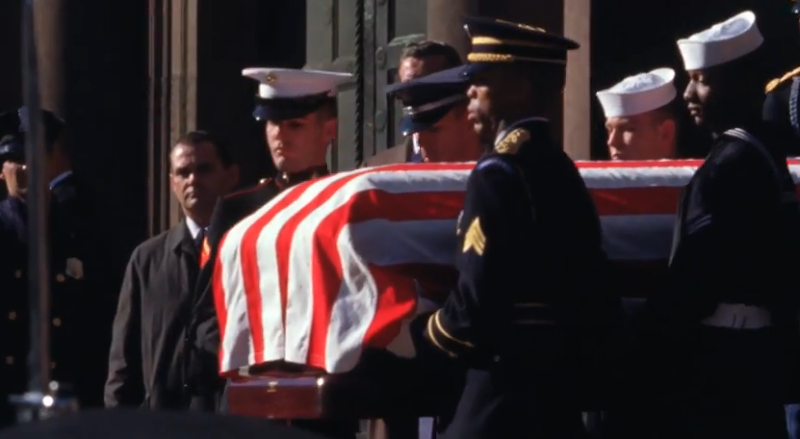 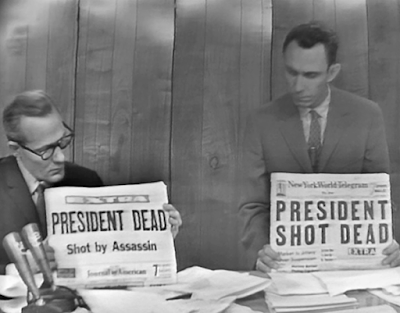 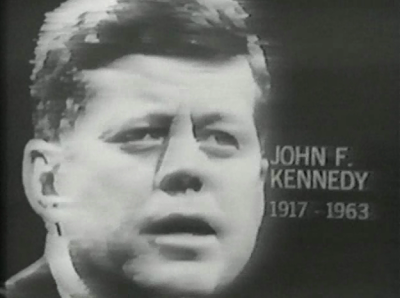 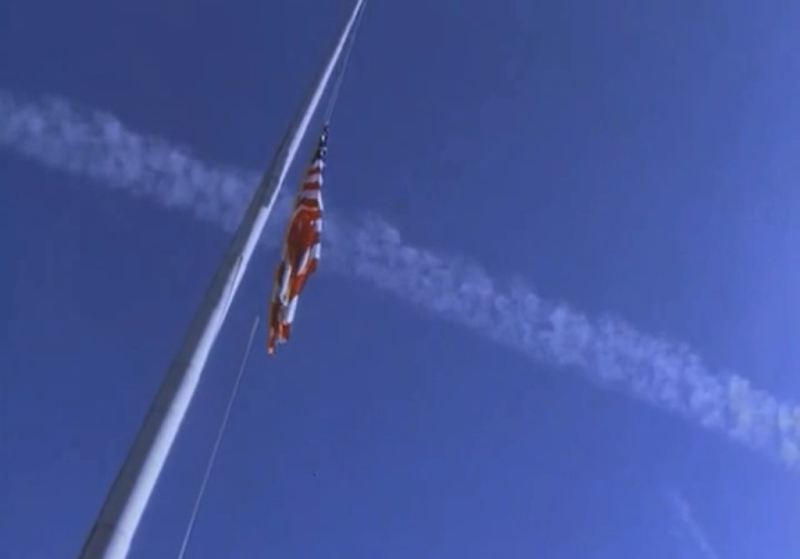 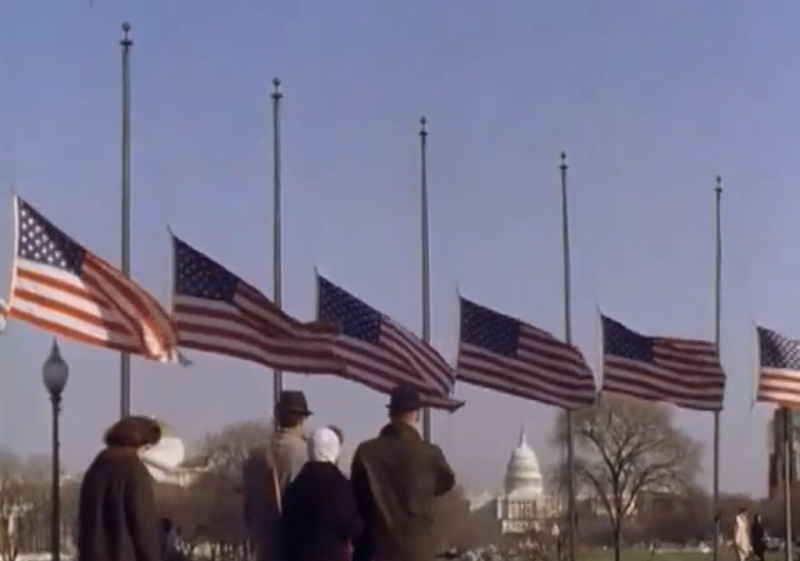 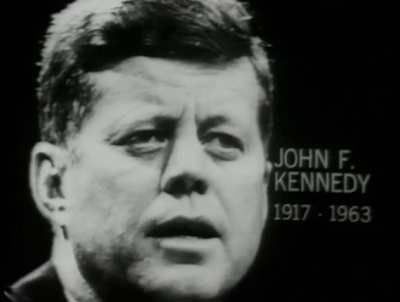 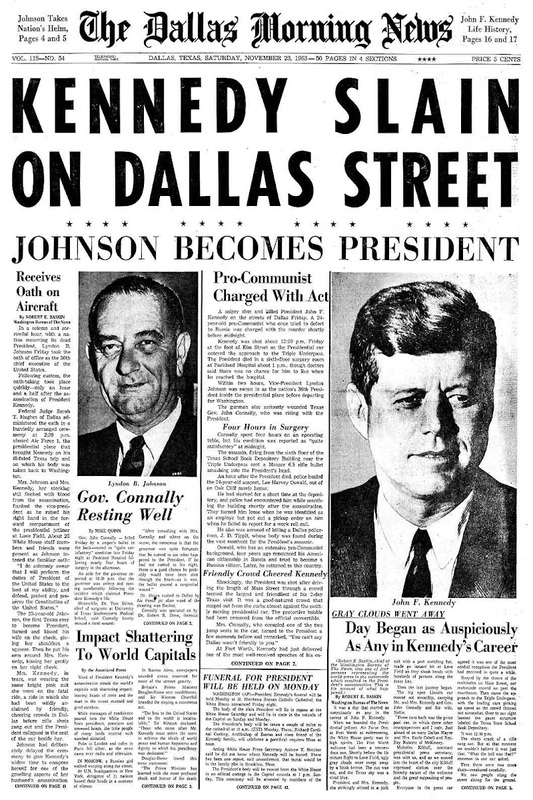 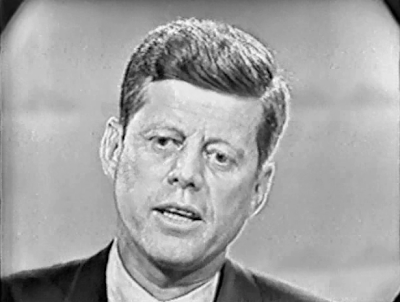 11/22/63 following the announcement of JFK's death. 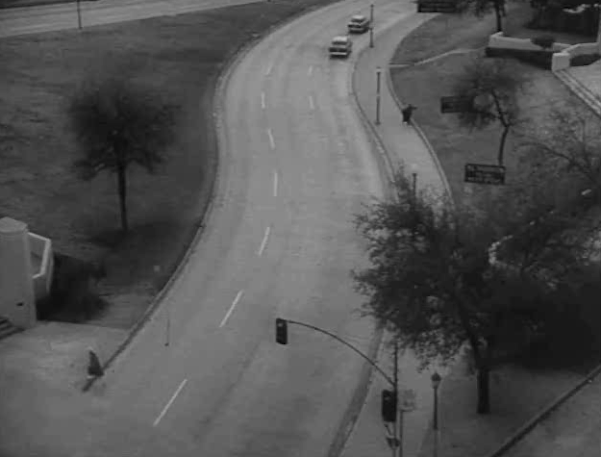 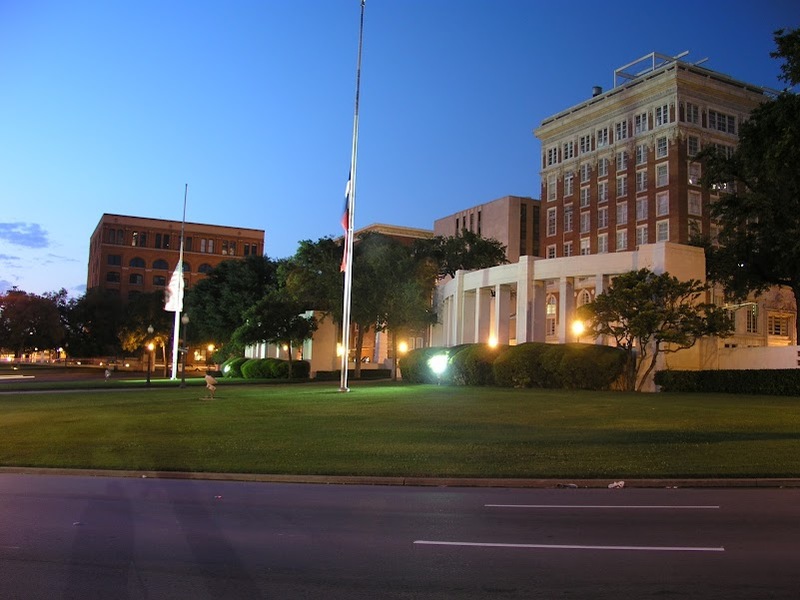 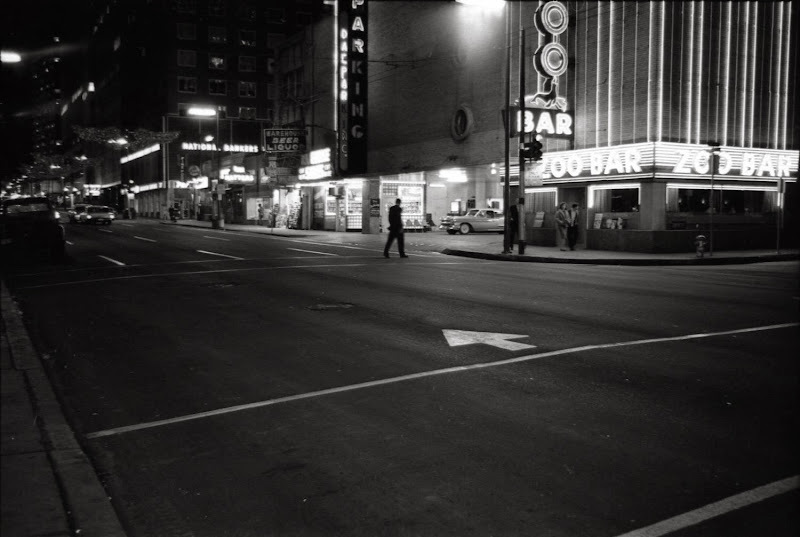 nearly deserted on the night of President Kennedy's assassination. 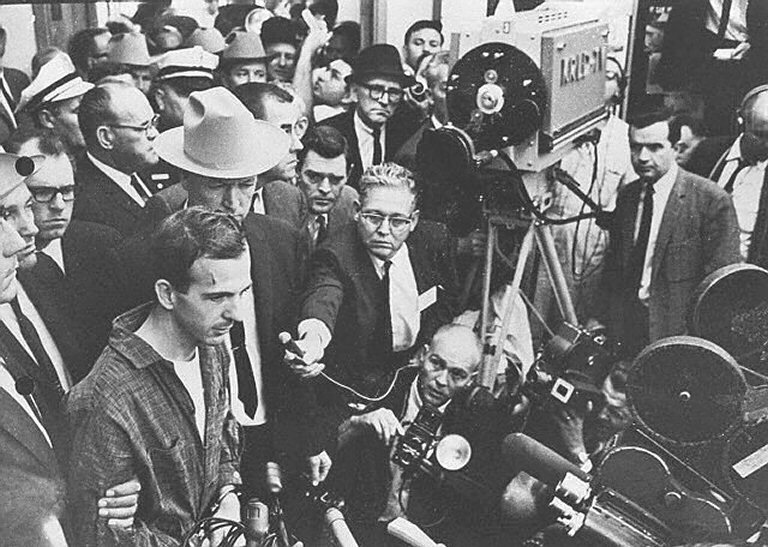 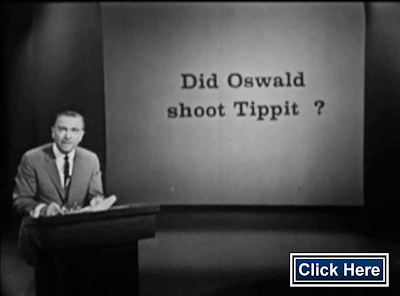 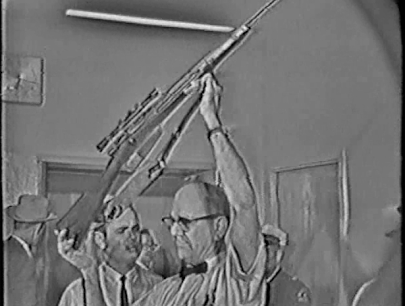 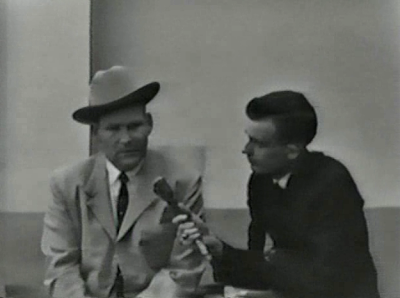 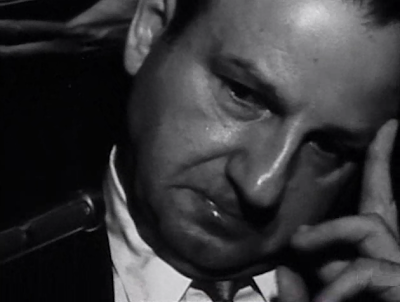 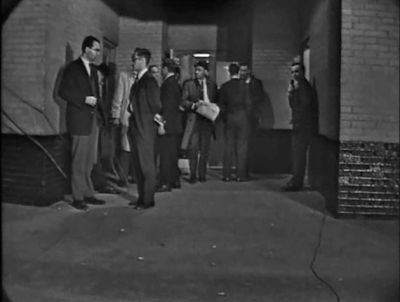 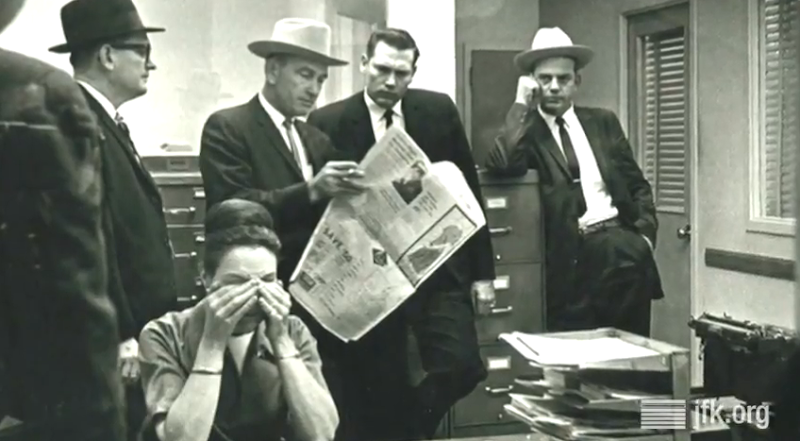 Lee Harvey Oswald's "Midnight Press Conference". 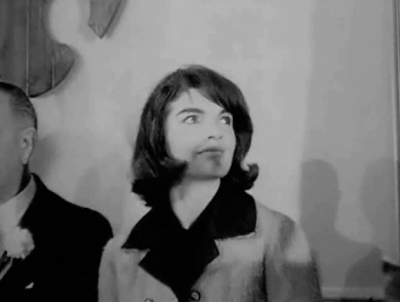 "I really don't know what this situation is about." 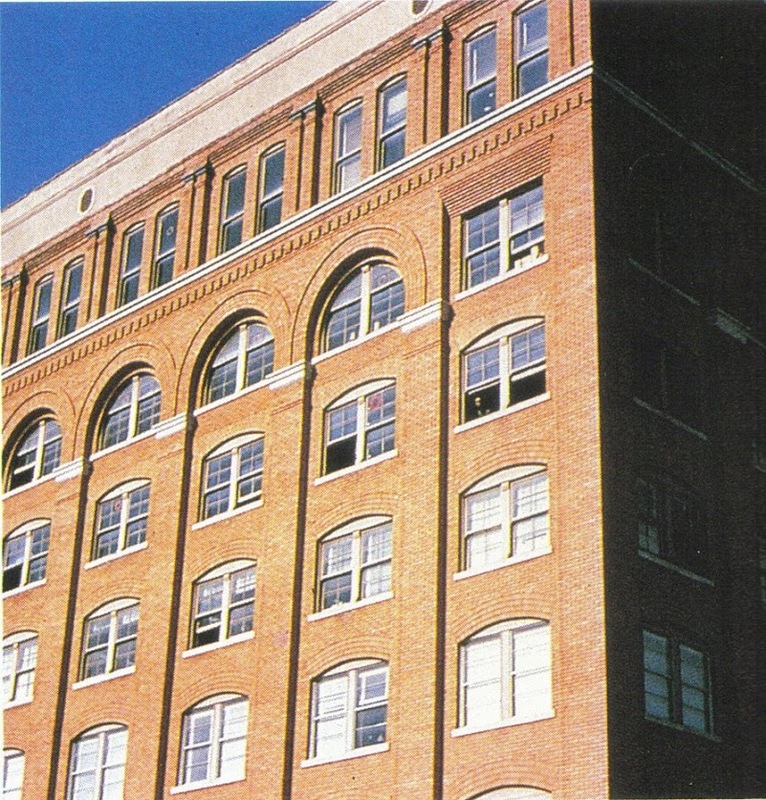 that very location (the TSBD in Dallas). 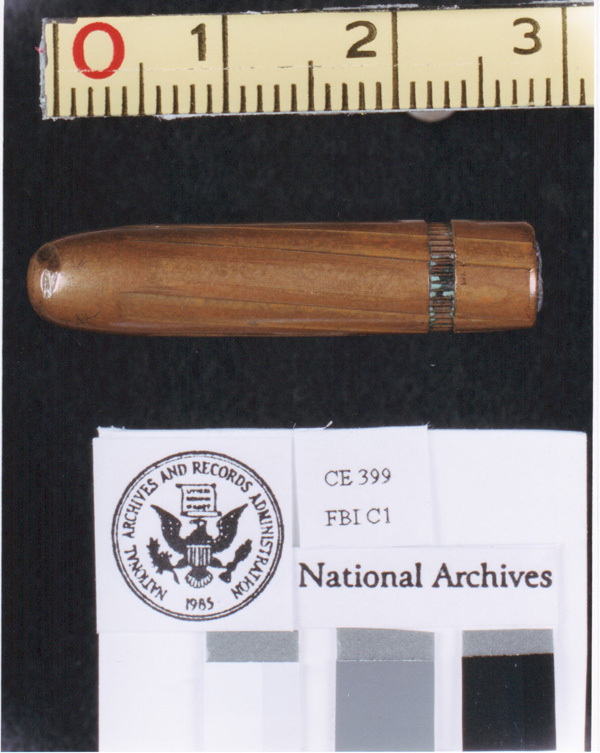 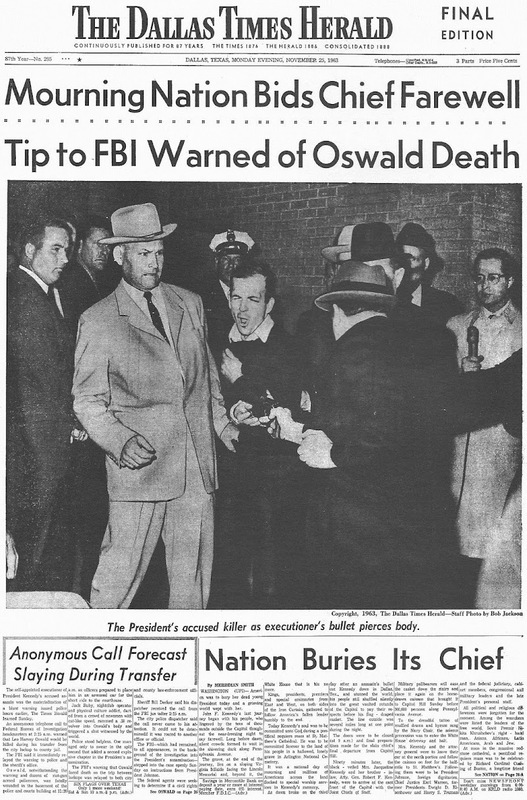 several lies that Oswald told on it, is linked HERE. 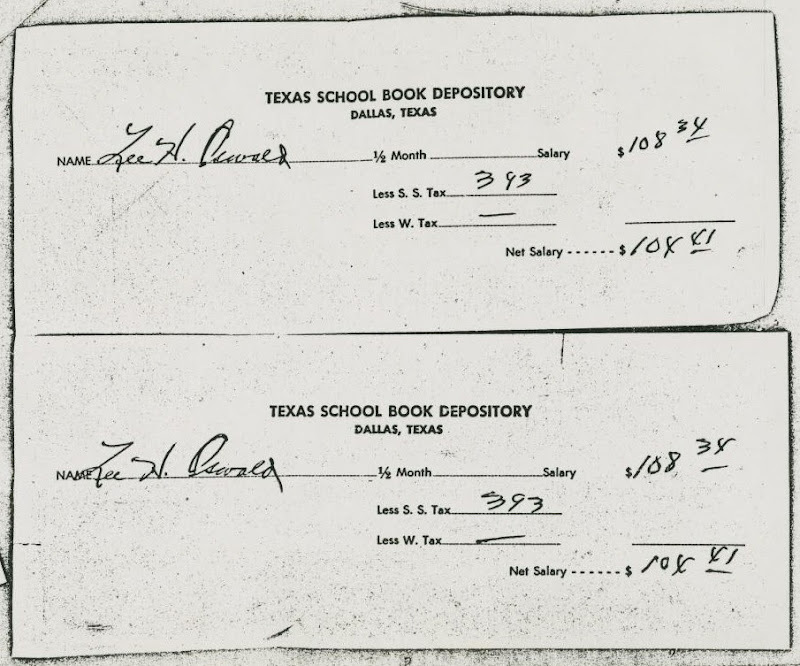 Two of Lee Oswald's Book Depository pay stubs. 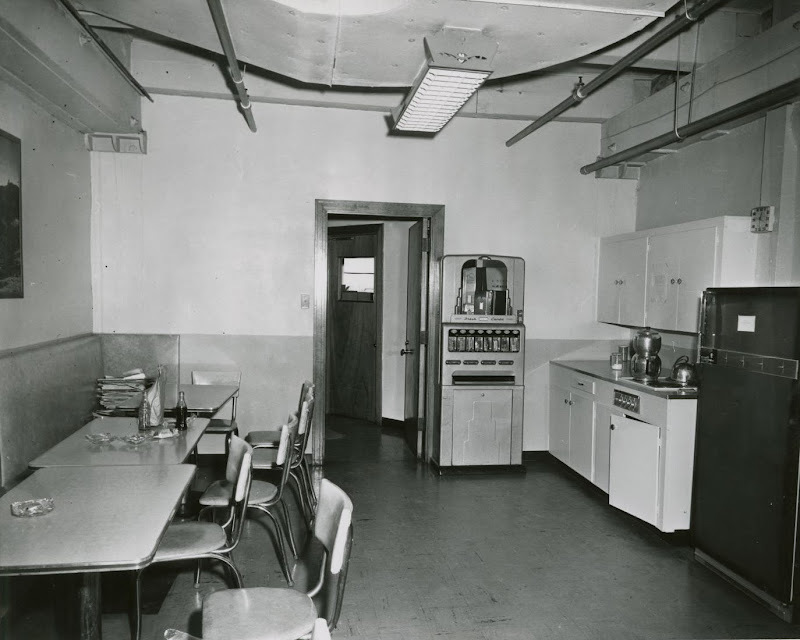 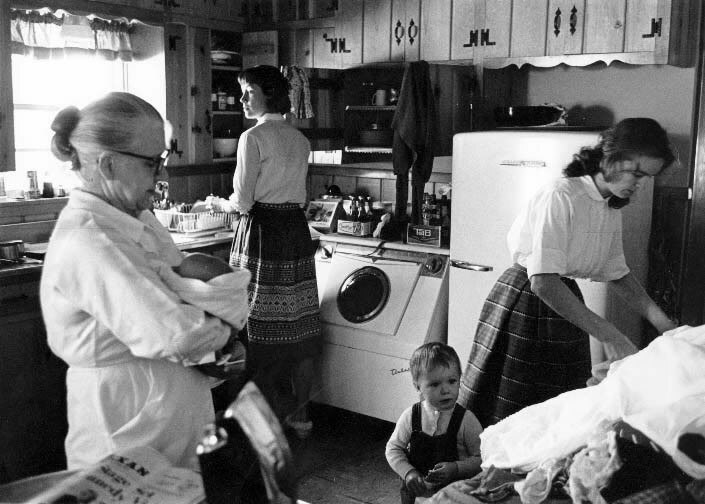 In Ruth Paine's kitchen the day after the assassination. 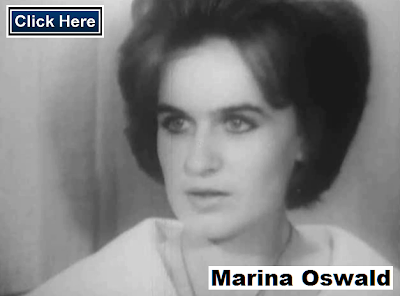 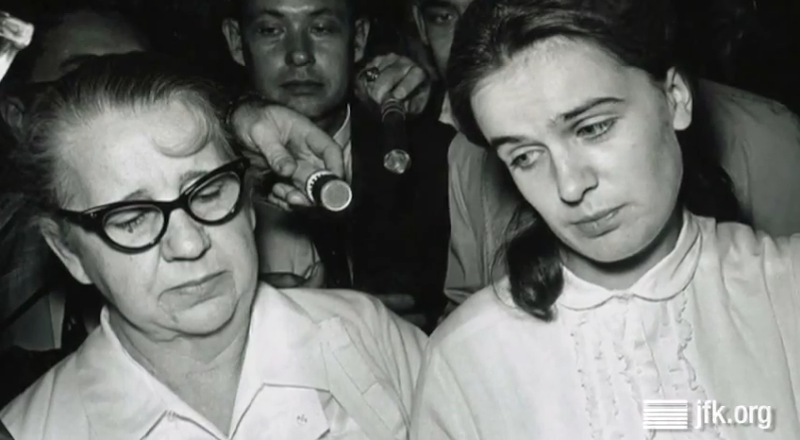 Lee Harvey Oswald's Russian-born wife, Marina. 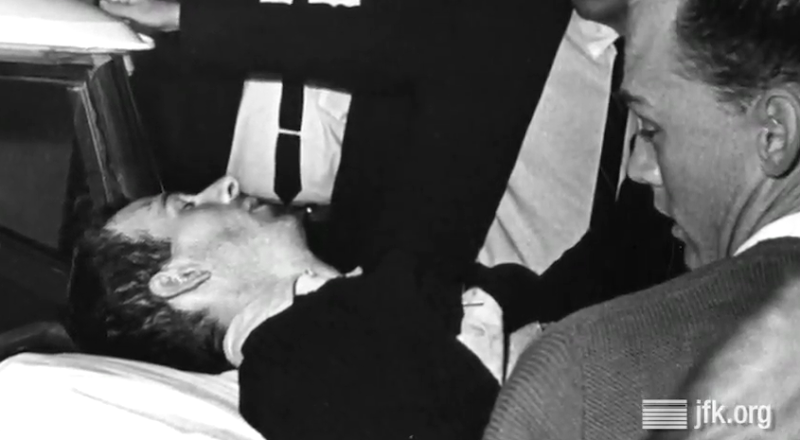 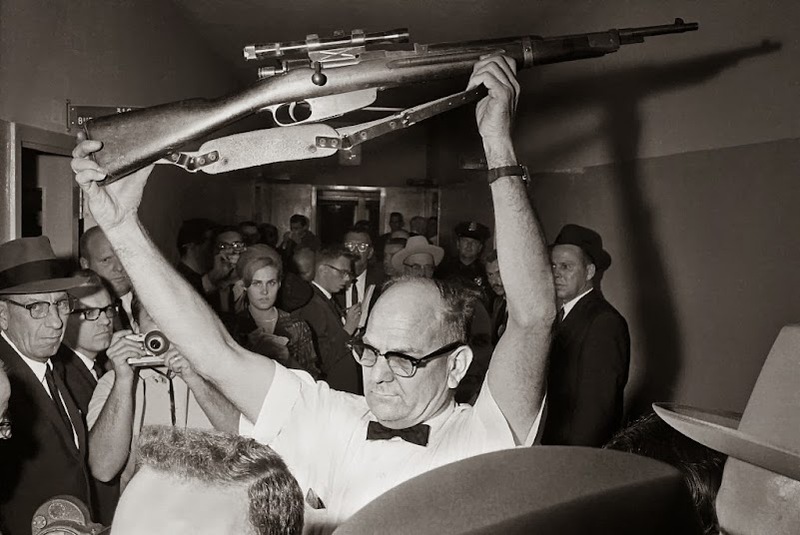 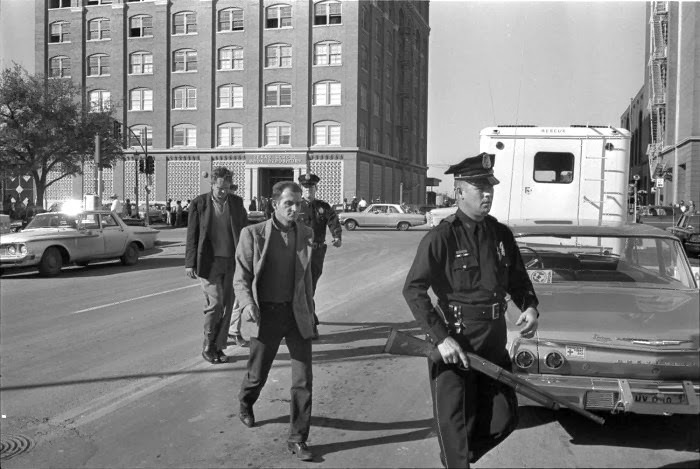 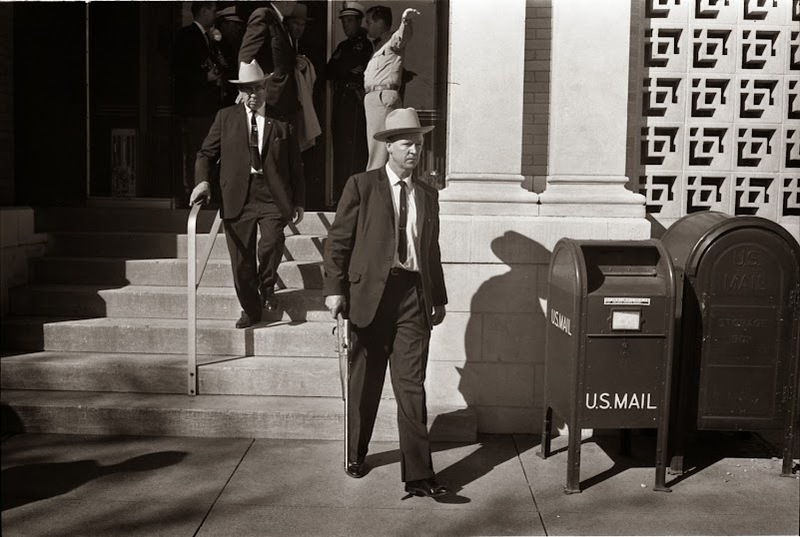 Jay Watson two hours after the shooting on 11/22/63. 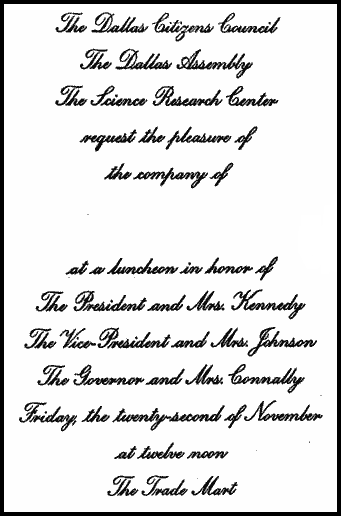 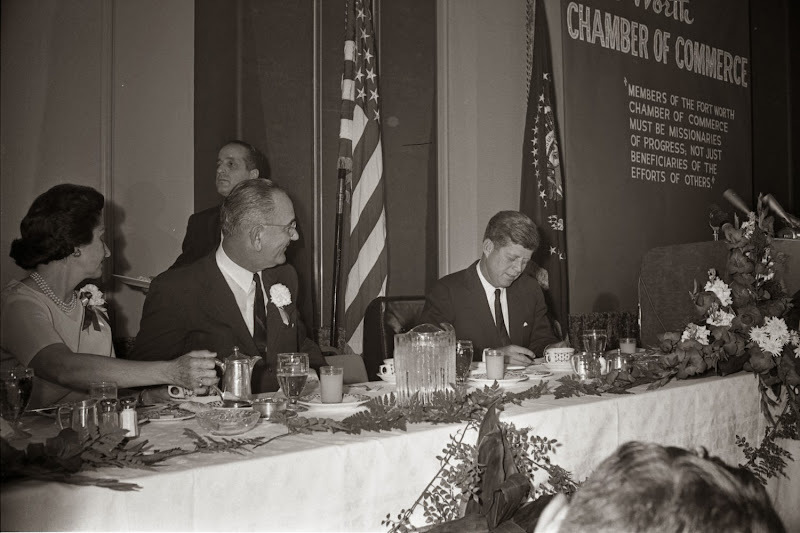 that President Kennedy didn't live to attend. 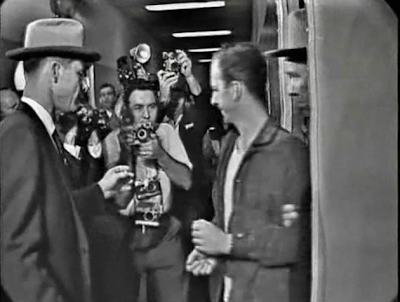 was captured. 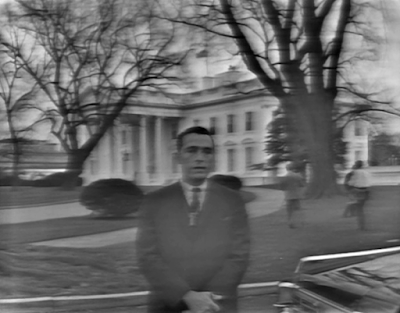 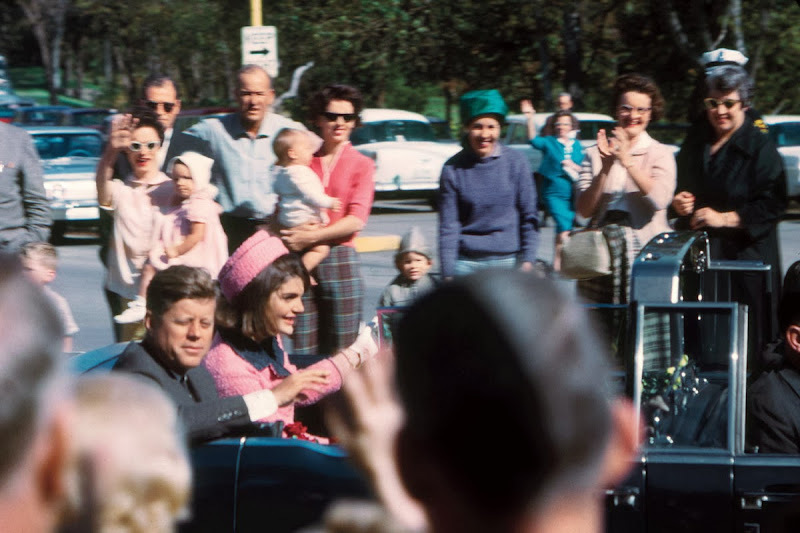 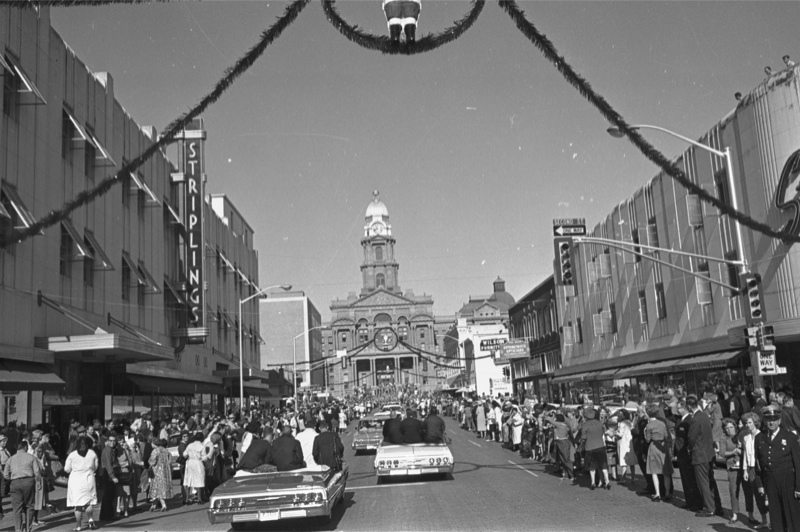 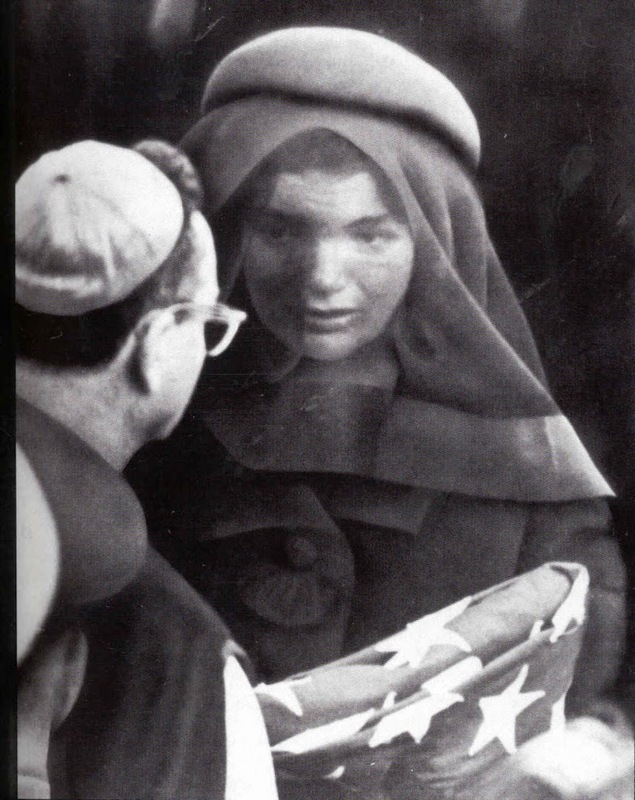 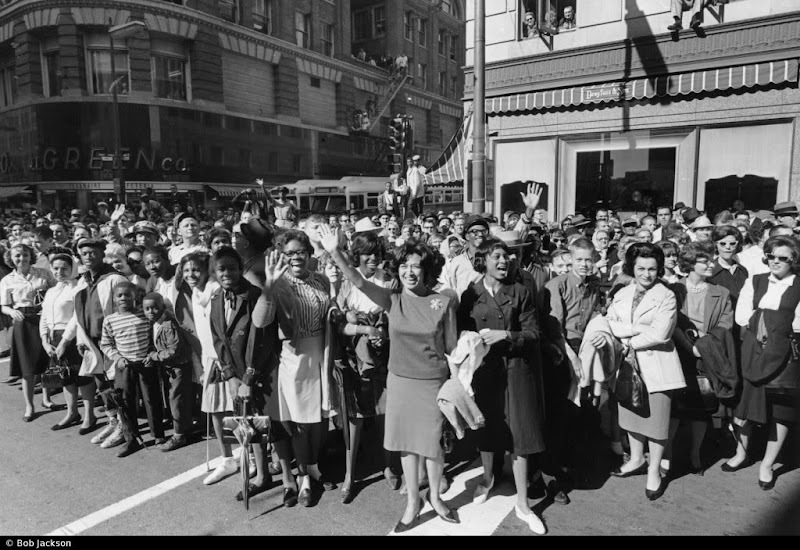 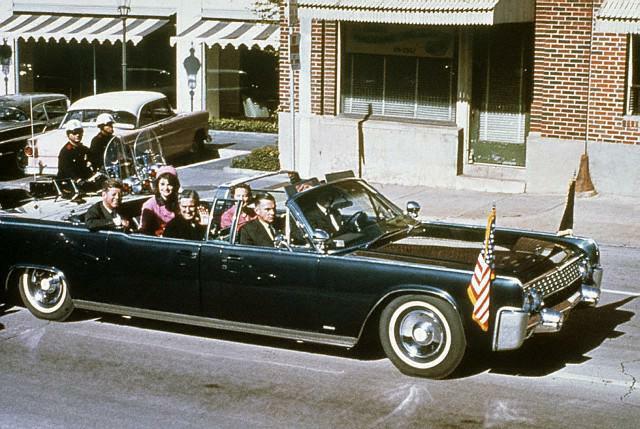 This picture was taken on Saturday, November 23, 1963. 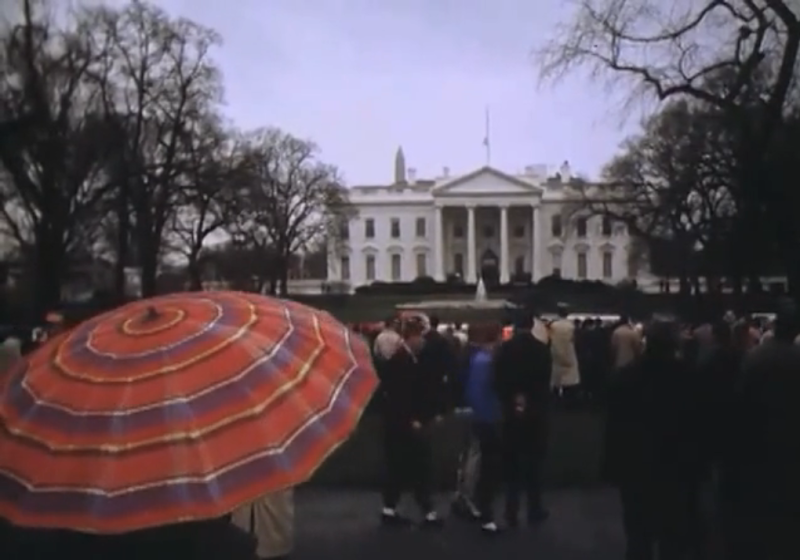 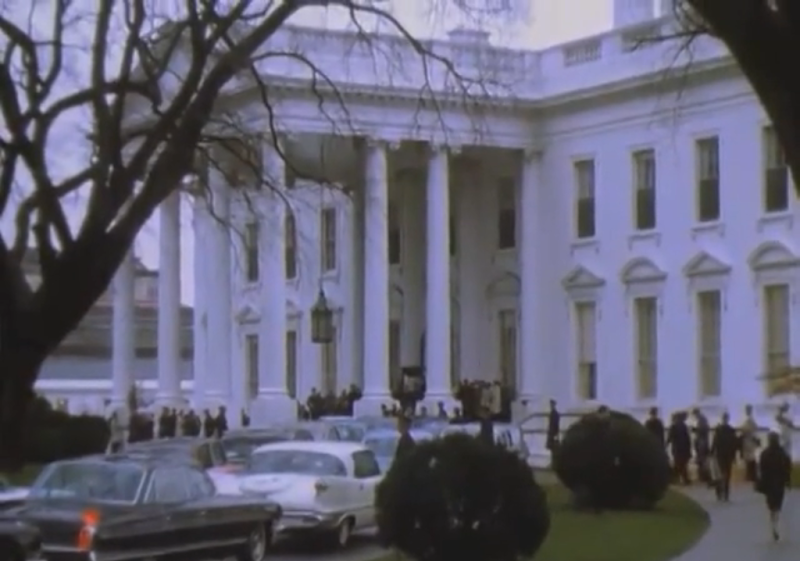 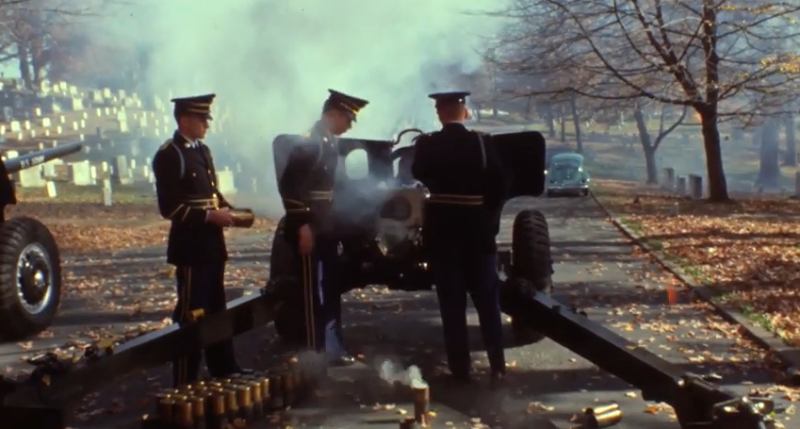 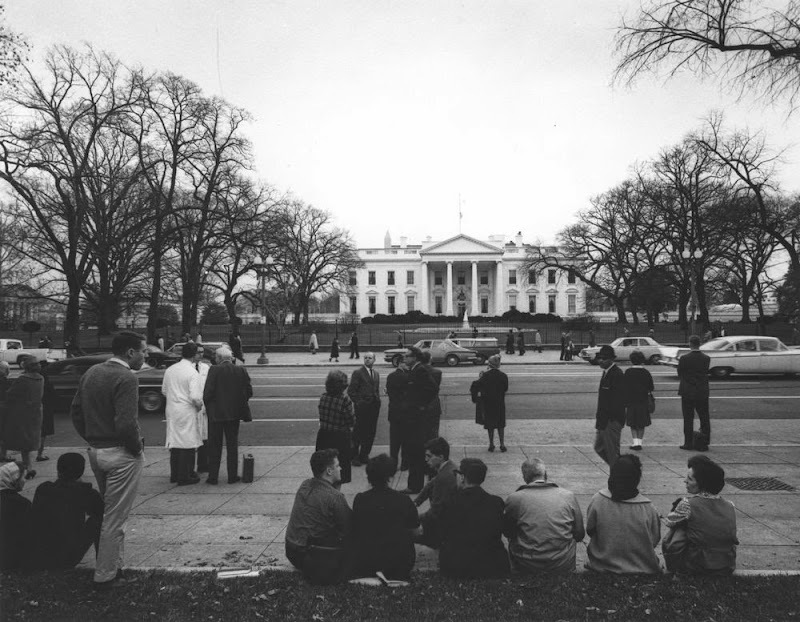 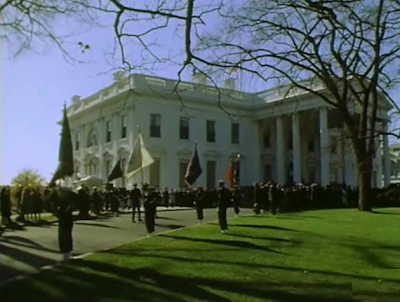 White House garage on the morning of November 23, 1963. 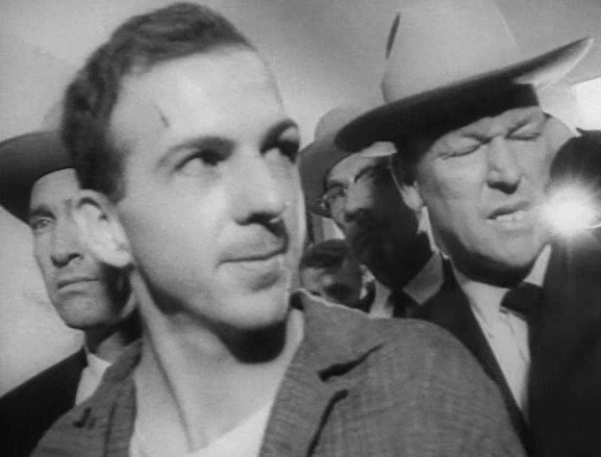 Lee Harvey Oswald has been shot! 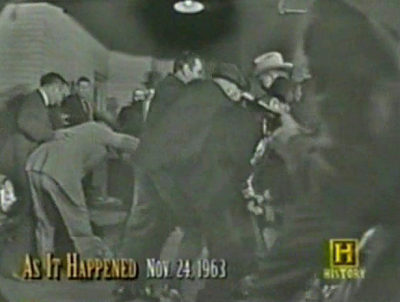 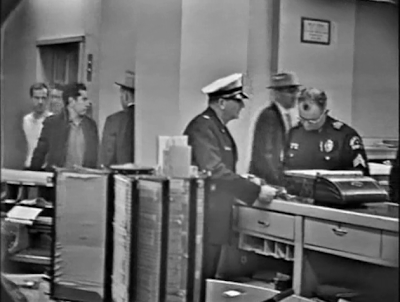 basement of Dallas City Hall at 11:21 AM (CST) on Sunday, November 24, 1963. 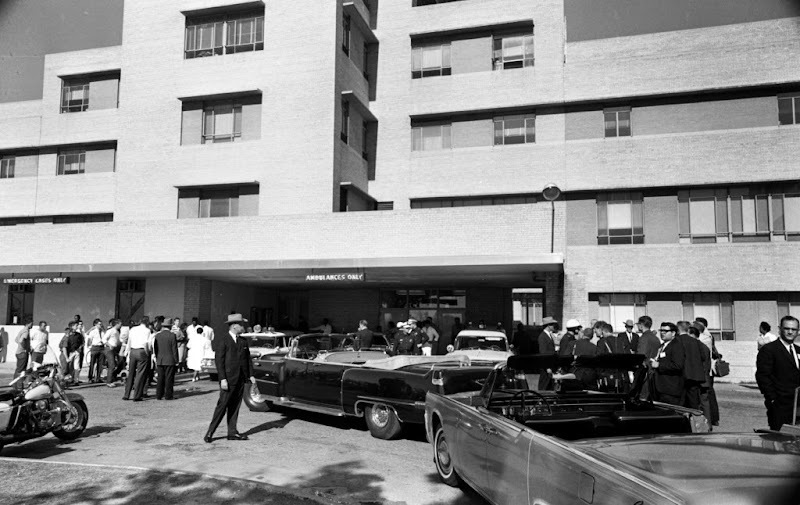 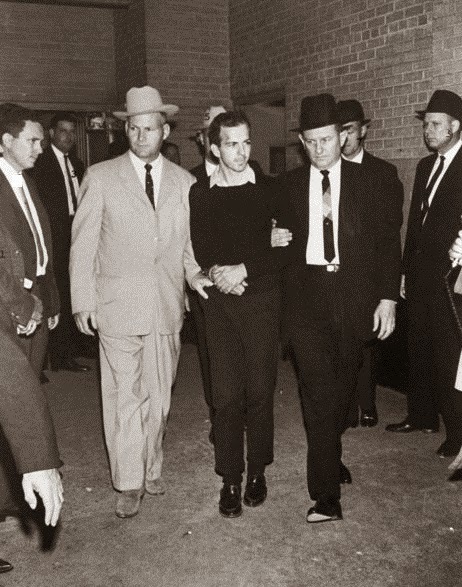 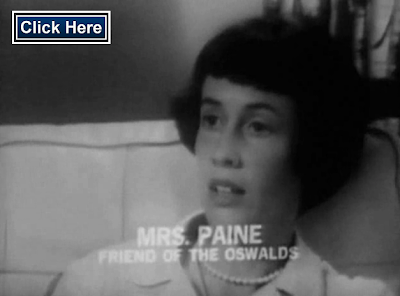 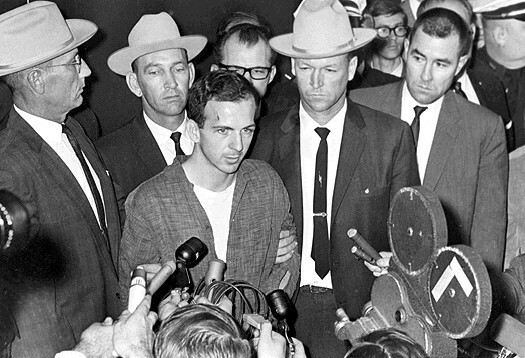 Oswald died at Parkland Hospital at 1:07 PM that day. 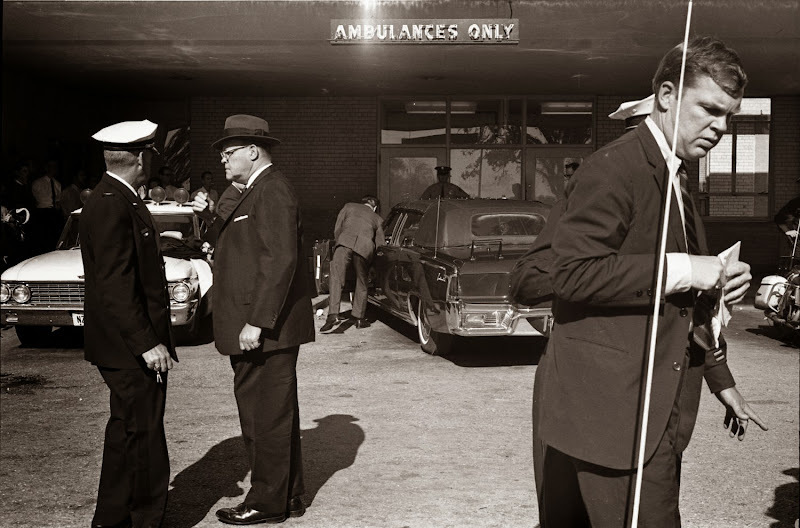 This is the full, uncropped version of Jackson's incredible picture. 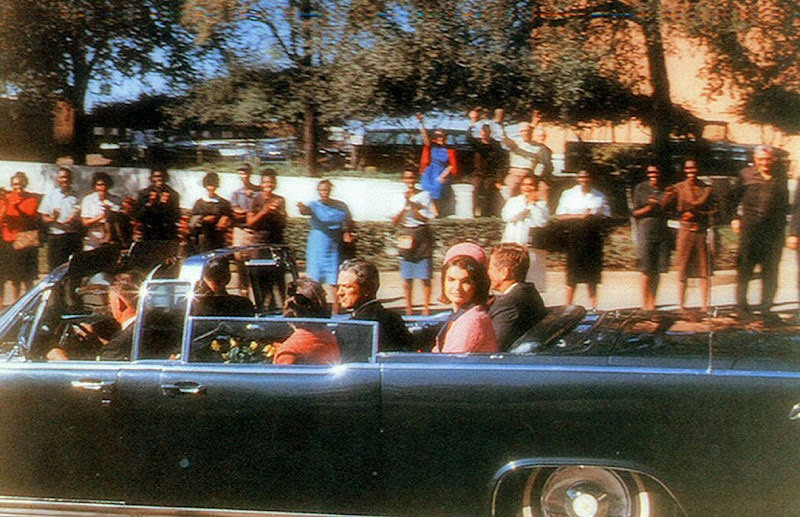 A zoomed-in view of Bob Jackson's award-winning photo. 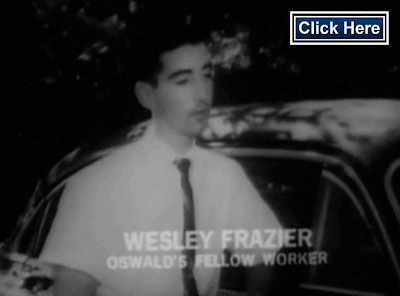 just seconds before Oswald was shot. 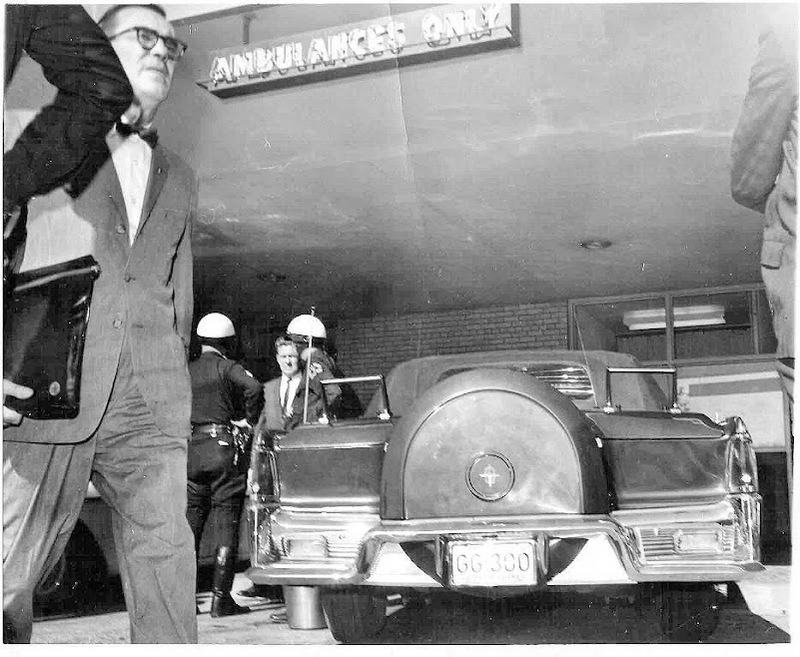 about to be placed into an ambulance in the police basement. 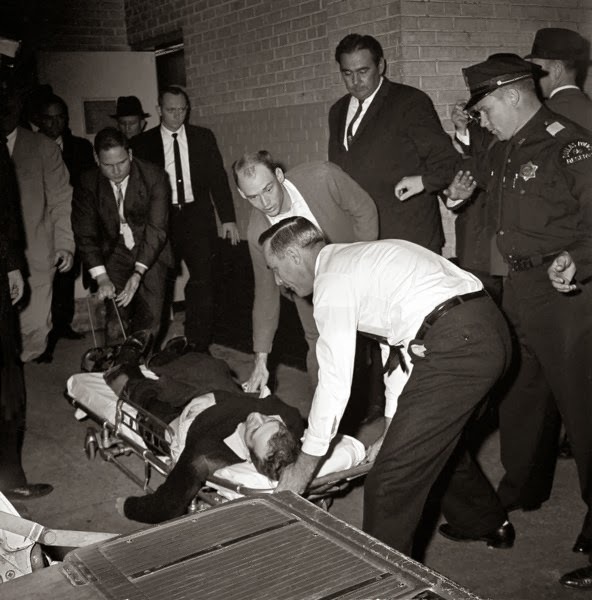 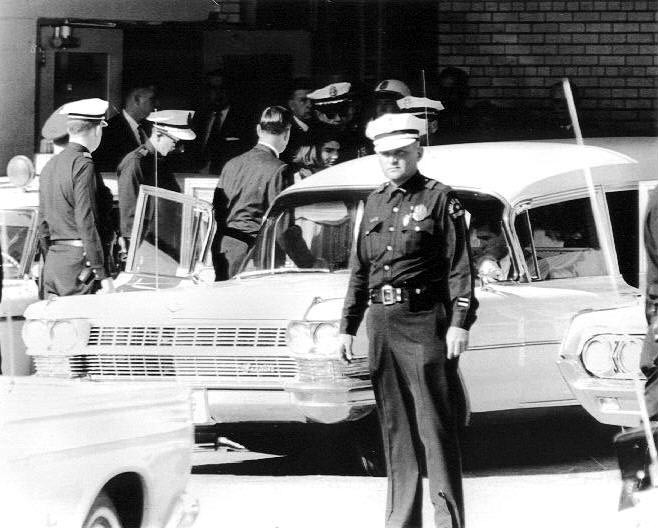 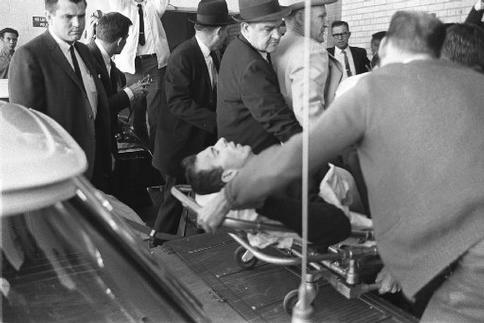 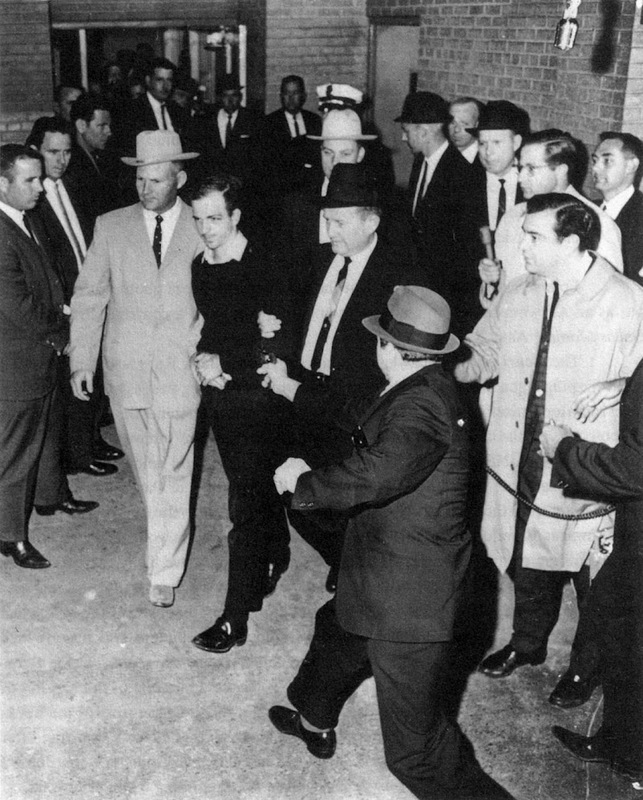 The mortally wounded Lee Harvey Oswald arrives at Parkland Hospital. 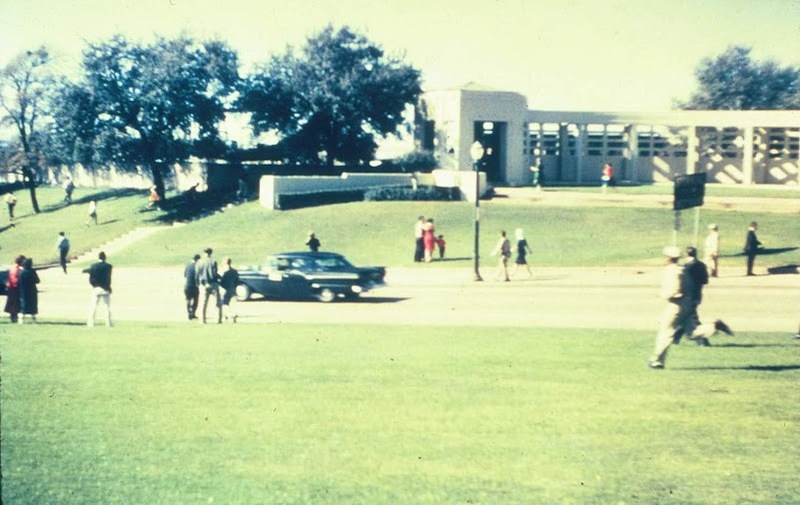 entrance that President Kennedy entered two days earlier. 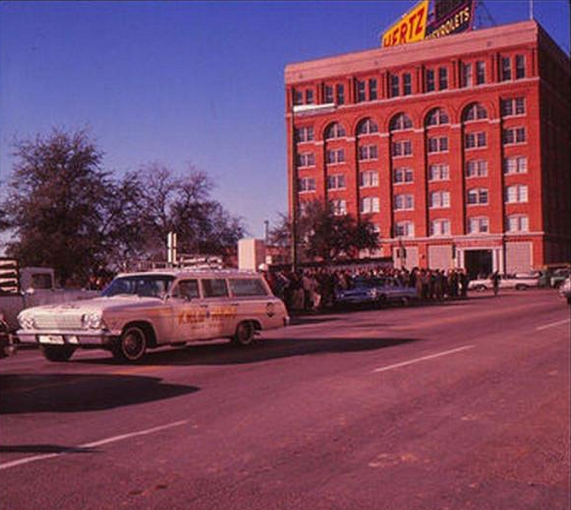 The scene of Lee Harvey Oswald's murder. 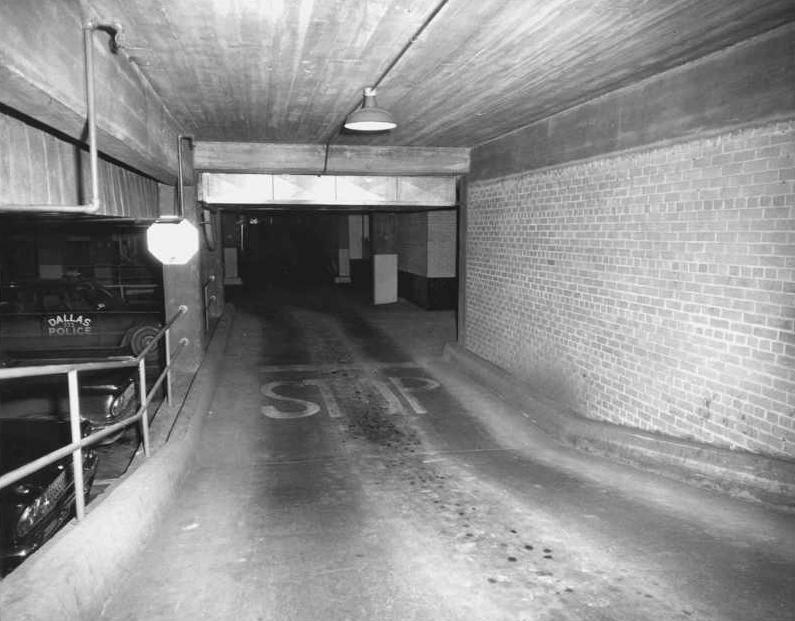 leading to the basement of Dallas City Hall. 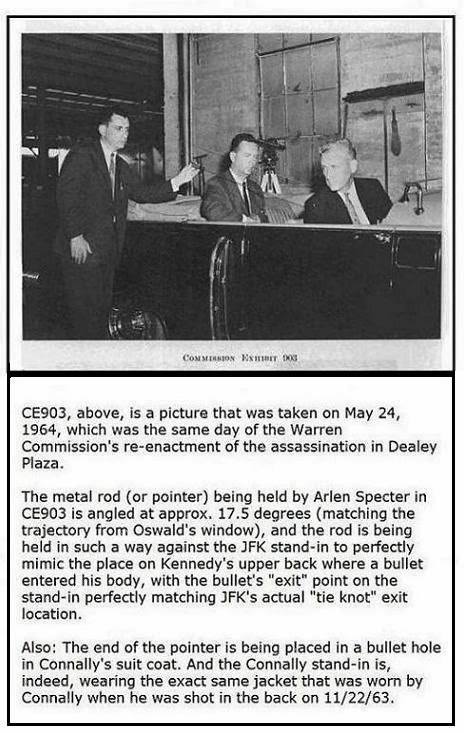 "Magic Bullet" by many conspiracy theorists. 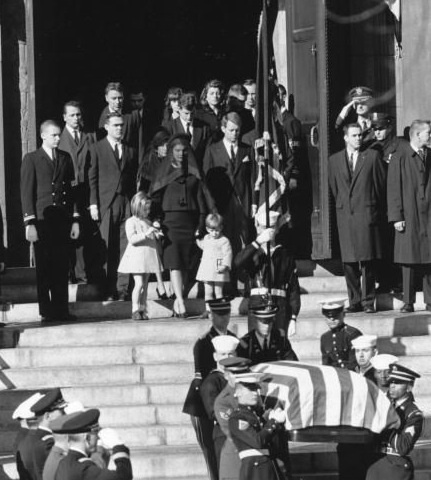 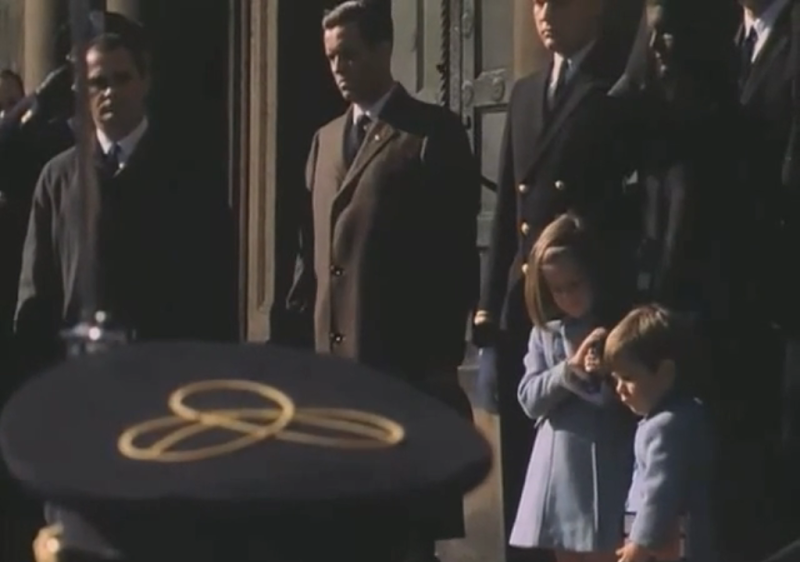 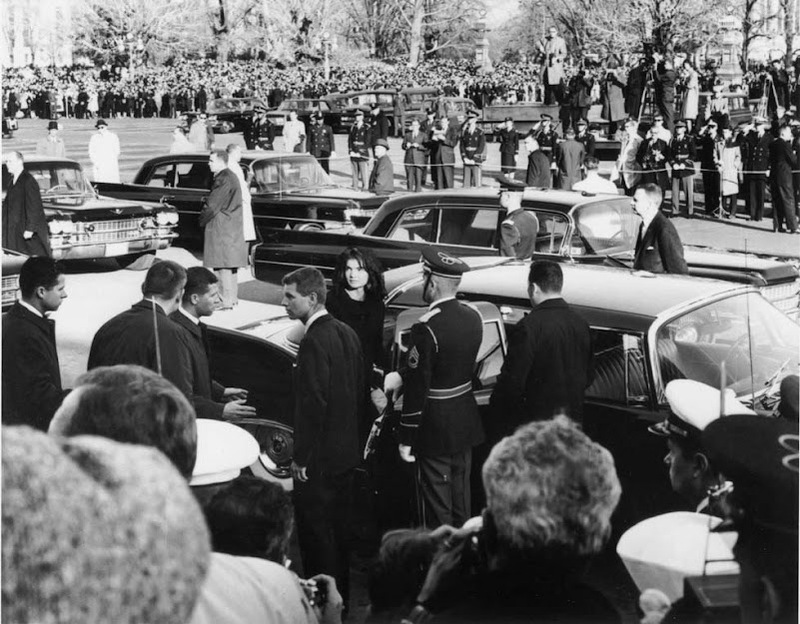 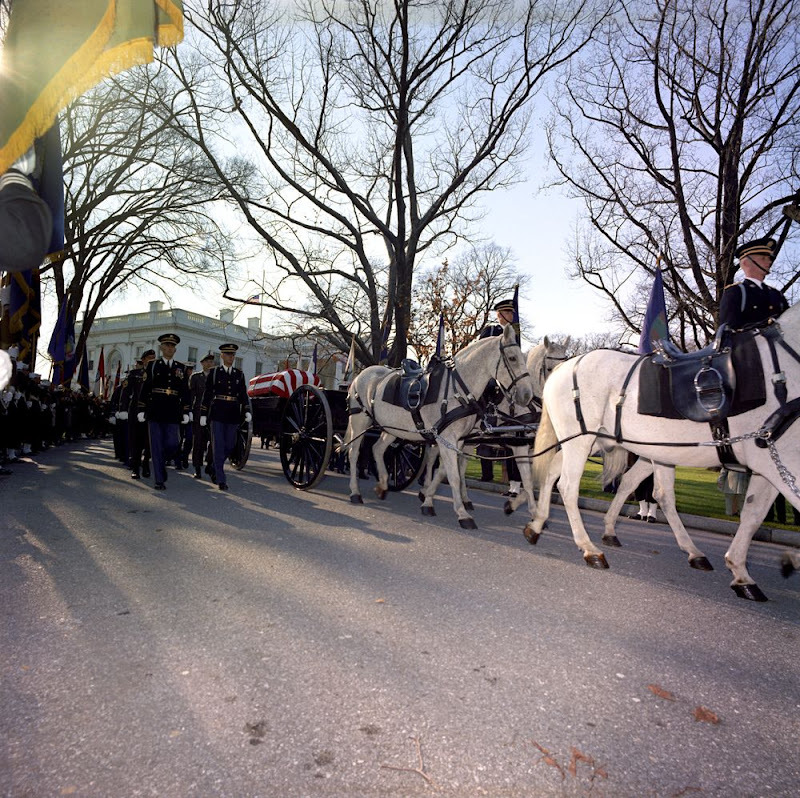 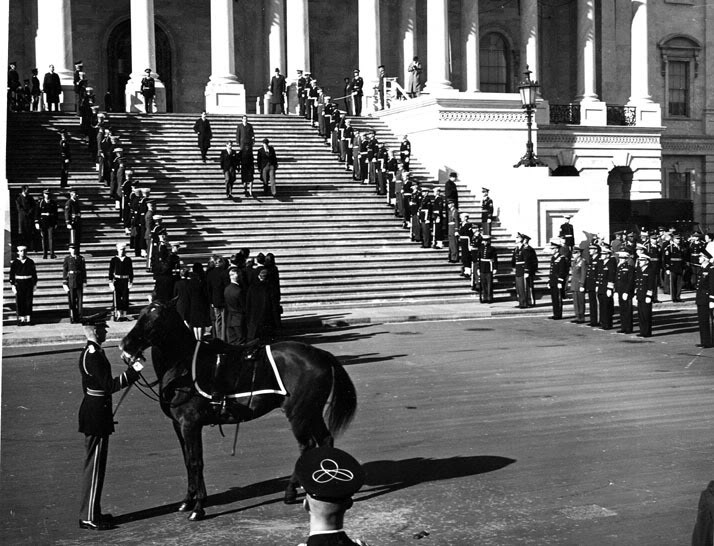 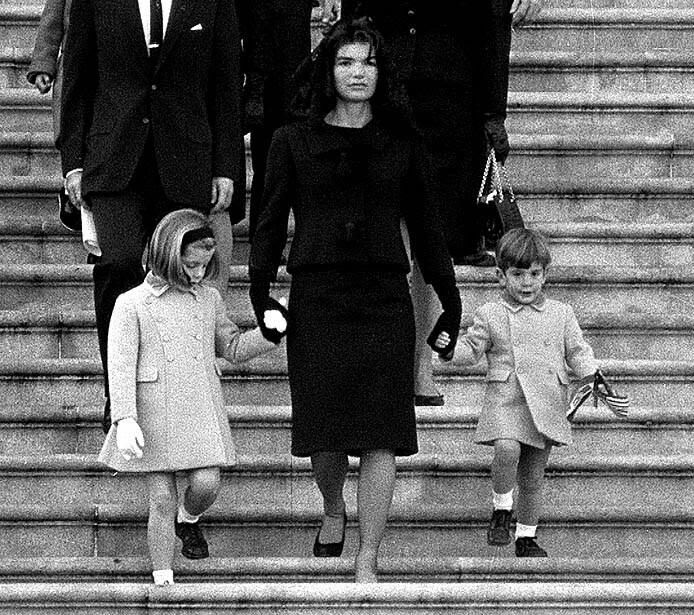 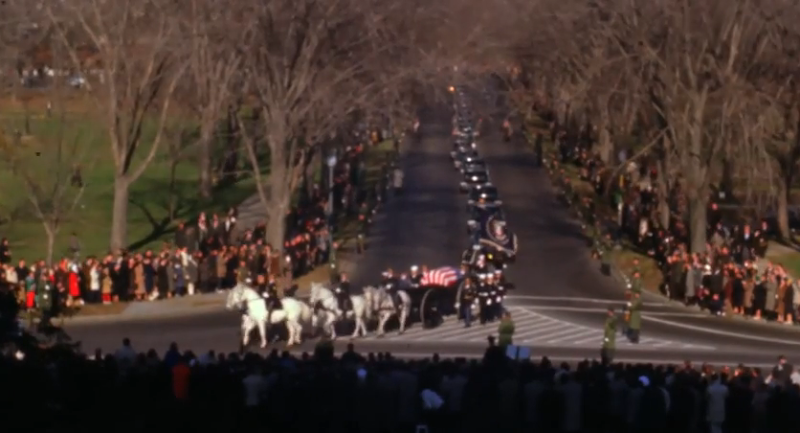 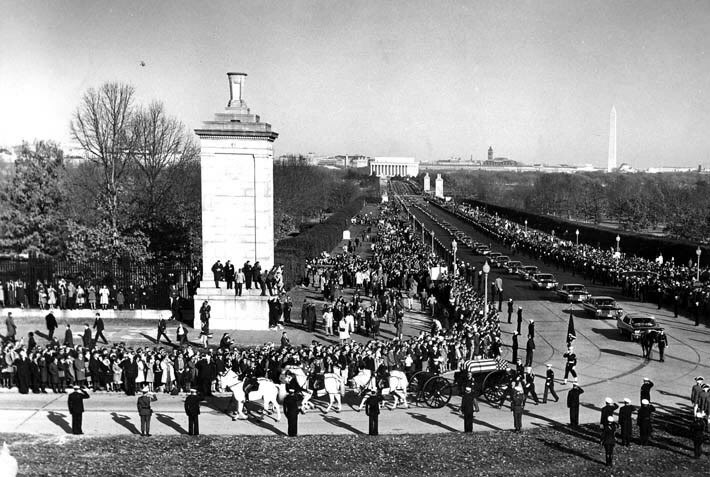 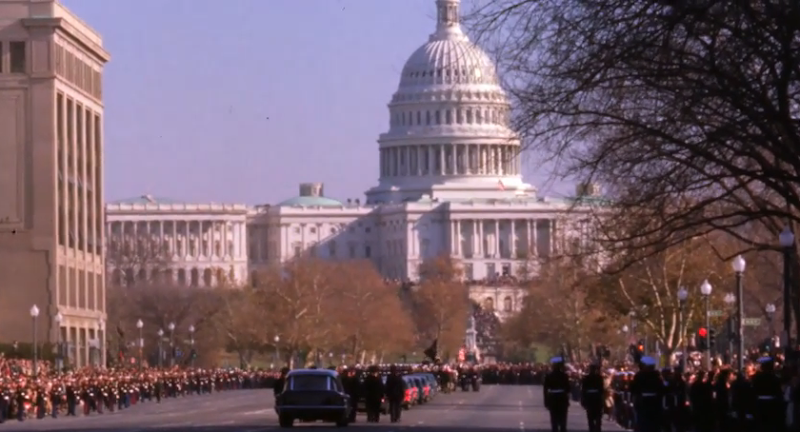 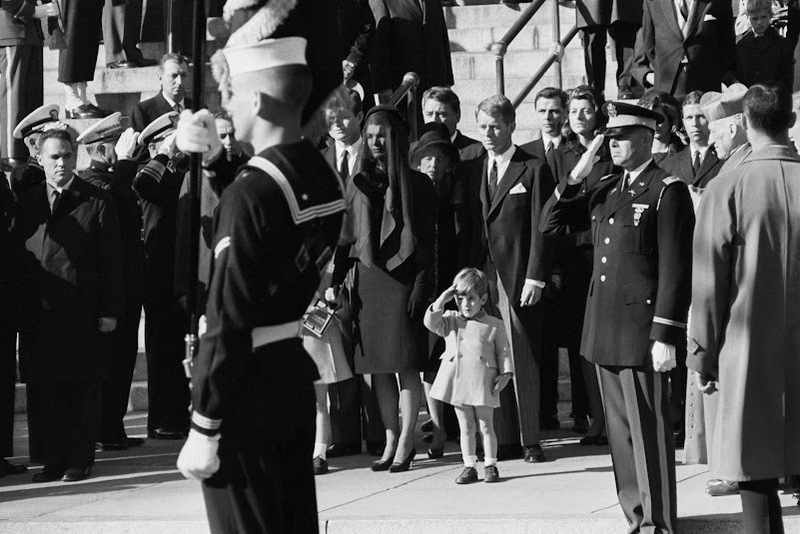 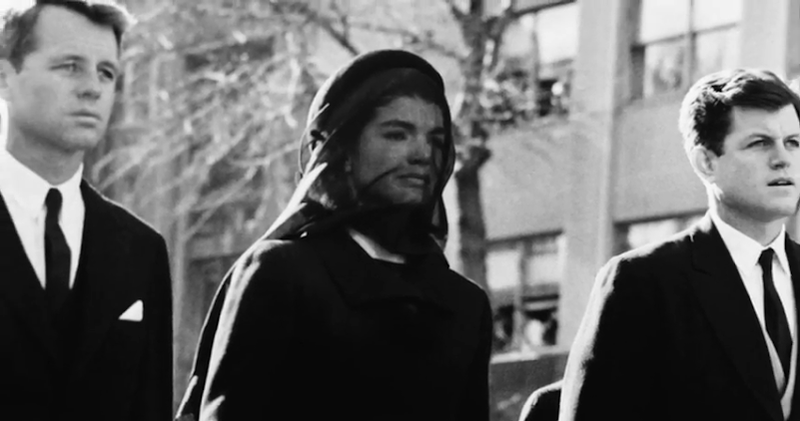 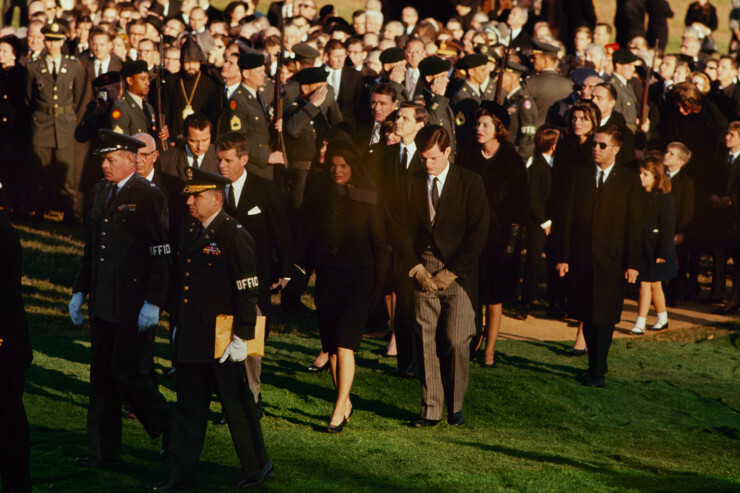 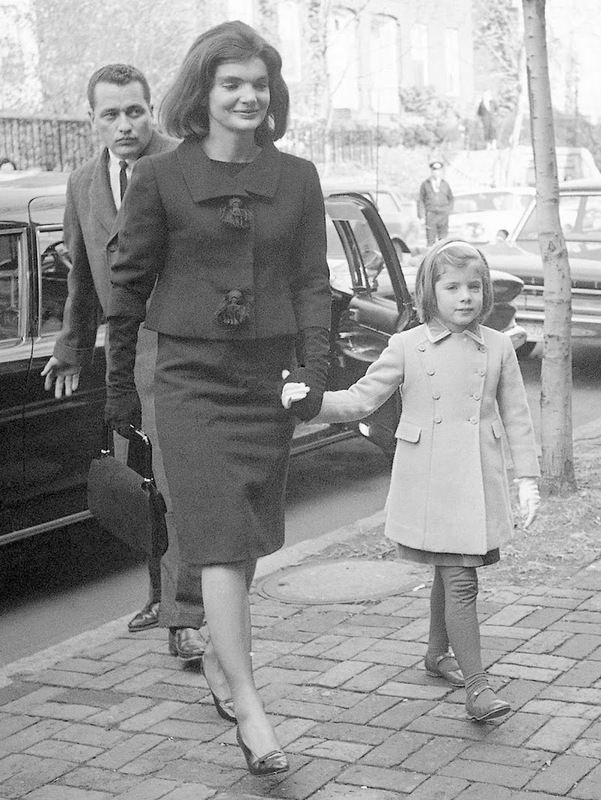 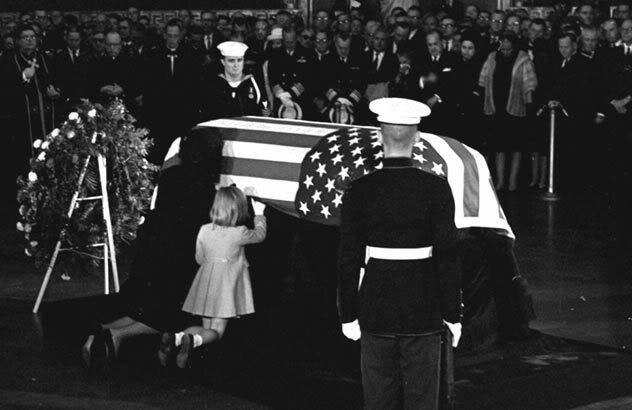 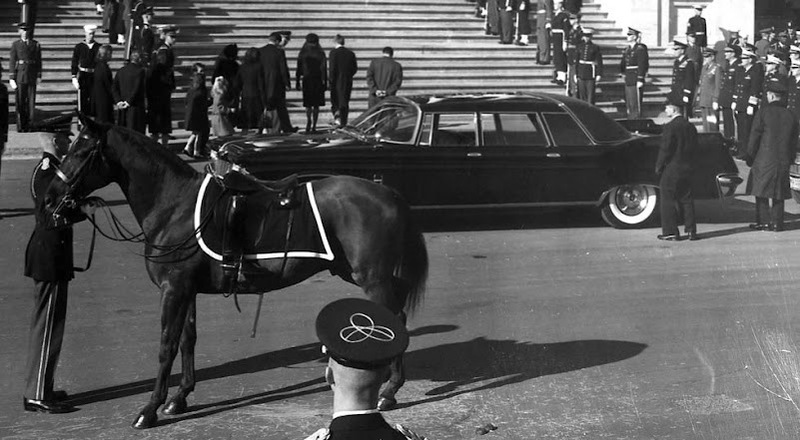 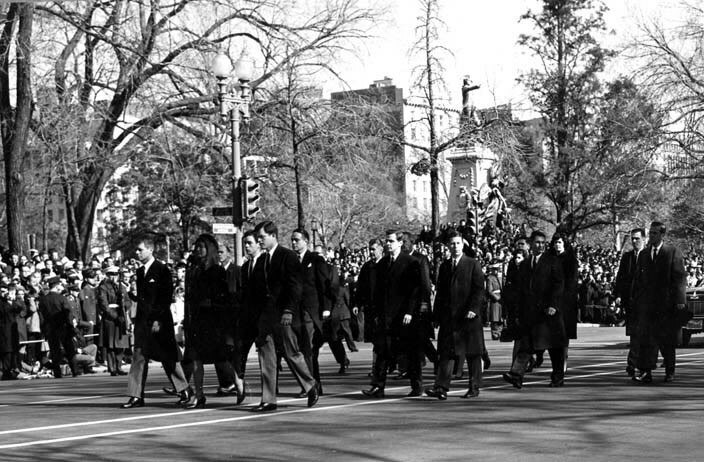 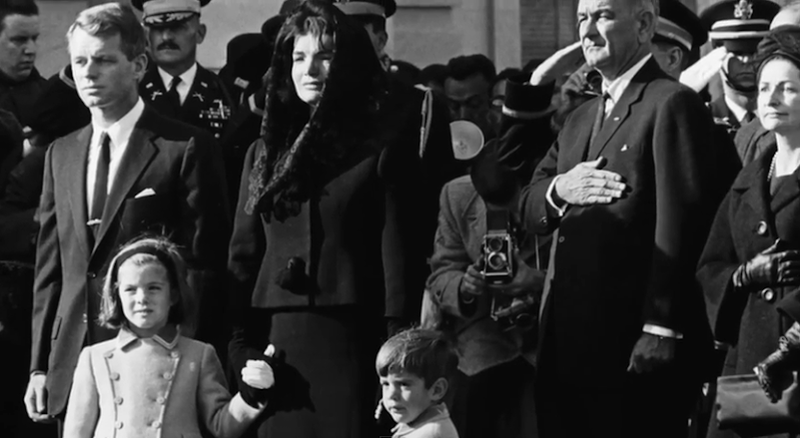 funeral services and official processions through Washington, D.C.
December 6, 1963 -- Jacqueline Kennedy and six-year-old Caroline. 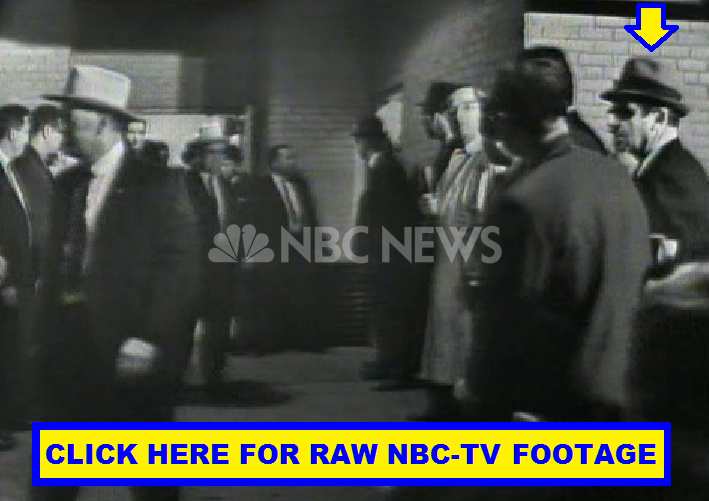 of the jurors at Ruby's trial are seen walking to a cafe for lunch. 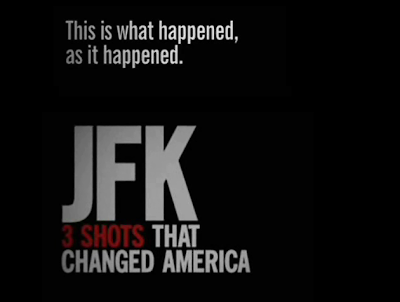 Another 144 pictures from "3 Shots That Changed America" can be found HERE. 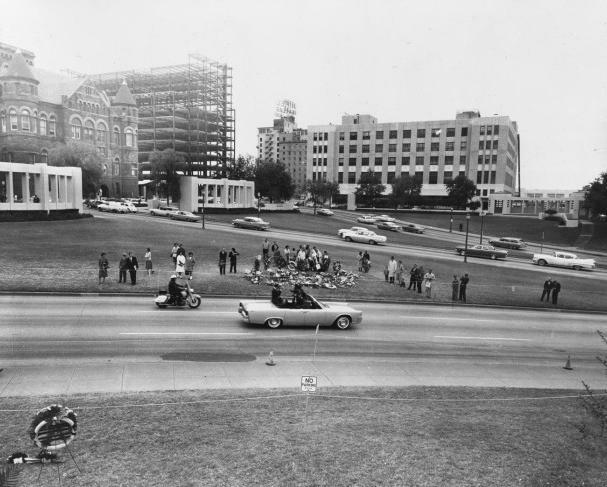 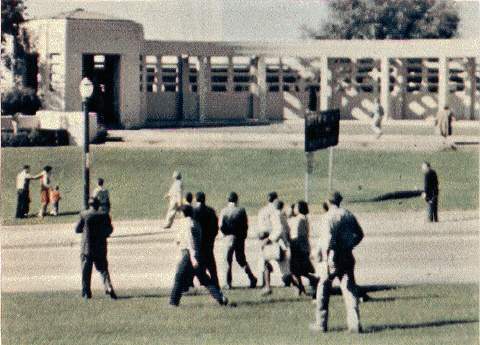 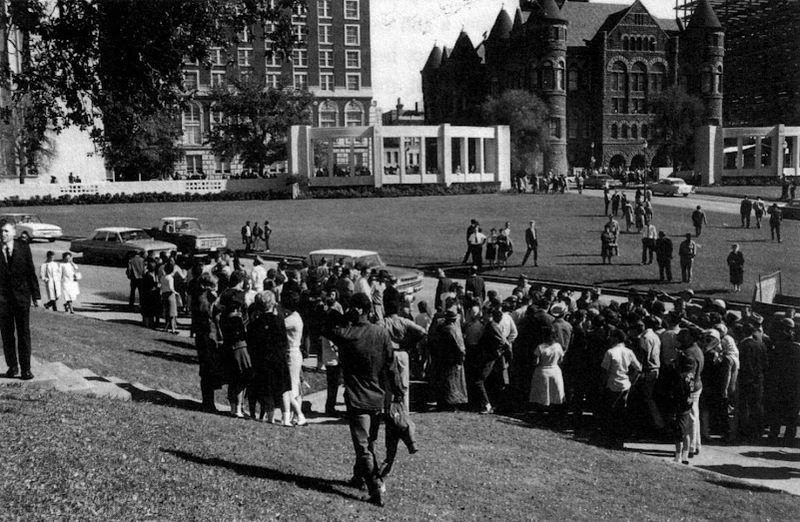 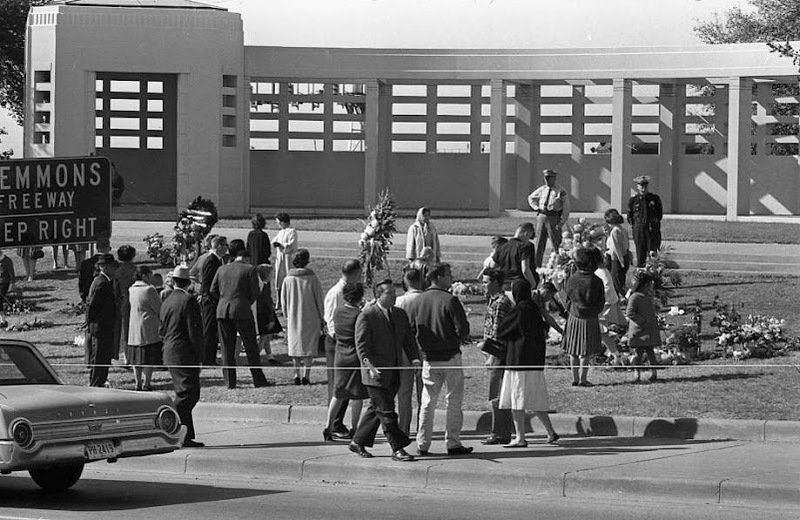 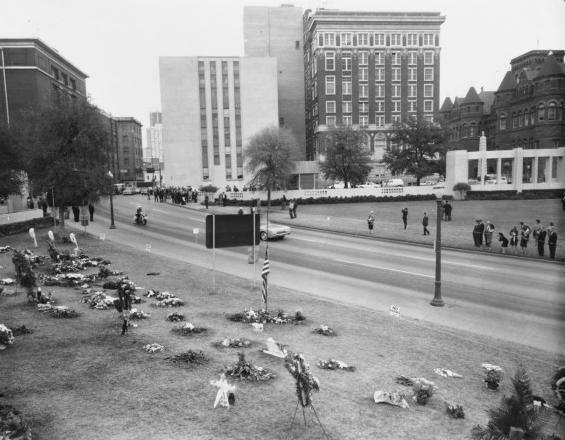 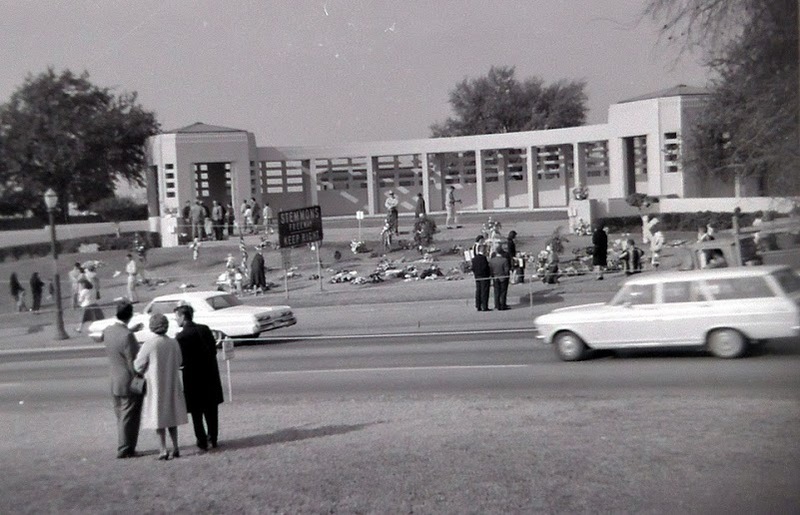 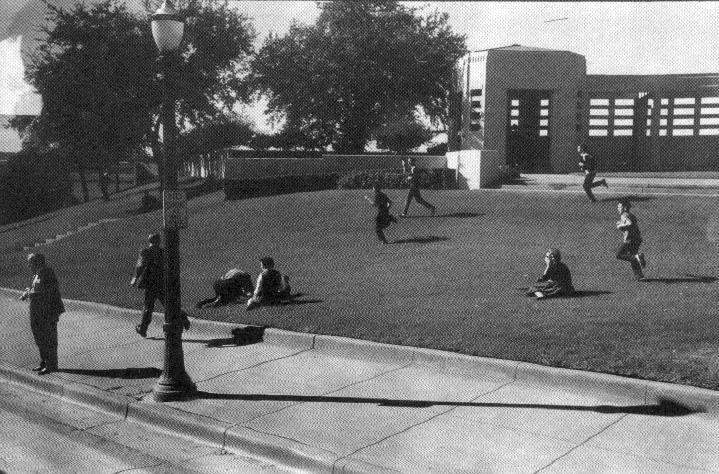 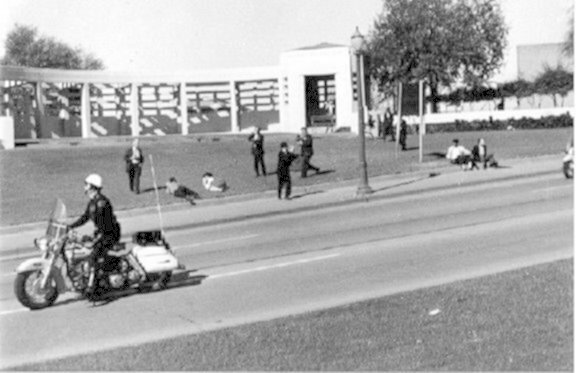 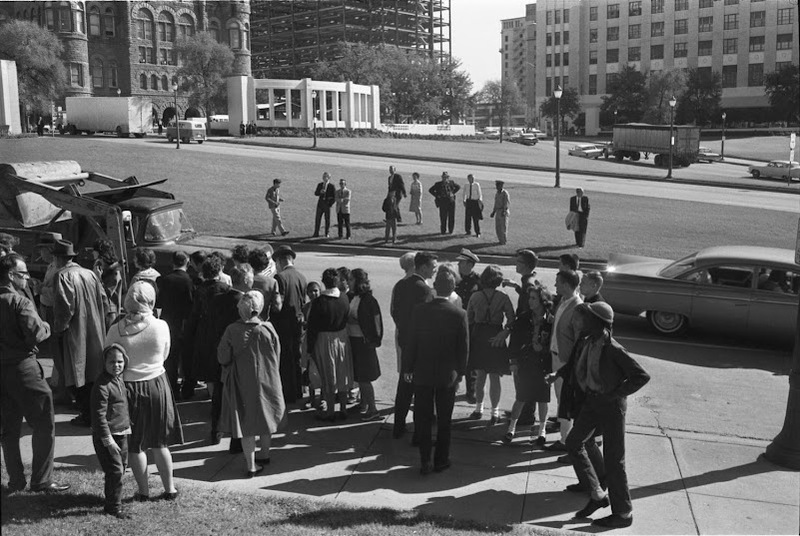 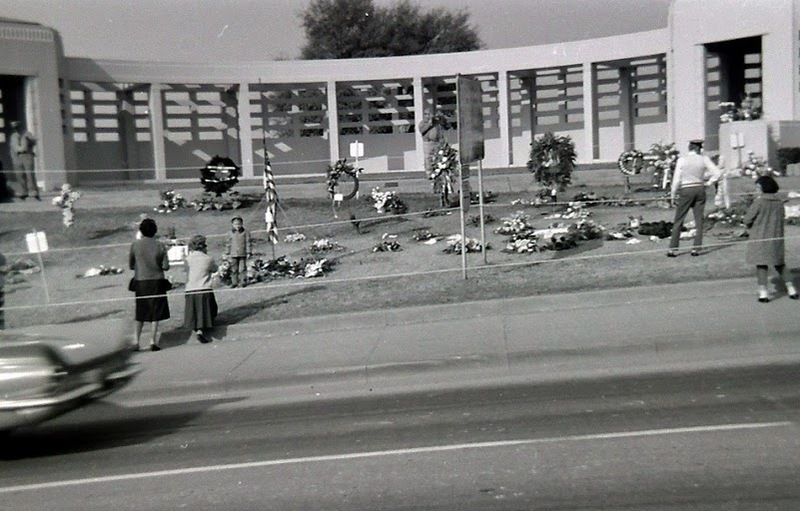 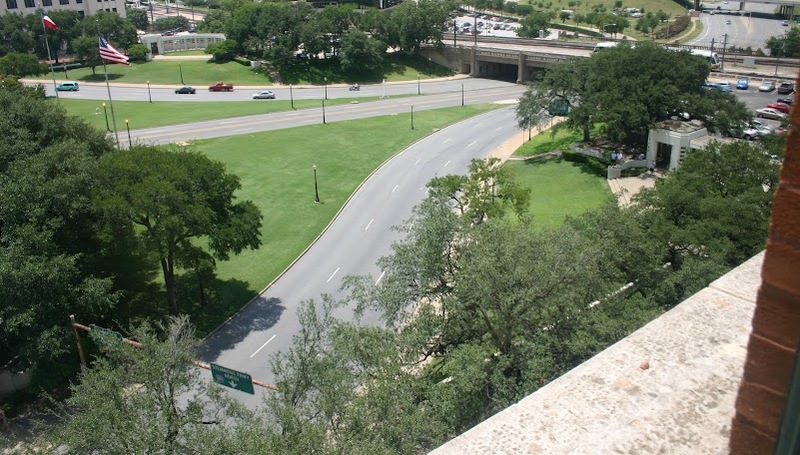 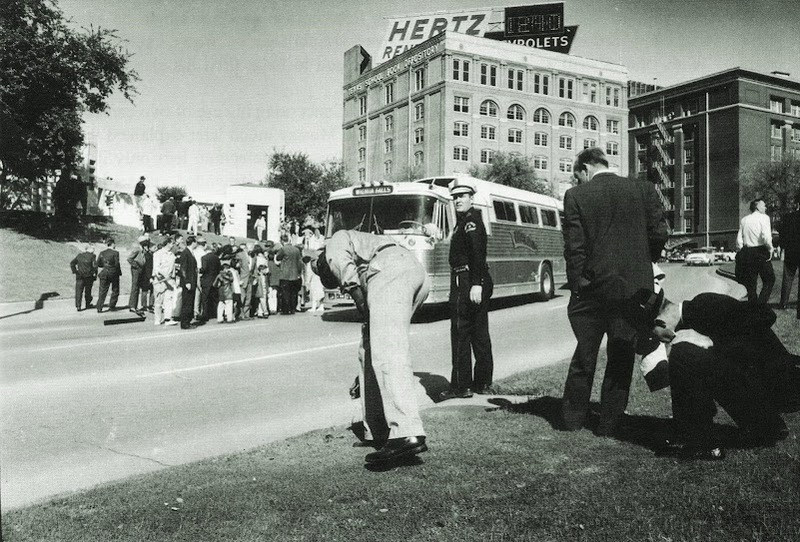 Dealey Plaza on May 24, 1964.
shooting, is also seen in this photograph. 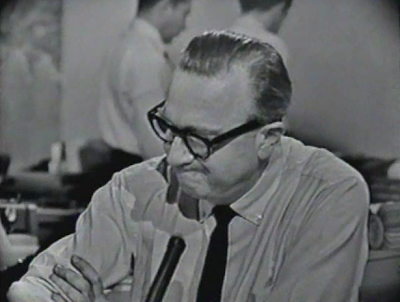 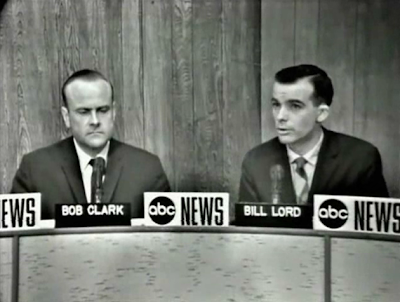 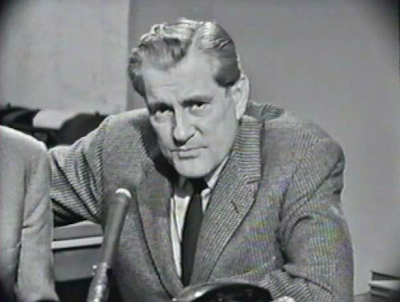 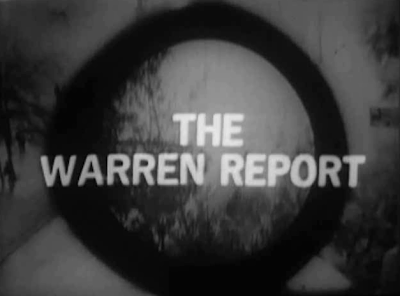 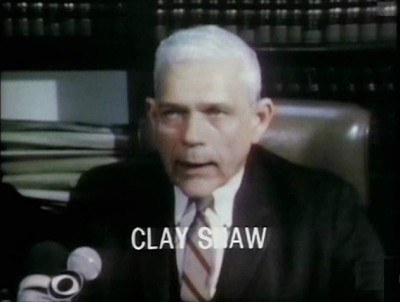 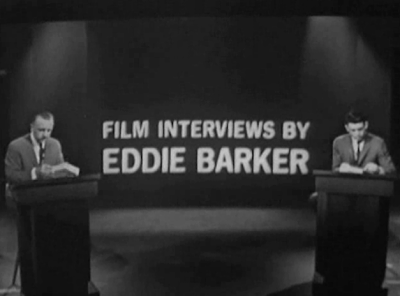 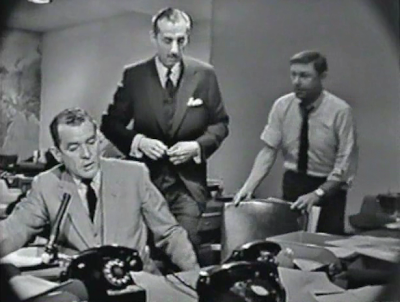 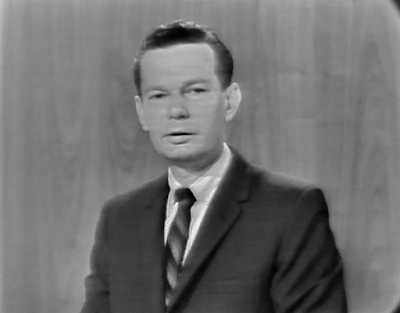 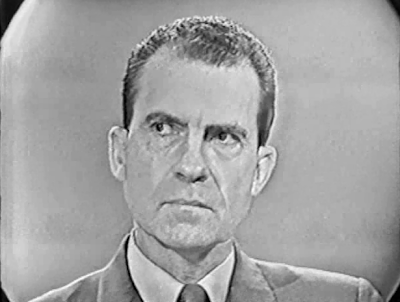 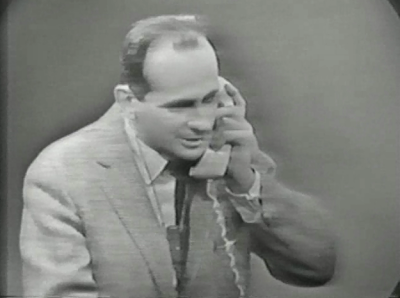 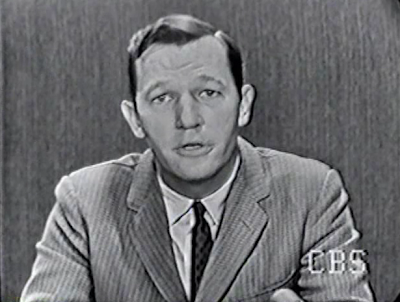 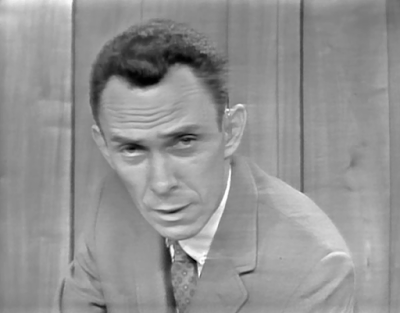 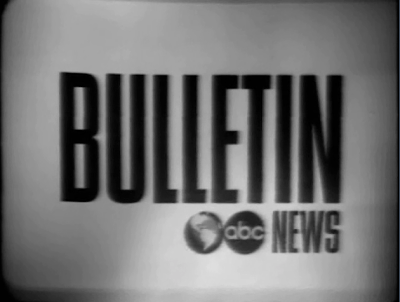 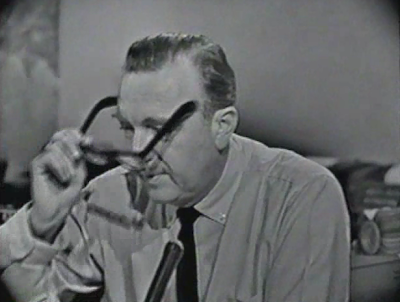 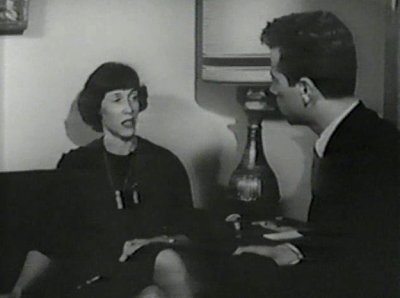 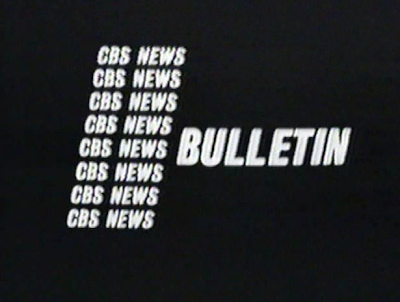 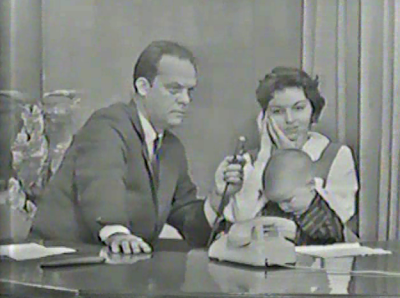 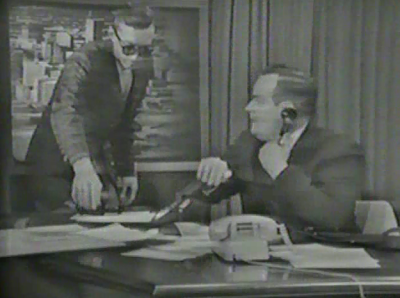 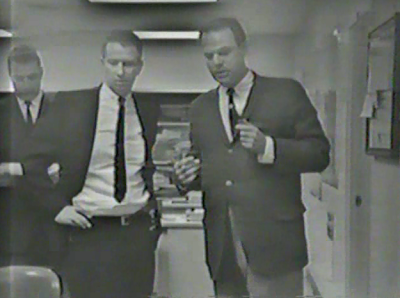 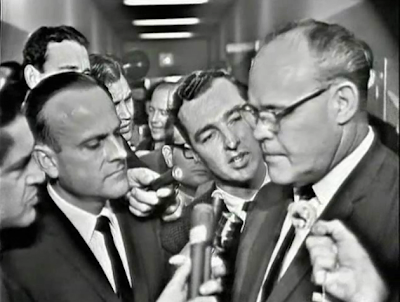 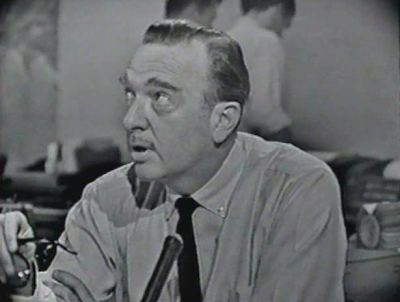 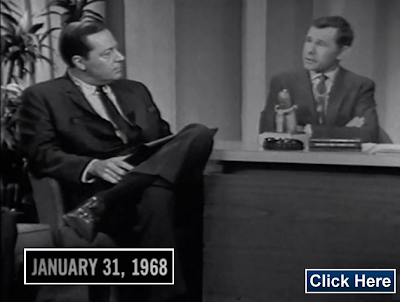 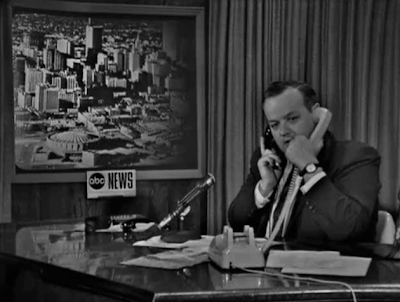 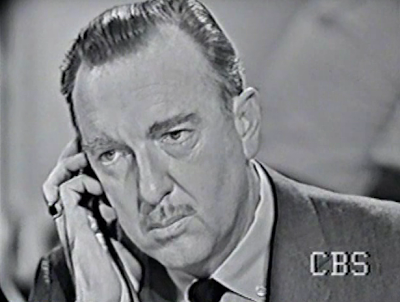 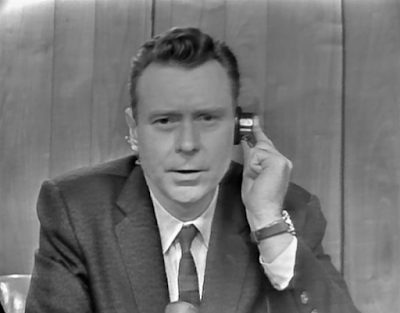 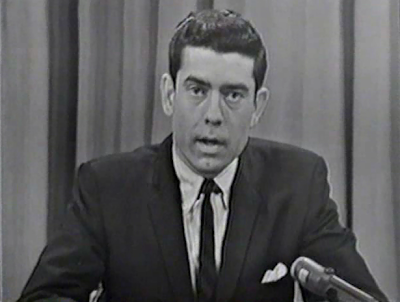 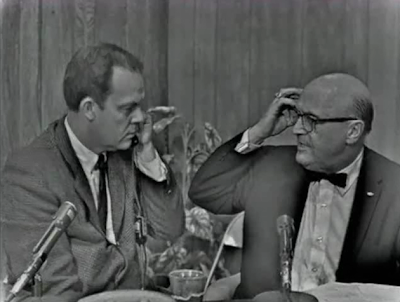 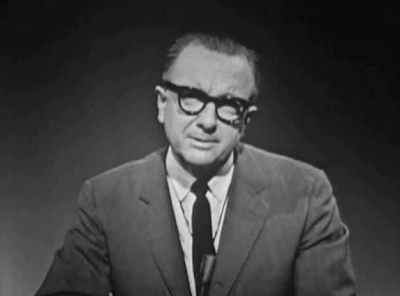 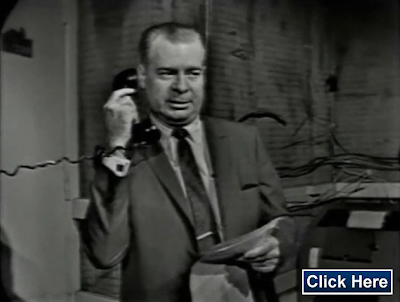 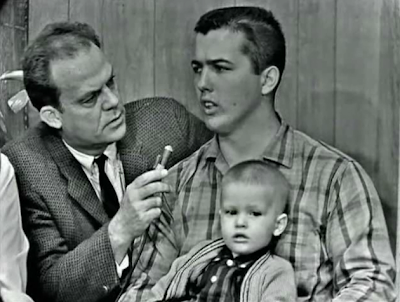 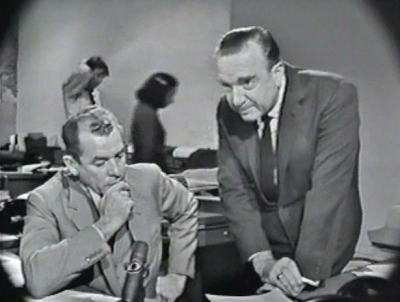 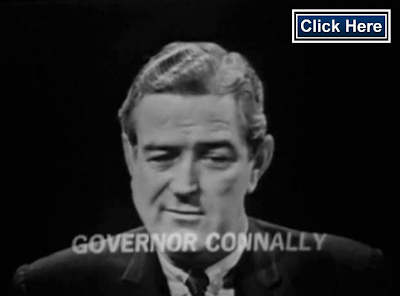 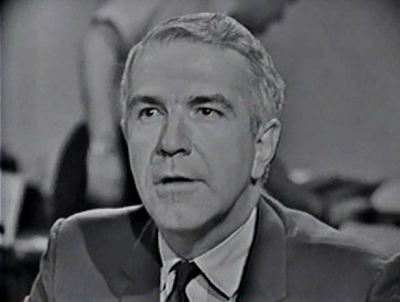 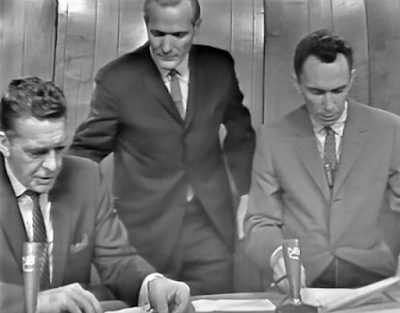 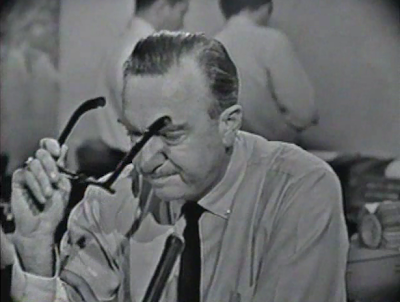 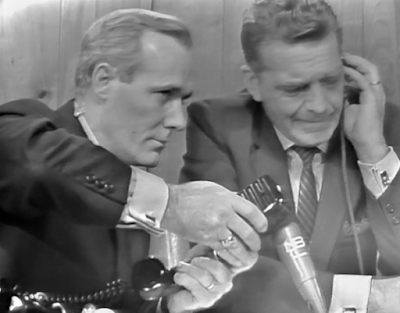 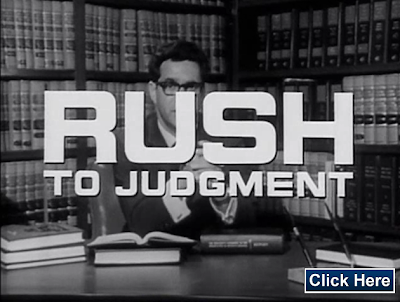 the 1964 CBS "Warren Report" special. 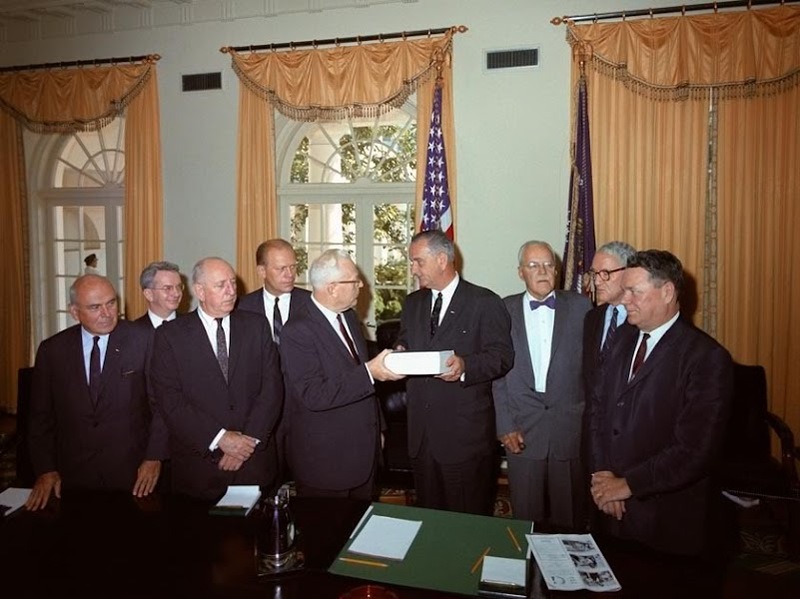 as LBJ is handed the completed Warren Report on September 24, 1964.